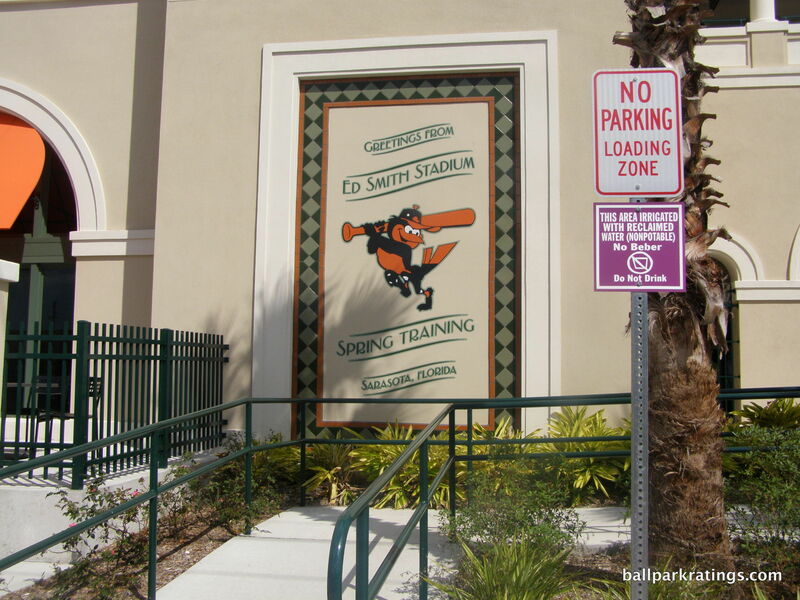 In contrast to other 80s spring training ballparks, Ed Smith Stadium was so bereft of presence and design vision that it wouldn’t really have been fair to call it ugly. 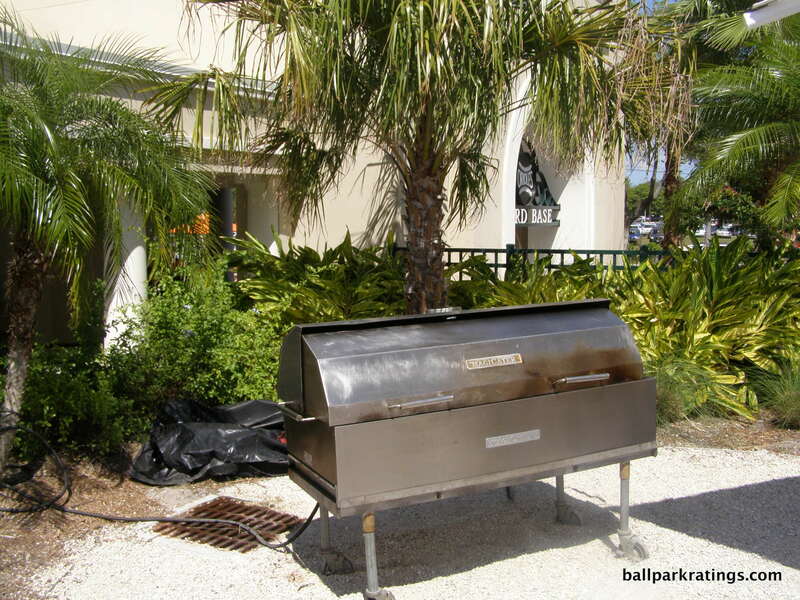 Forget cold concrete iceboxes. 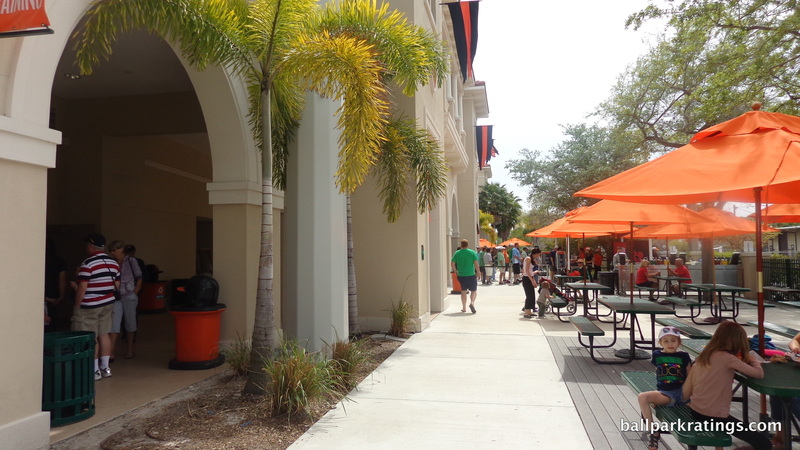 This could have been any community college facility. 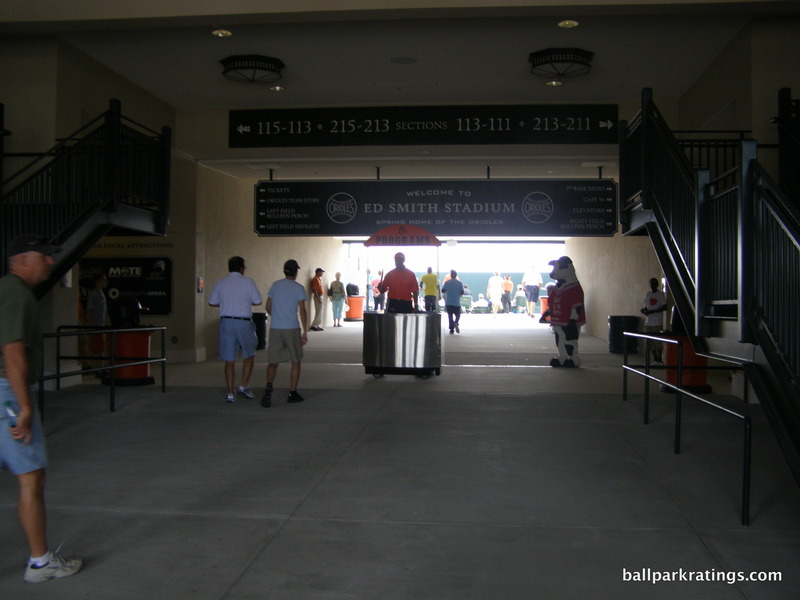 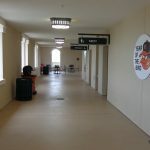 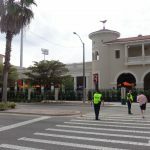 With a concourse separated from the street by a chain-linked fence, Ed Smith Stadium was a truly simple park, even stripped of an enclosed hallway on the press level. 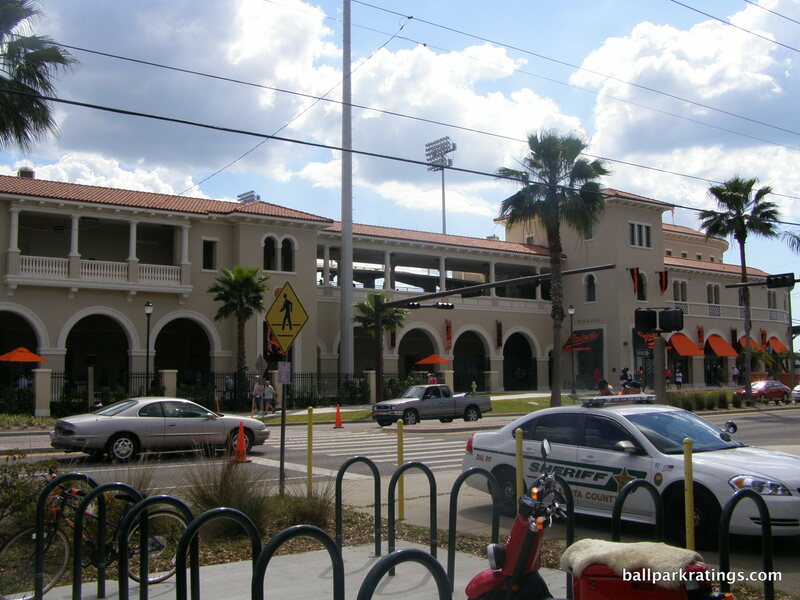 So, while similarly lacking in pomp and frills, Ed Smith Stadium was even more bare boned design-wise, to the point where architects could basically start over and make whatever they wanted. 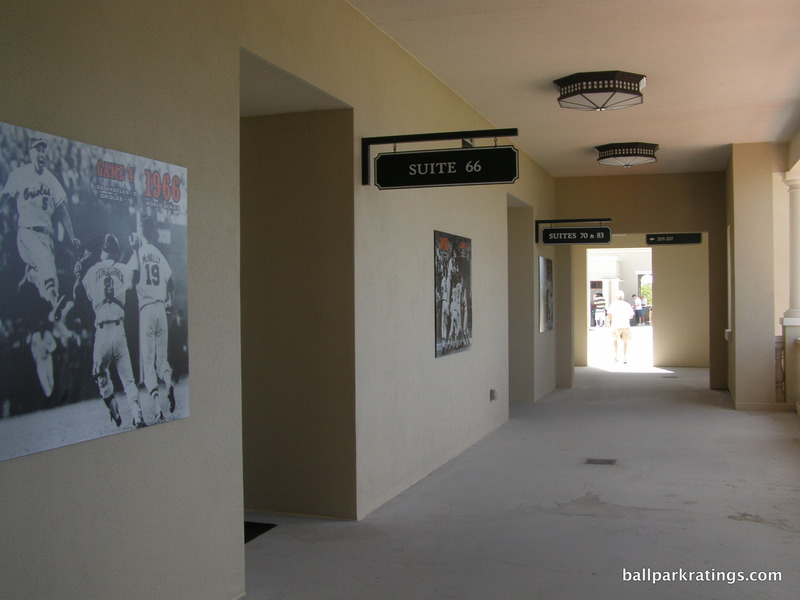 What resulted was perhaps the most dramatic ballpark renovation of the 21stcentury, where the refurbished vision doesn’t even remotely resemble the old one. 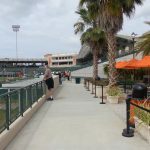 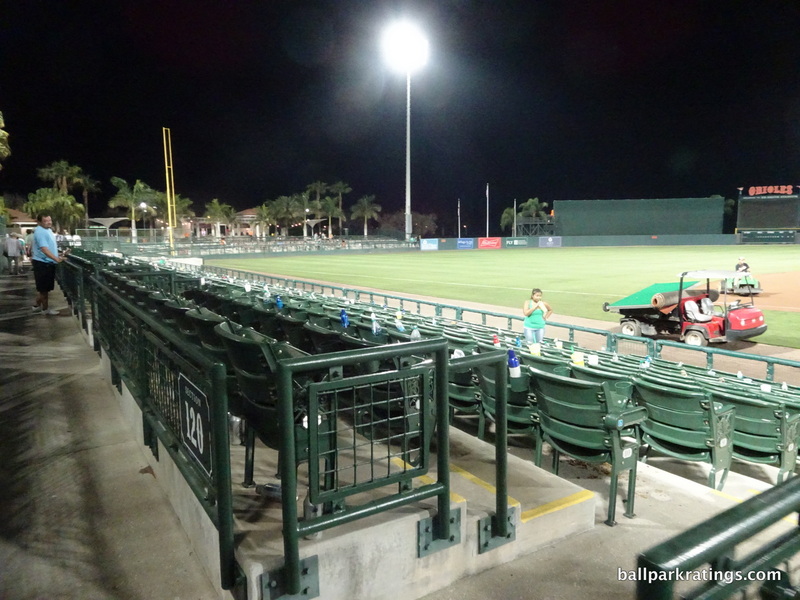 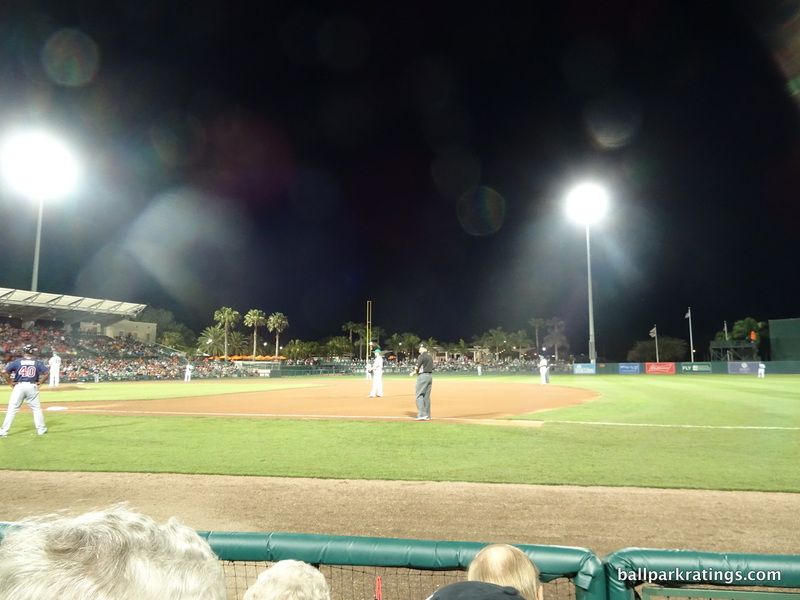 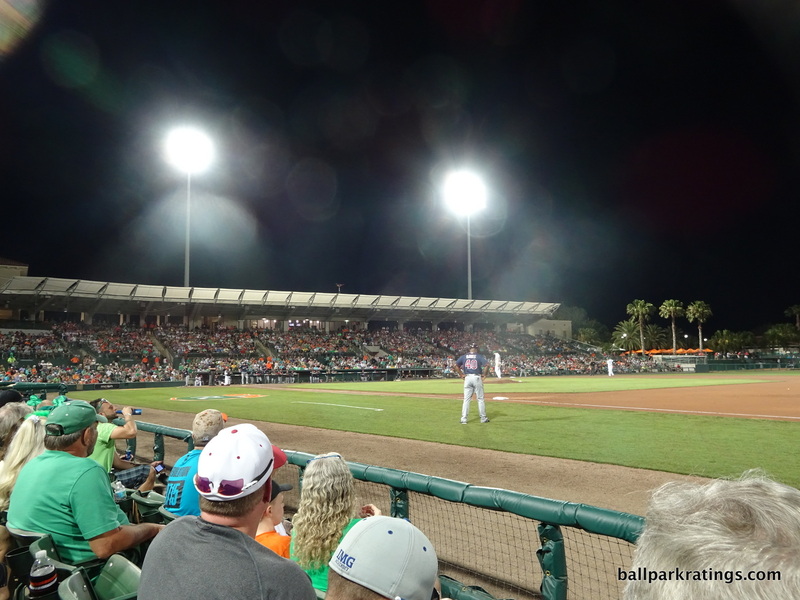 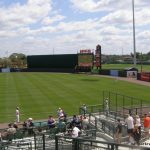 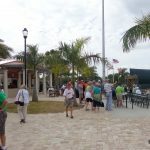 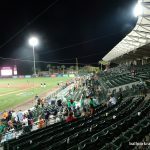 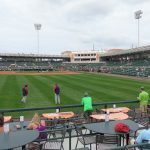 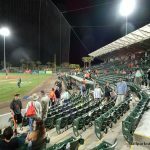 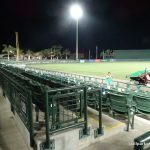 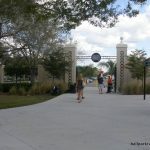 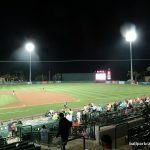 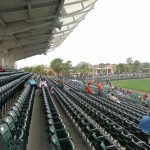 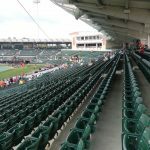 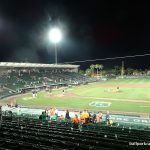 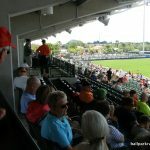 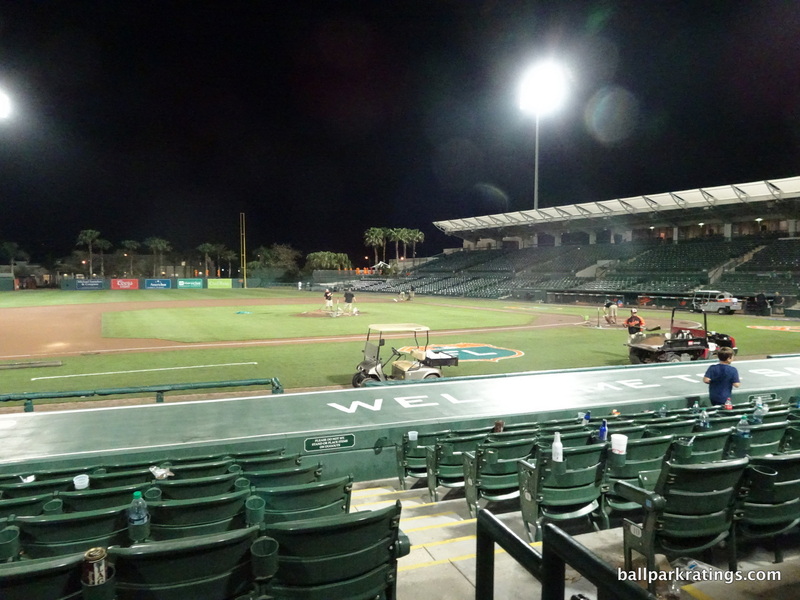 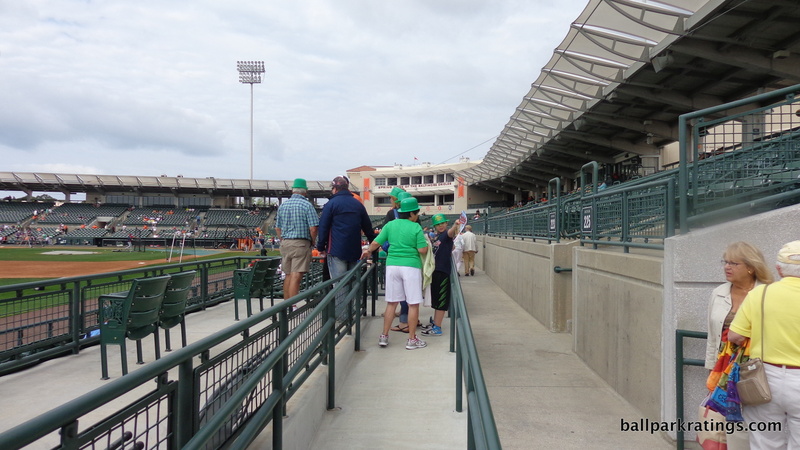 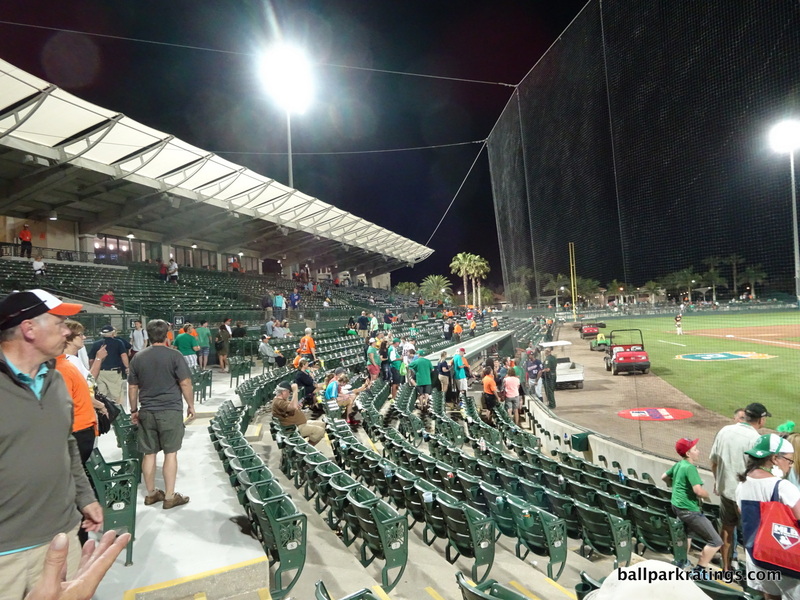 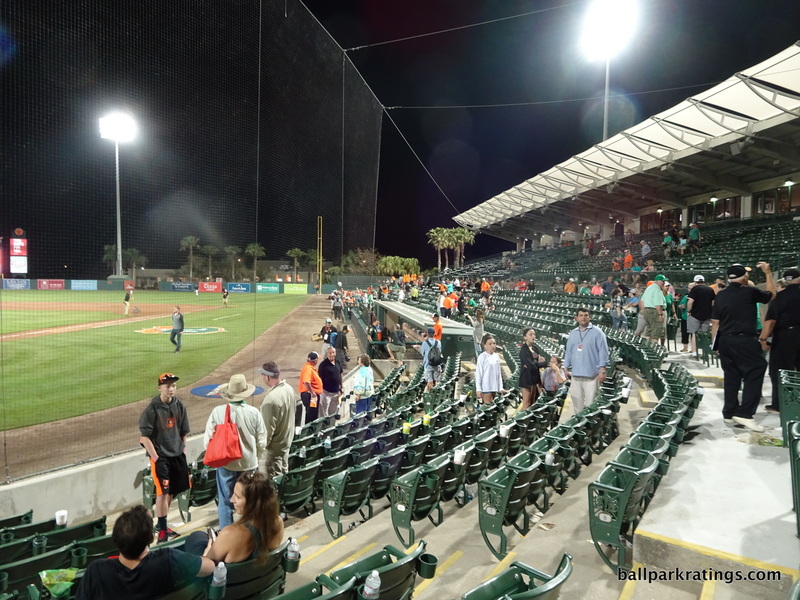 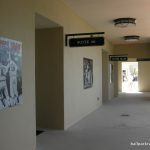 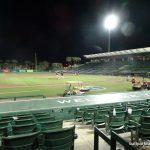 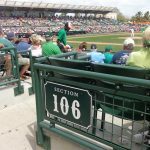 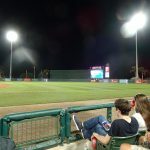 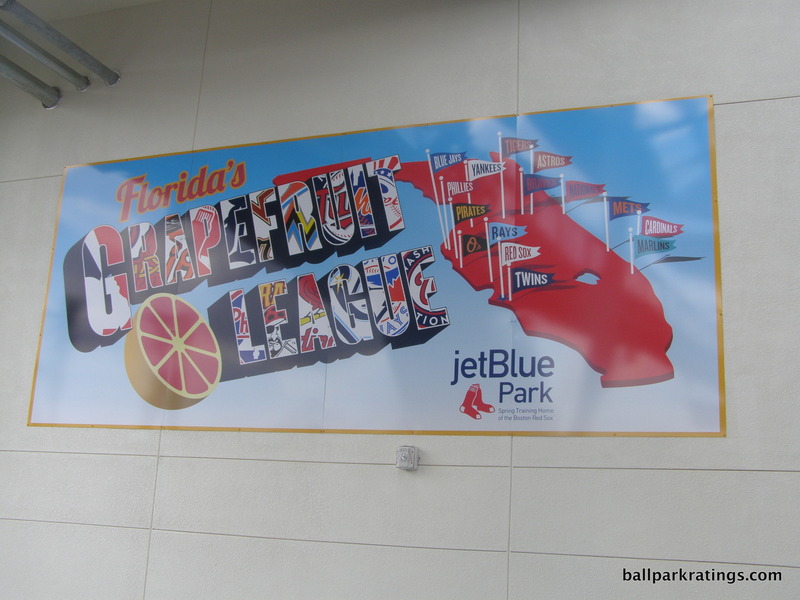 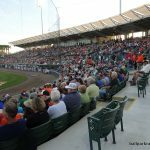 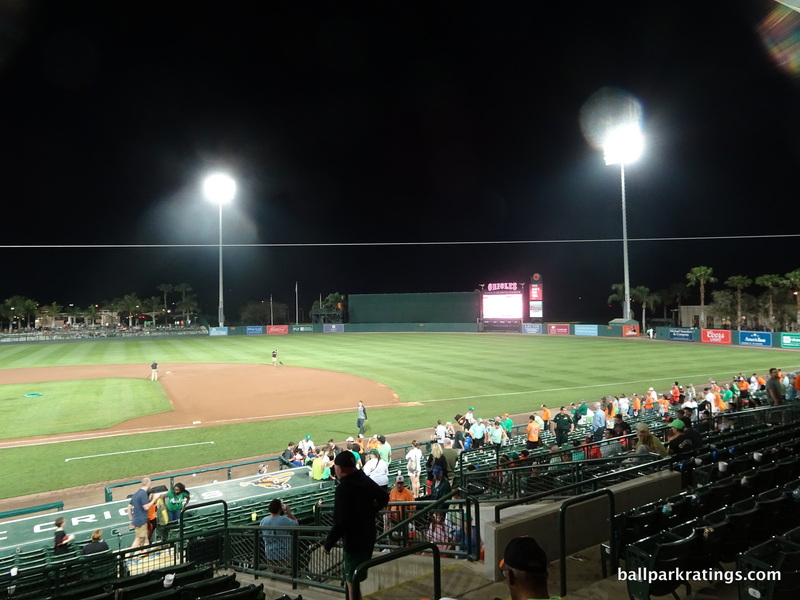 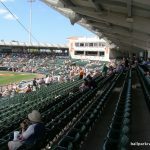 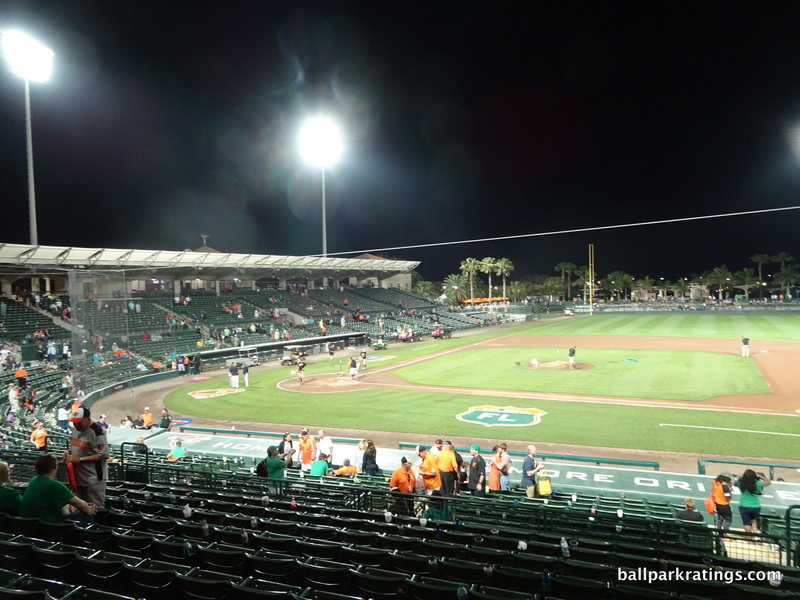 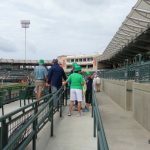 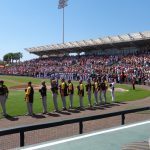 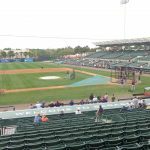 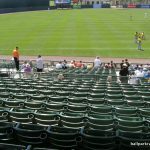 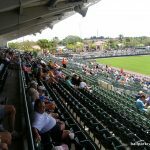 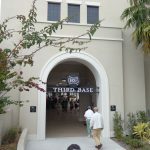 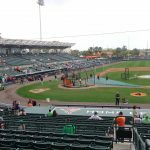 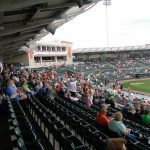 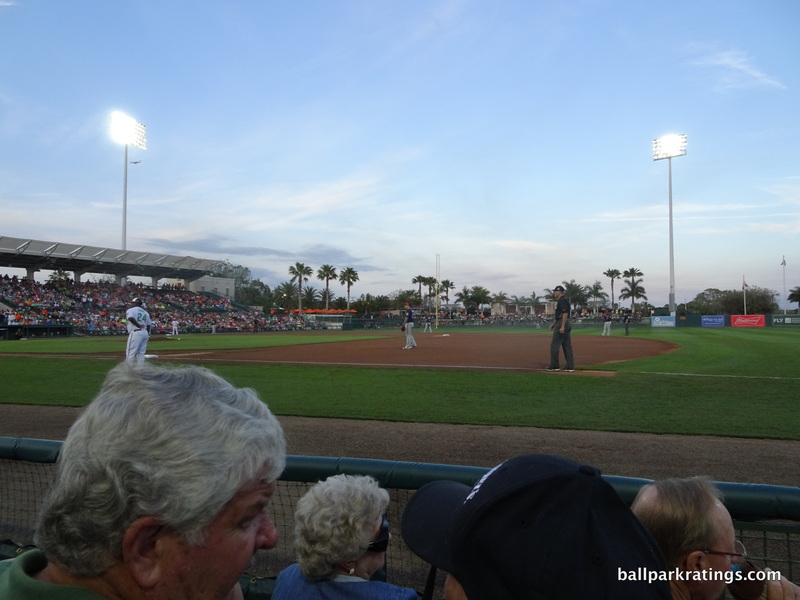 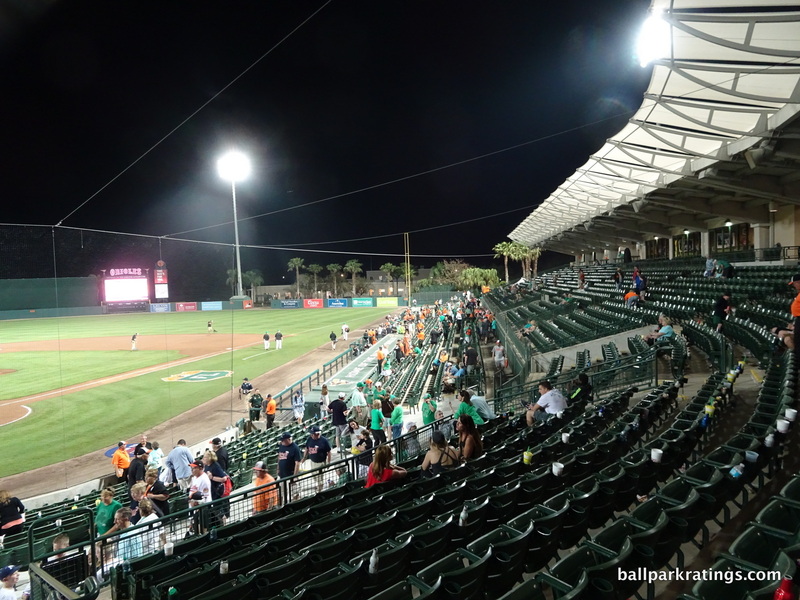 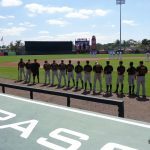 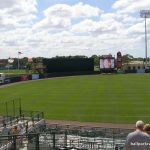 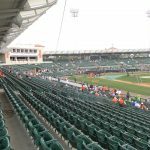 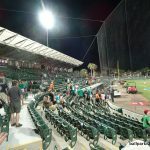 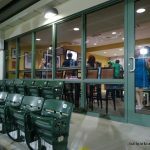 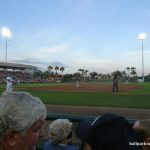 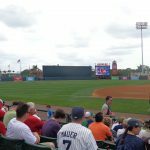 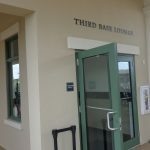 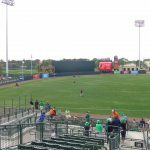 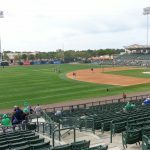 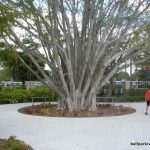 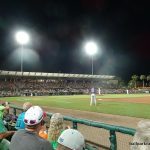 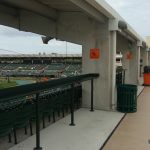 With some of the most striking architecture and aesthetics in the Grapefruit League and team historical references on par with those at JetBlue Park (Sox) and Steinbrenner Field (Yanks), Ed Smith Stadium was perhaps the biggest ballpark surprise in recent memory. 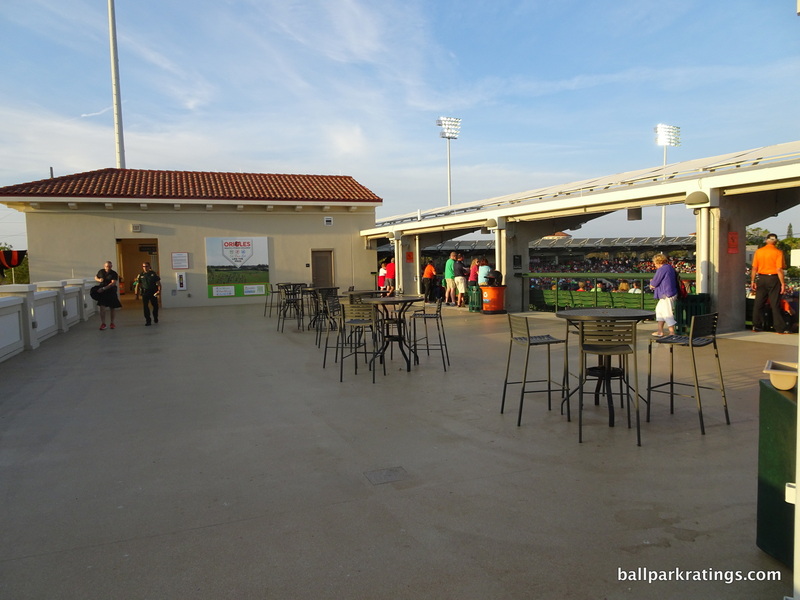 This totally nondescript venue was turned into a state-of-the-art one overnight at 1/3rdthe cost of new facilities in Arizona. 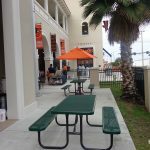 Given such high acclaim, Ed Smith Stadium is also notable for lacking a requisite feature possessed by every other great spring park: a 360-degree concourse. 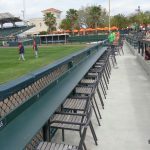 Lacking any space or connection throughout right field, this is by far the park’s biggest flaw, but it’s not disqualifying because Ed Smith utilizes the space it has quite well. 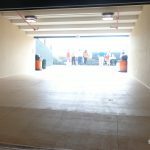 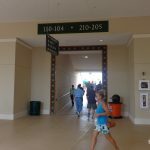 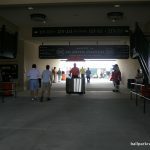 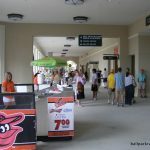 The renovated park was built upward, not outward into the outfield, so the very well-appointed 200-level concourse begins to make up for this deficiency. 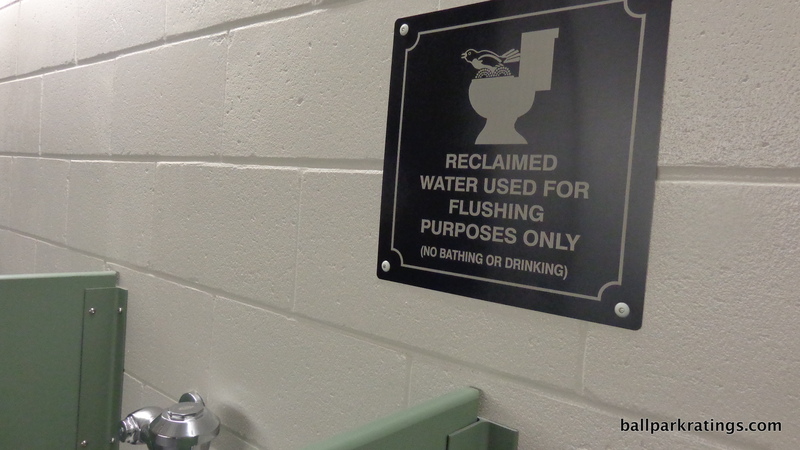 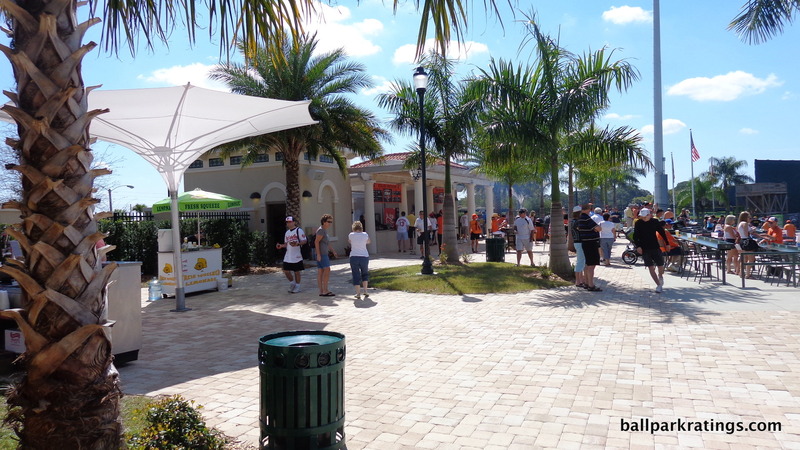 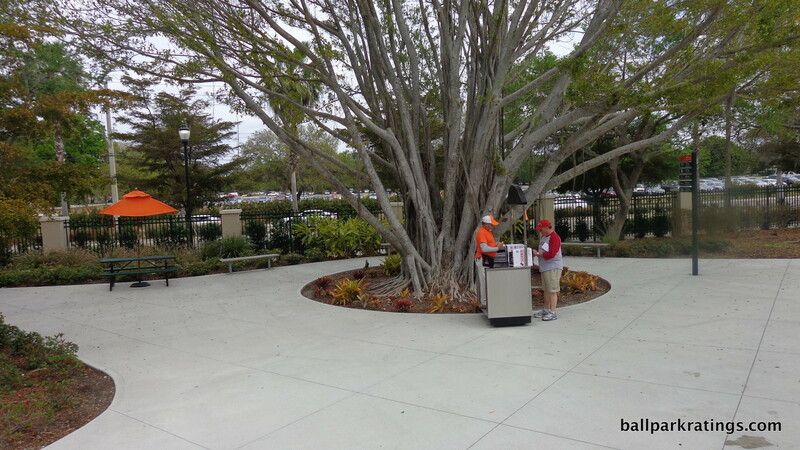 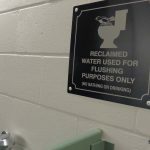 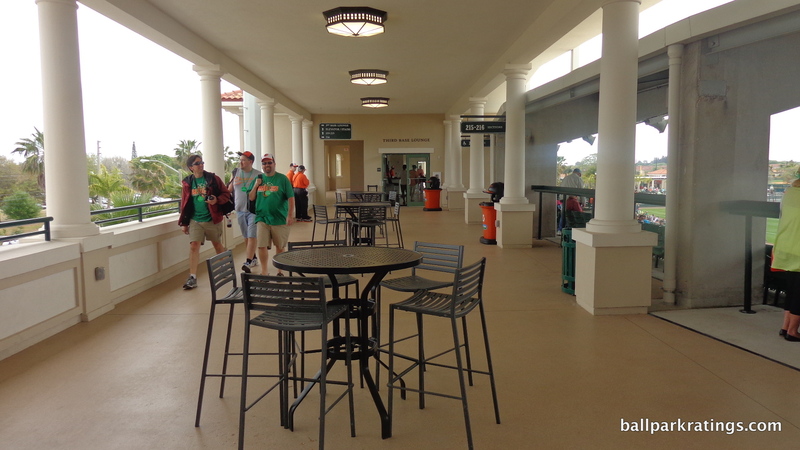 Ed Smith Stadium is beautiful and benefits from its location, but it’s right up there in fan-friendly amenities too. 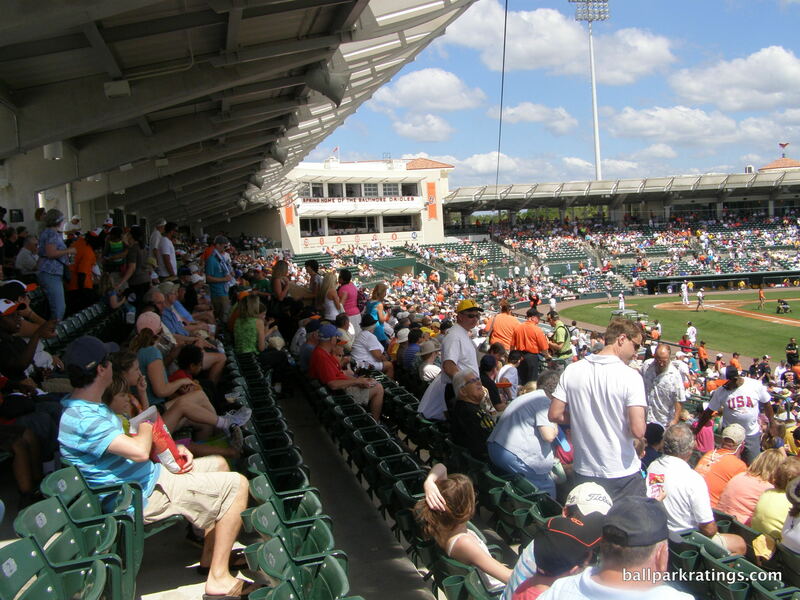 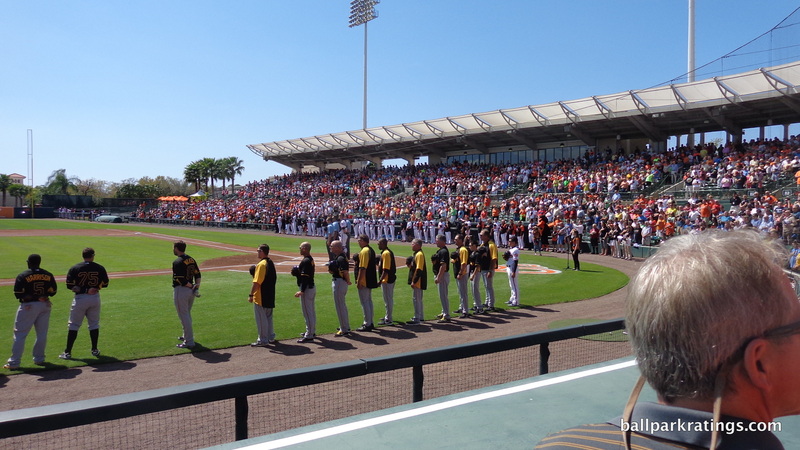 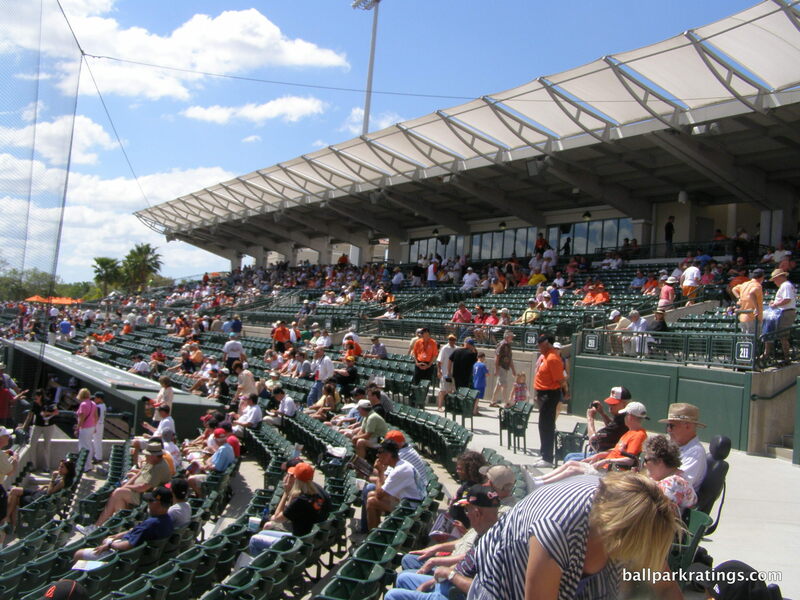 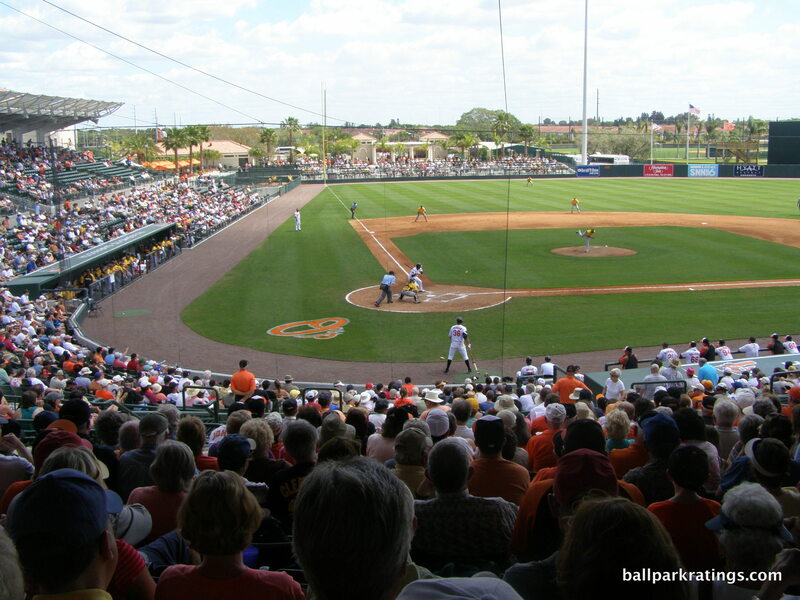 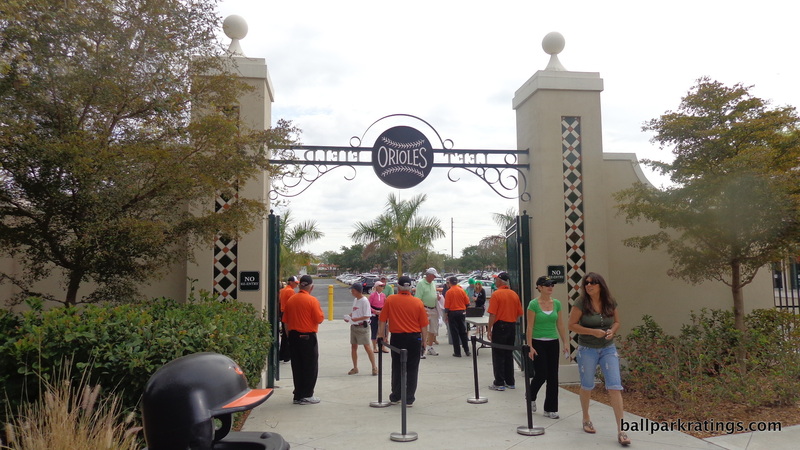 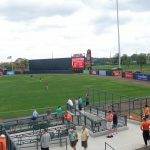 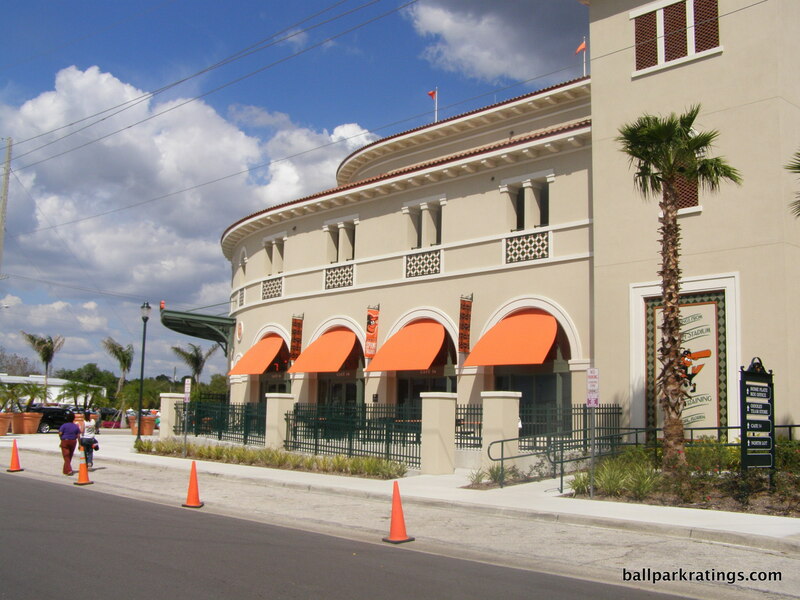 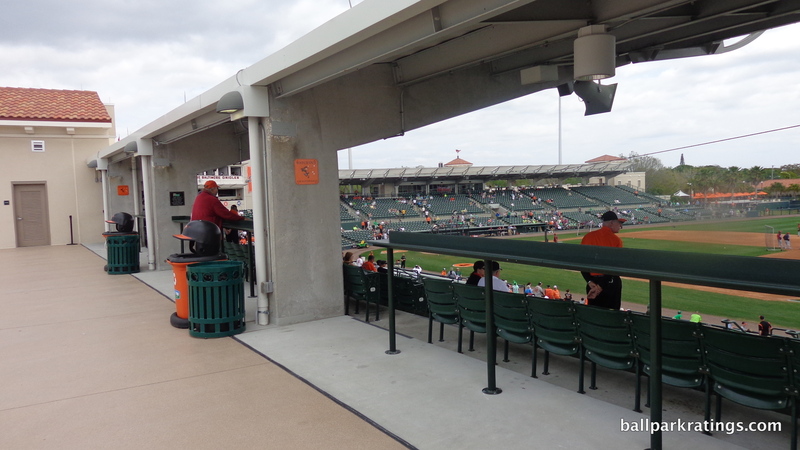 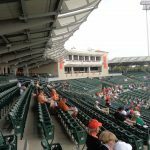 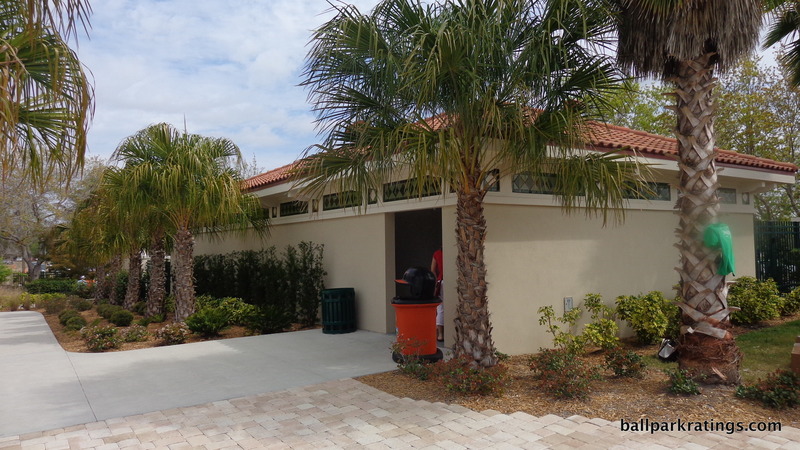 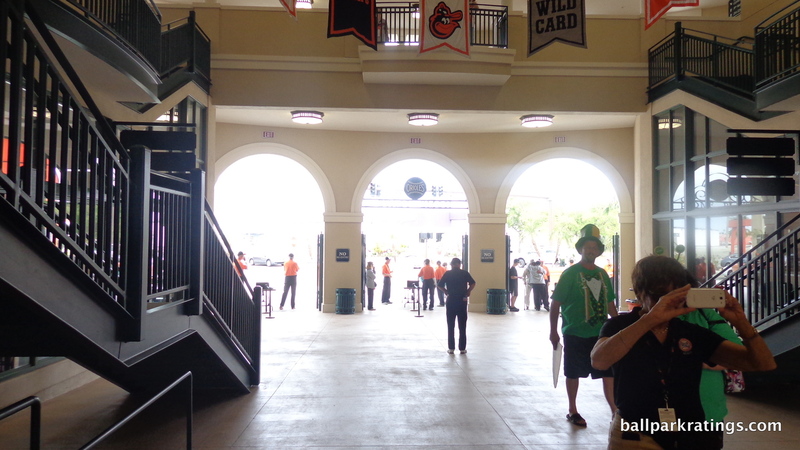 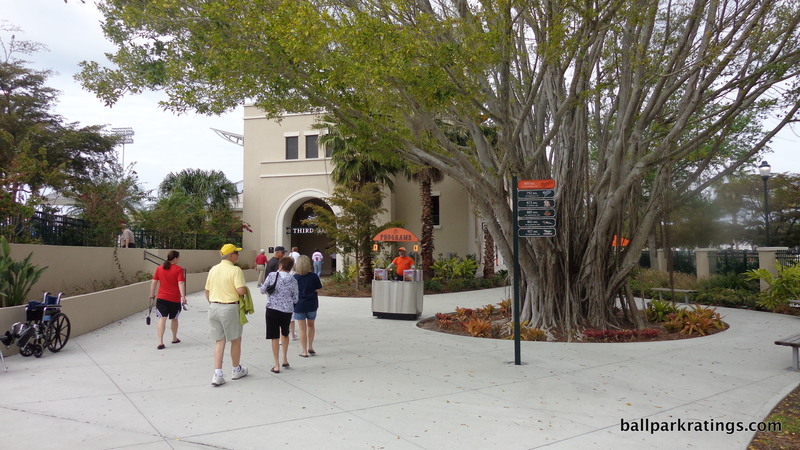 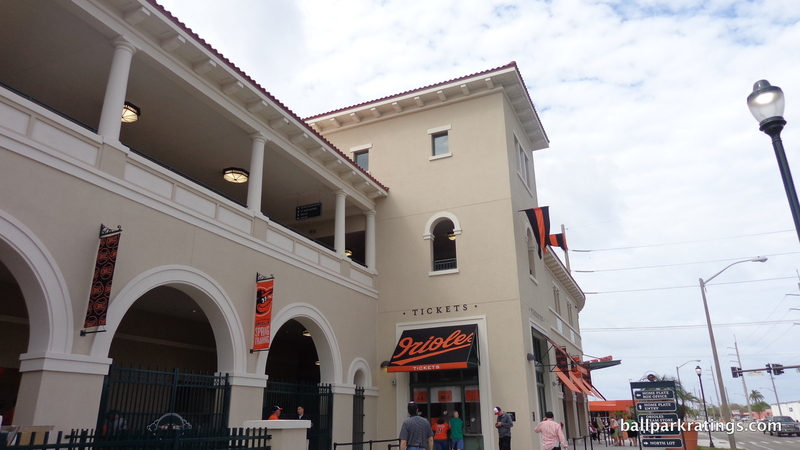 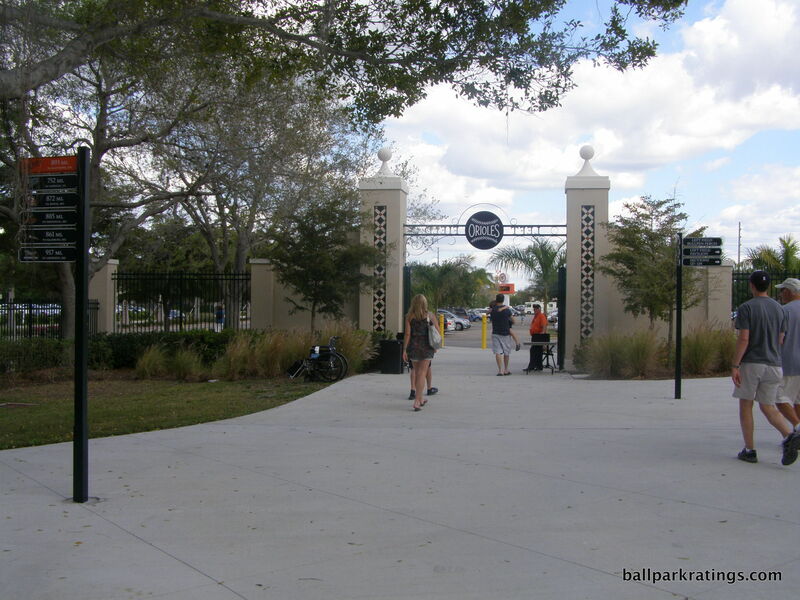 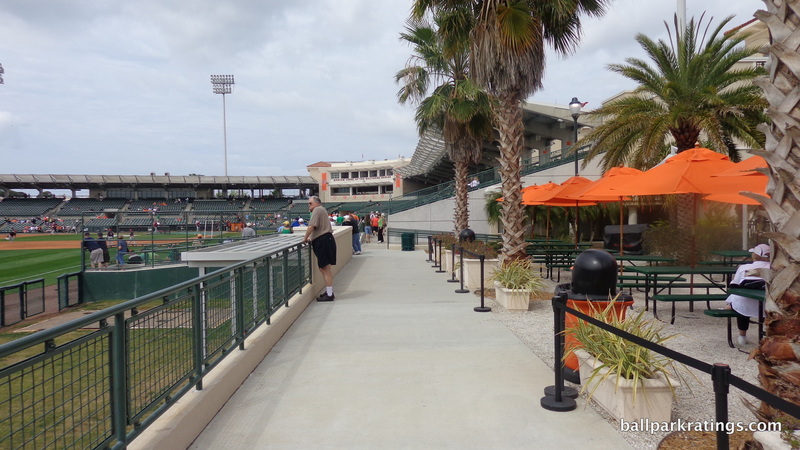 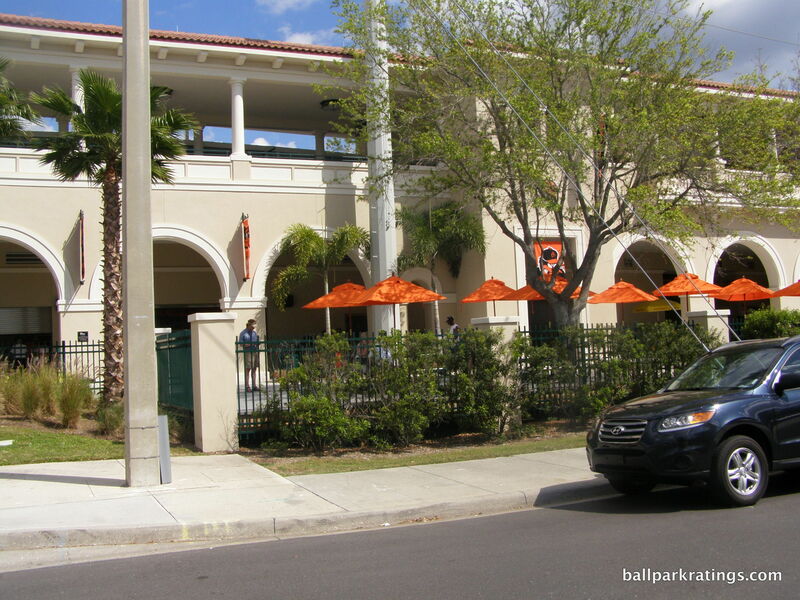 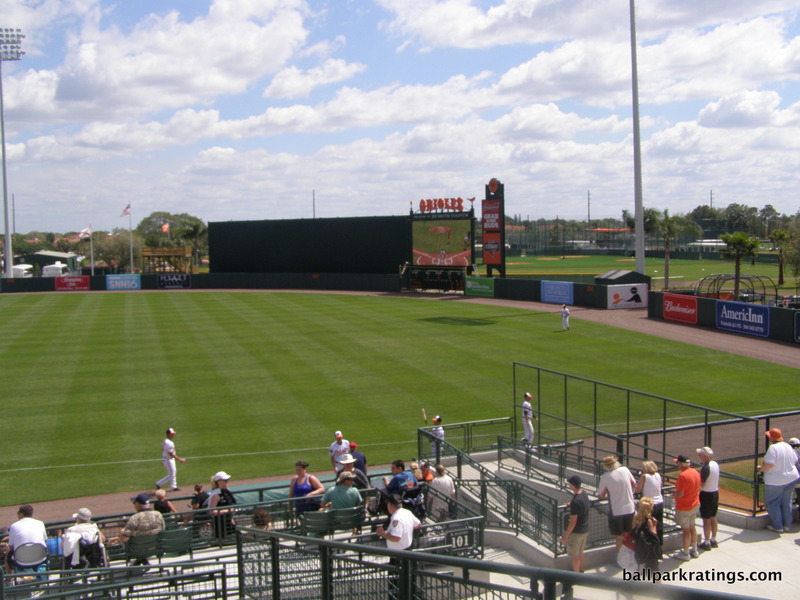 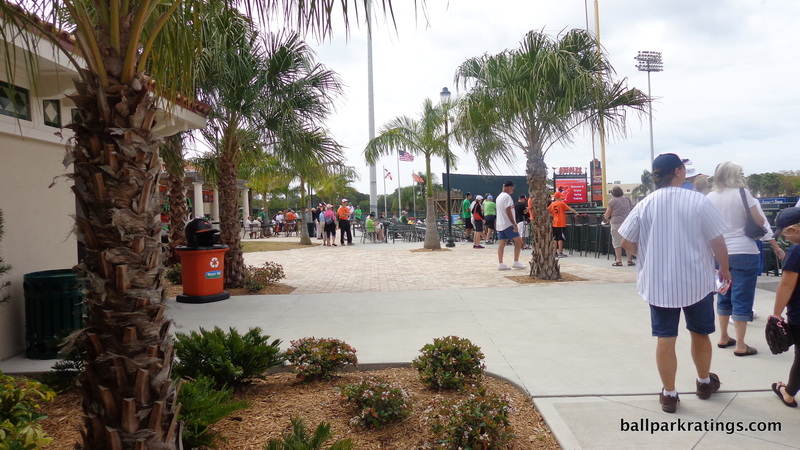 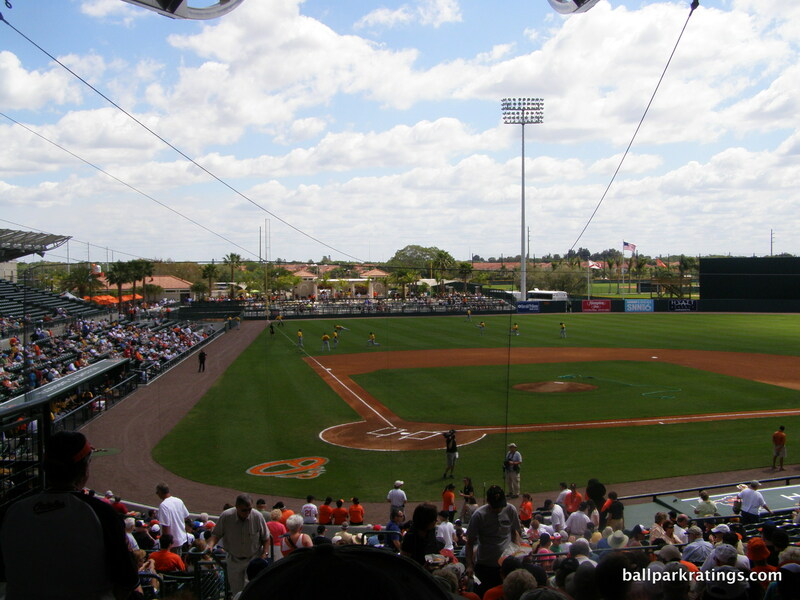 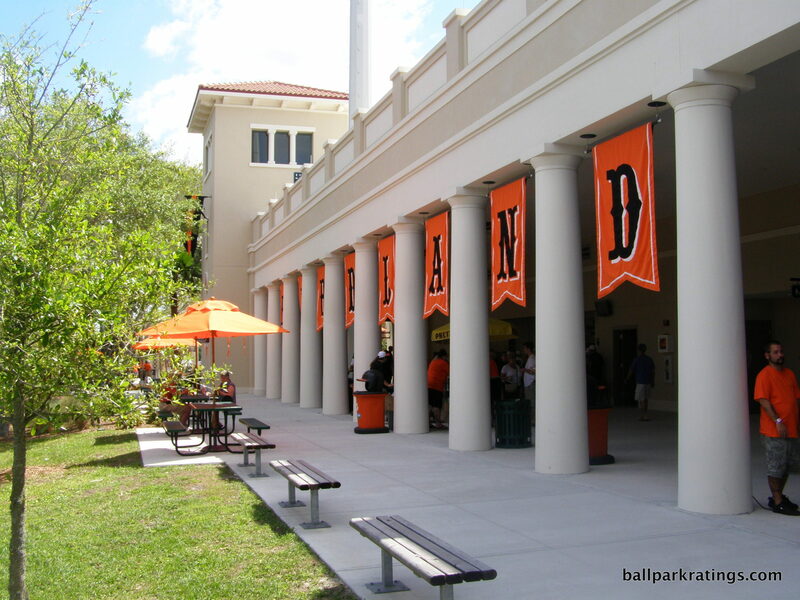 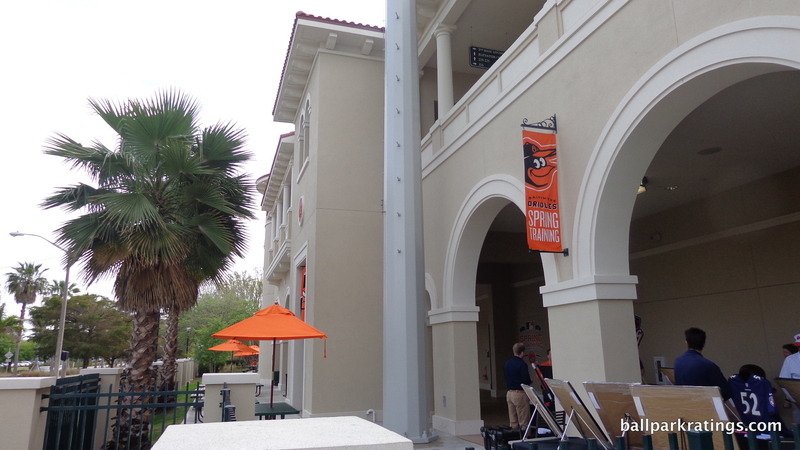 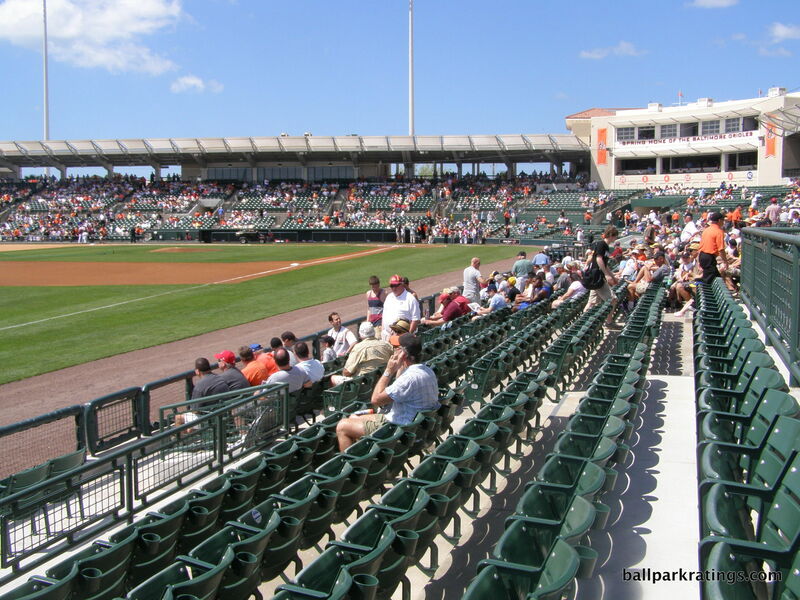 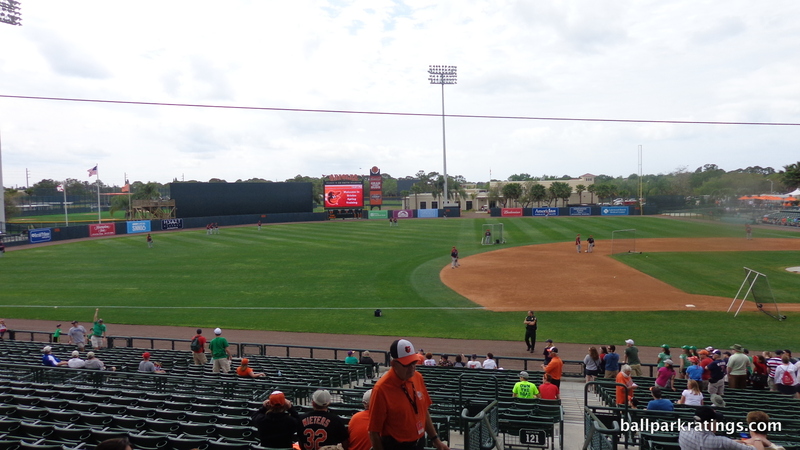 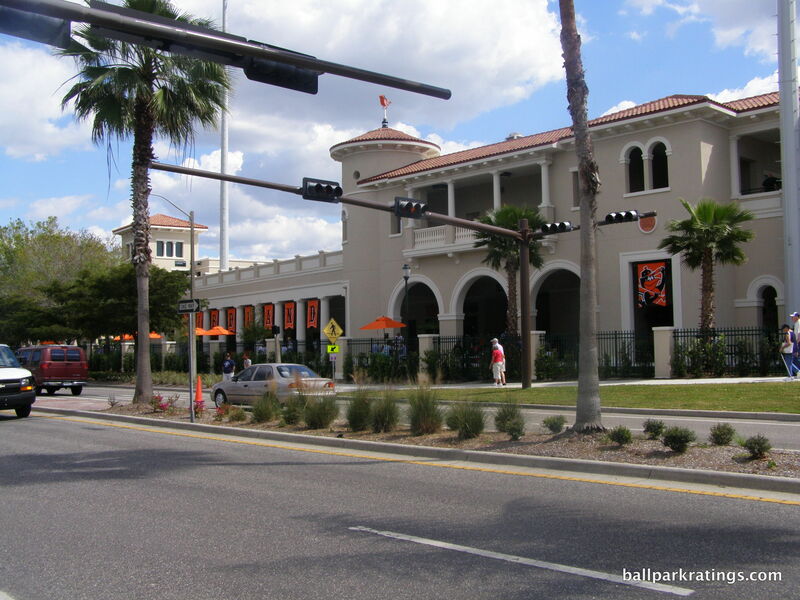 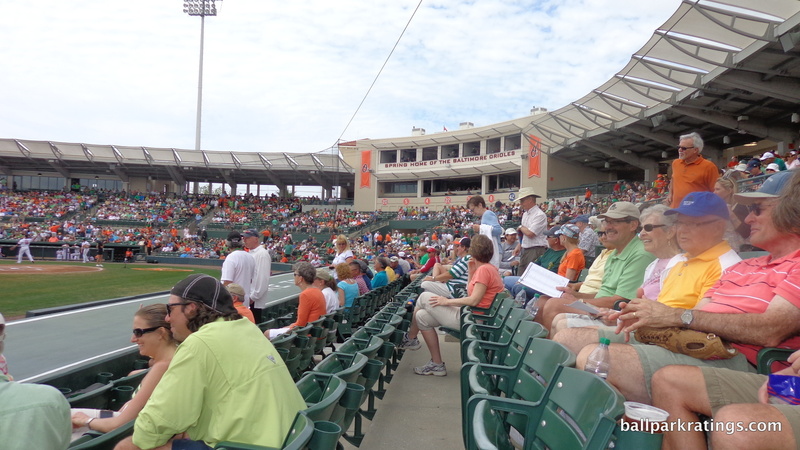 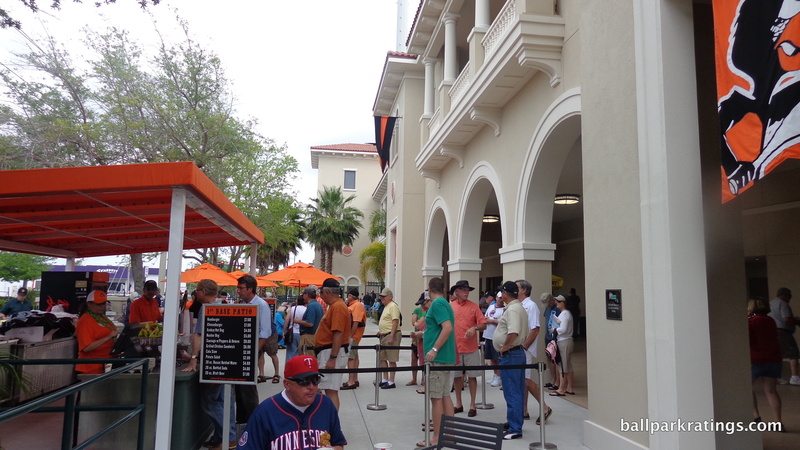 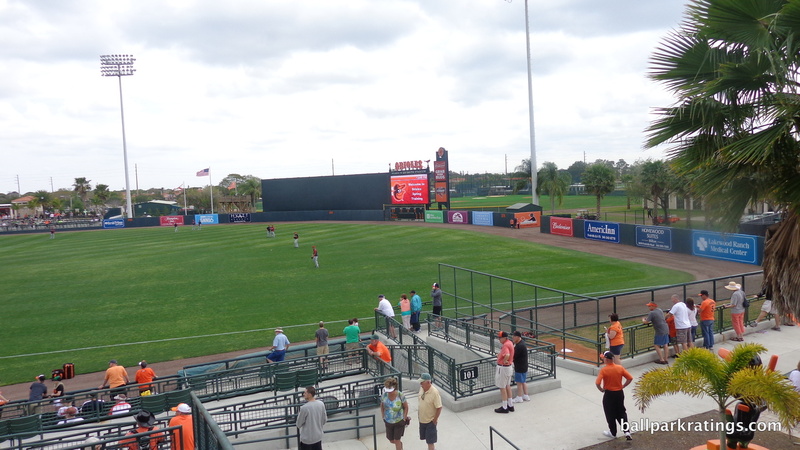 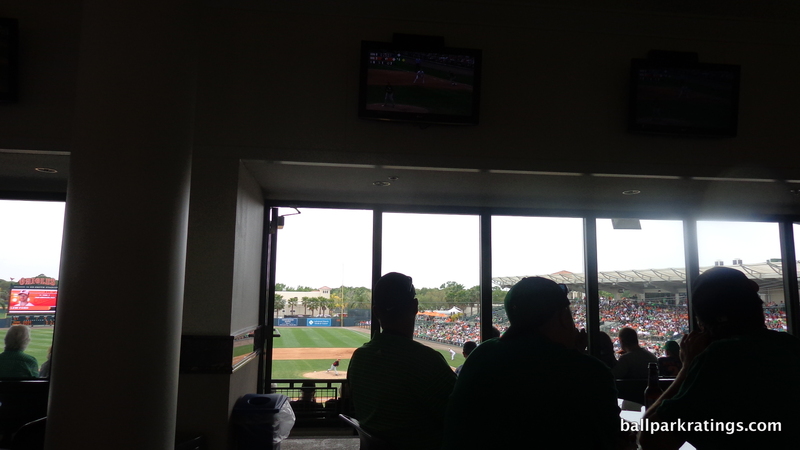 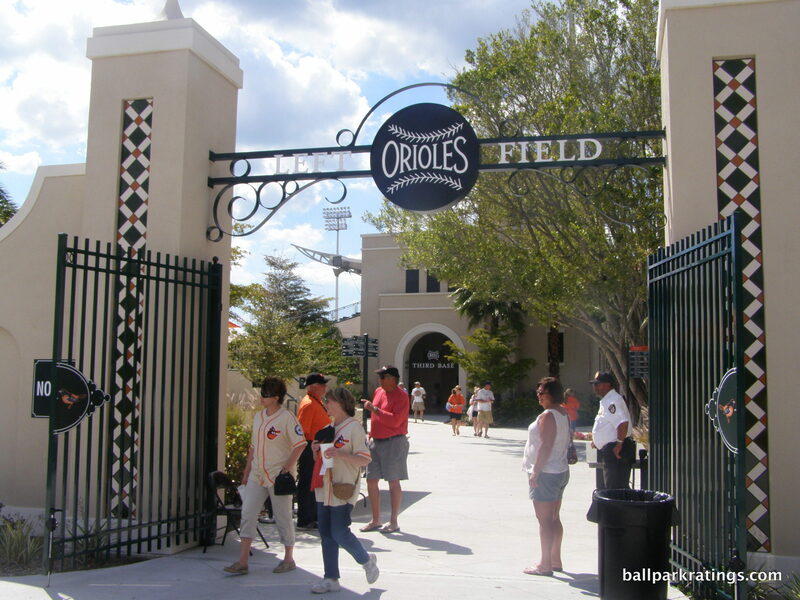 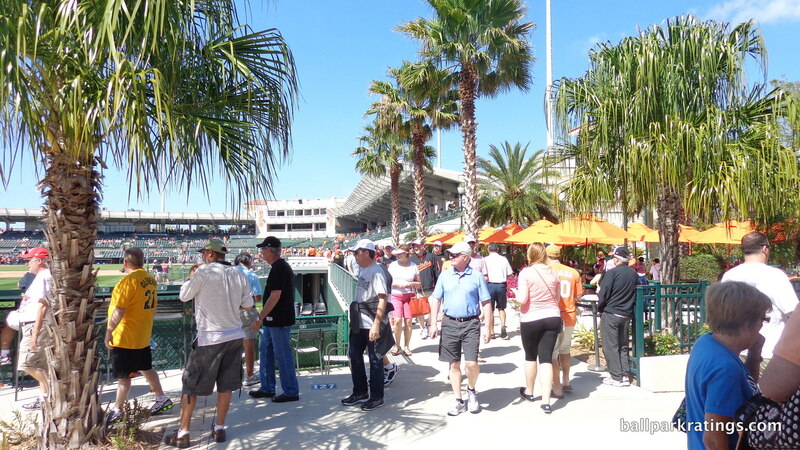 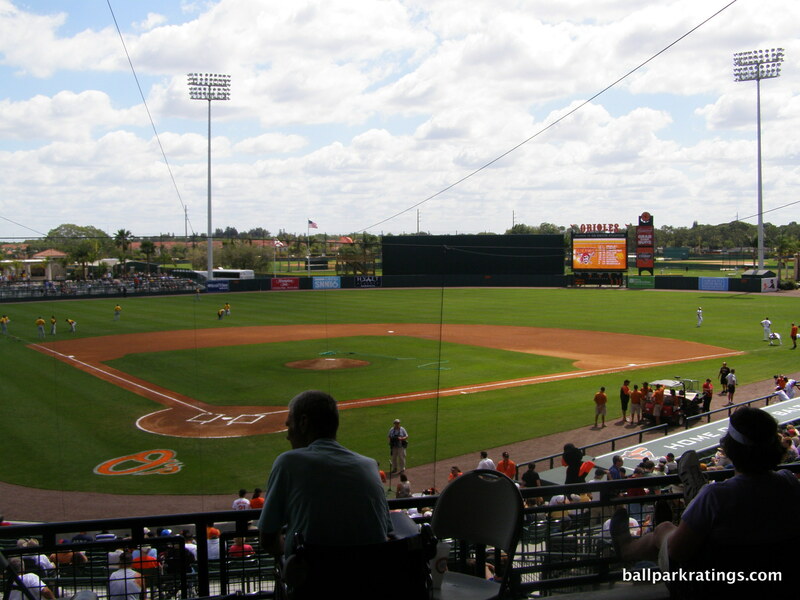 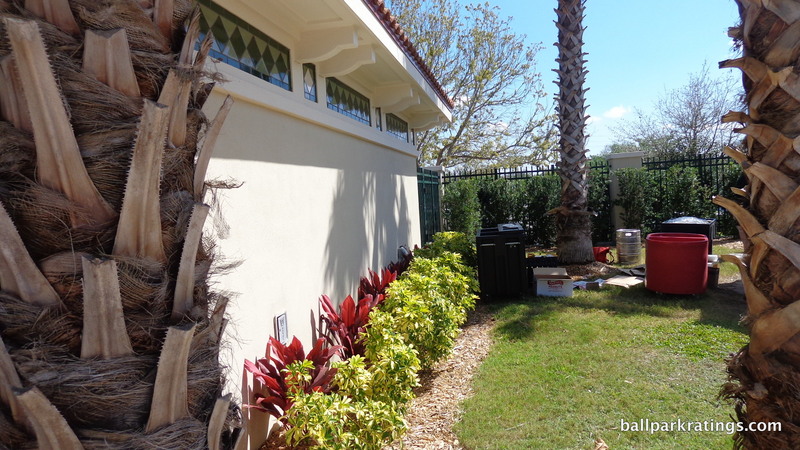 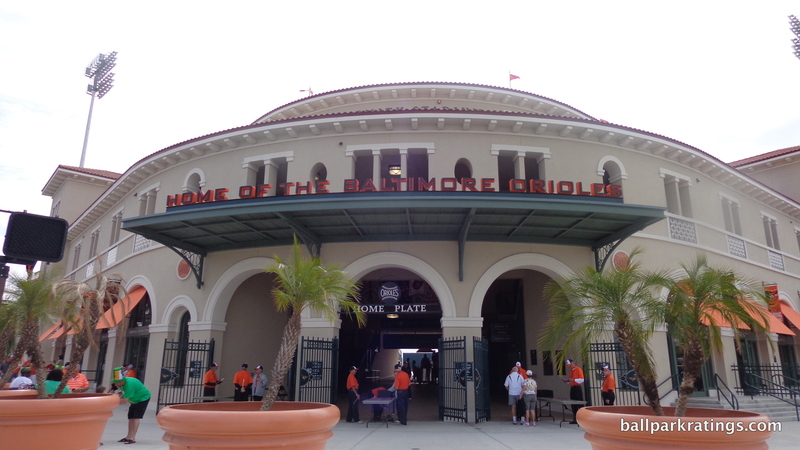 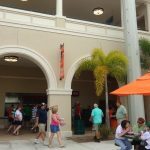 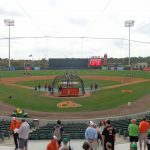 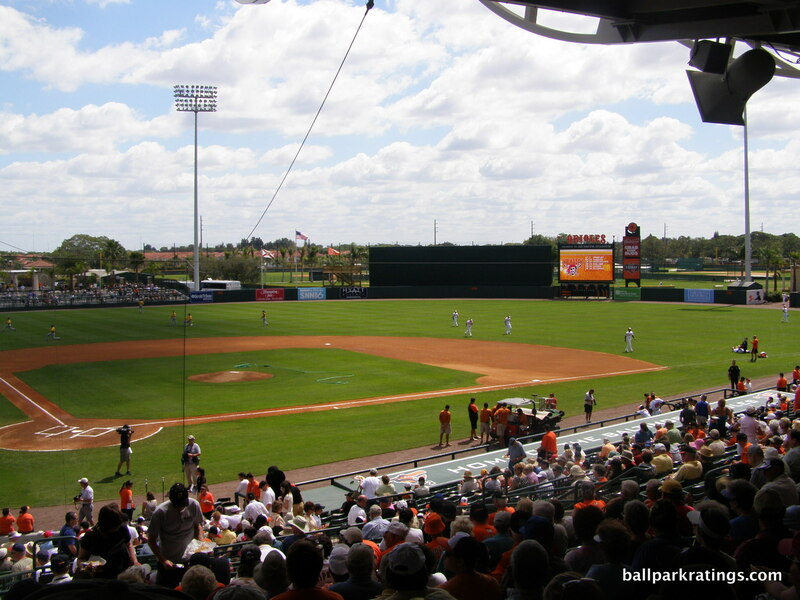 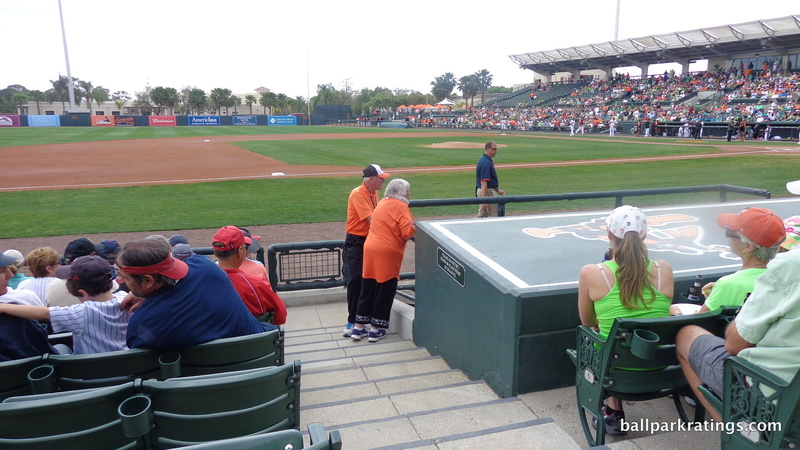 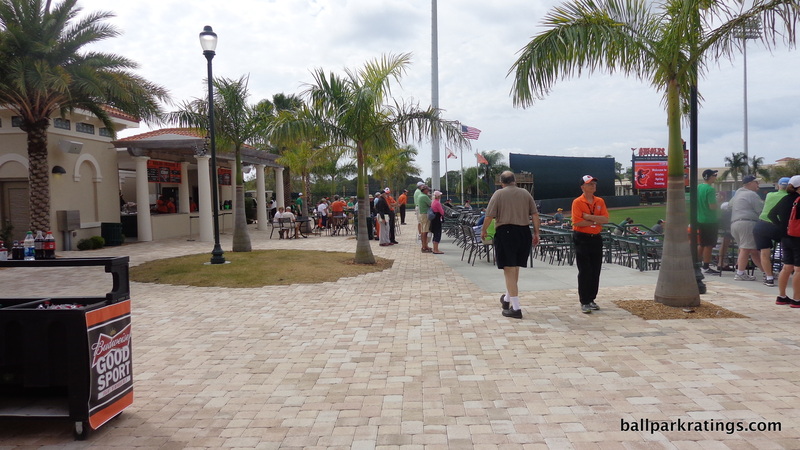 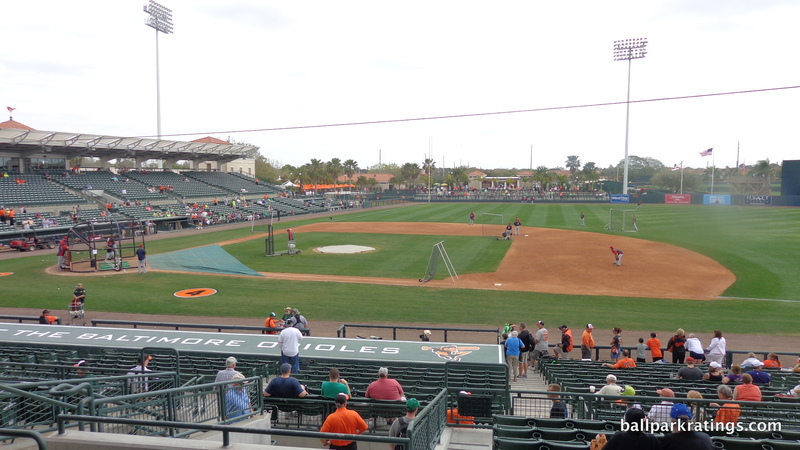 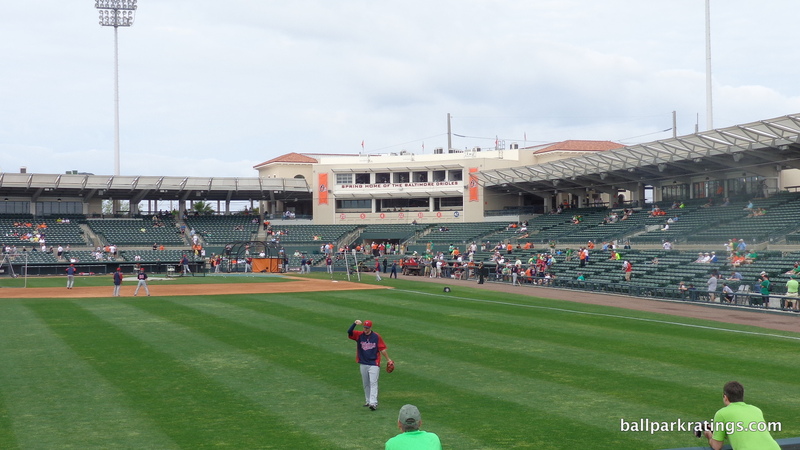 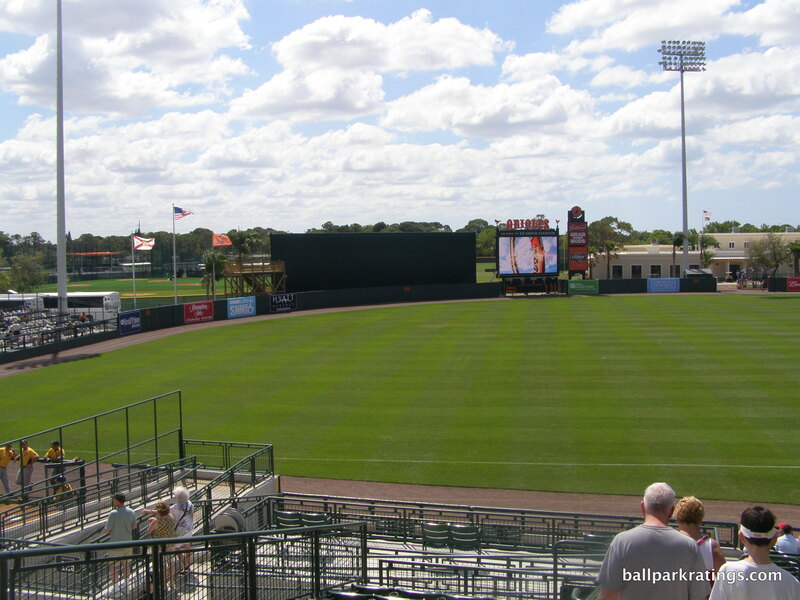 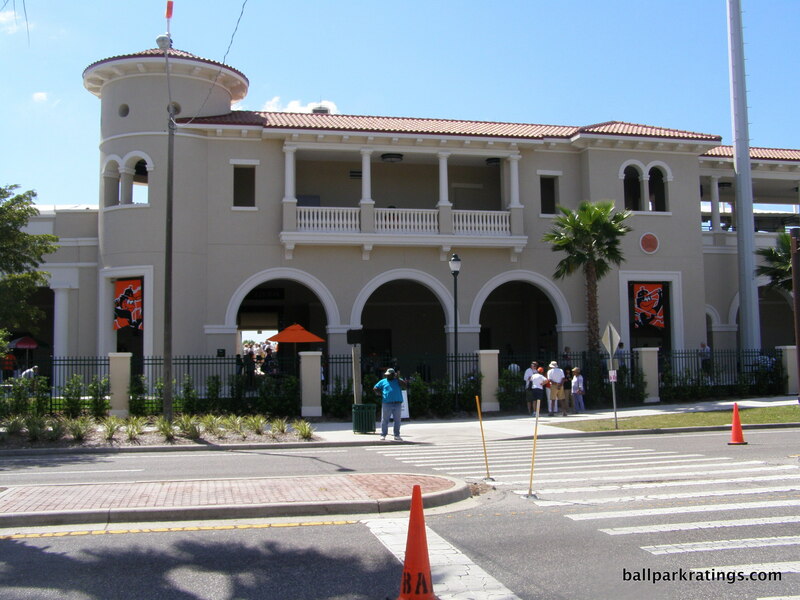 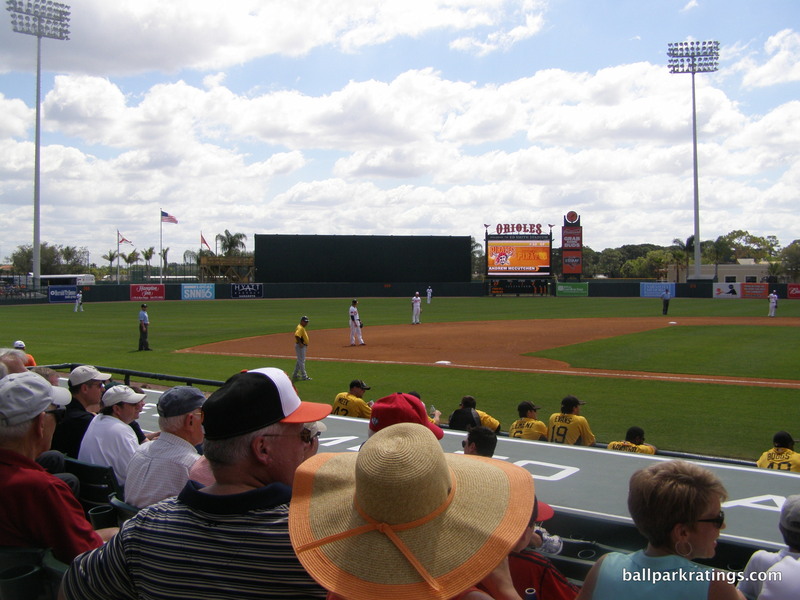 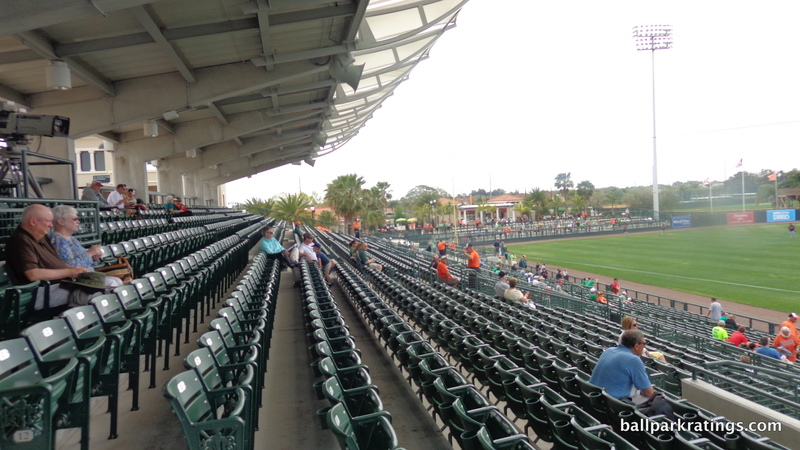 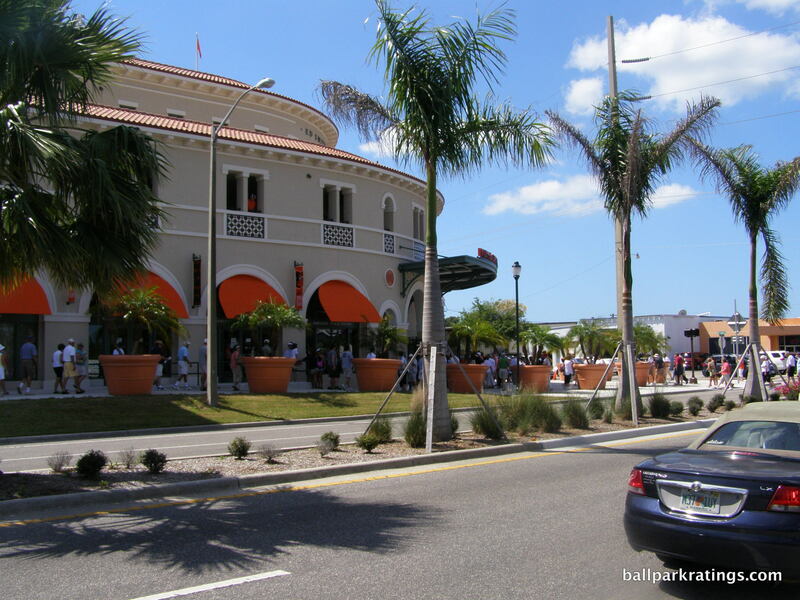 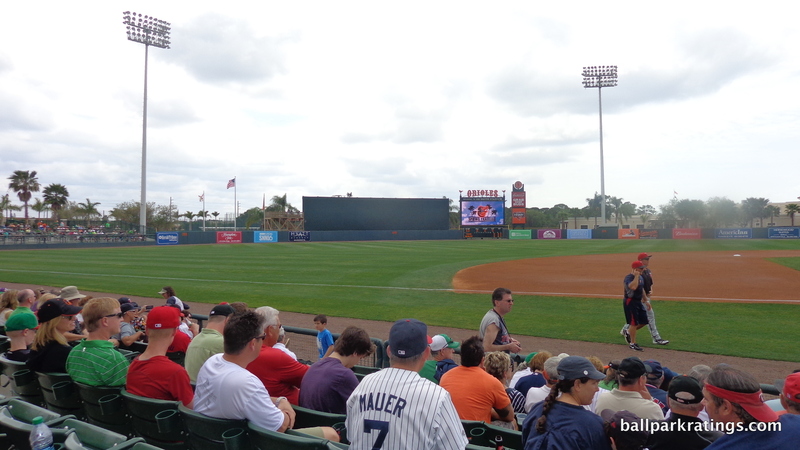 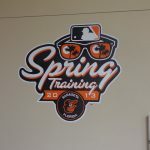 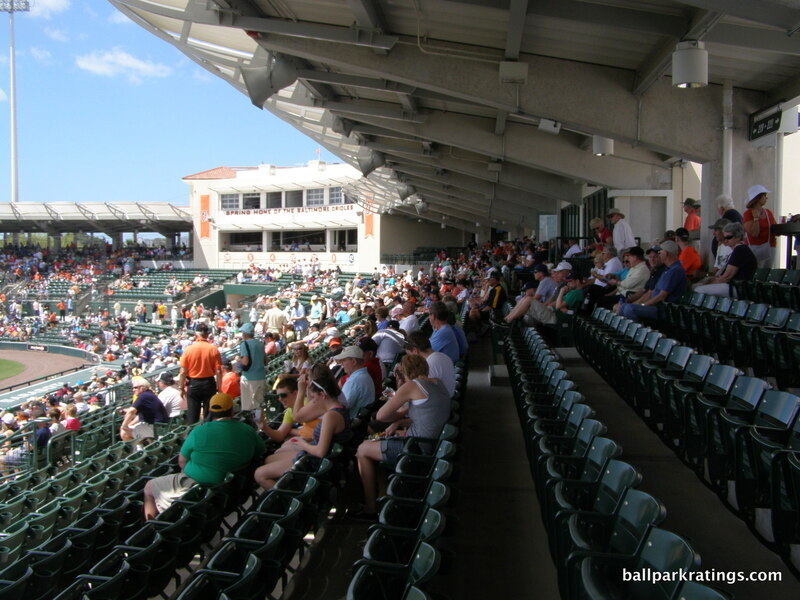 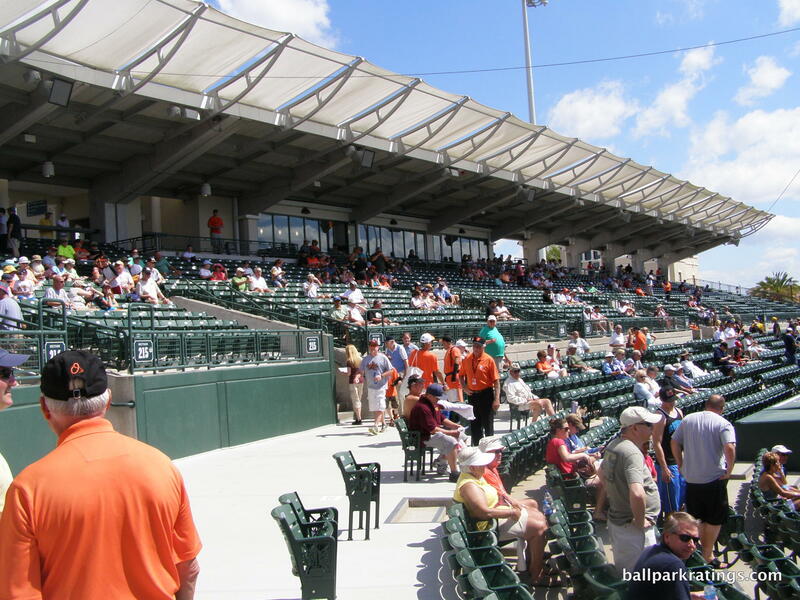 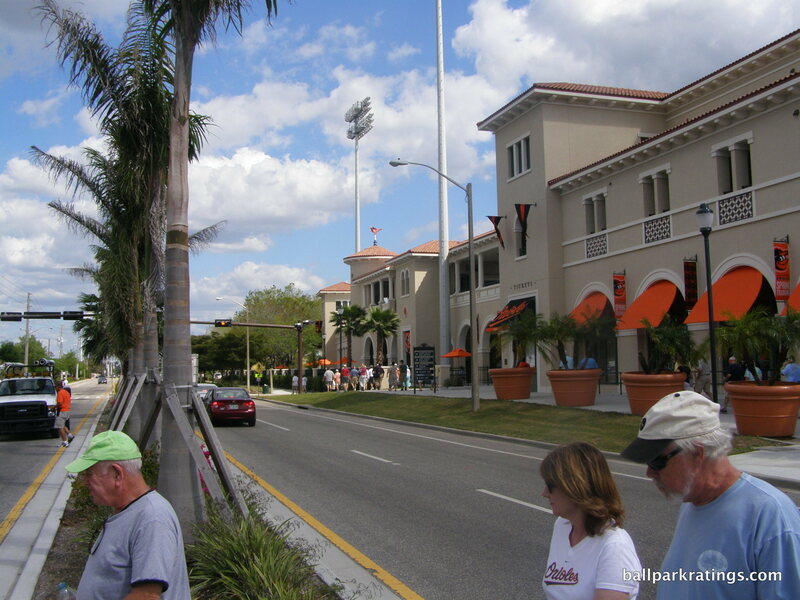 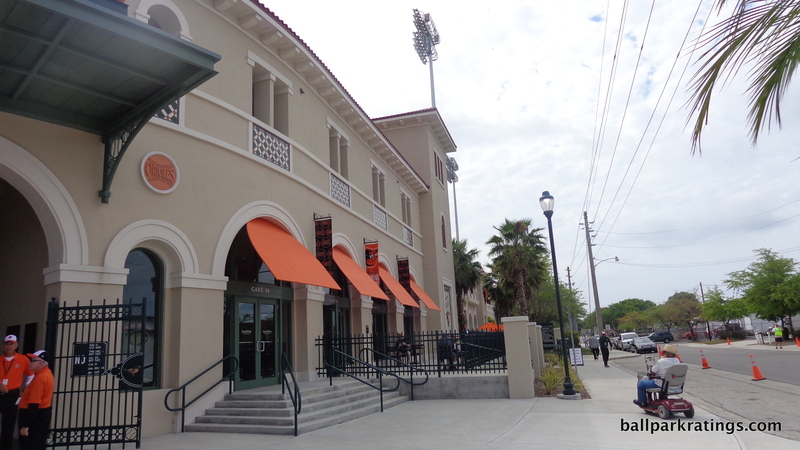 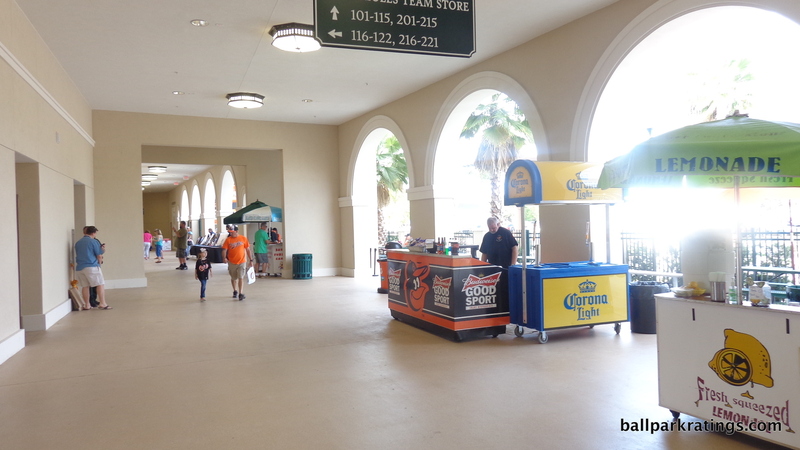 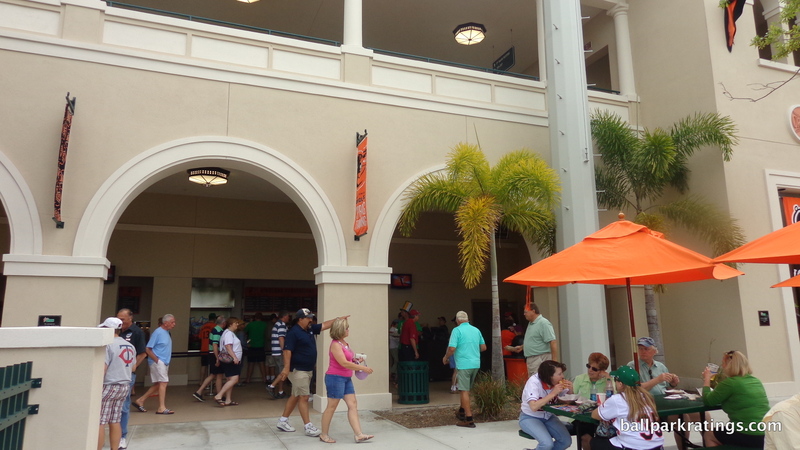 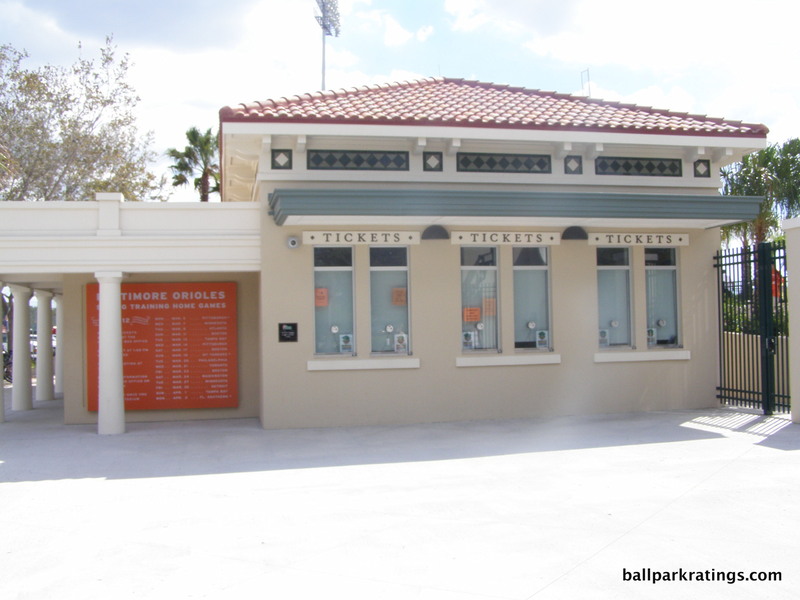 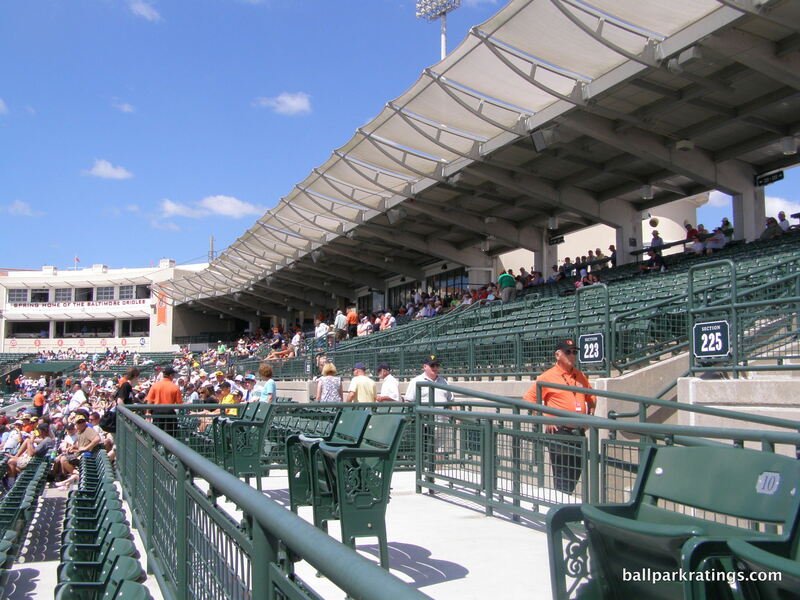 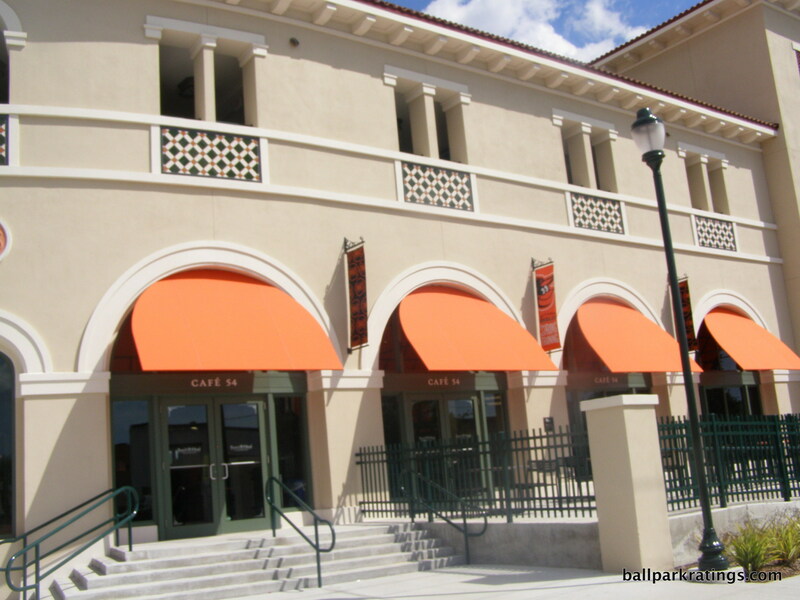 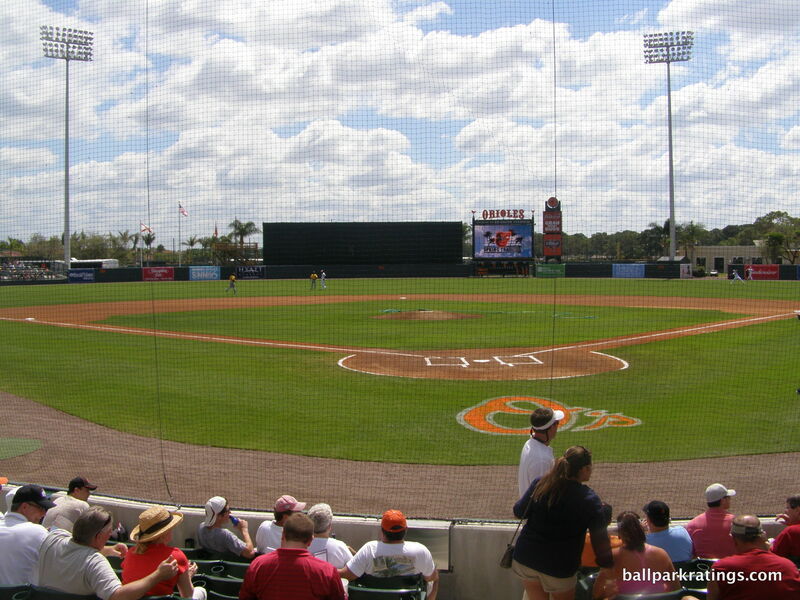 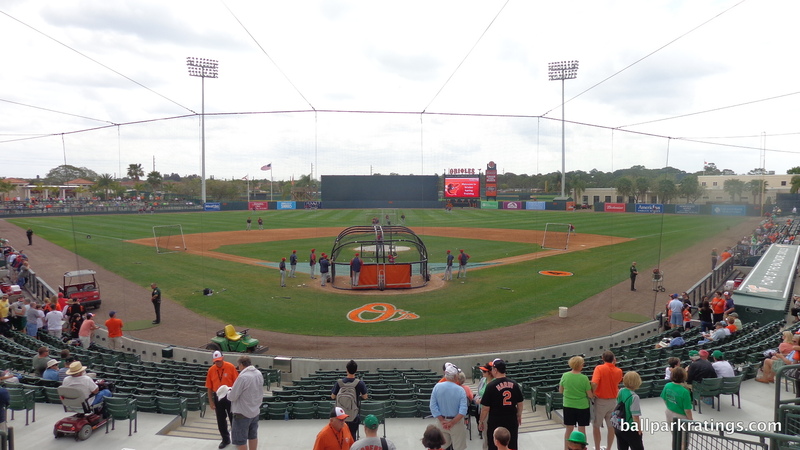 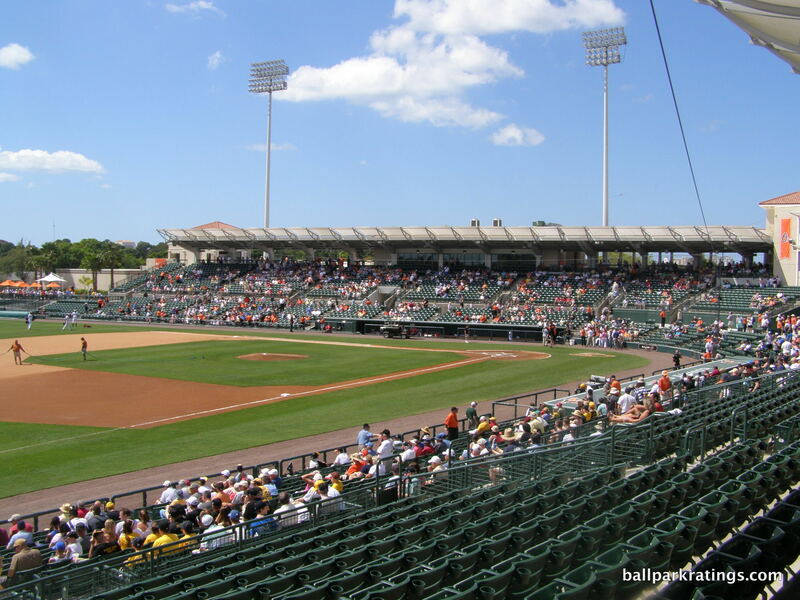 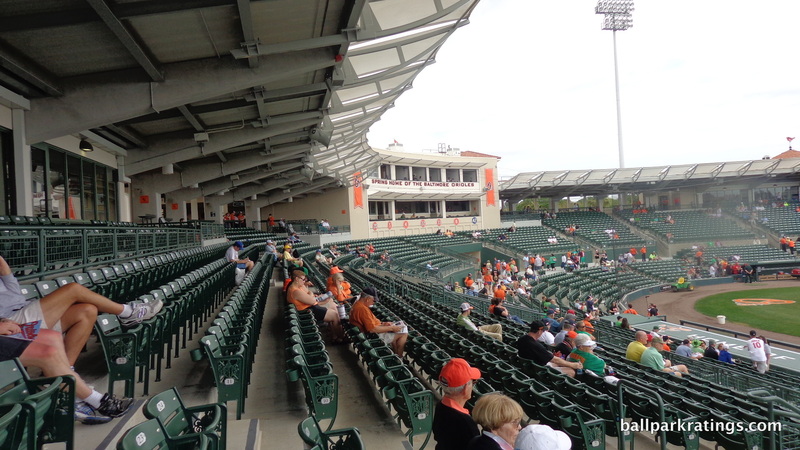 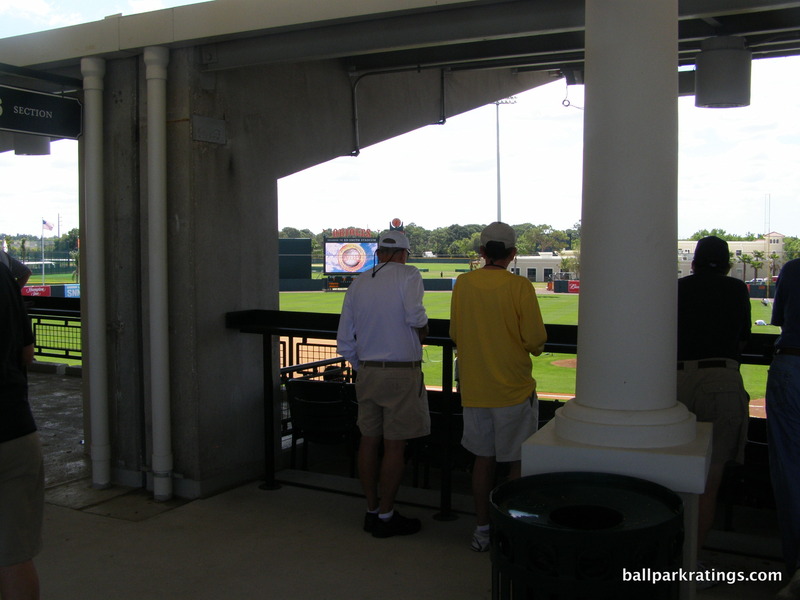 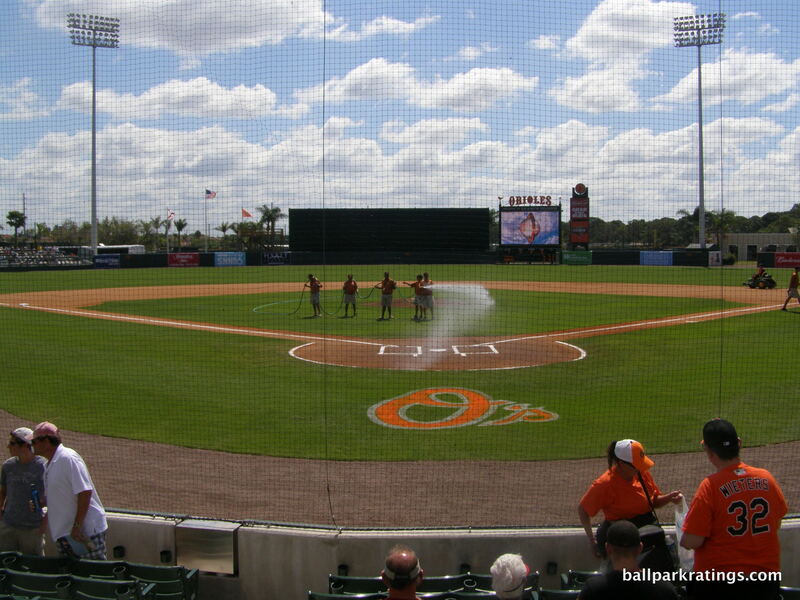 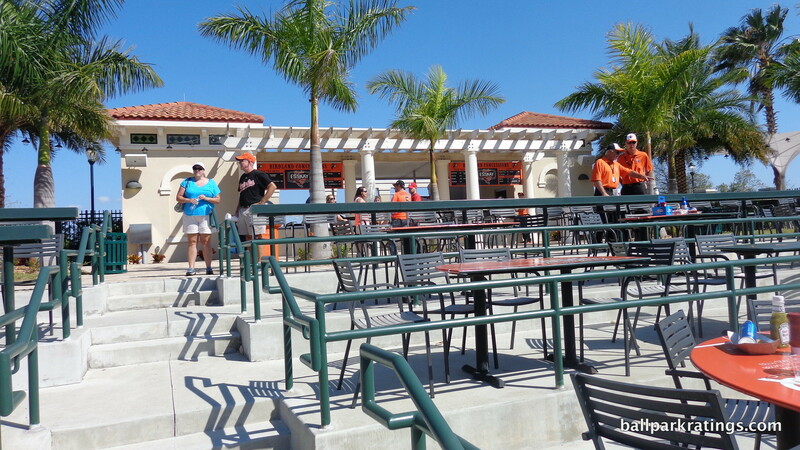 The Orioles’ ballpark has the best exterior architecture in the Grapefruit League, in my opinion. 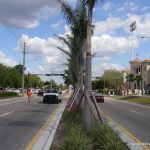 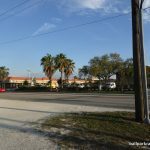 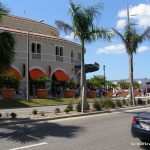 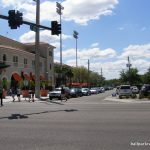 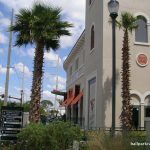 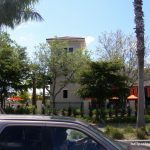 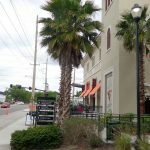 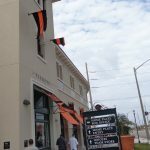 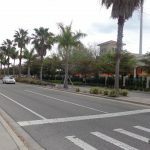 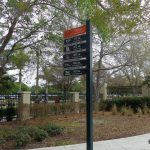 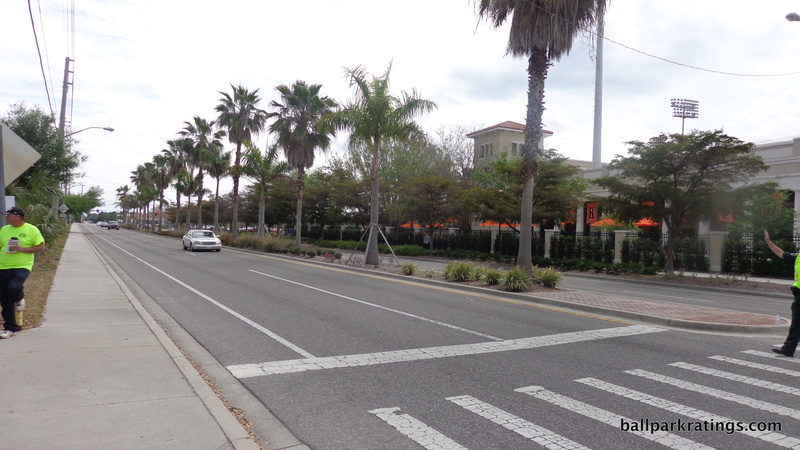 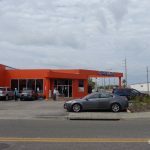 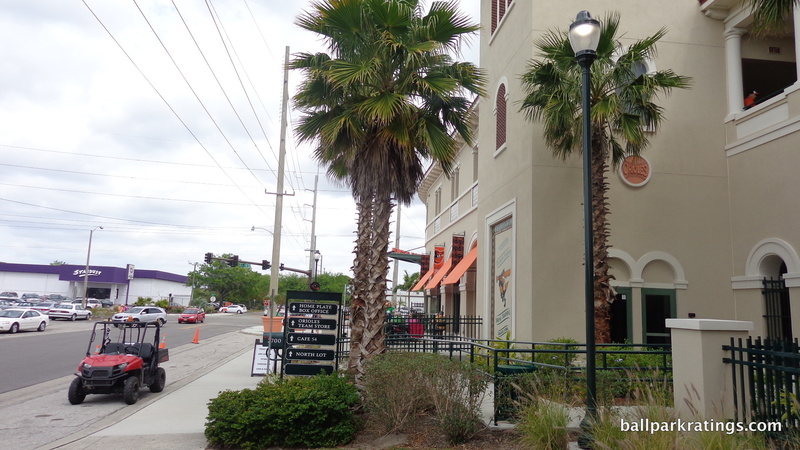 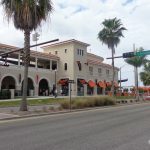 While non-descript residences and businesses are in the direct vicinity, Ed Smith Stadium gets a leg up by just being located in a world-class city. 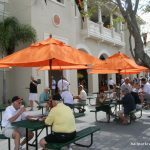 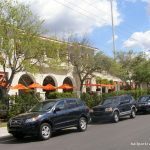 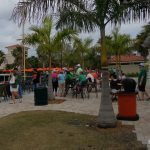 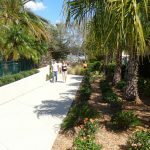 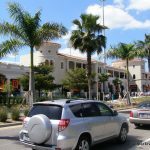 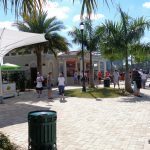 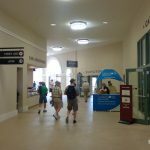 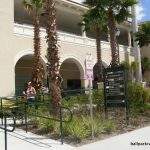 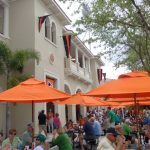 Downtown Sarasota on the waterfront, great beaches, museums, performing arts centers, and other destinations make Sarasota the most culturally vibrant spring training city in Florida. 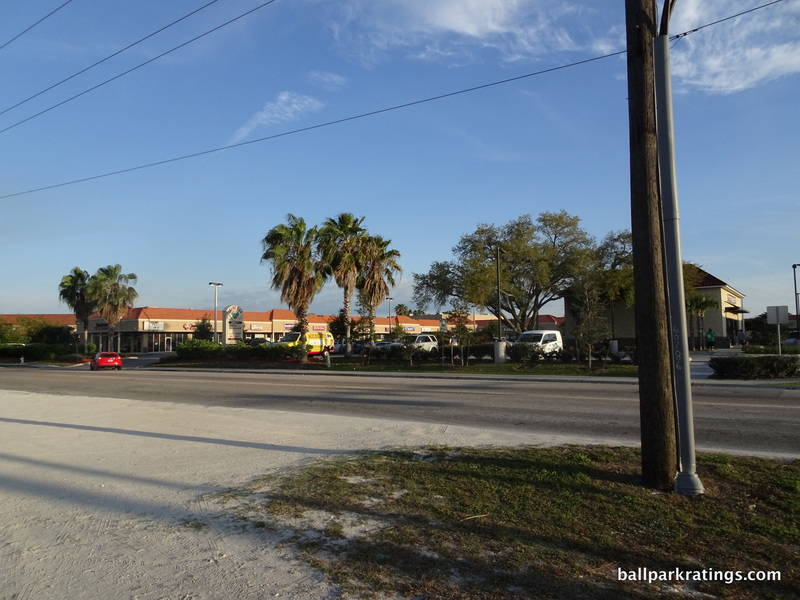 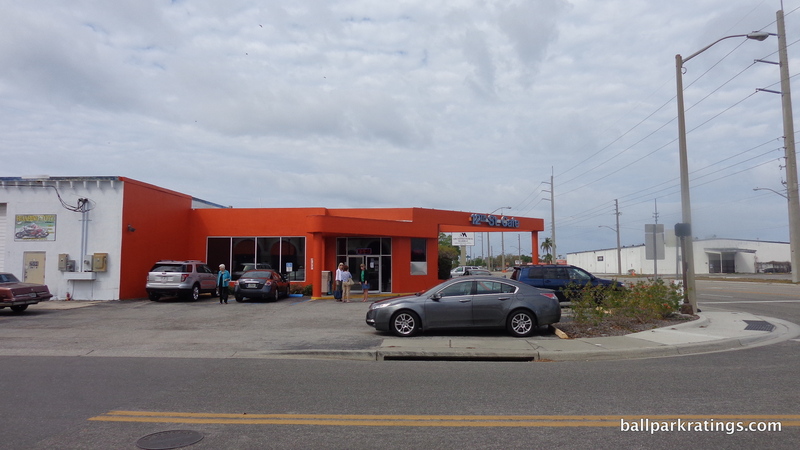 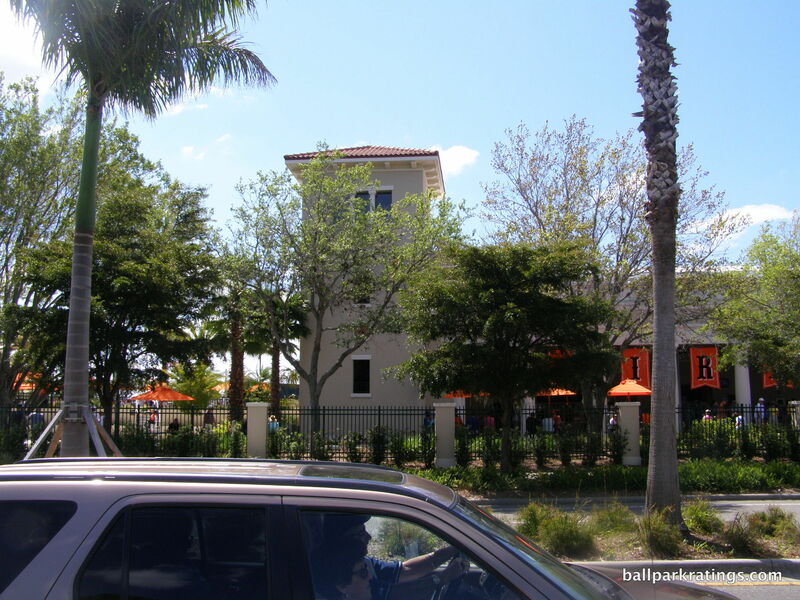 In the state, I score it only below that of Jupiter, which has a mixed-use development scene at its doorstep. 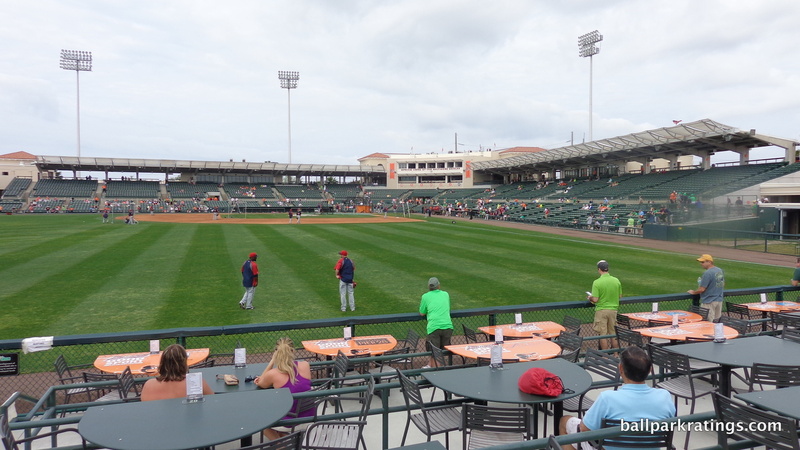 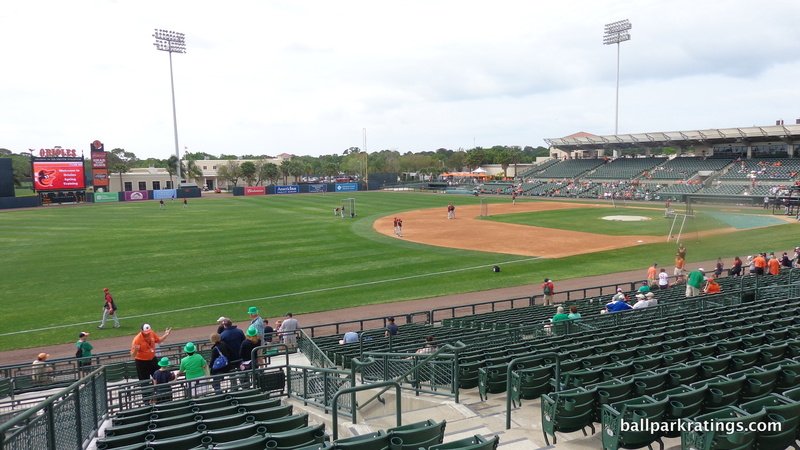 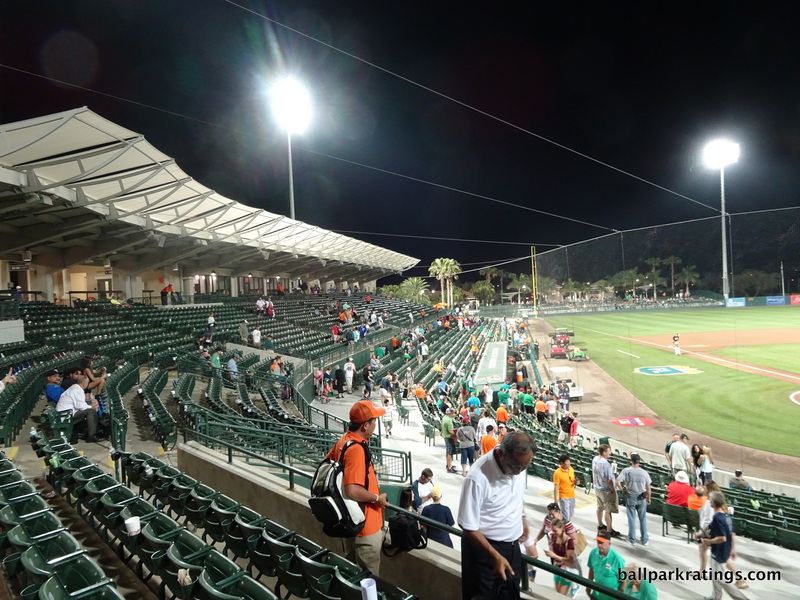 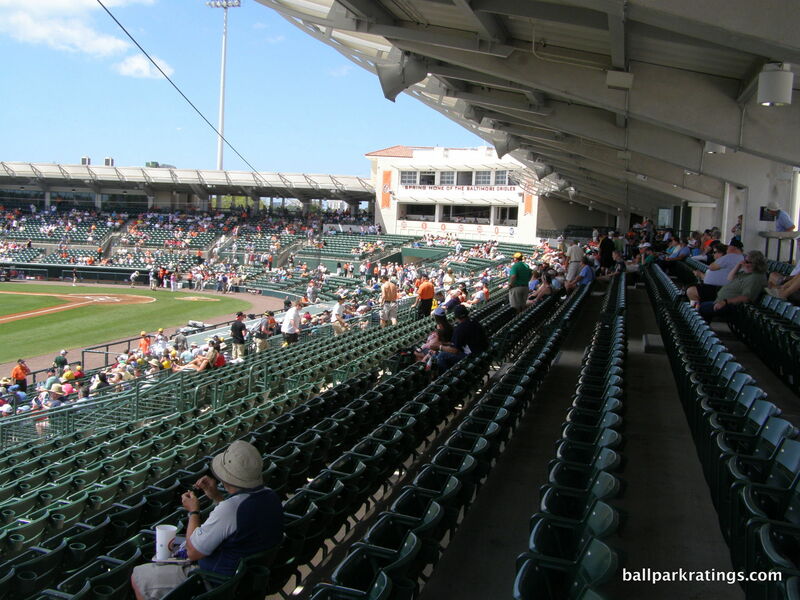 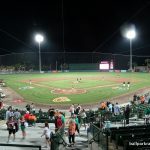 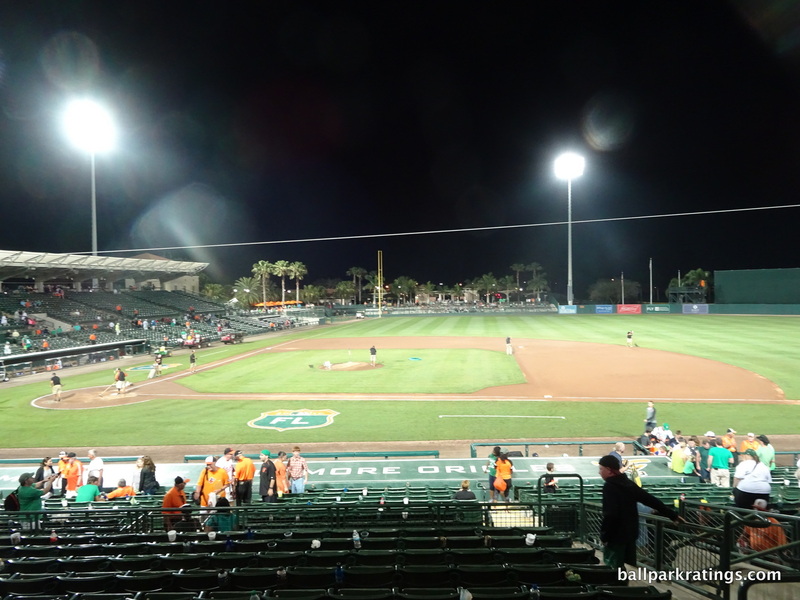 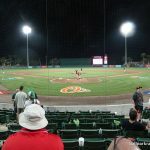 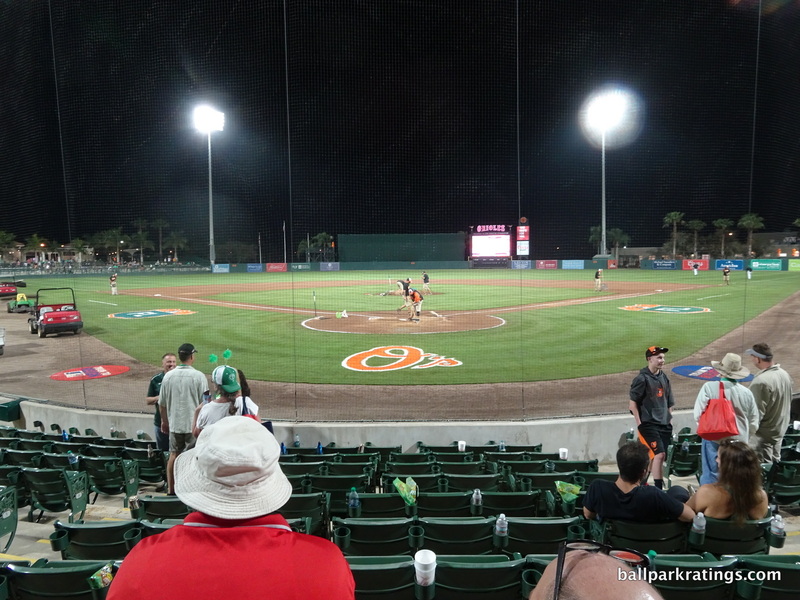 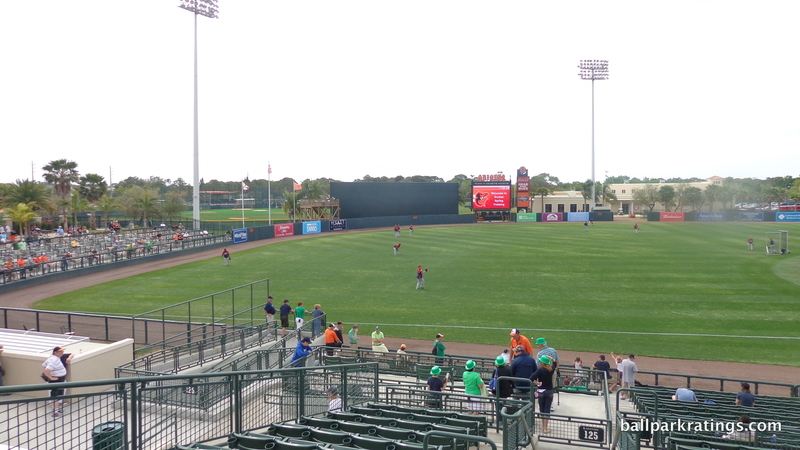 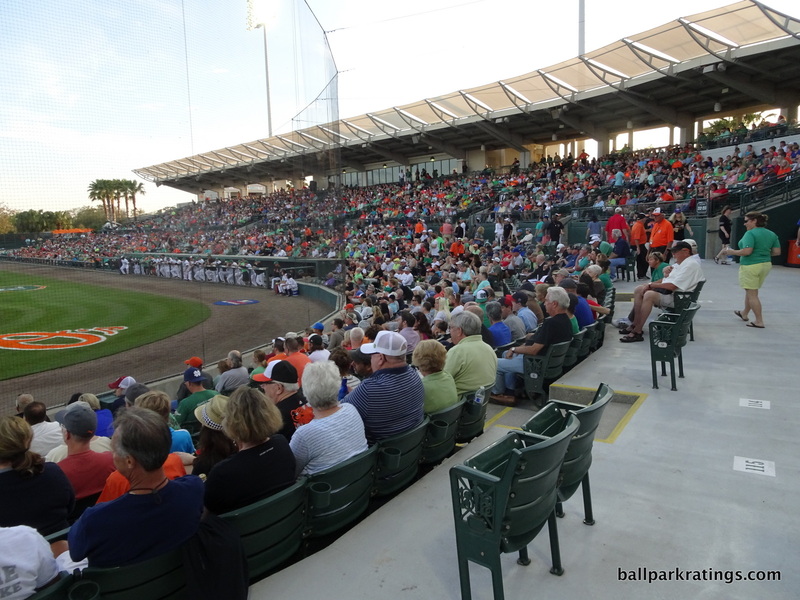 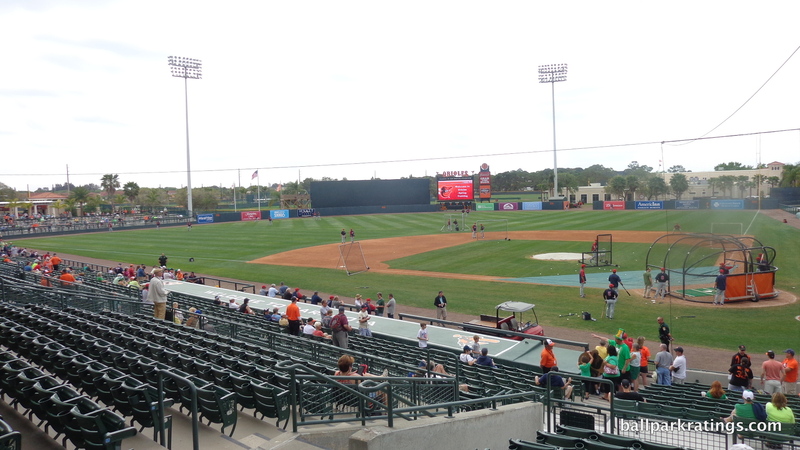 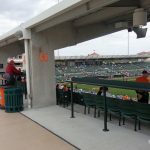 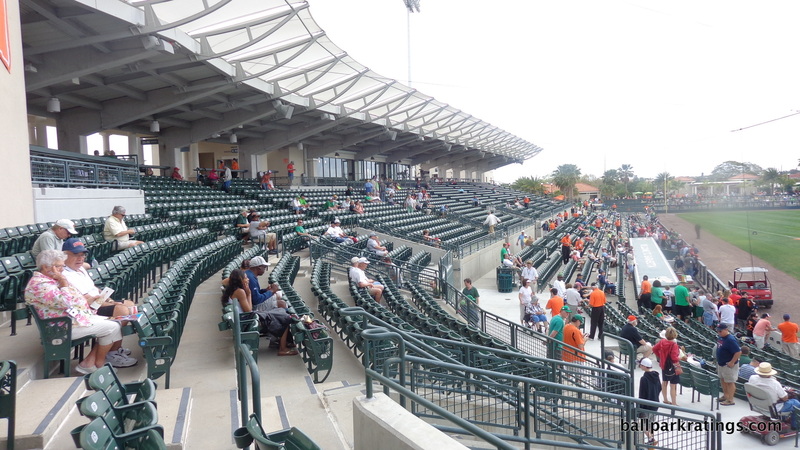 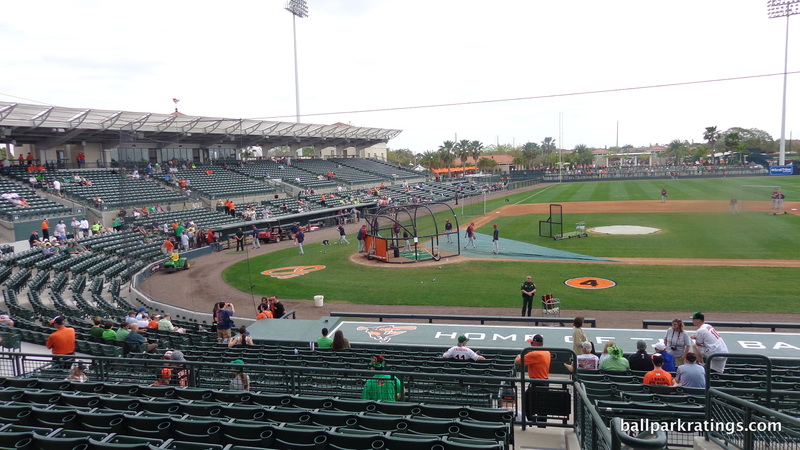 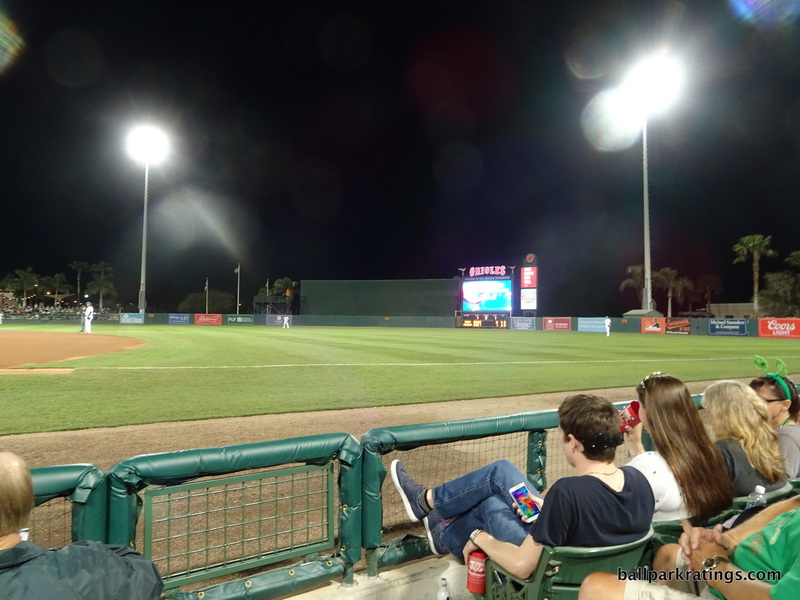 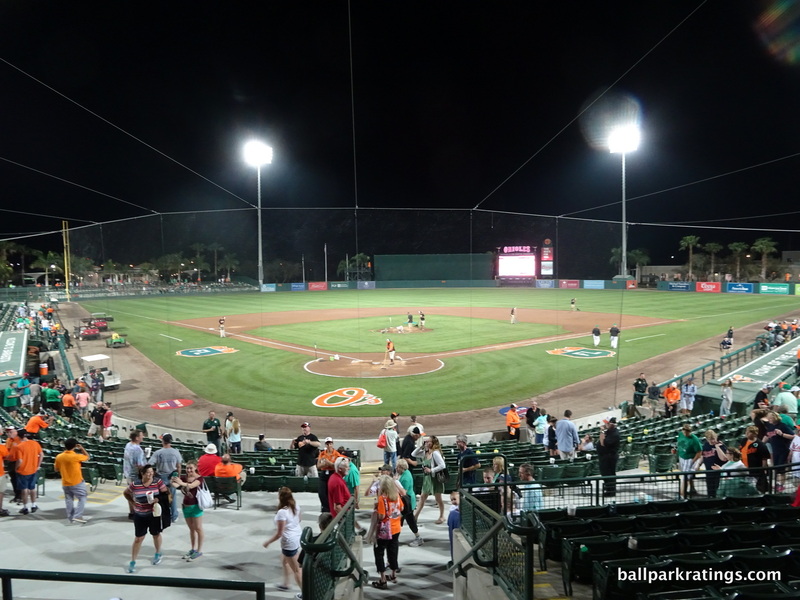 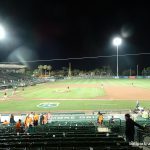 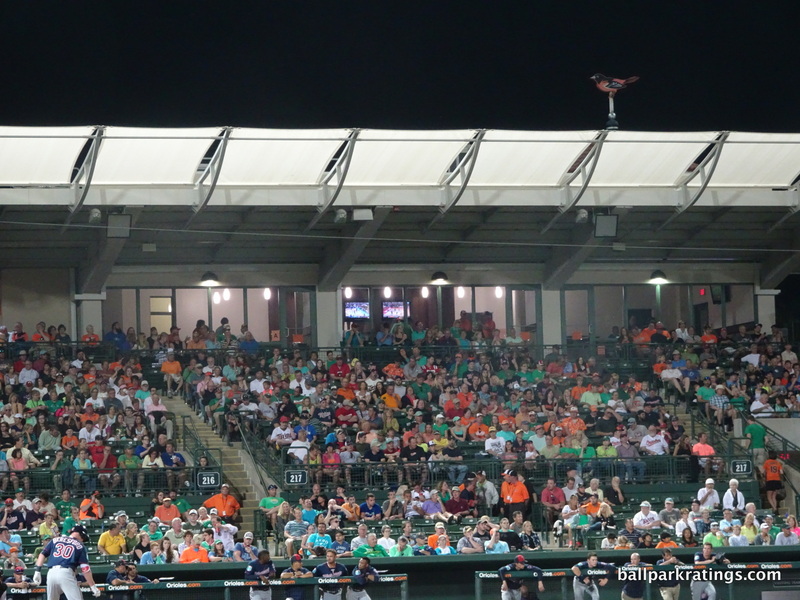 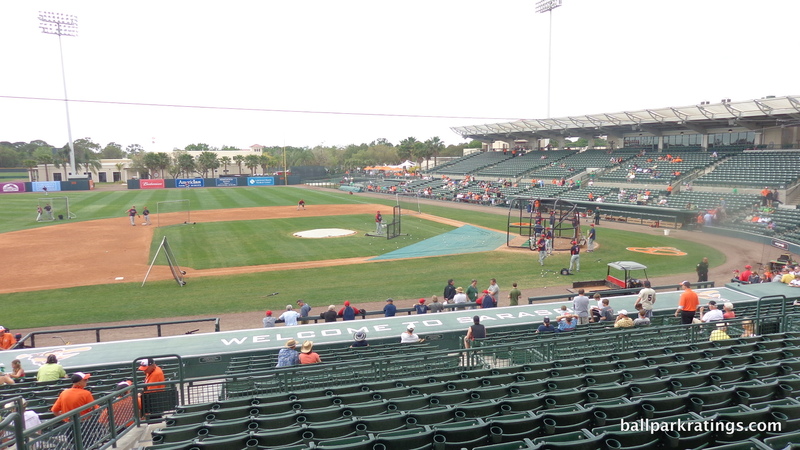 Ed Smith Stadium is in the conversation for best architecture and aesthetics in the Grapefruit League, right there with Disney (Braves), Joker Marchant (Tigers), and JetBlue (Sox). 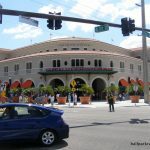 More architecturally principled and organically derived than Disney’s similar façade, I rate the park’s exterior architecture #1 in Florida spring training, behind only Camelback Ranch in Arizona overall. 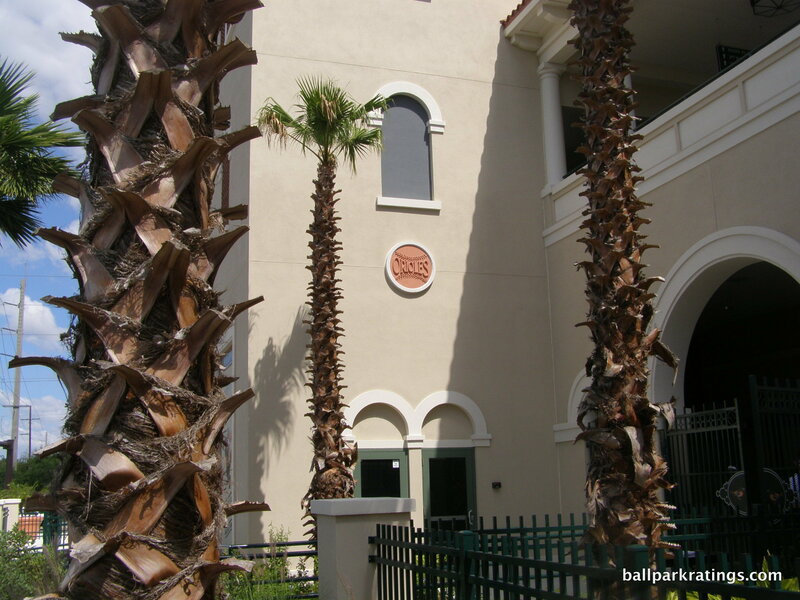 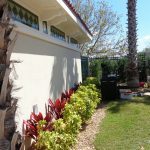 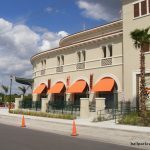 Representative of the sophisticated civic structures across Sarasota, I would call Ed Smith Stadium’s beige stucco facade revival Mediterranean architecture. 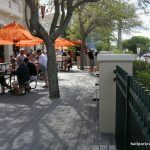 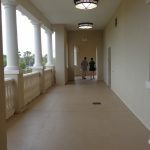 The architects dubbed the style “Florida Picturesque,” borrowing eclectic elements from the best Sarasota architecture common in the area in the 1920s. 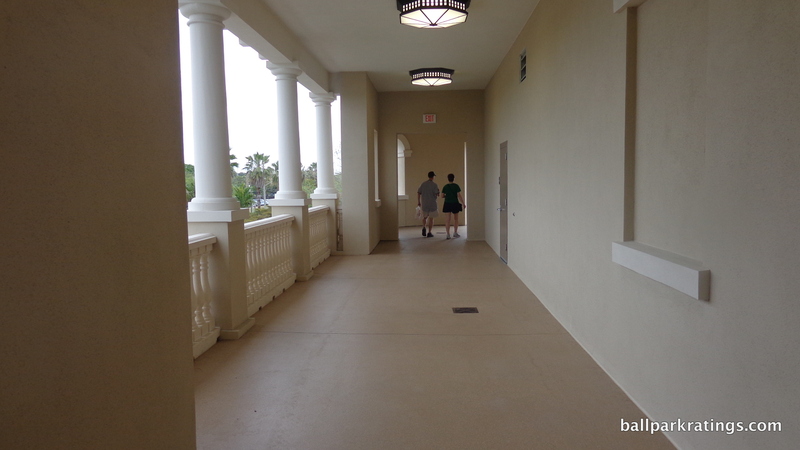 Influences included the County Courthouse, the Ringling Museum, and Ca’ d’Zan. 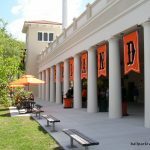 A classic rhythm of archways forms the base of the double stacked façade, with Doric columns and balconies on the second floor. 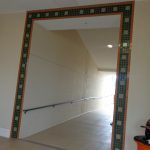 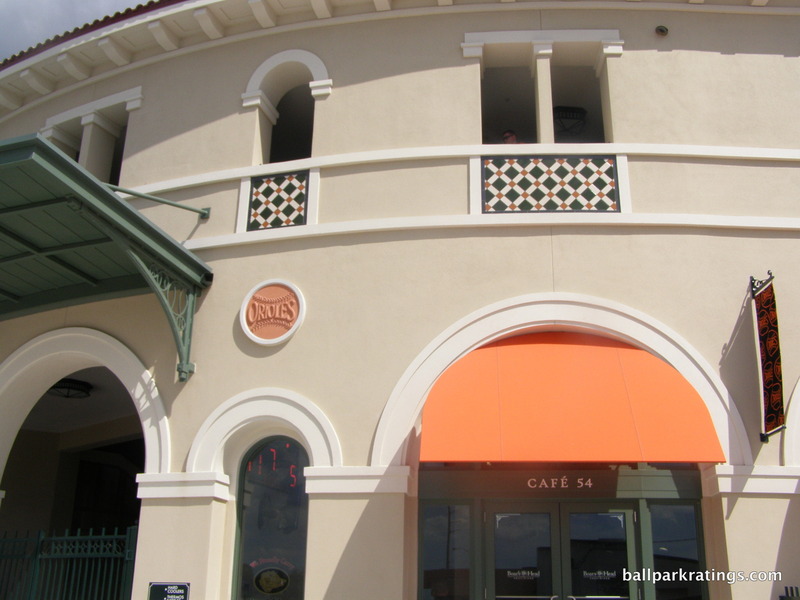 Supplementary elements include green and orange matrix tiles, orange awnings below the archways, and orange circular stucco Oriole emblems. 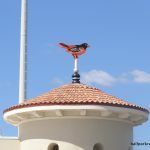 Also note the gorgeous tiled mural on the right side and the hand-painted ornithologically-correct Oriole weathervanes atop the circular towers. 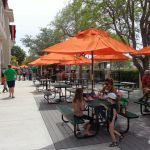 Some parties wanted a modern aesthetic from the Sarasota School of Architecture, but this is simply outstanding for a ballpark. 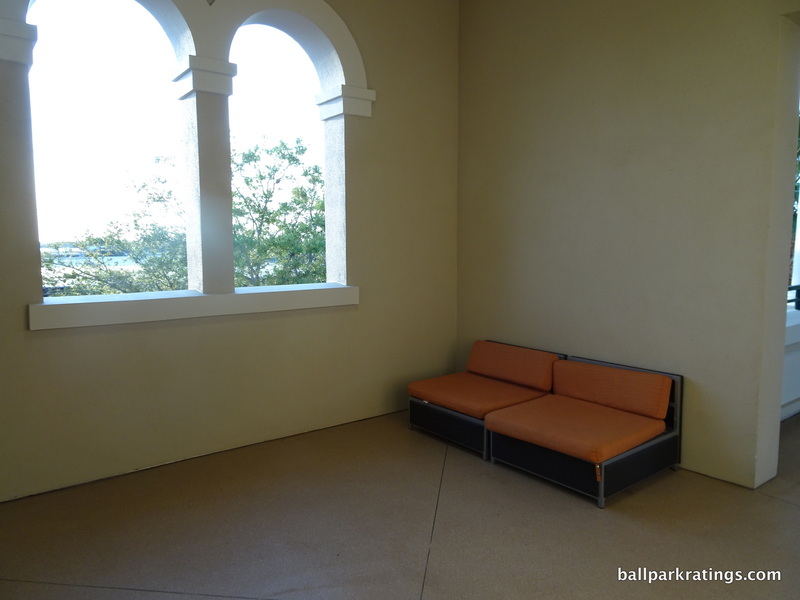 The interior aesthetics are not quite as outstanding, but they are certainly above average and very intimate. 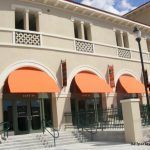 The old grandstand design itself is rather ordinary, but the soft, white awnings have a nautical sensibility like a sail on a boat. 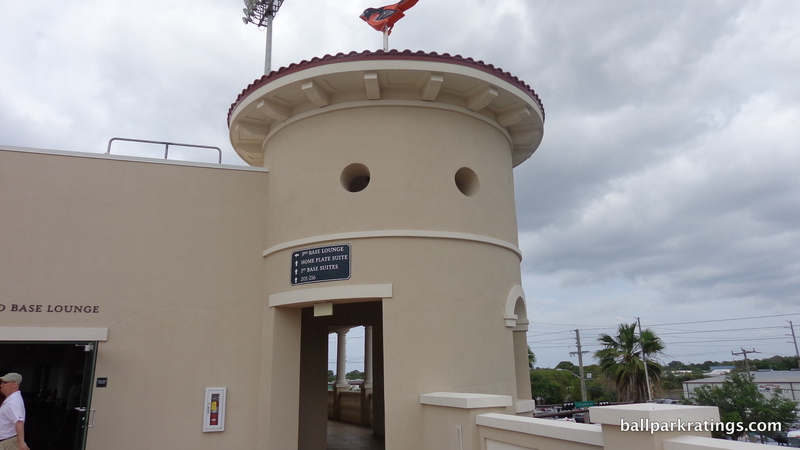 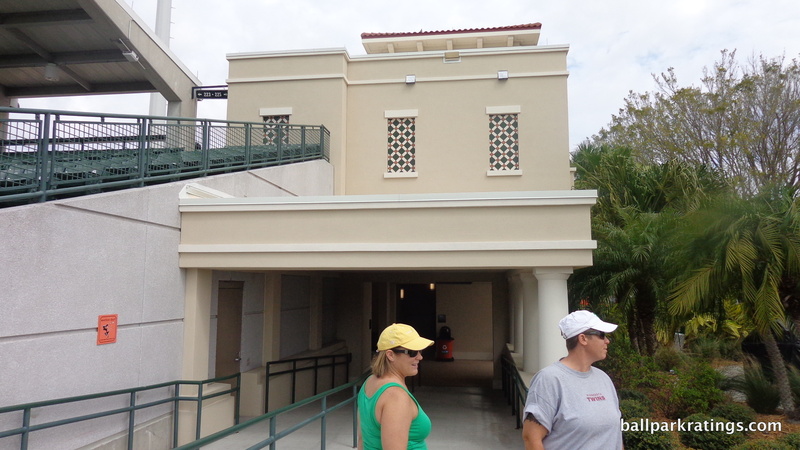 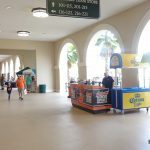 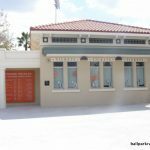 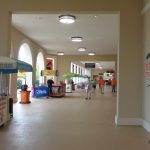 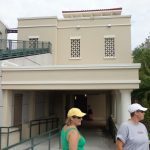 The Mediterranean aesthetic is continued inside through the orange terra-cotta roofing and Doric columns in left field. 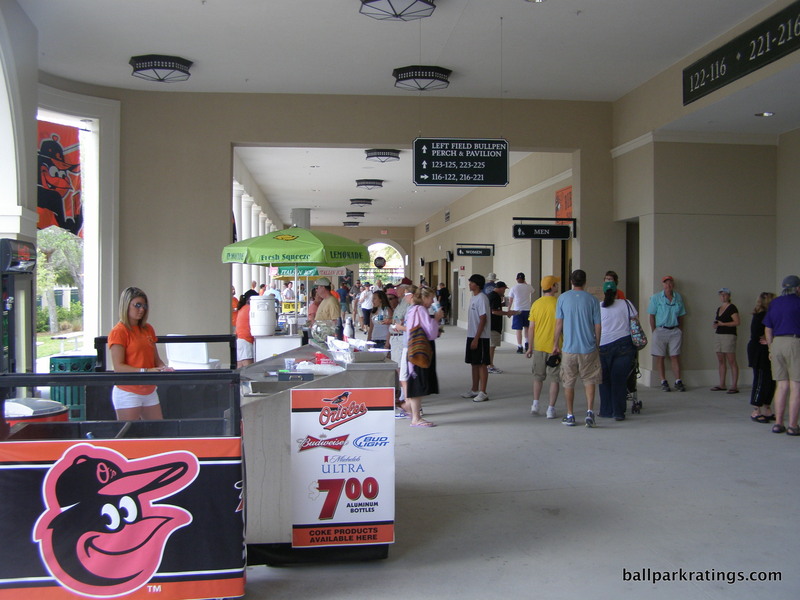 Building a concourse beyond right field would help the look by eliminating empty space. 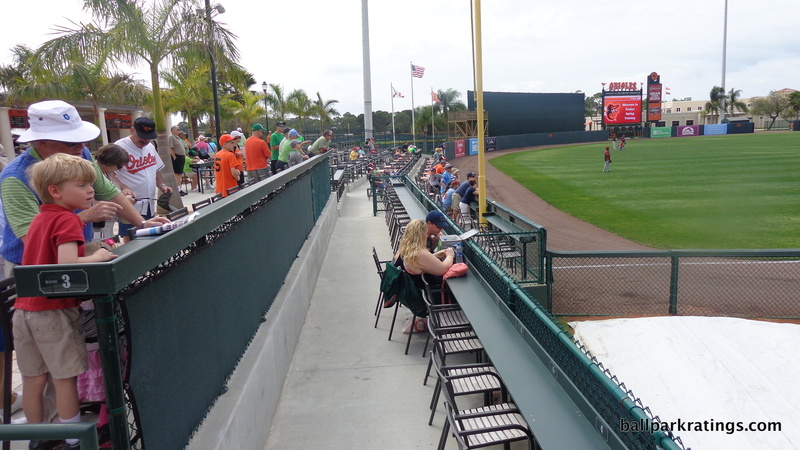 There is no berm here, either. 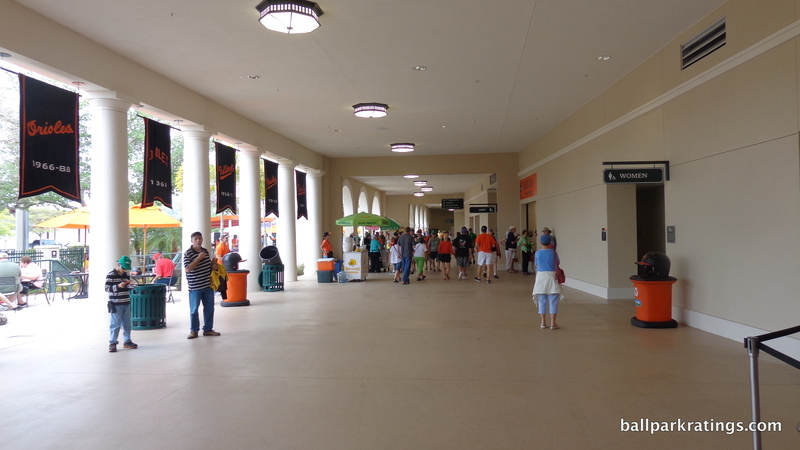 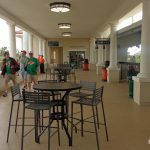 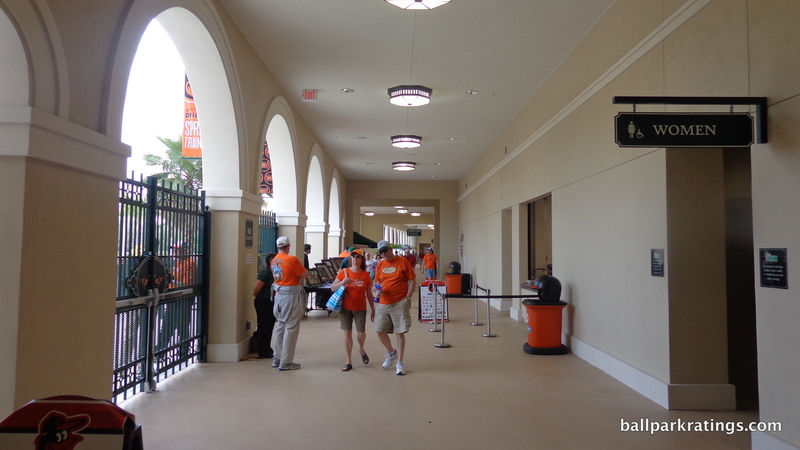 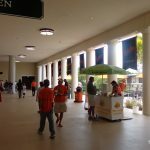 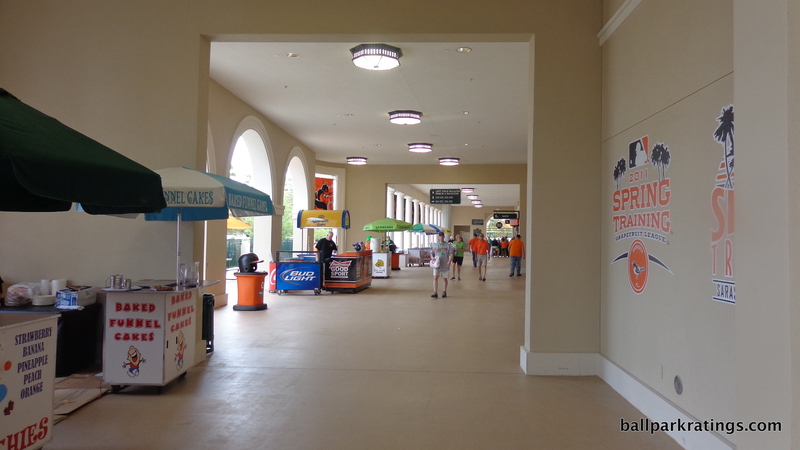 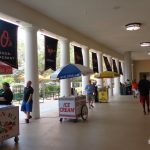 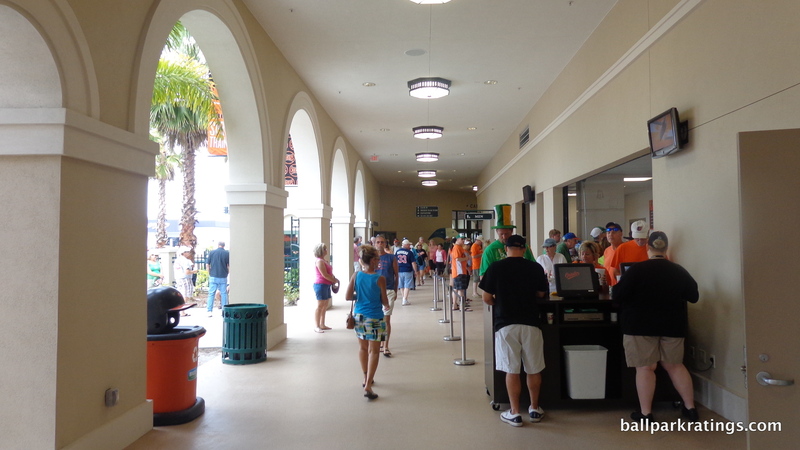 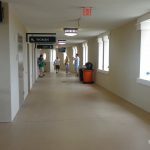 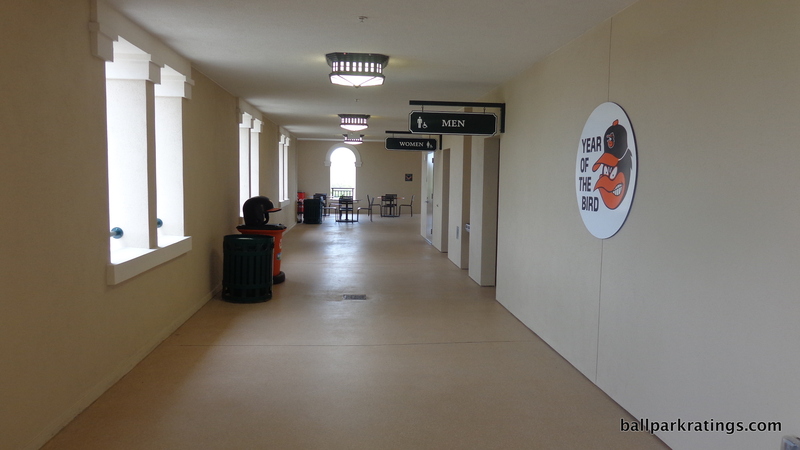 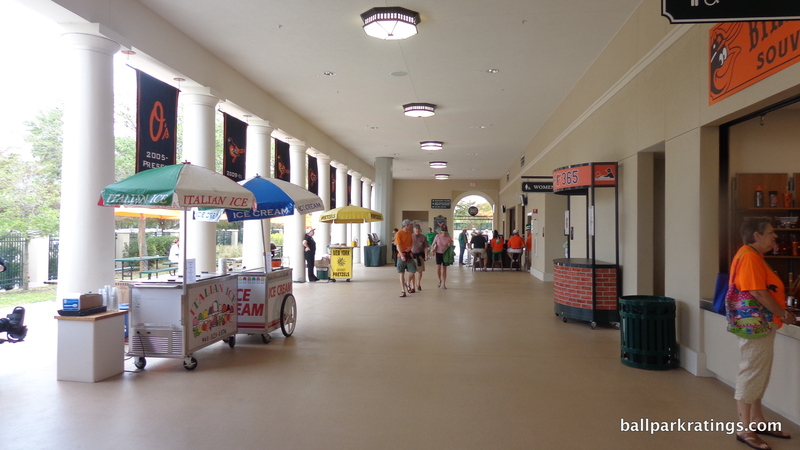 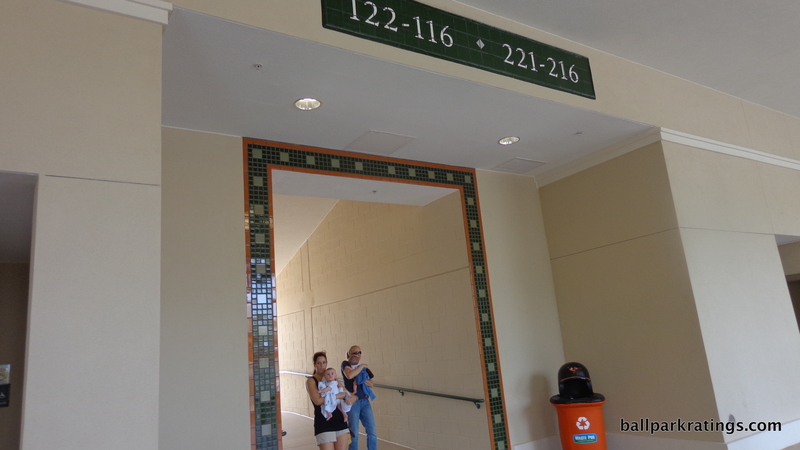 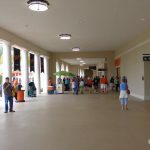 Finally, Ed Smith Stadium’s concourse aesthetics are arguably the best in baseball. 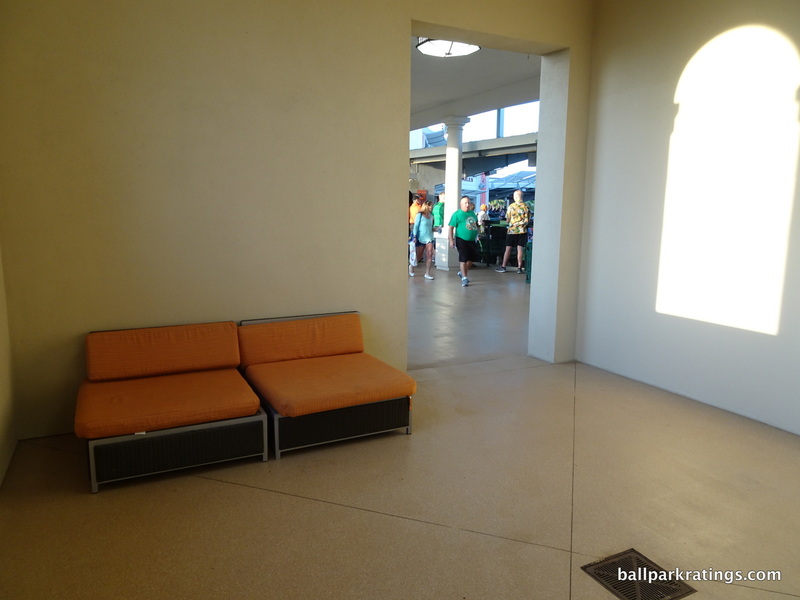 They look like an upscale room hallway at a seaside resort. 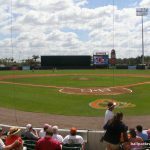 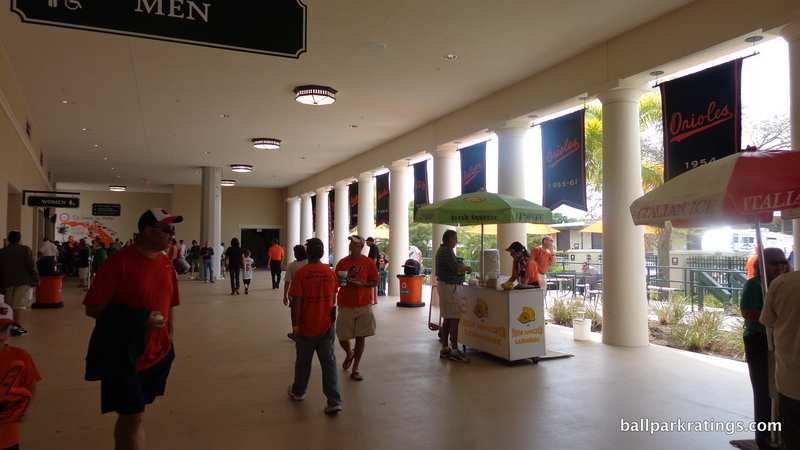 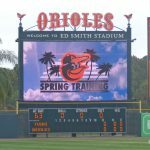 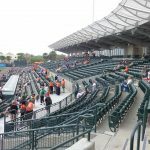 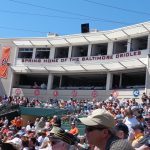 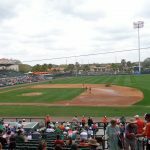 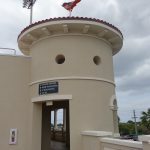 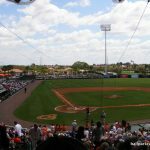 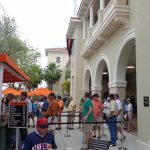 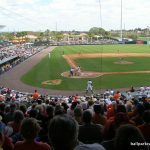 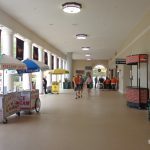 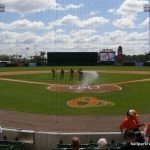 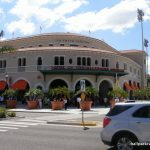 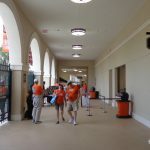 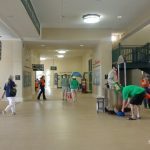 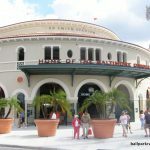 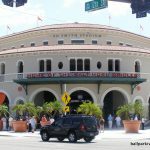 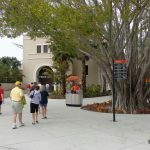 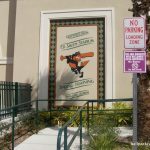 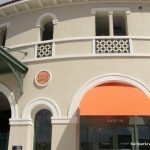 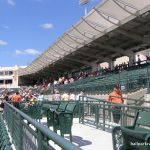 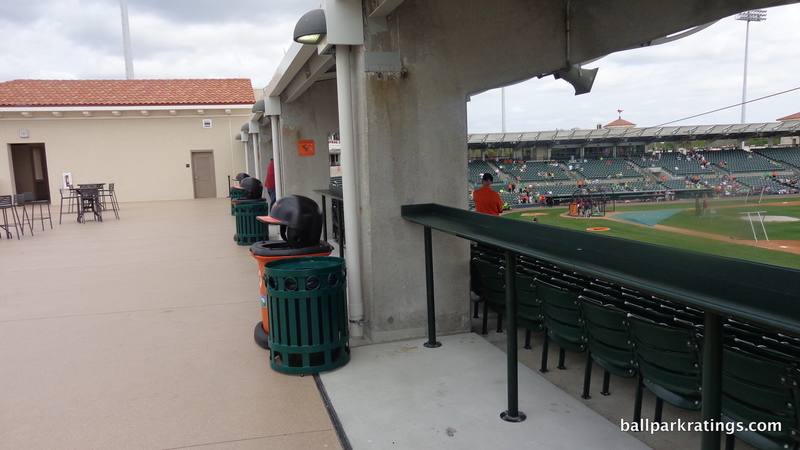 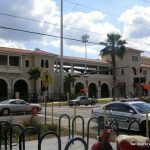 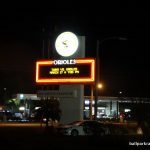 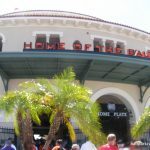 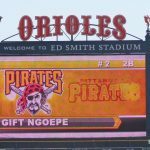 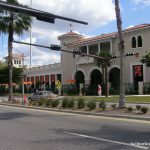 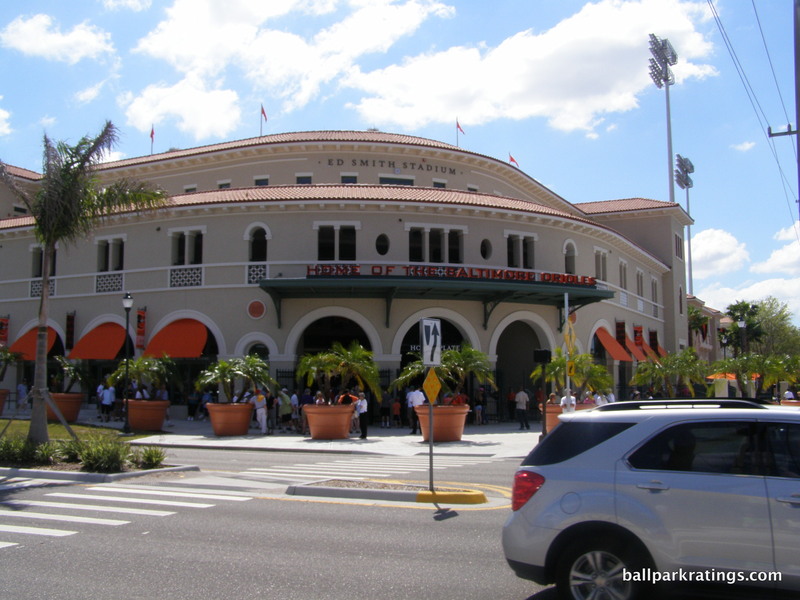 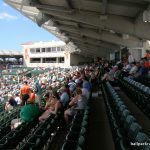 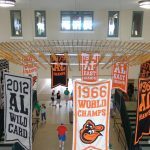 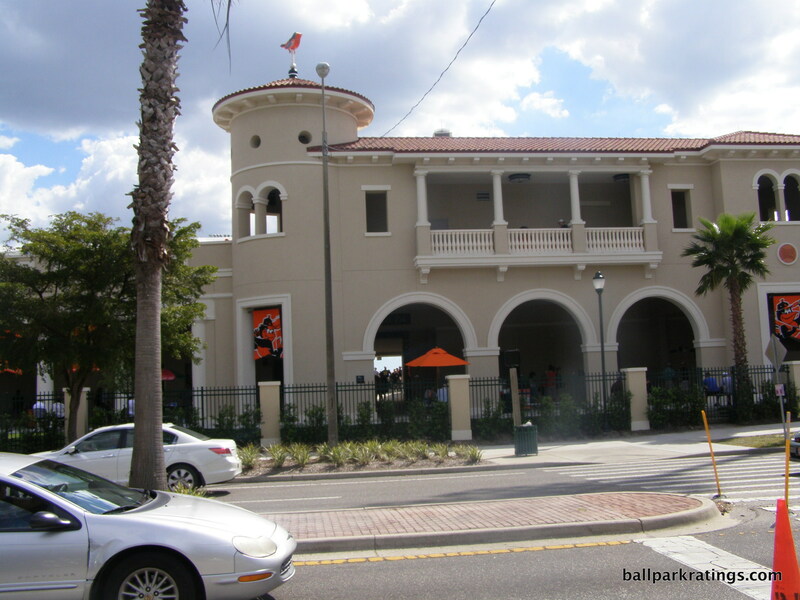 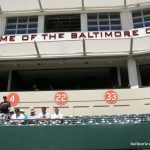 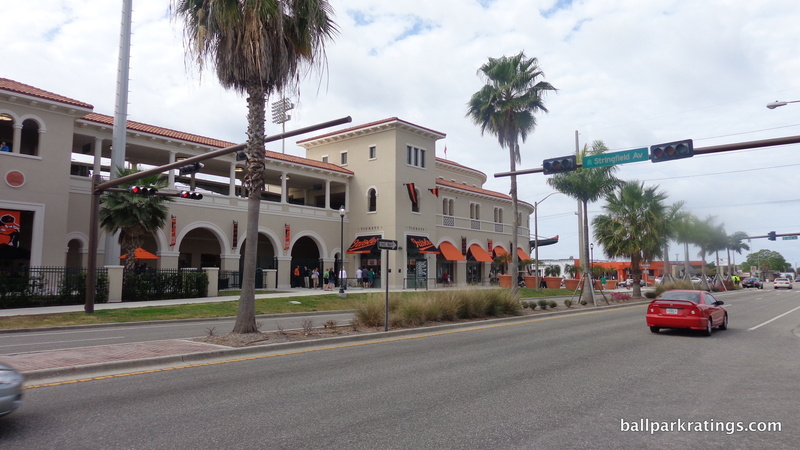 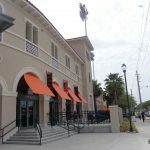 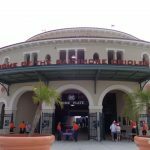 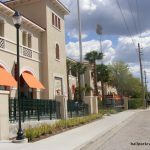 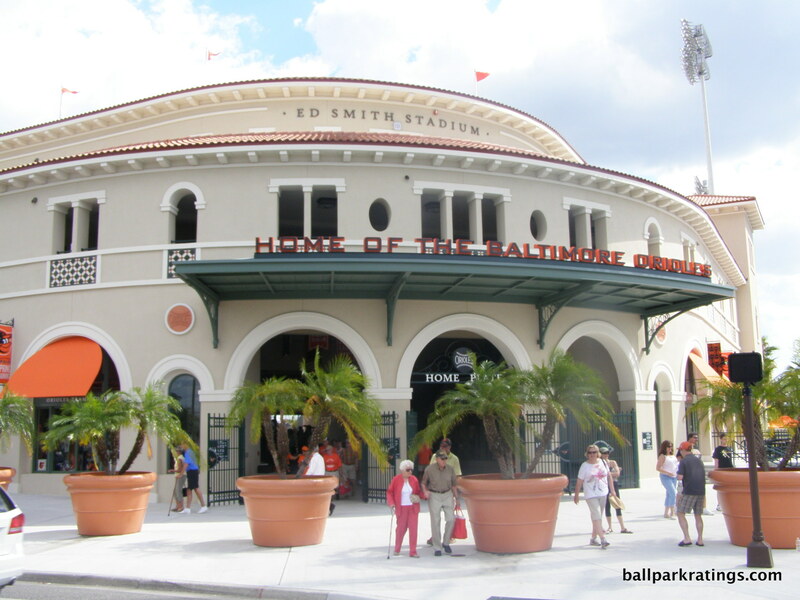 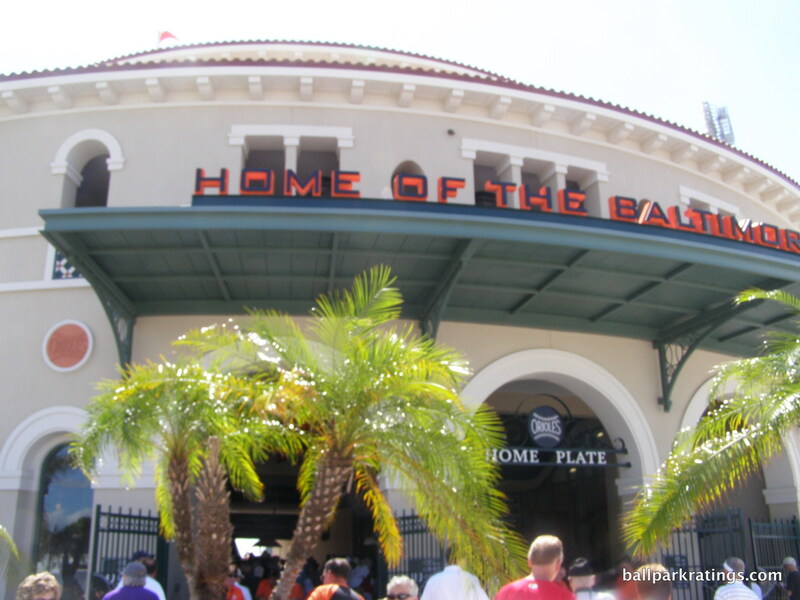 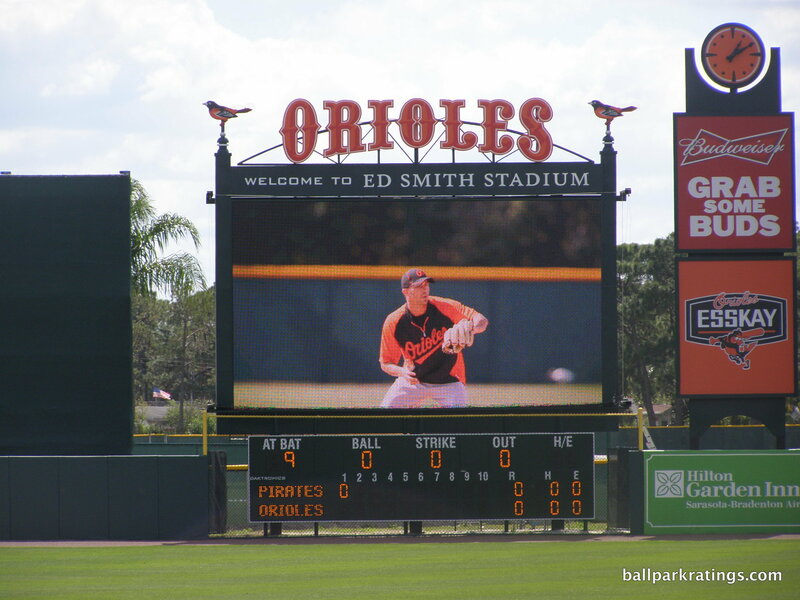 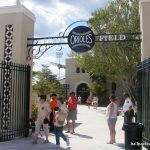 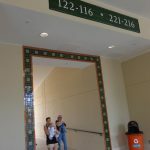 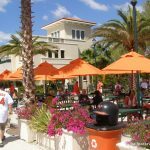 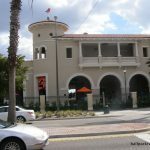 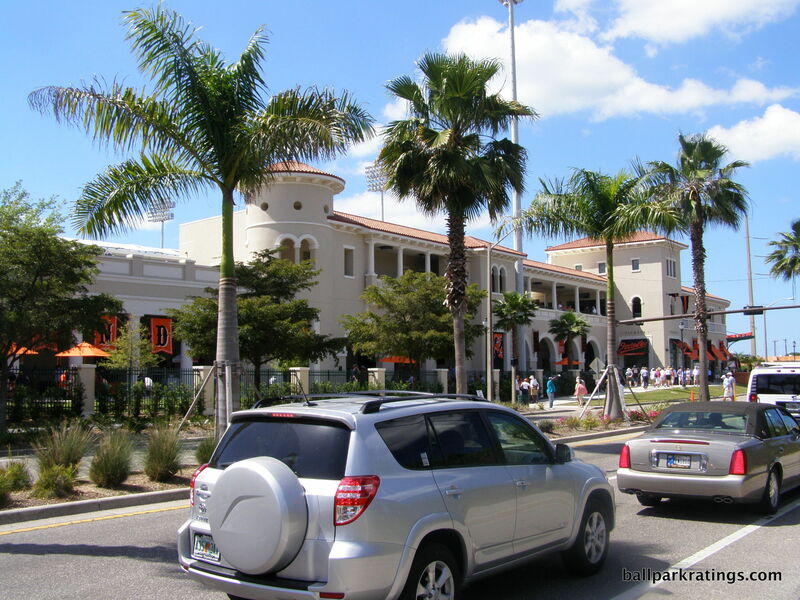 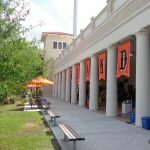 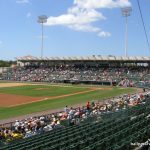 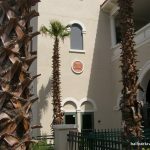 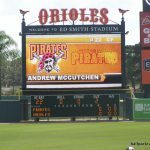 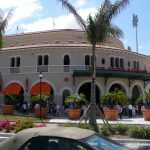 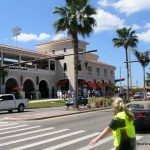 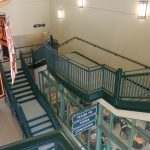 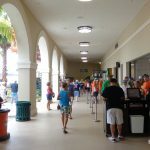 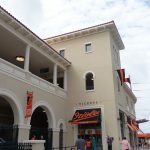 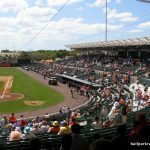 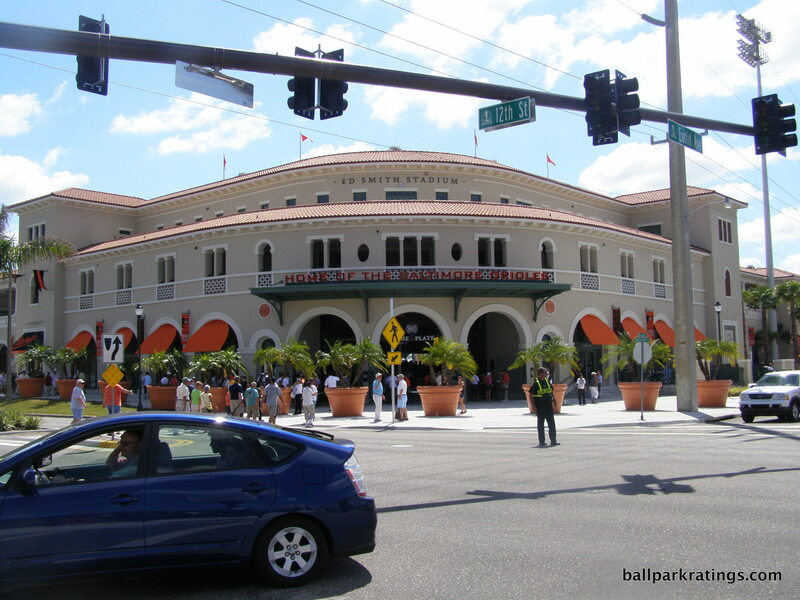 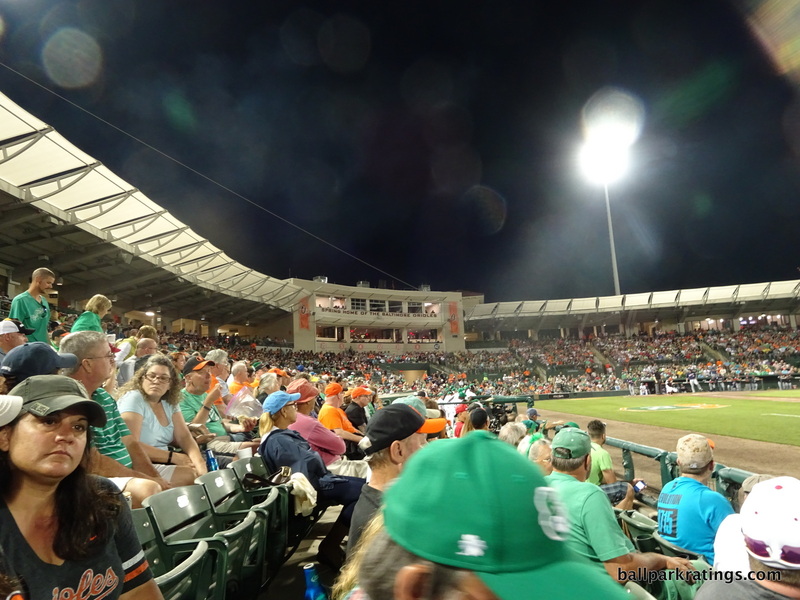 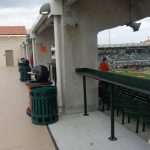 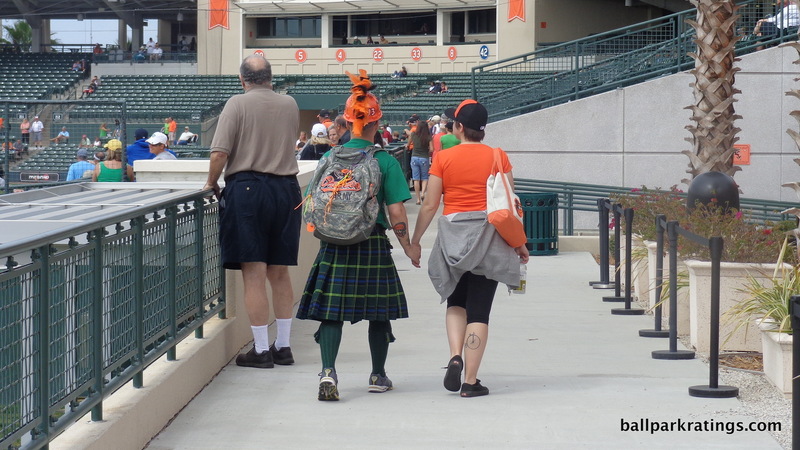 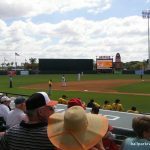 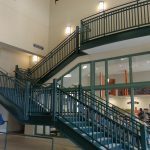 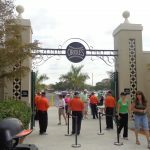 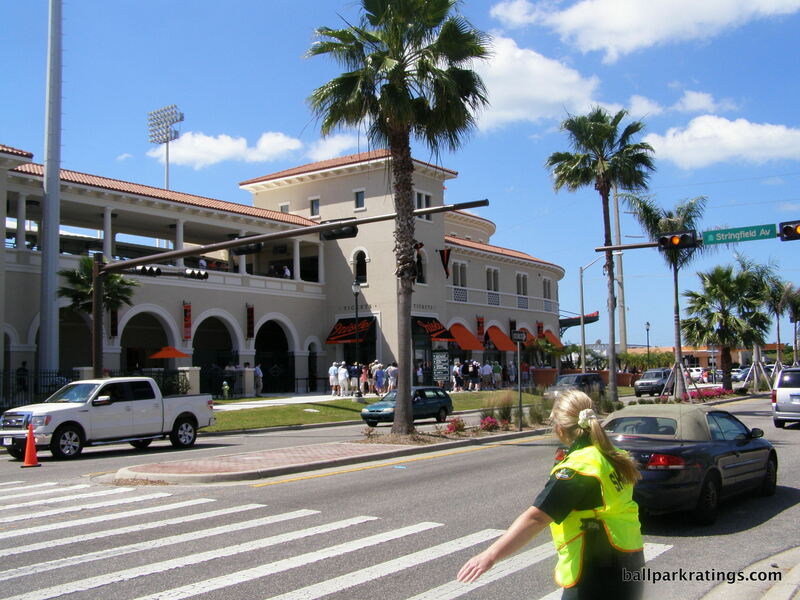 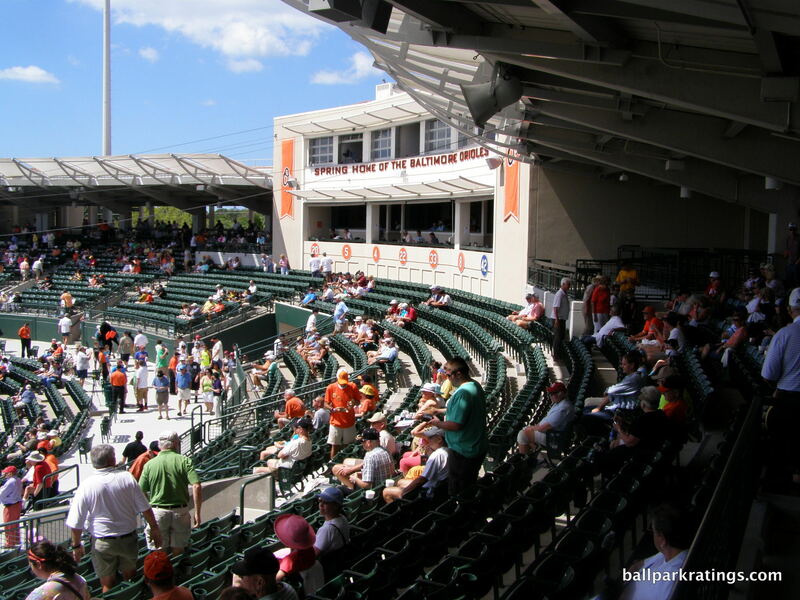 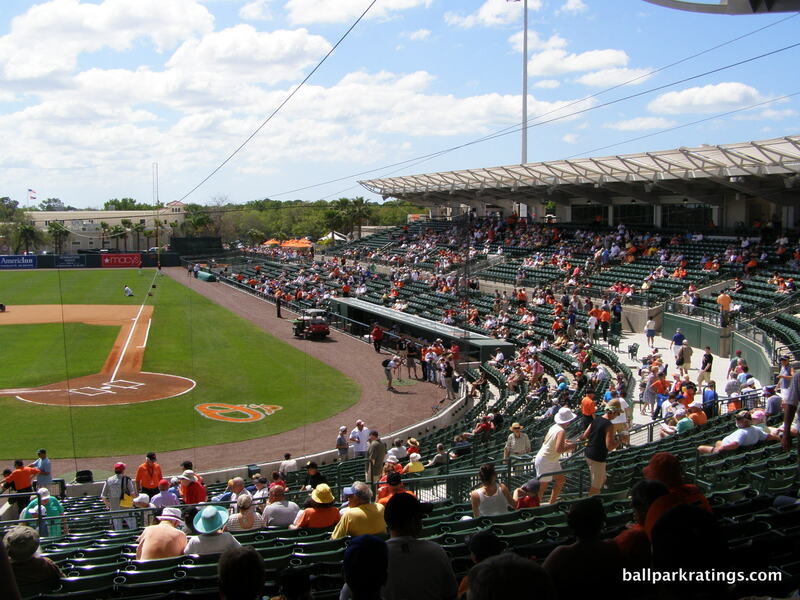 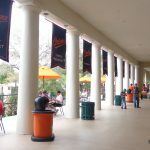 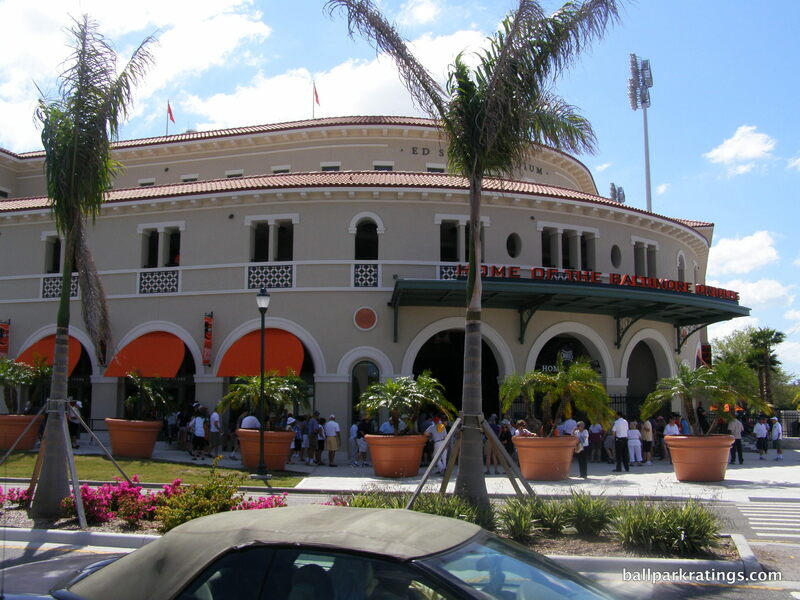 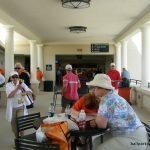 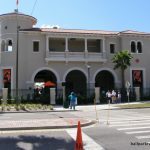 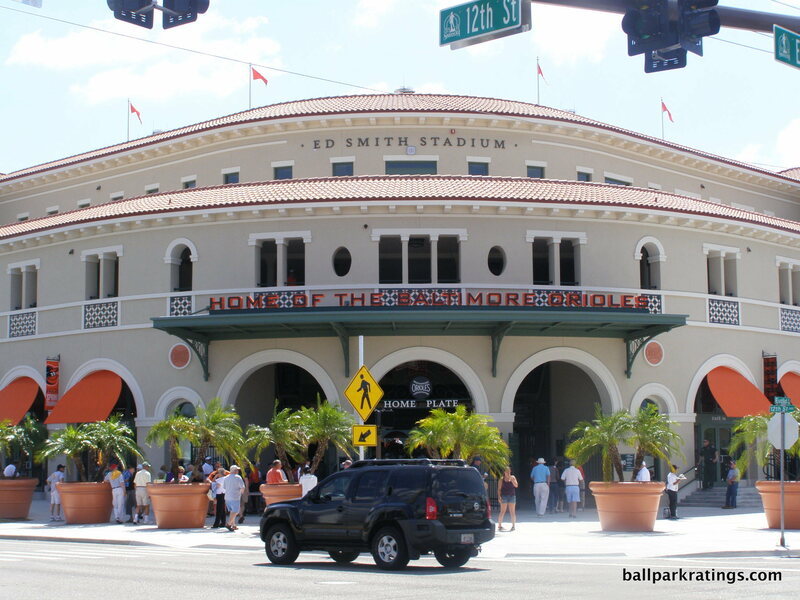 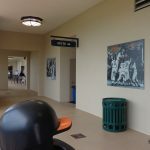 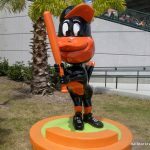 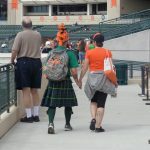 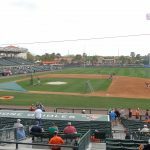 While Ed Smith Stadium is a triumph of Sarasota architecture, the sheer amount of historical references and other decorative elements reflecting the Baltimore Orioles further distinguishes this palace. 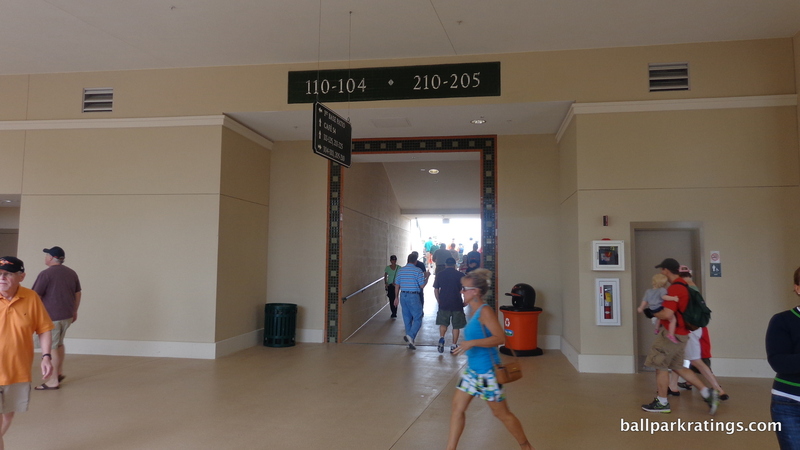 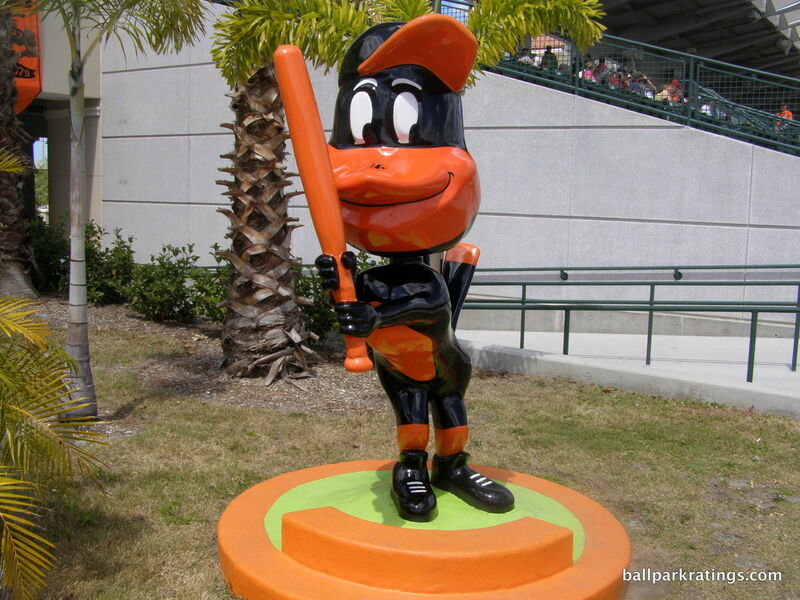 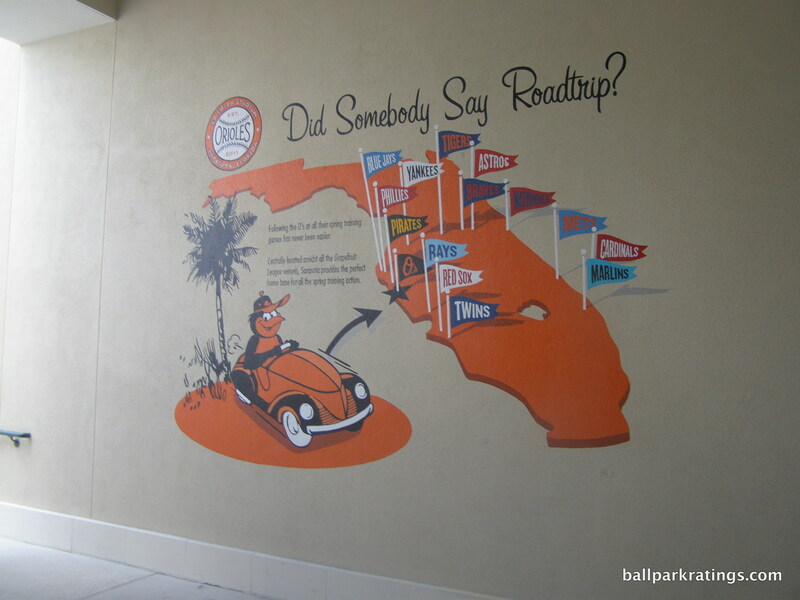 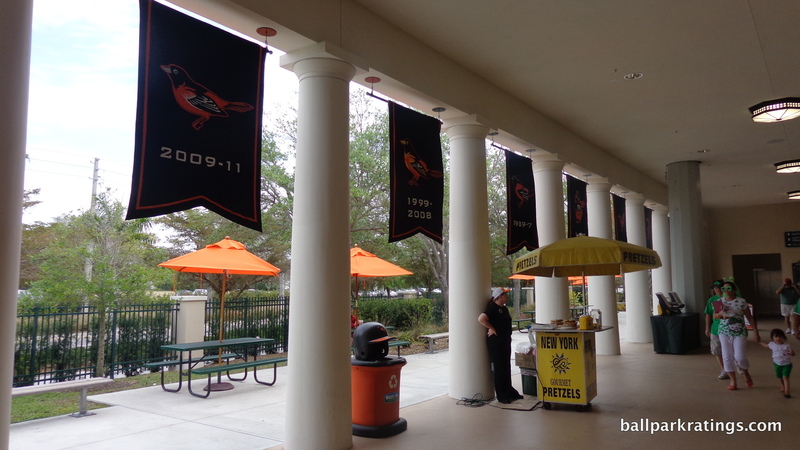 Aesthetically pleasing references to the Baltimore Orioles are located within Ed Smith Stadium. 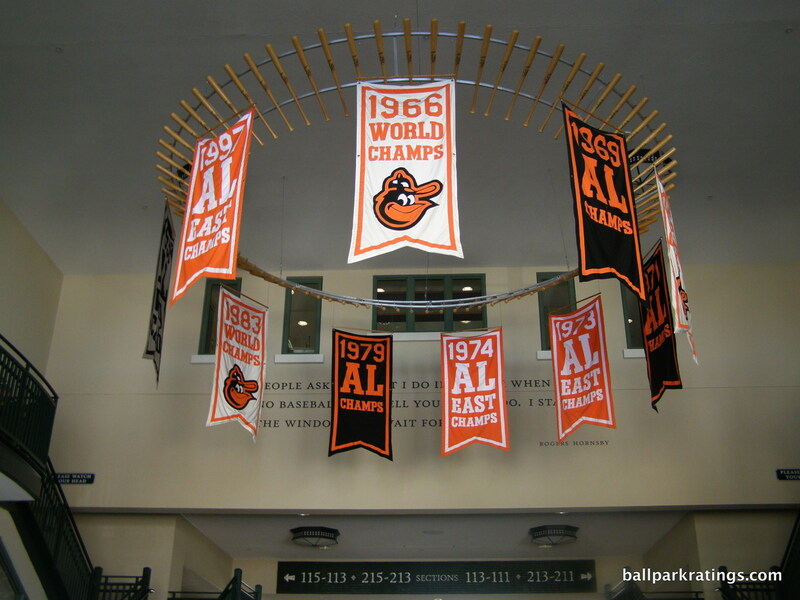 Bat chandelier of championship banners shown here. 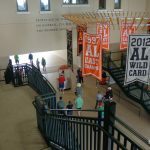 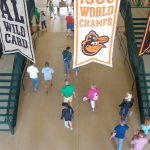 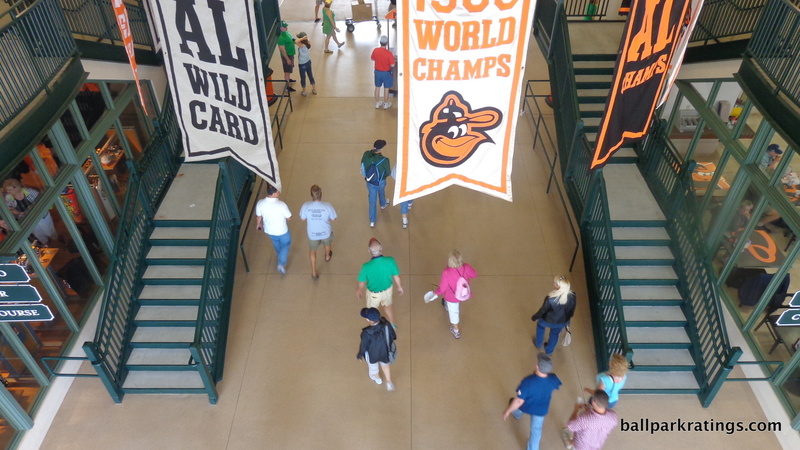 Inside the home plate entry, fans will feast their eyes upon one of Ed Smith Stadium’s signature features: a bat chandelier with Orioles championship banners. 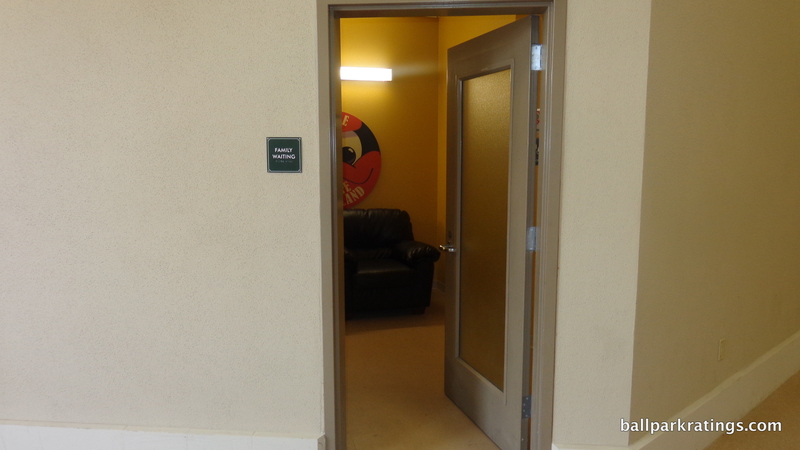 The famous Rogers Hornsby quote is written on the wall in the background. 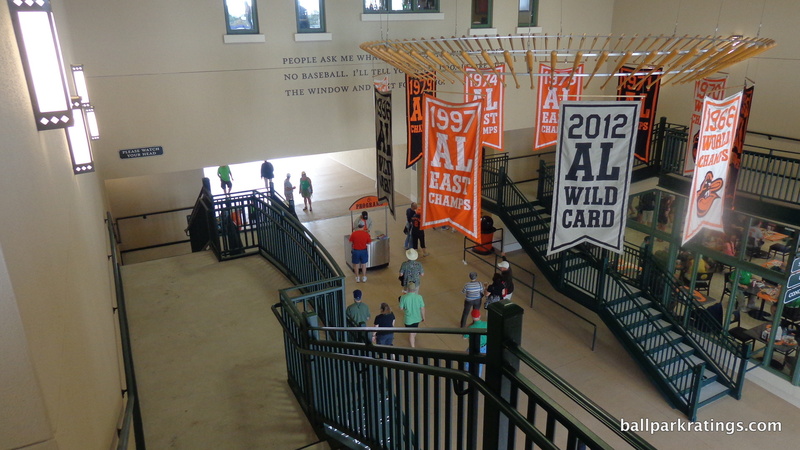 Upon arrival, fans get an immediate sense that this place has an aesthetic vision. 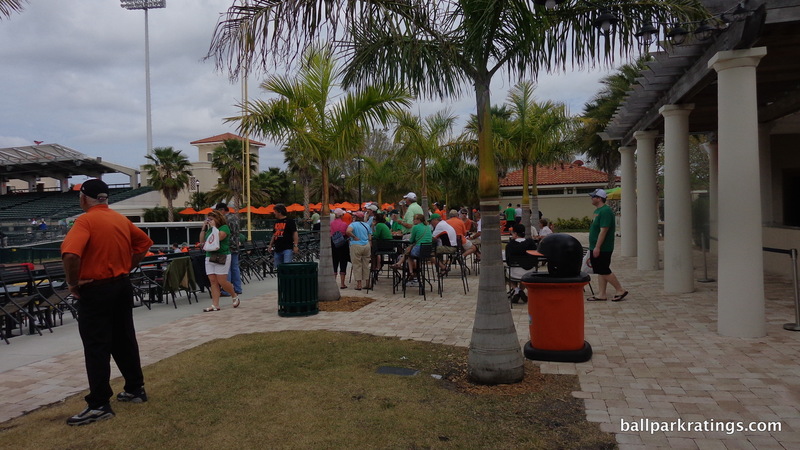 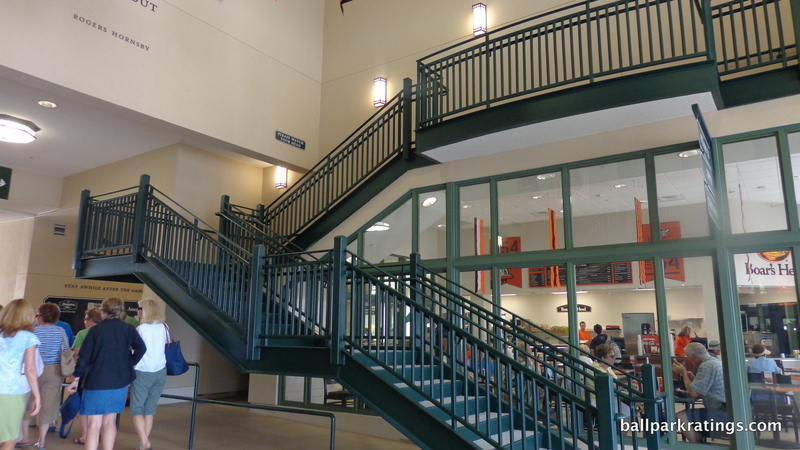 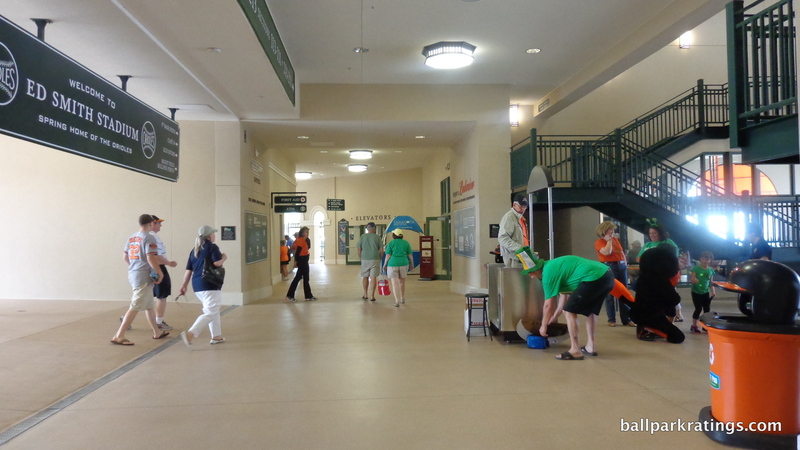 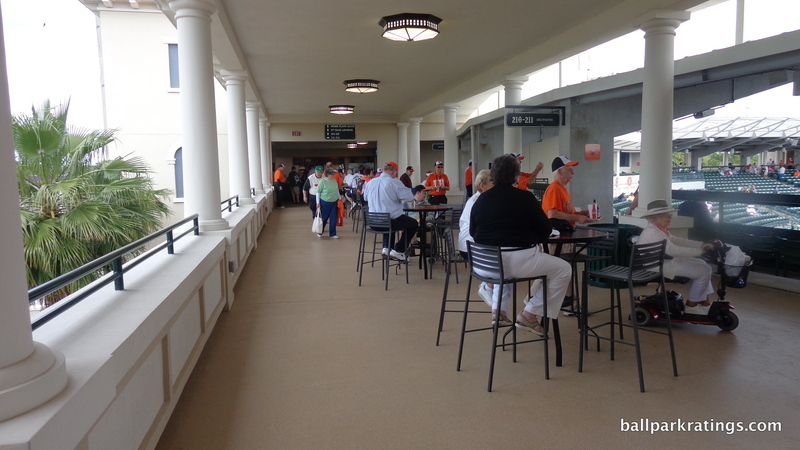 Almost everything on the concourses is a soothing shade of cream, green, or orange. 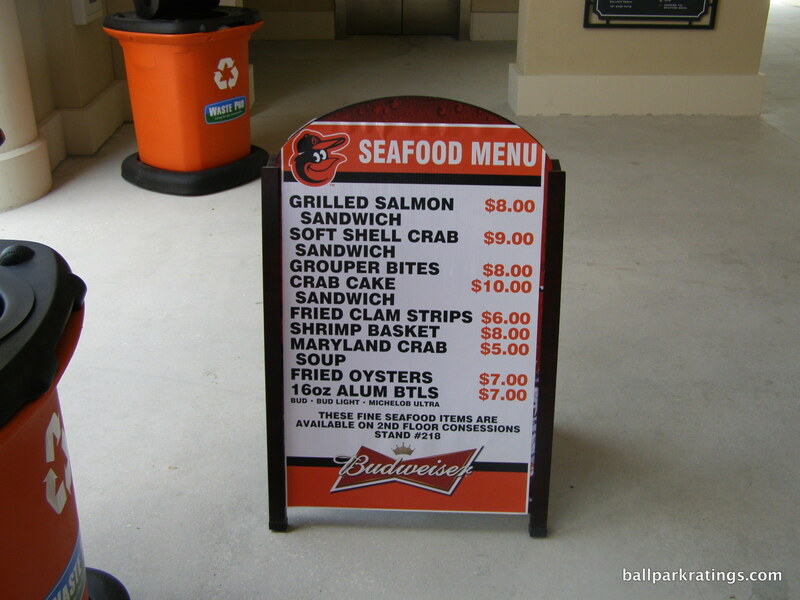 Signs are painted, not printed. 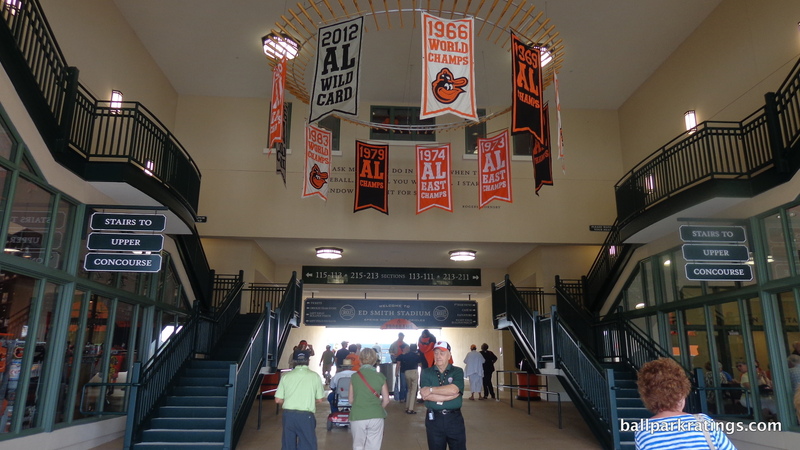 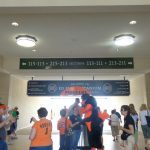 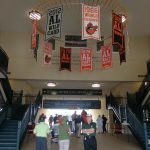 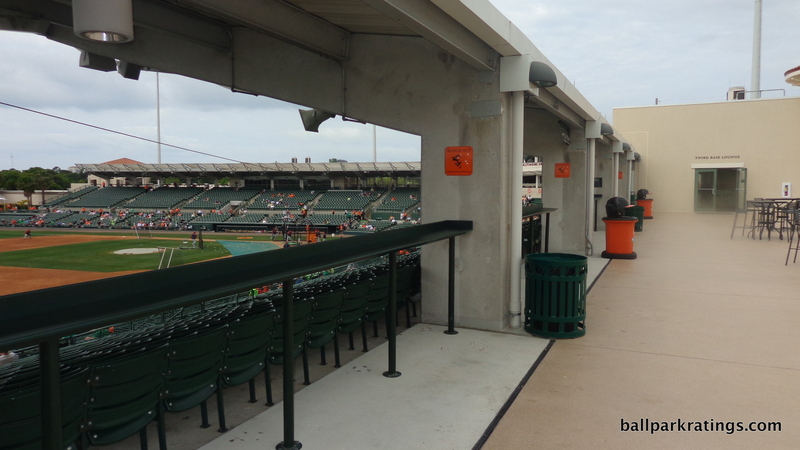 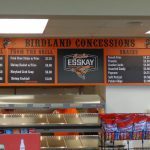 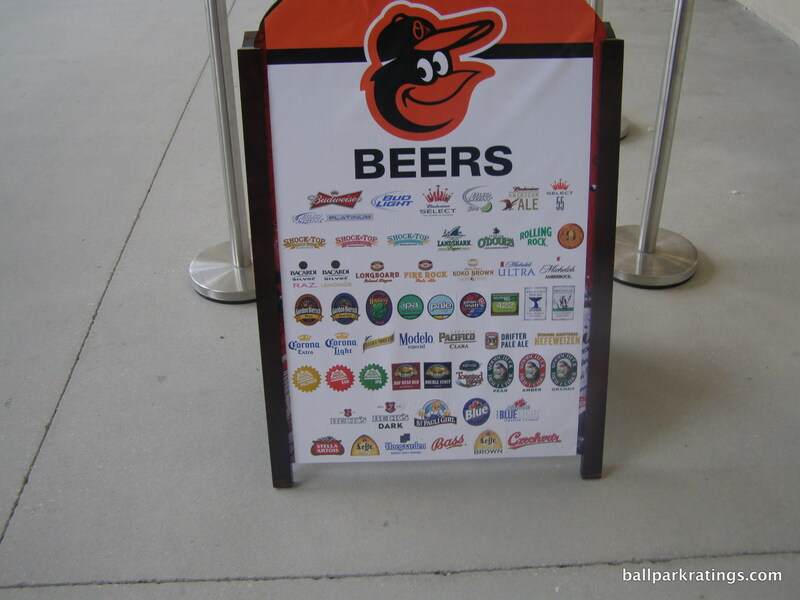 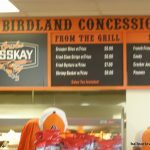 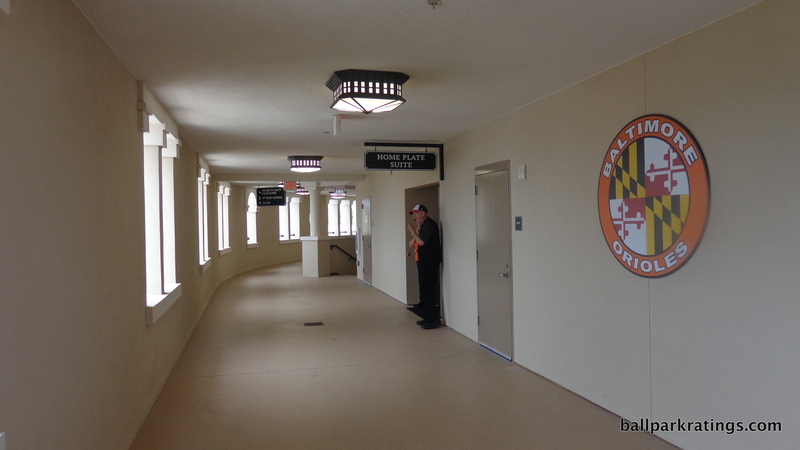 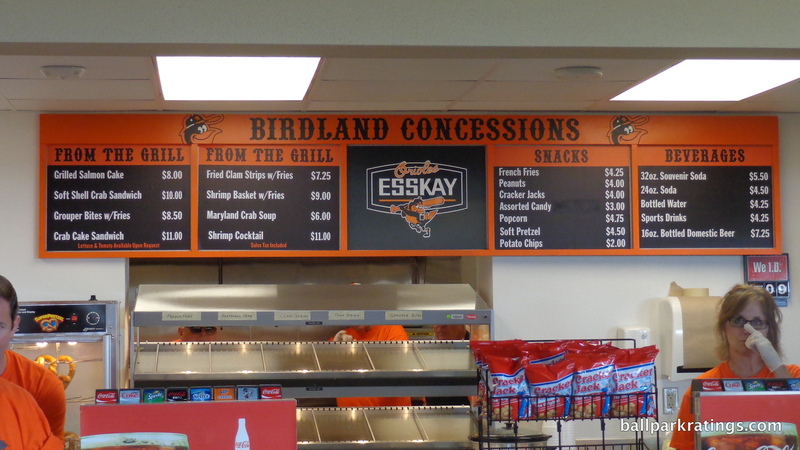 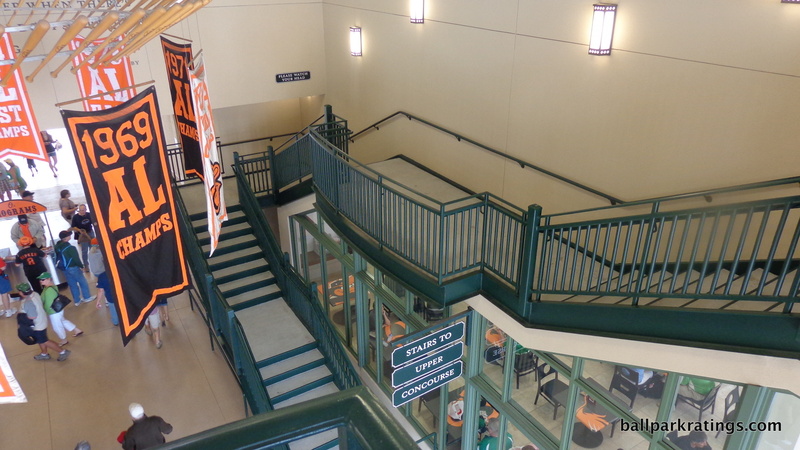 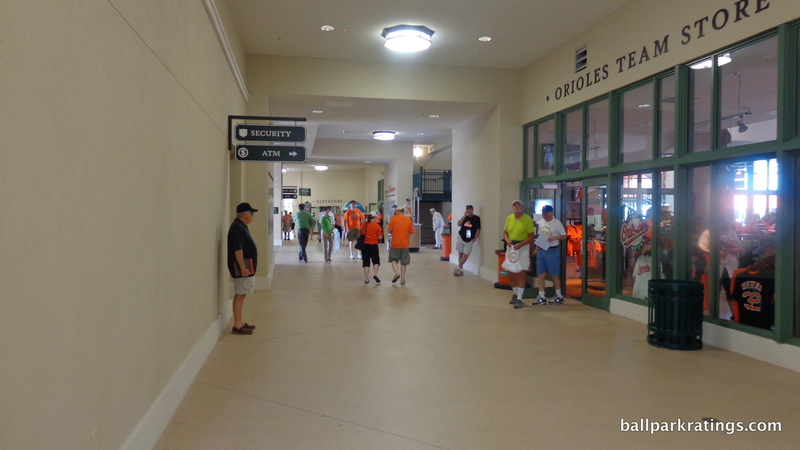 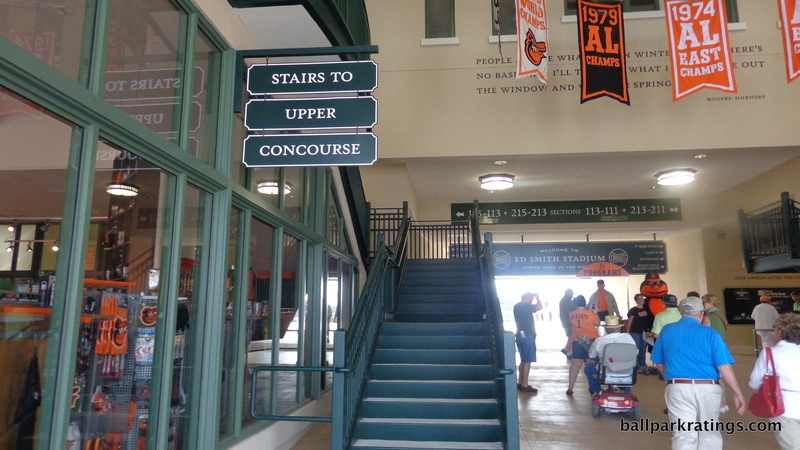 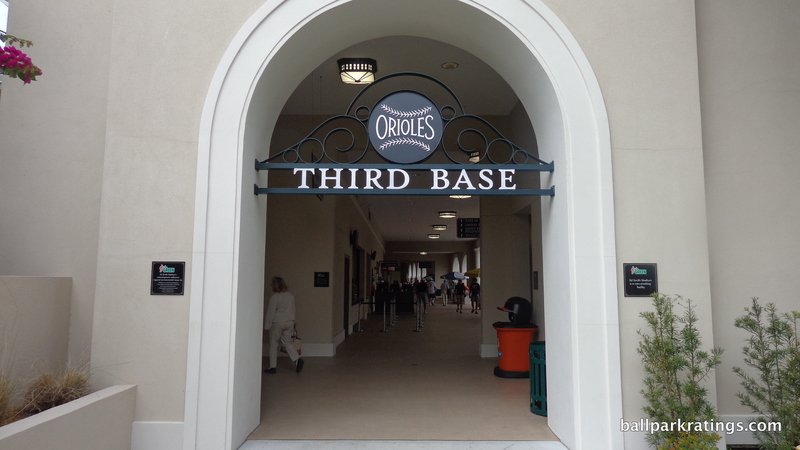 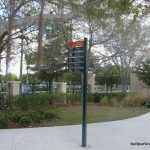 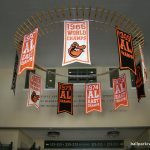 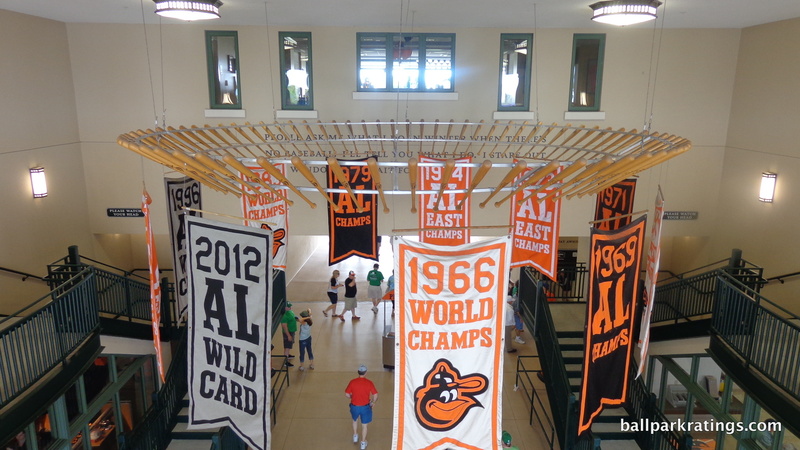 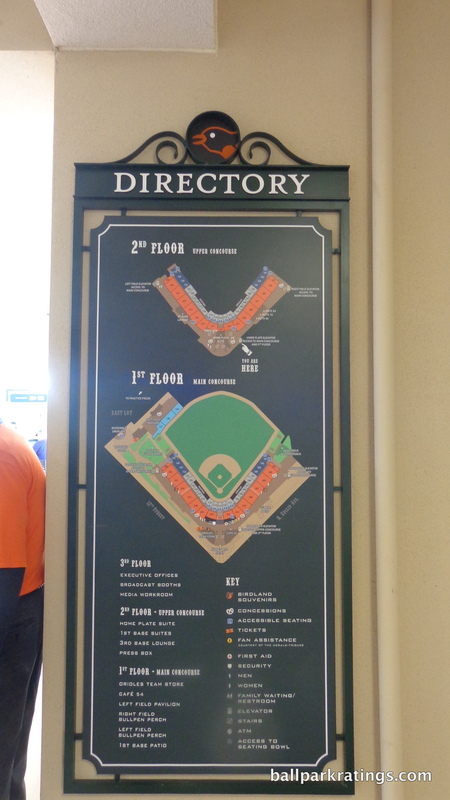 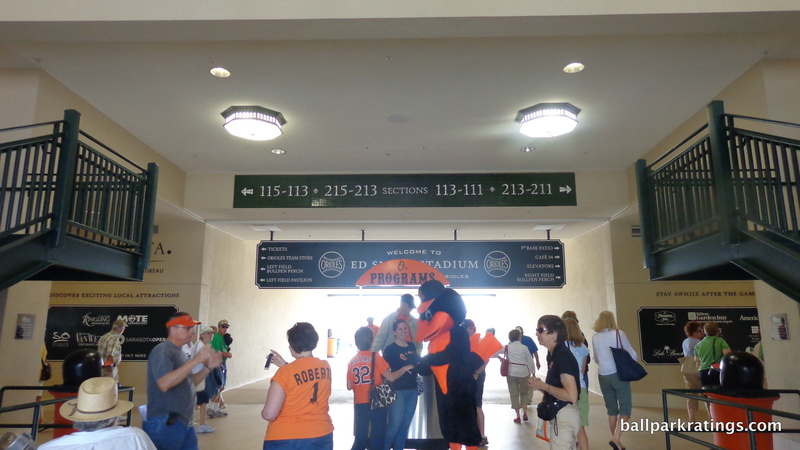 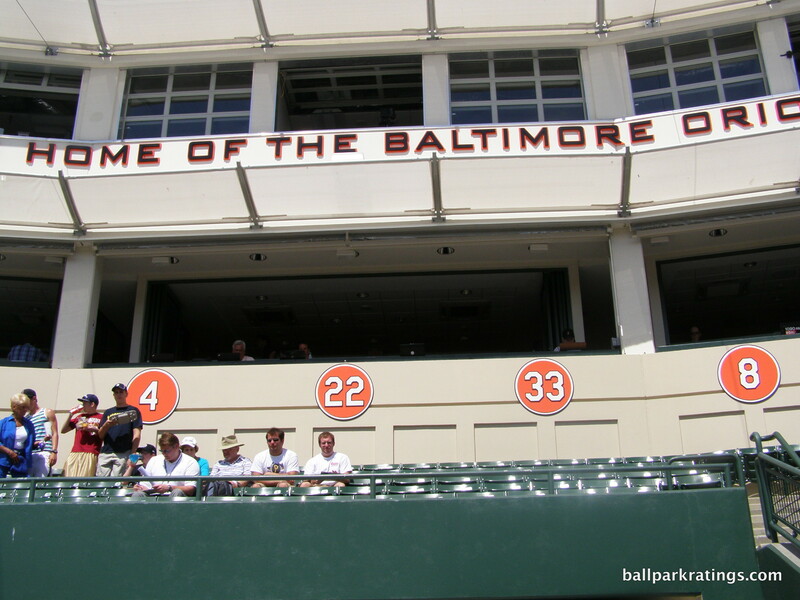 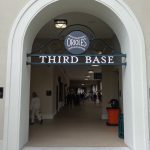 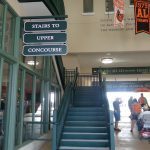 Other Oriole references include decorative banners (spelling out “BIRDLAND” on one side and displaying old logos on the other) on the concourses down the lines. 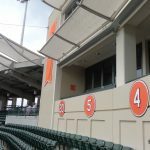 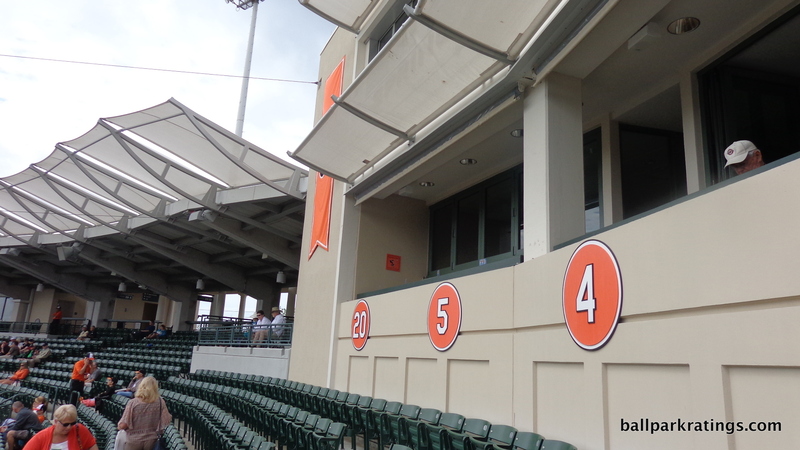 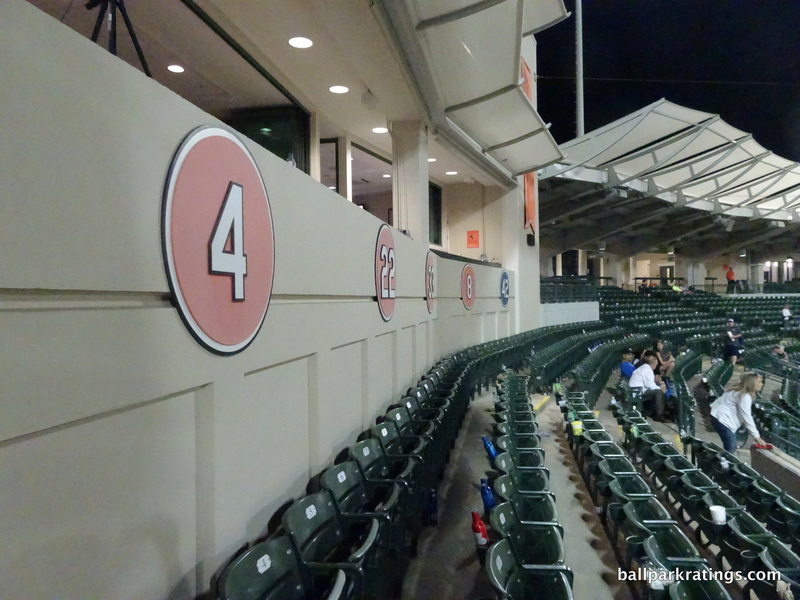 The press box façade displays team retired numbers flanked by orange Oriole banners. 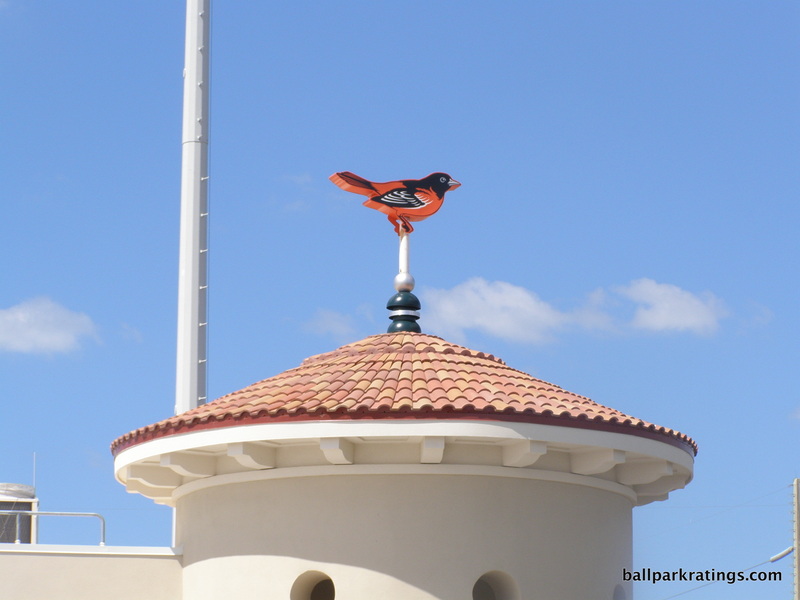 We have the aforementioned bird weathervanes atop the side towers. 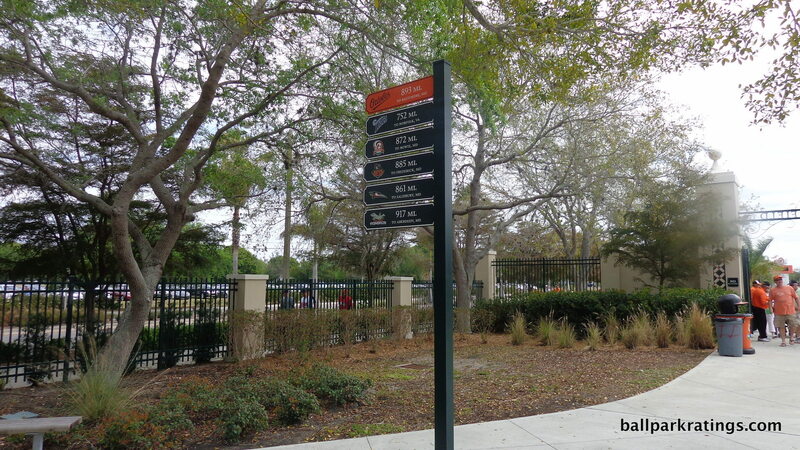 Mileage markers tell fans how far they are from home and team affiliates. 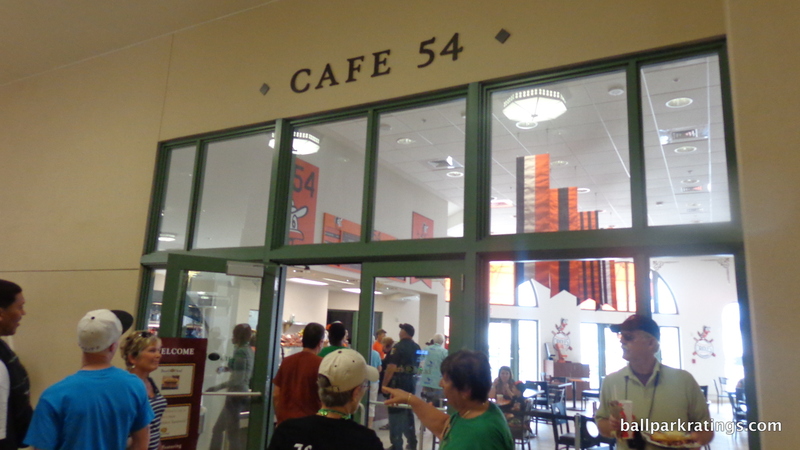 Eateries and group spaces are team-themed. 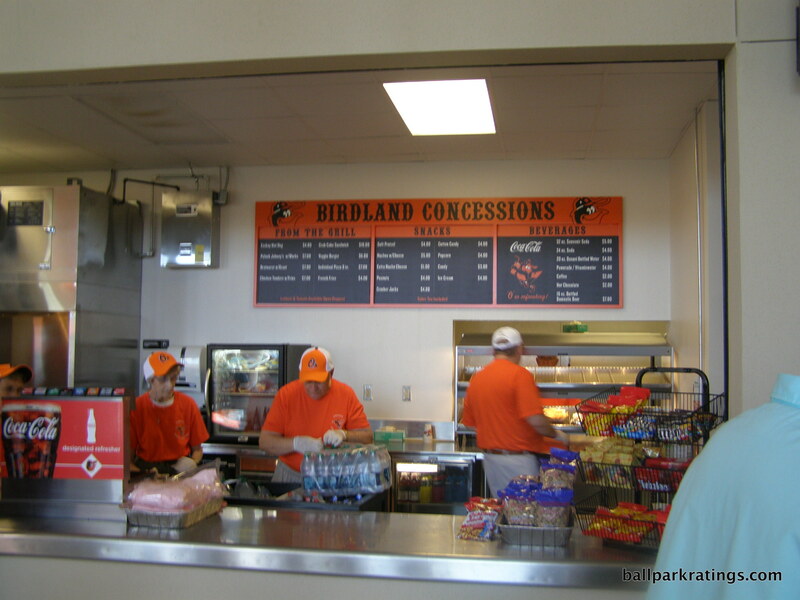 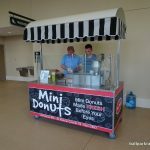 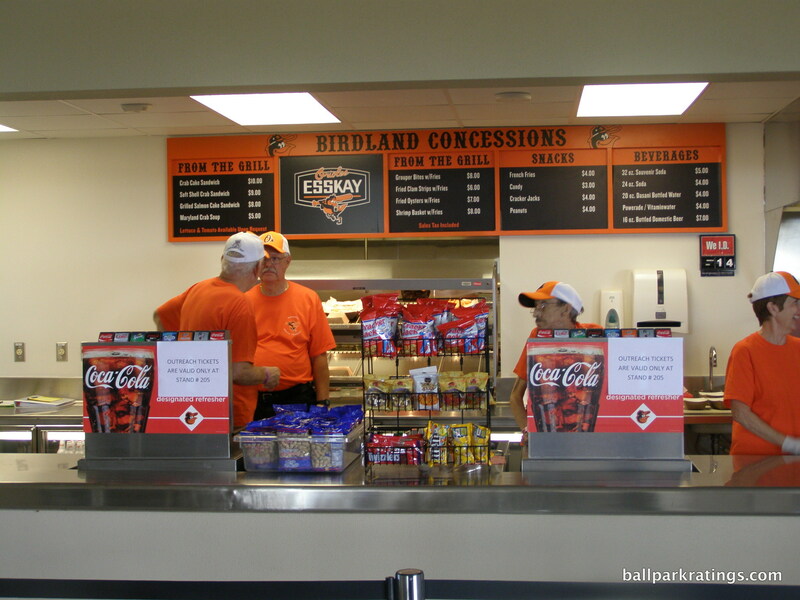 All concessions monikers are team-themed. 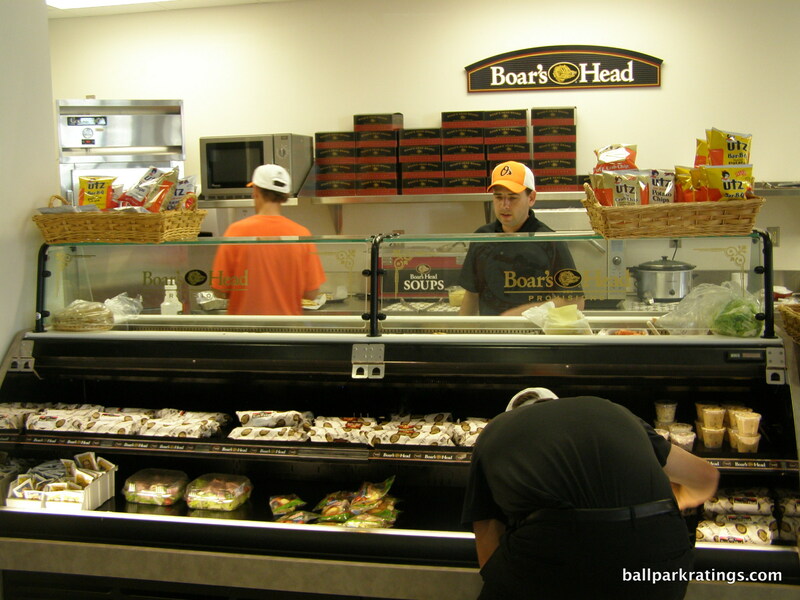 Much of the food itself is regional. 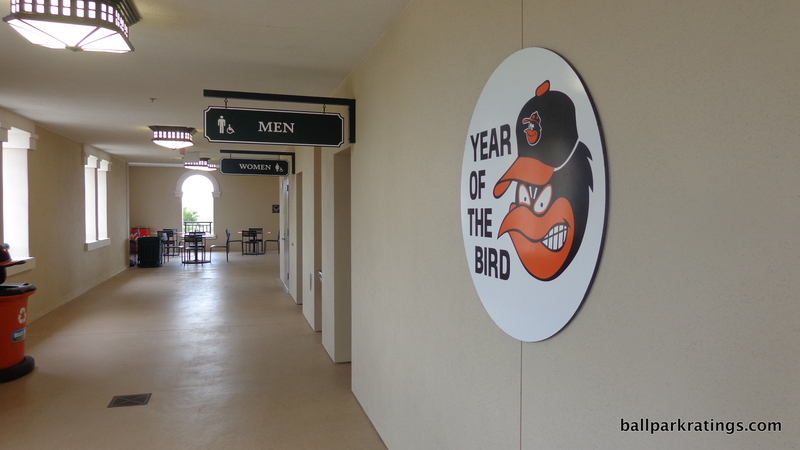 Heck, even the bathrooms have charming nods to the Orioles! 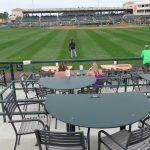 Other than JetBlue Park, Steinbrenner Field, and maybe Sloan Park (Cubs), no spring park reflects its tenant to this extent. 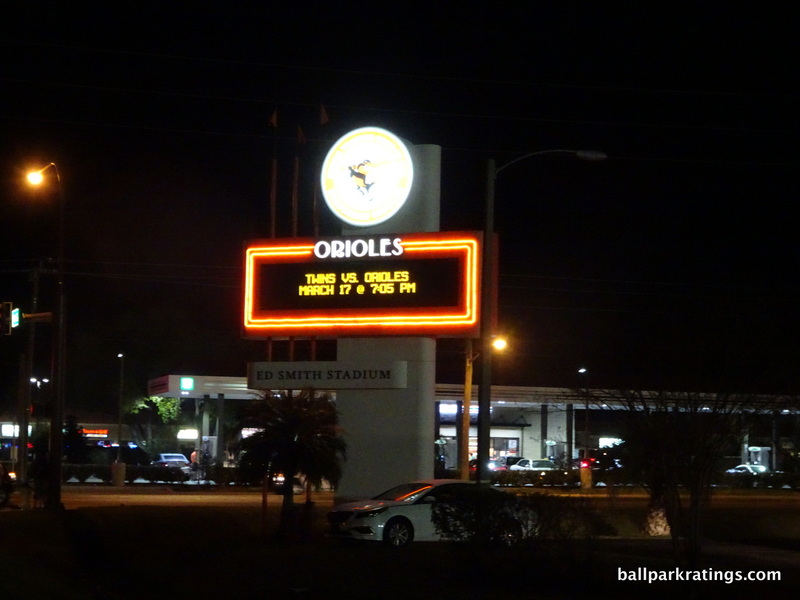 Not one does it so beautifully. 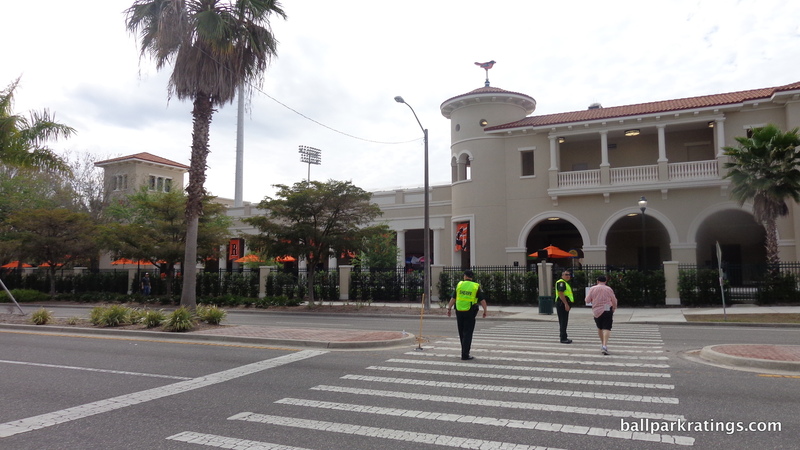 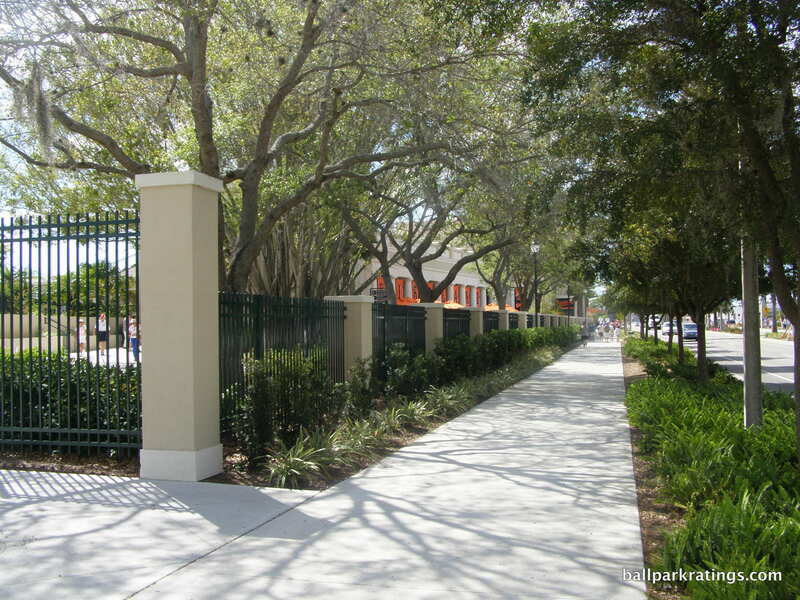 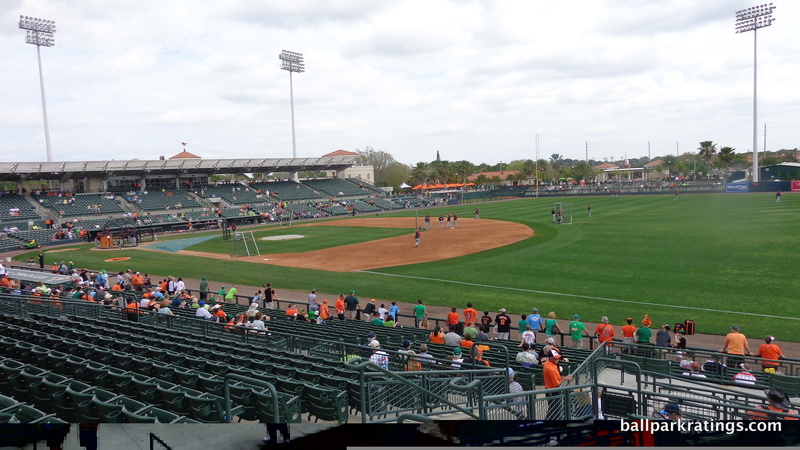 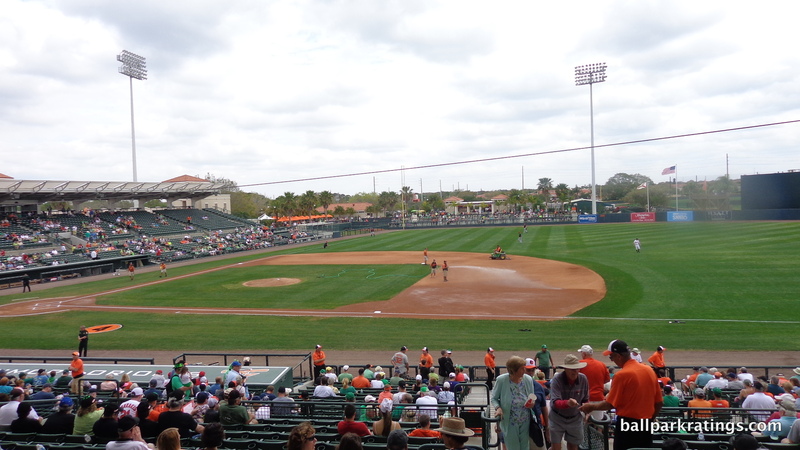 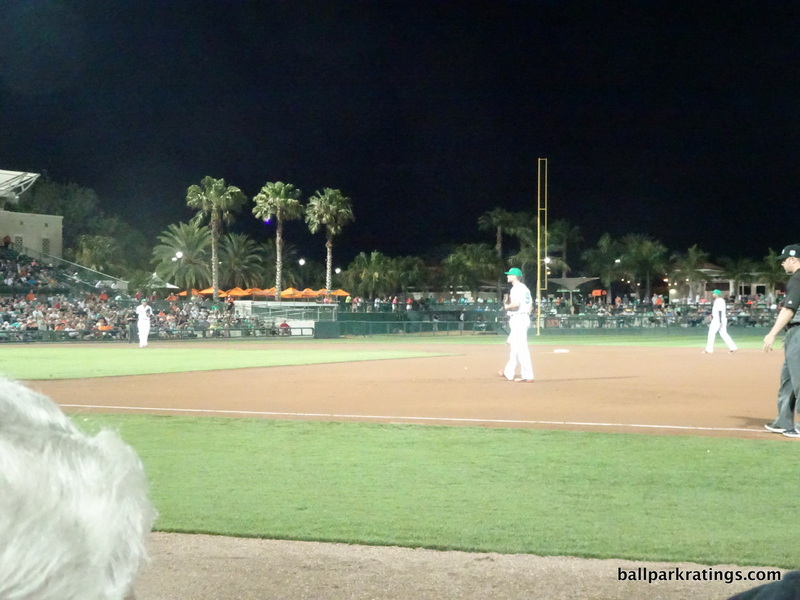 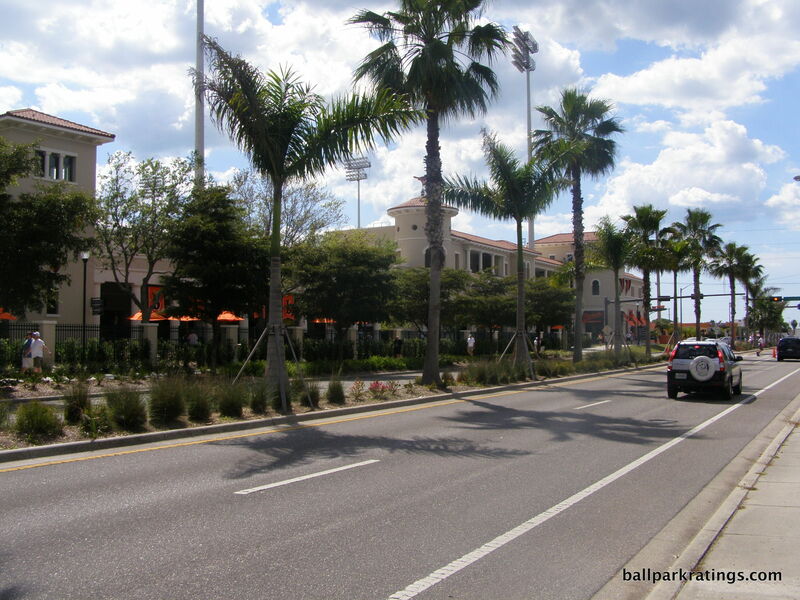 Until now, Ed Smith Stadium seems like something close to the perfect park. 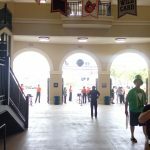 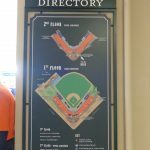 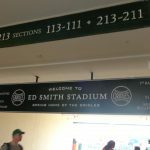 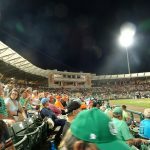 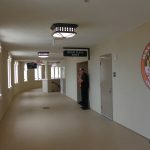 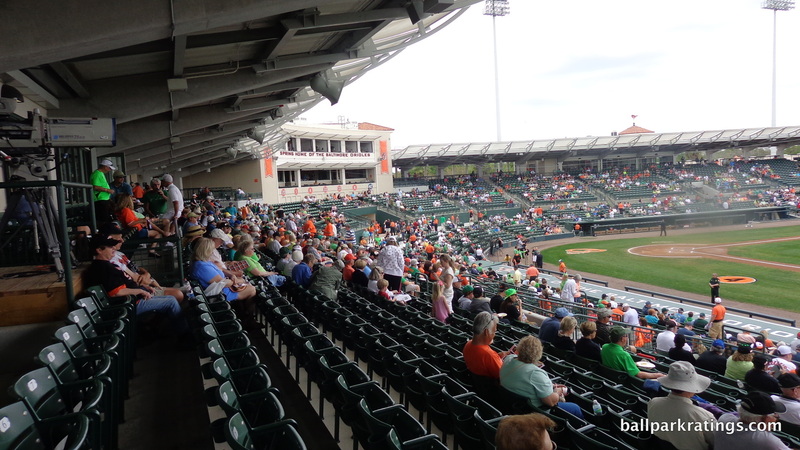 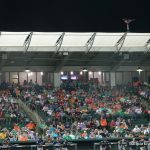 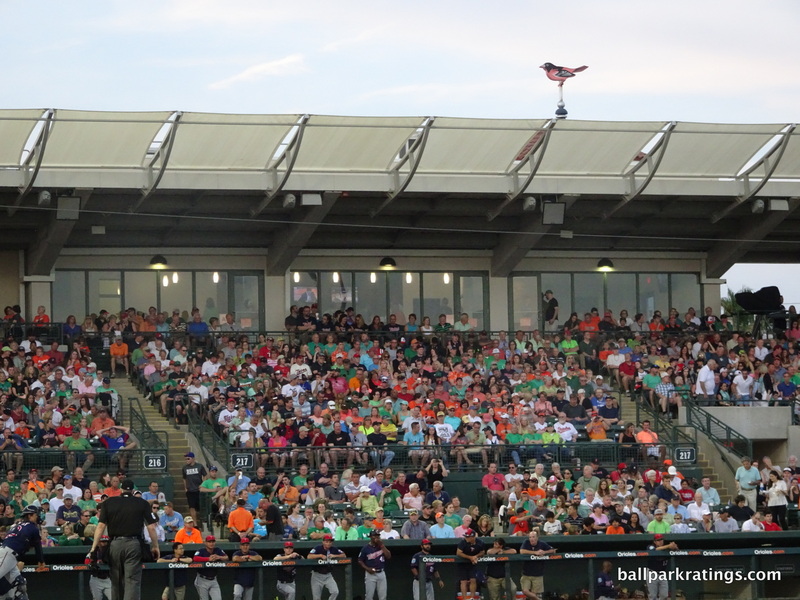 While it picks right back up when discussing amenities, Ed Smith Stadium has some functional issues, namely the lack of a 360-degree concourse. 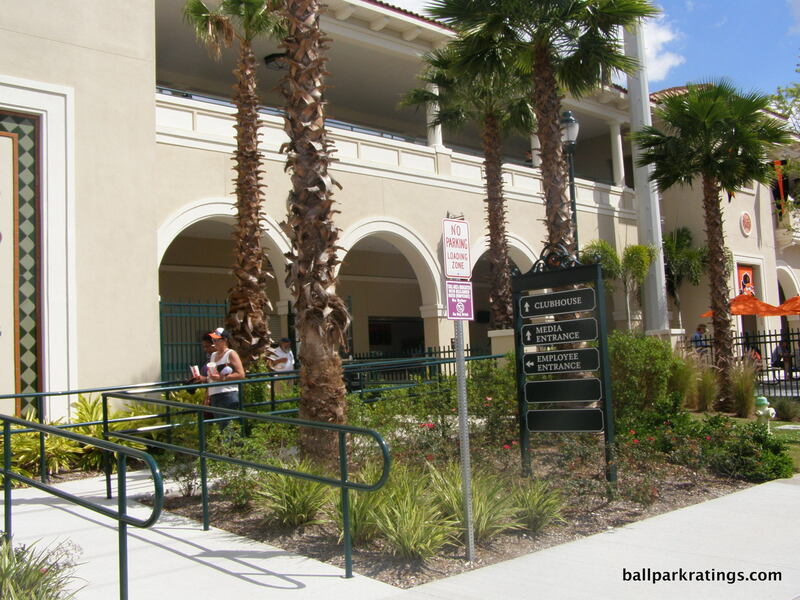 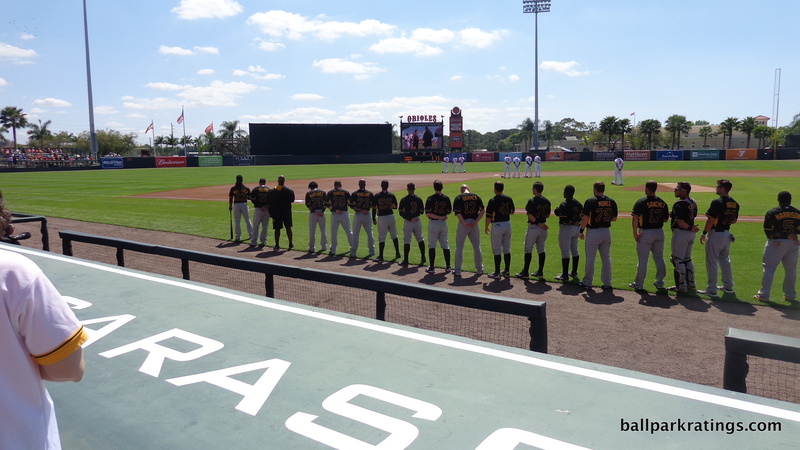 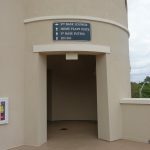 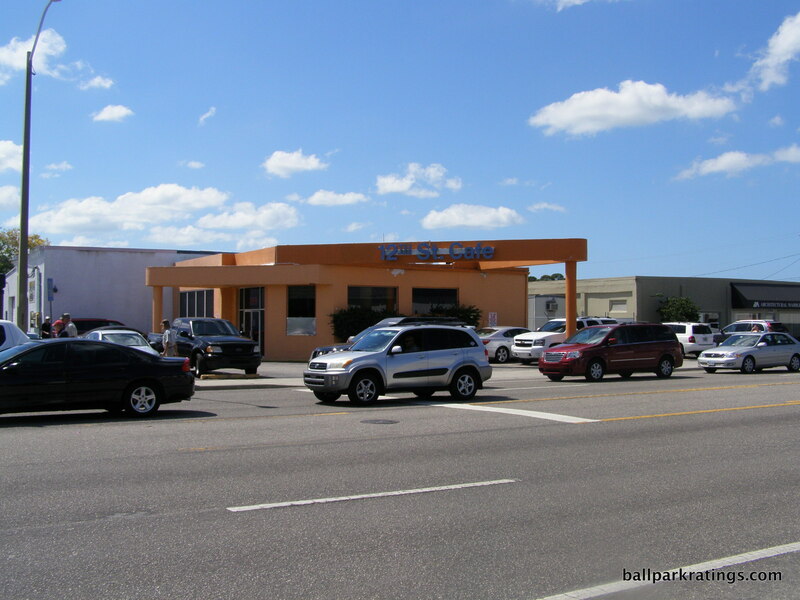 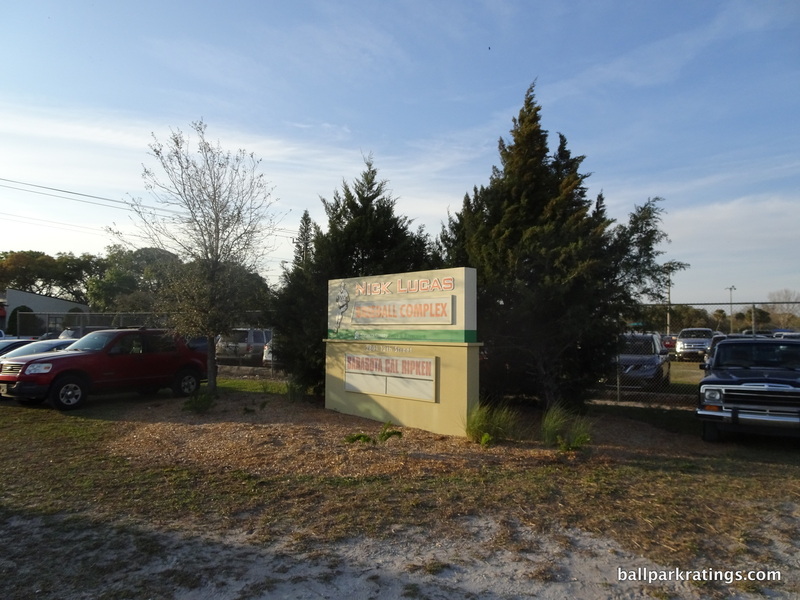 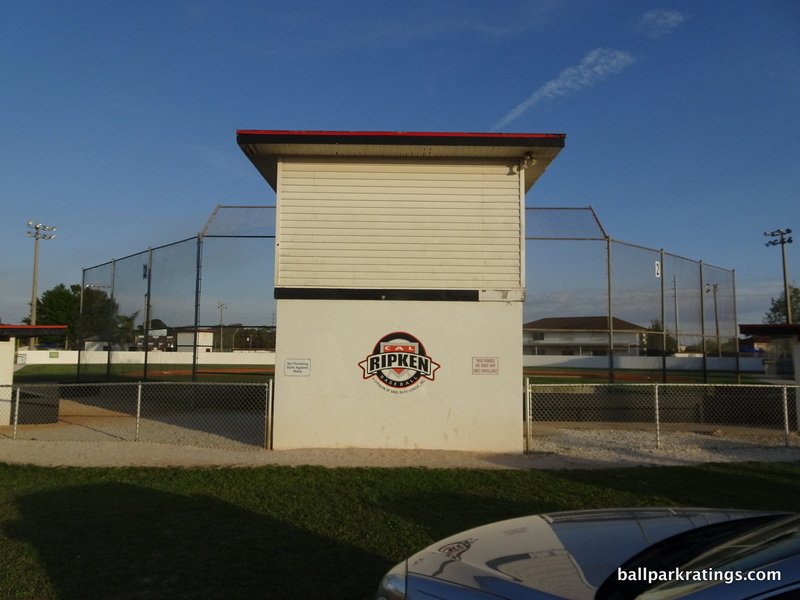 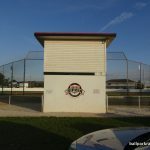 This is often seen as the starting point of any state-of-the-art minor league or spring facility. 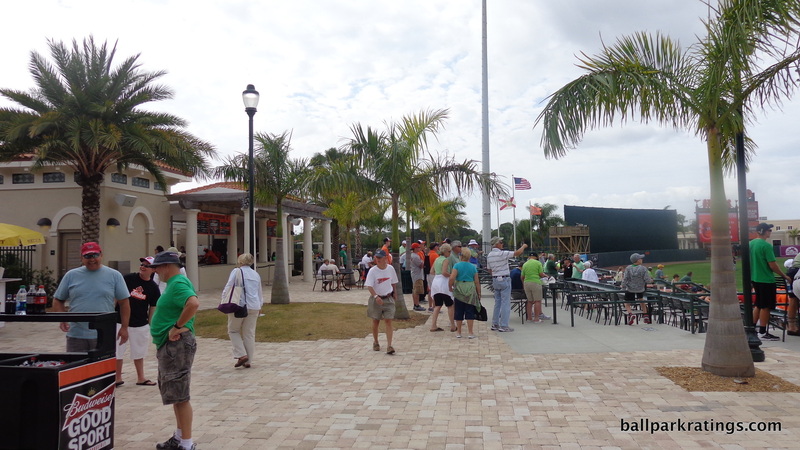 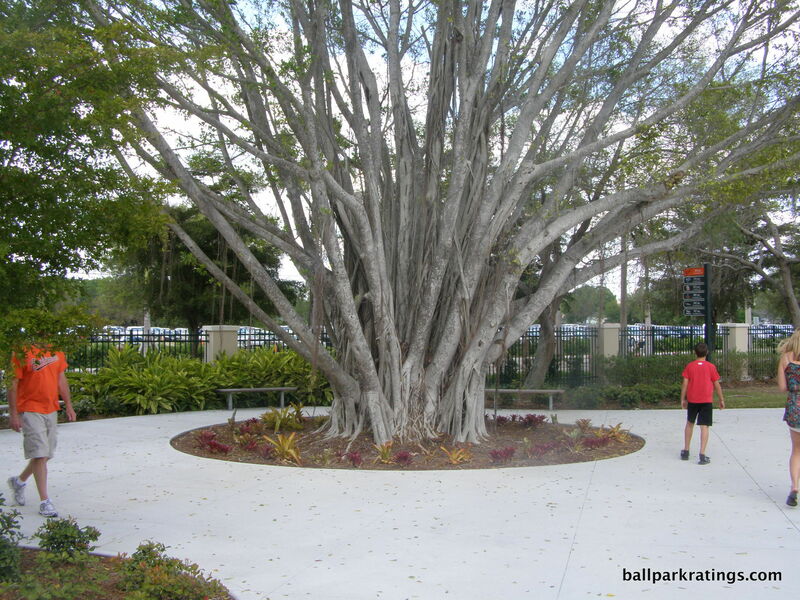 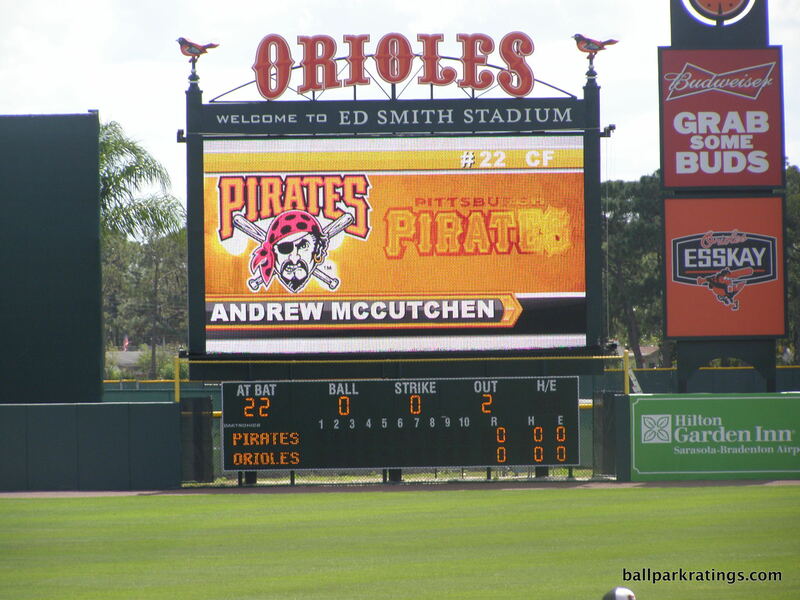 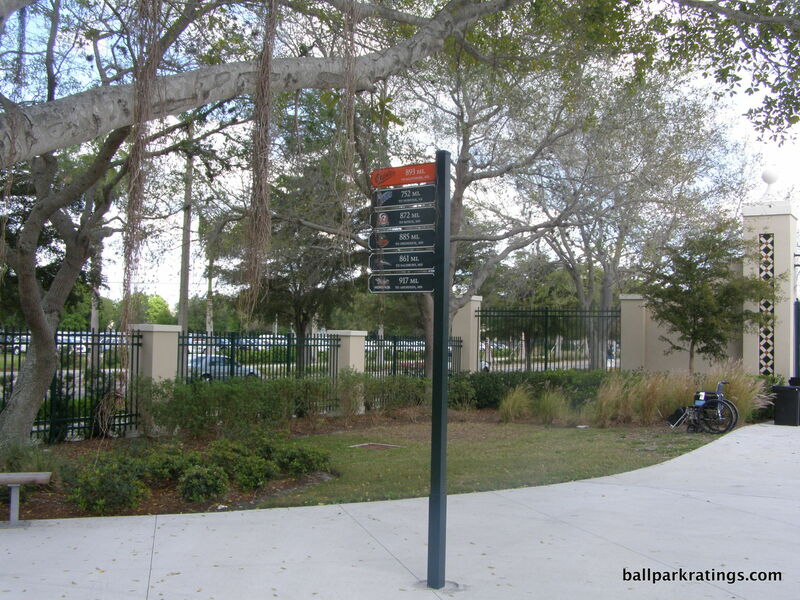 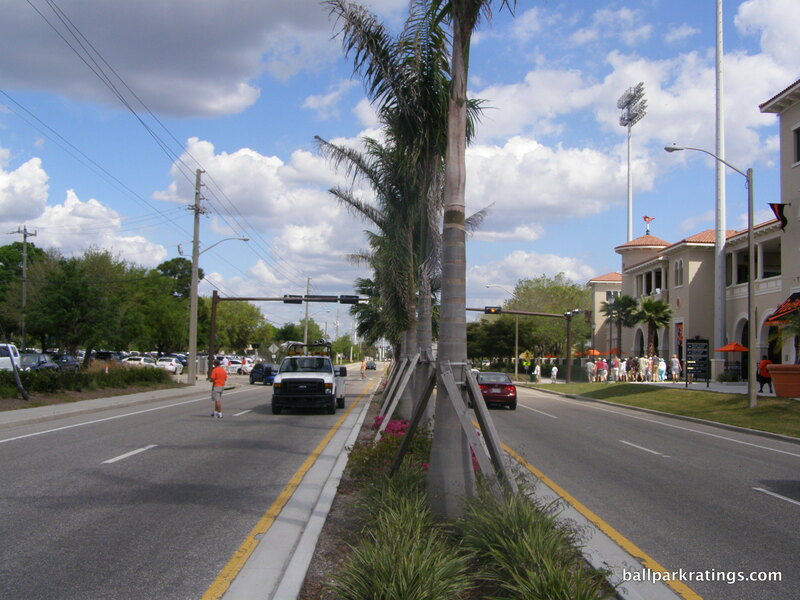 If Sarasota had this feature, the park would comfortably be #1 in the Grapefruit League. 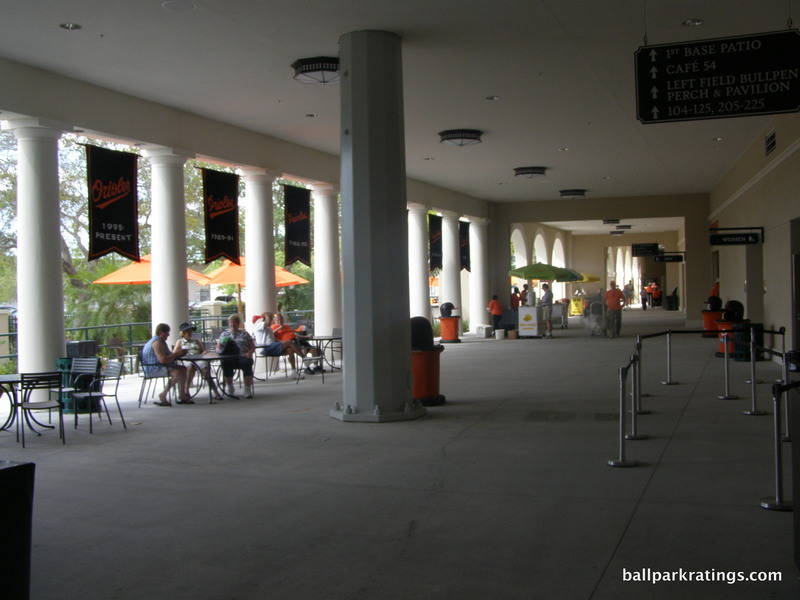 The main concourse ends in front of the pavilion seating in left-center field and doesn’t make it to the corner down the right field line. 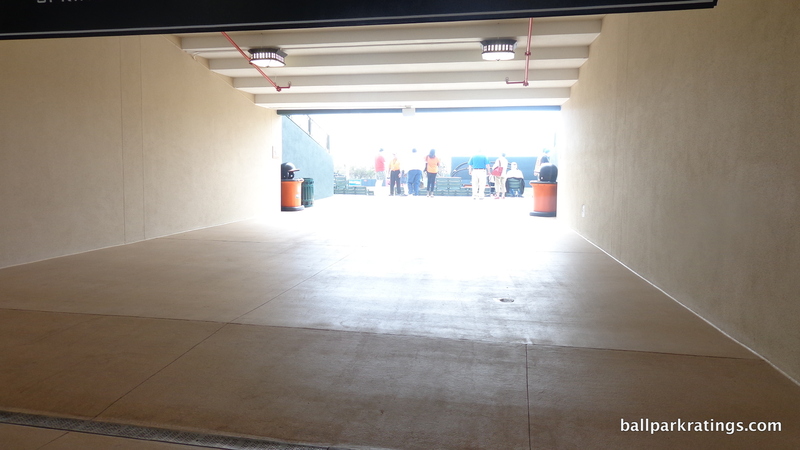 Narrow and closed to the field (but beautiful! 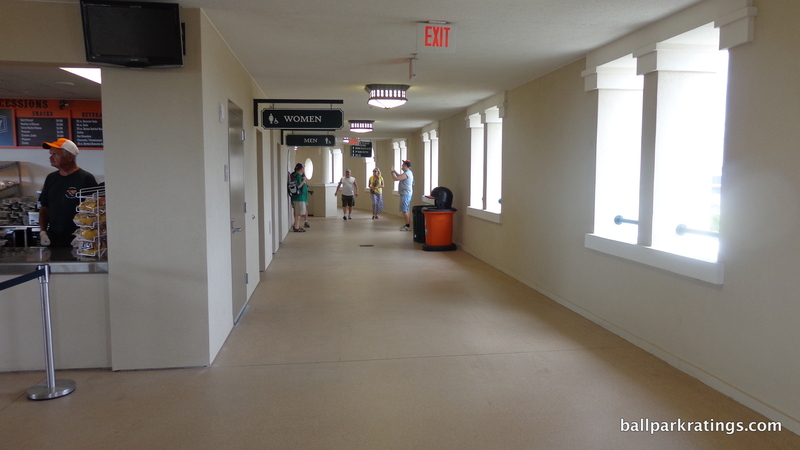 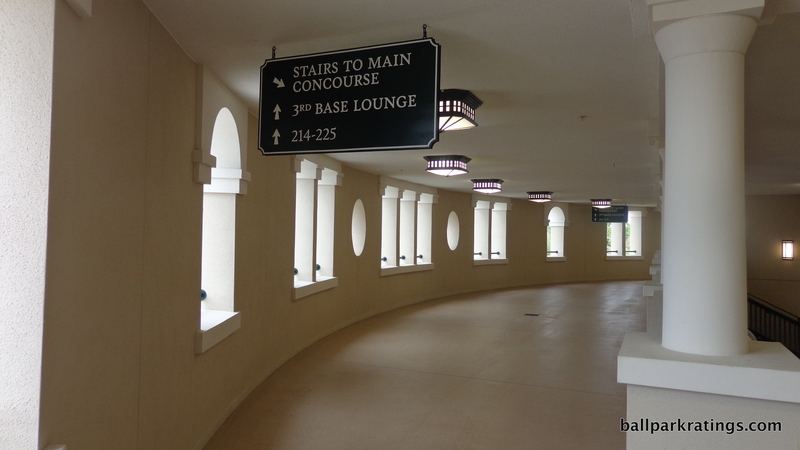 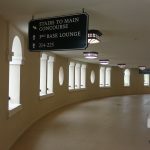 ), the concourse just doesn’t have the space or views of its contemporaries. 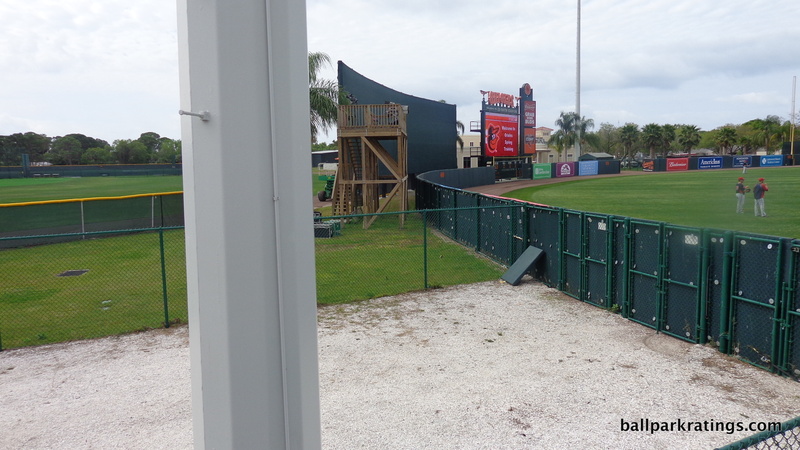 It’s constricted around home plate and non-existent in the outfield. 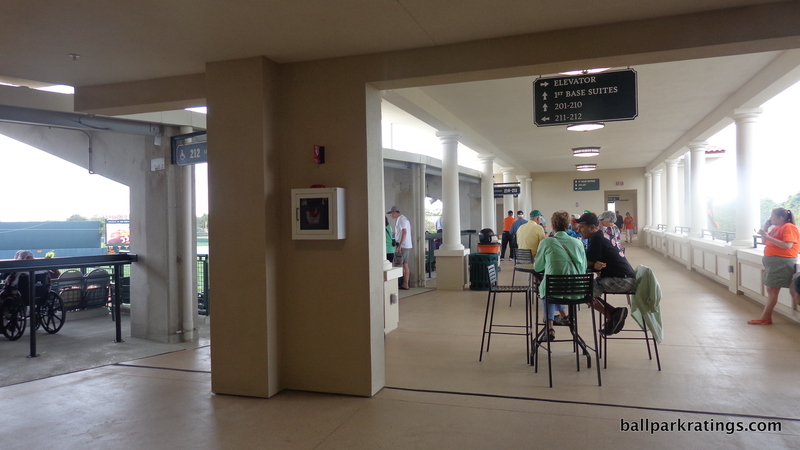 This is somewhat mitigated by an unusually active 200-level concourse atop the grandstand. 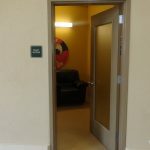 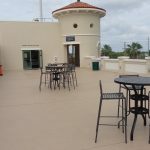 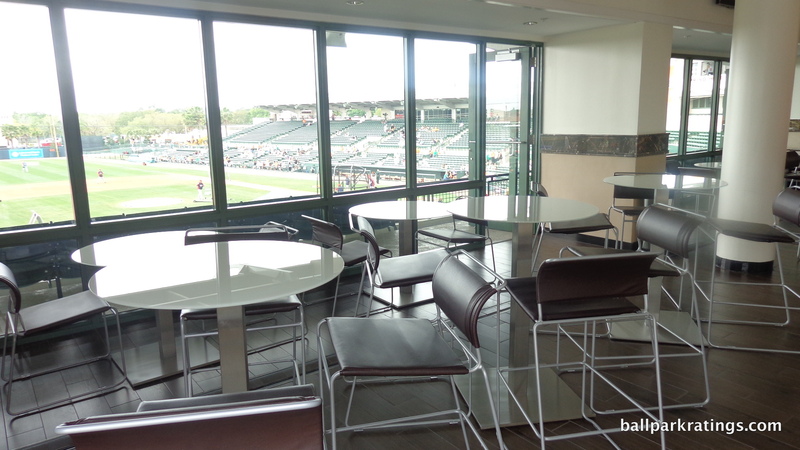 It is open to the field and provides great standing-room views. 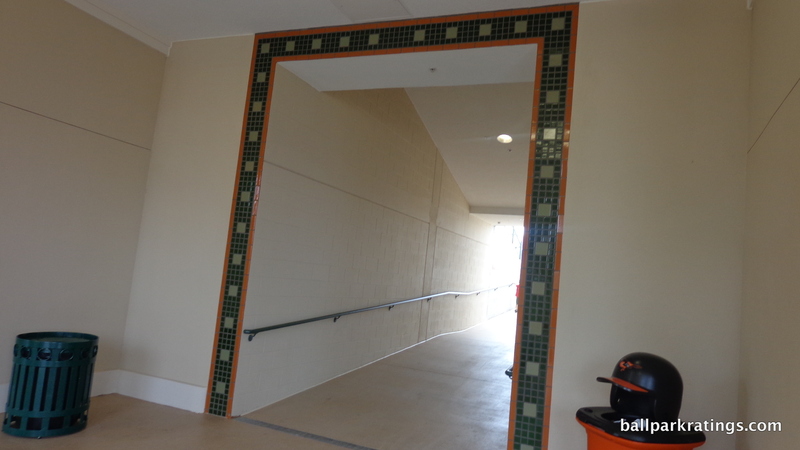 The large portal behind home plate also provides some views from the main concourse. 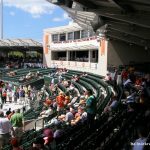 Ed Smith Stadium benefited from originally utilizing a curvilinear grandstand design behind home plate, instead of the quirky angular designs seen at the time and seen today at the refurbished Charlotte Sports Park (Rays). 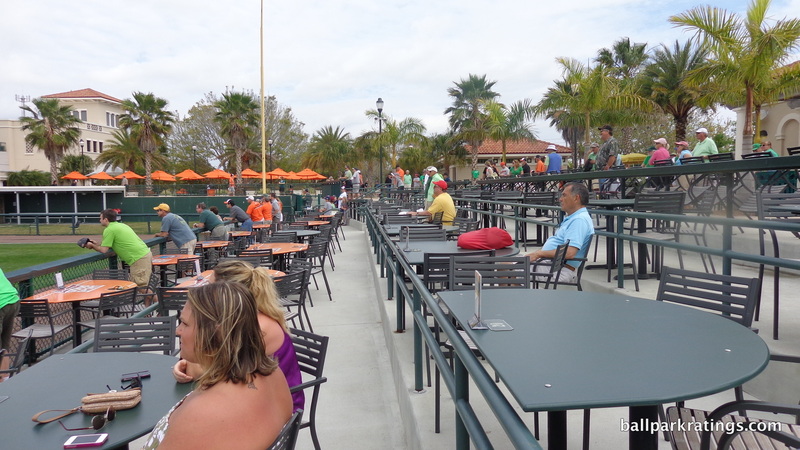 So, the renovations didn’t replace the grandstand. 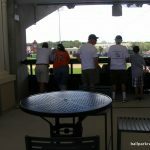 The sightlines have that familiar tune: intimate views around the infield, with some minor orientation issues down the lines. 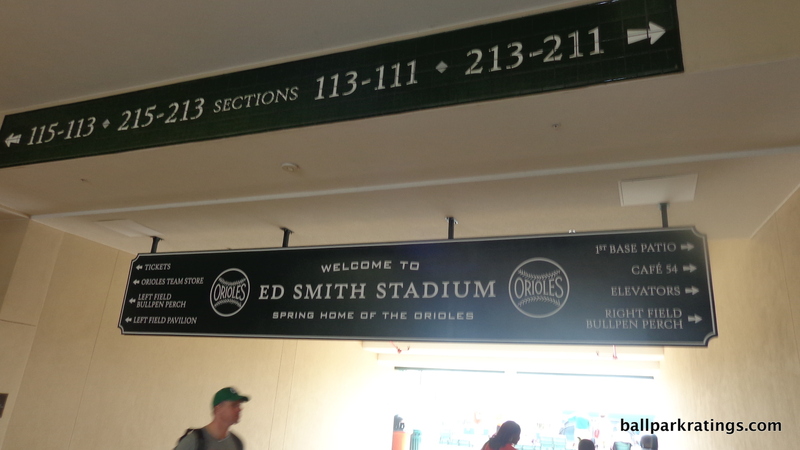 In other words, good but not great. 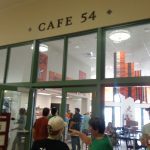 Cafe 54. 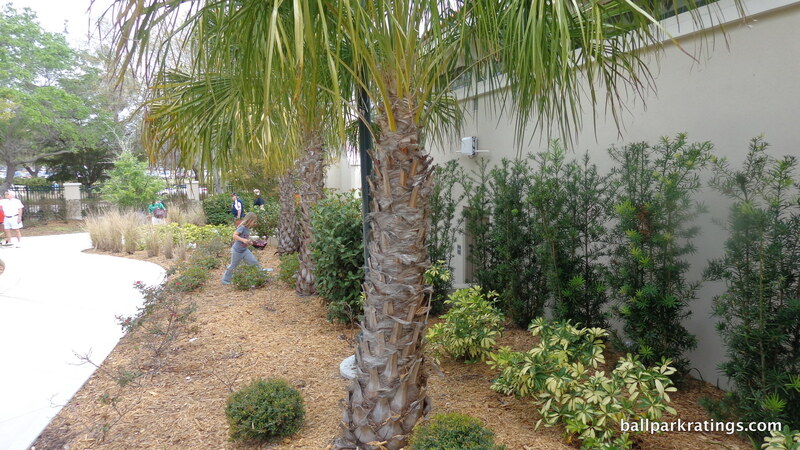 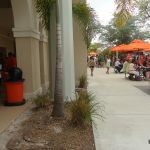 Ed Smith Stadium features a number of well-appointed climate-controlled spaces. 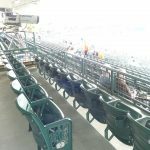 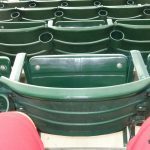 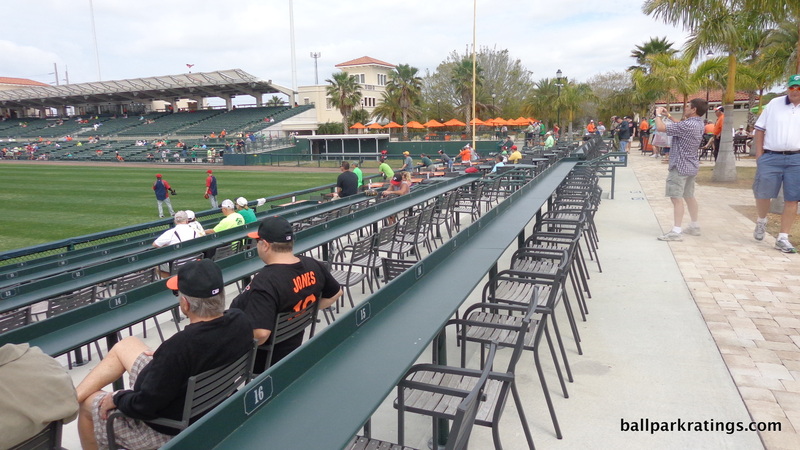 In line with the spirit of the project, all fold-down seats are old, refurbished ones from Camden Yards. 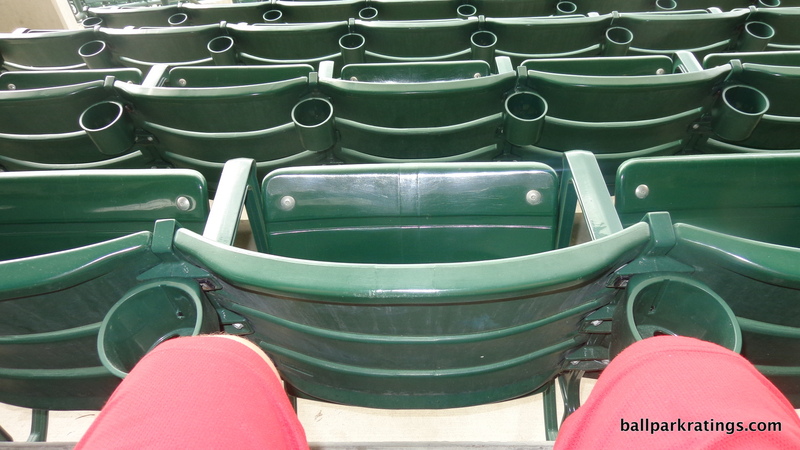 While all now have cupholders, they can naturally be a bit narrow. 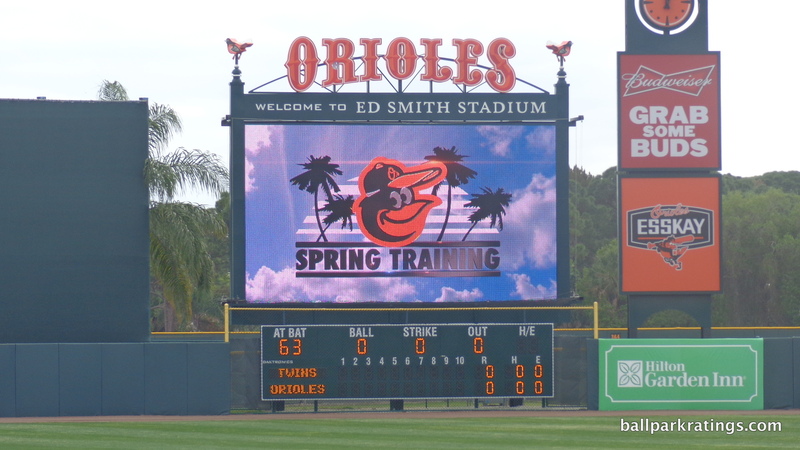 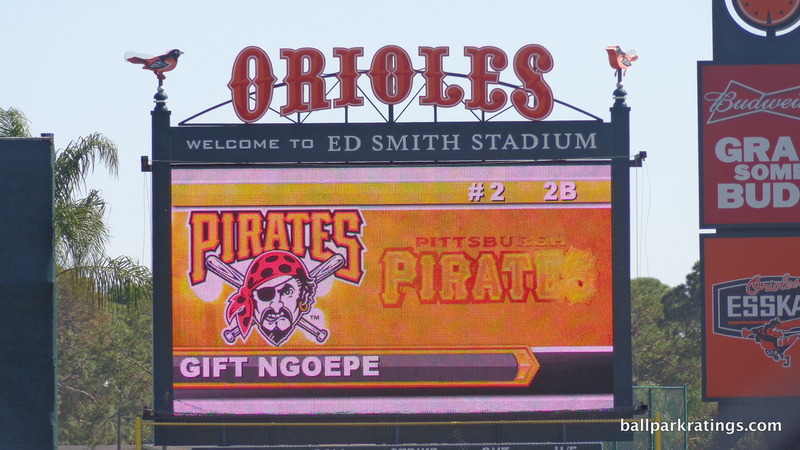 The videoboard from 2011 is fine. 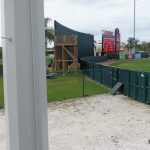 One additional note: bullpens down the lines are unusually accessible for watching pitchers warm up. 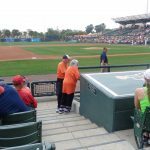 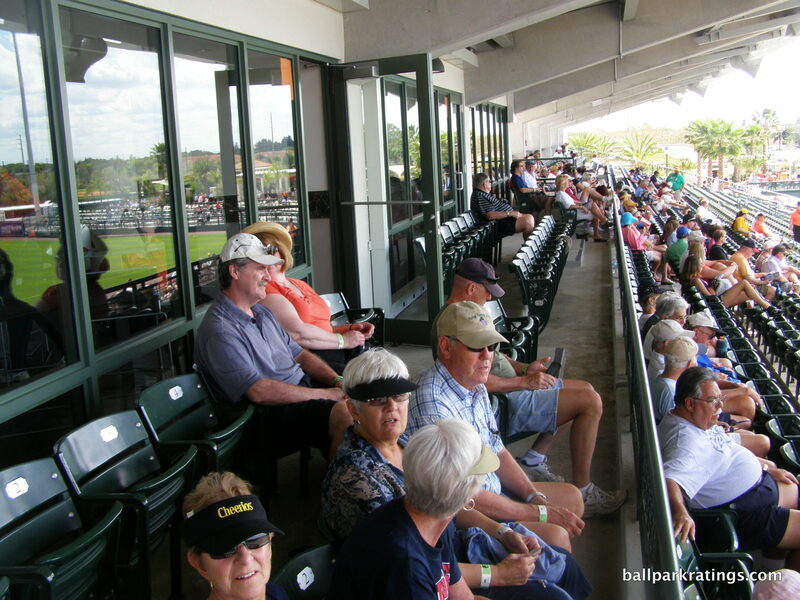 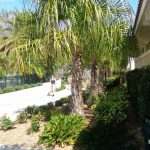 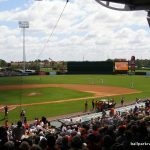 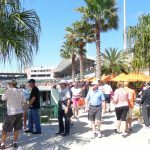 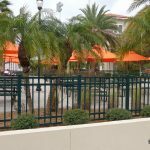 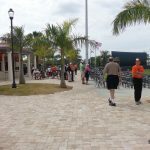 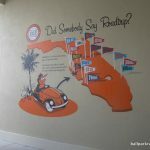 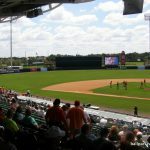 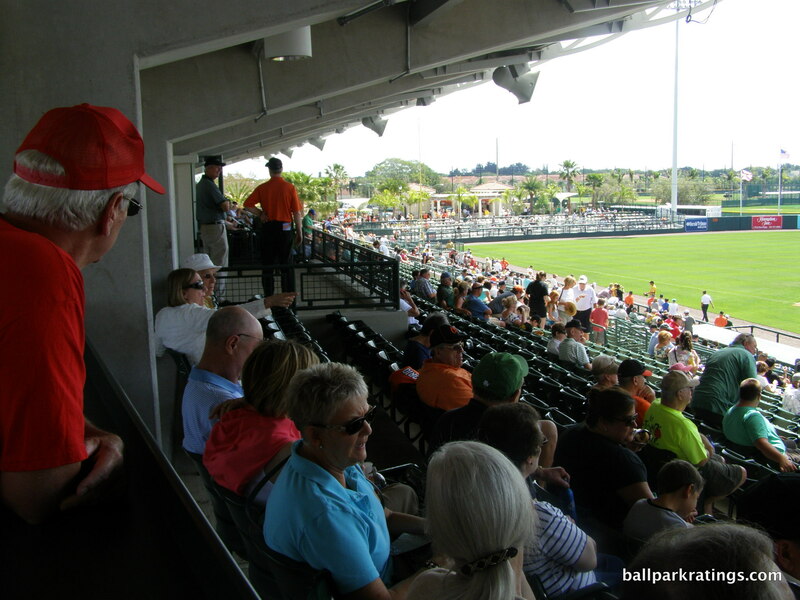 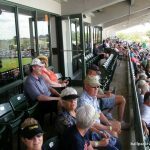 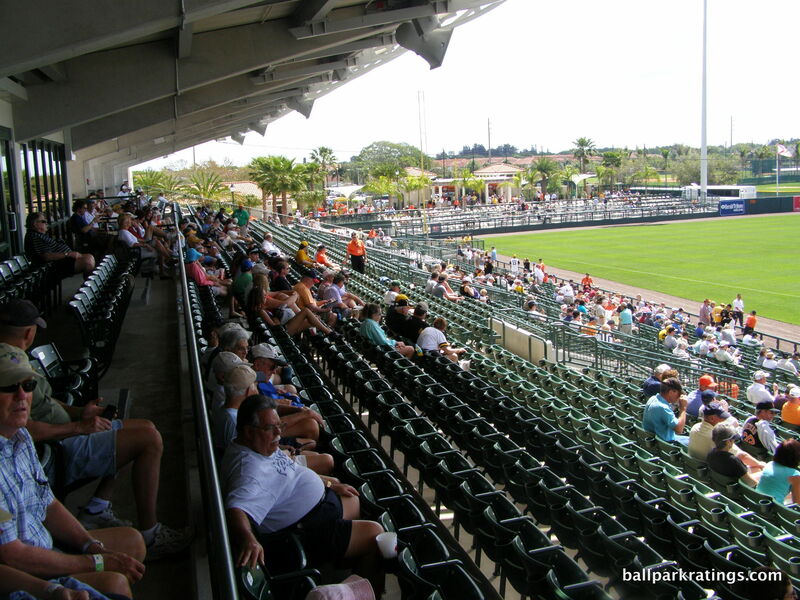 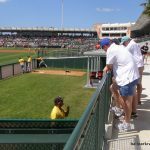 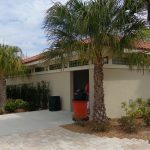 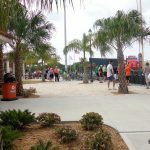 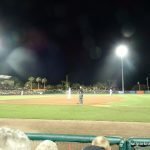 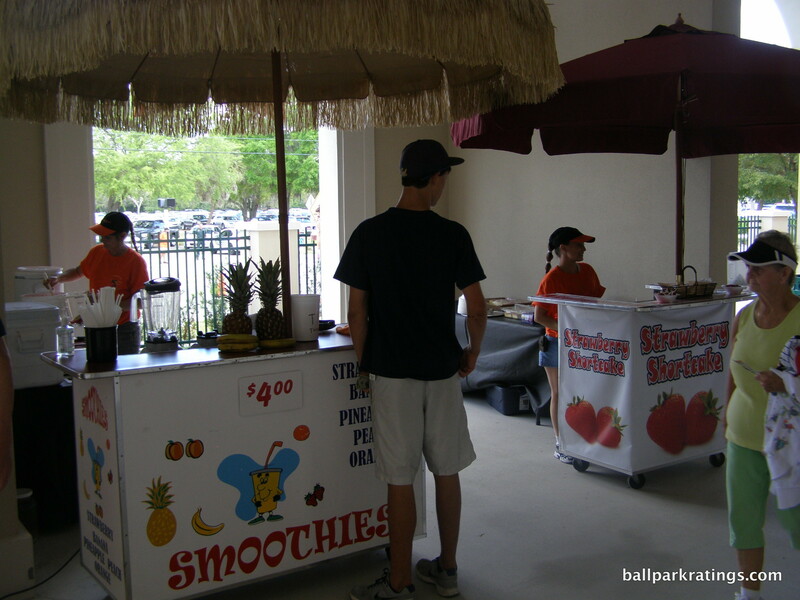 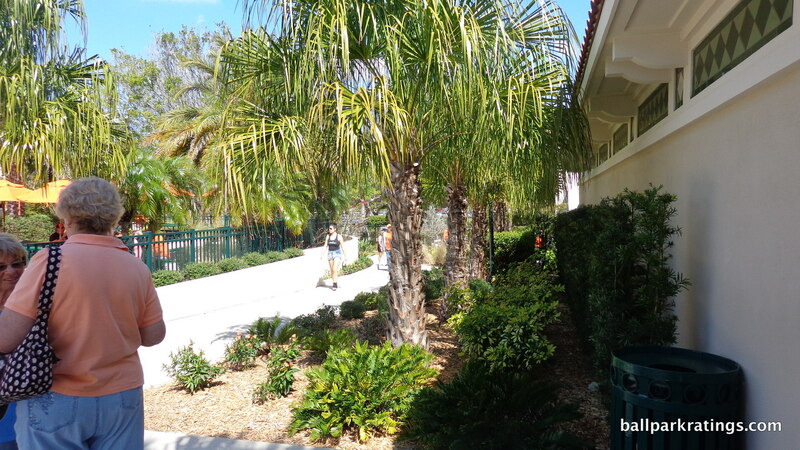 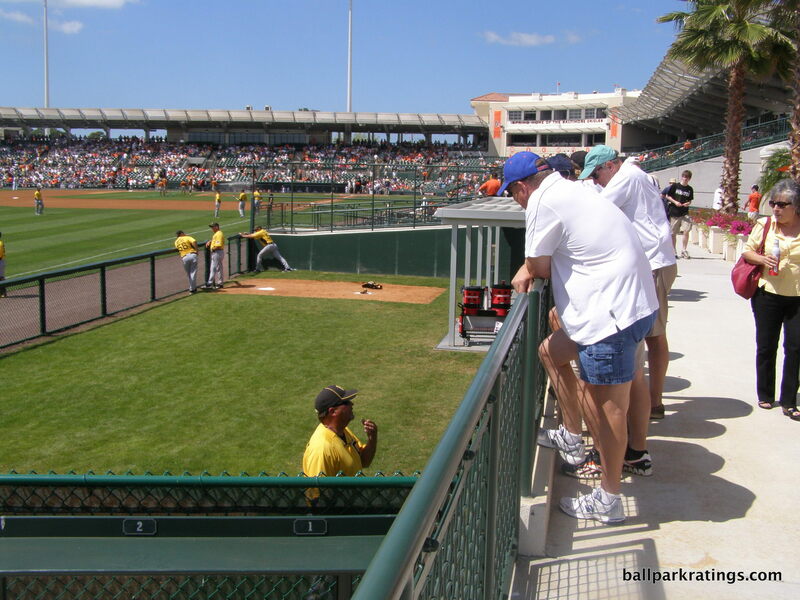 Ed Smith Stadium features fantastic amenities, some of the best in spring training if we take one minor oversight out of the equation. 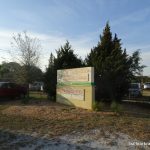 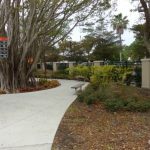 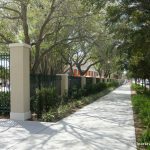 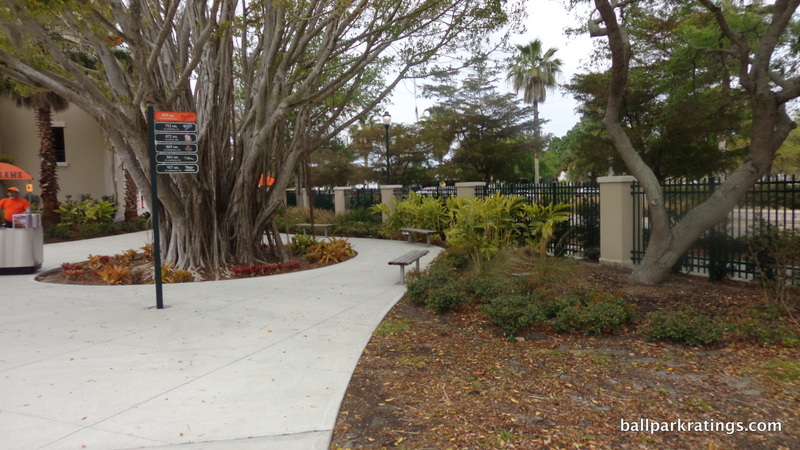 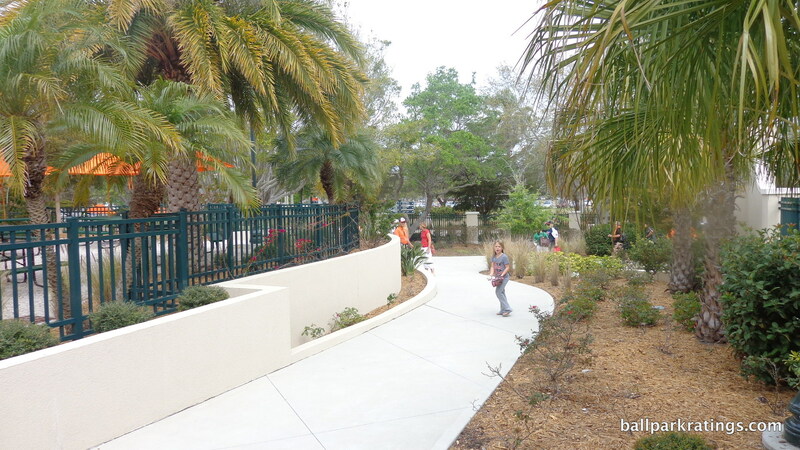 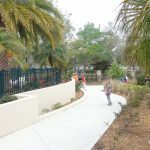 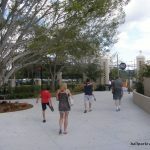 Unlike other renovation projects of the era, Sarasota’s park lacks any fun kids’ areas or miscellaneous entertainment options. 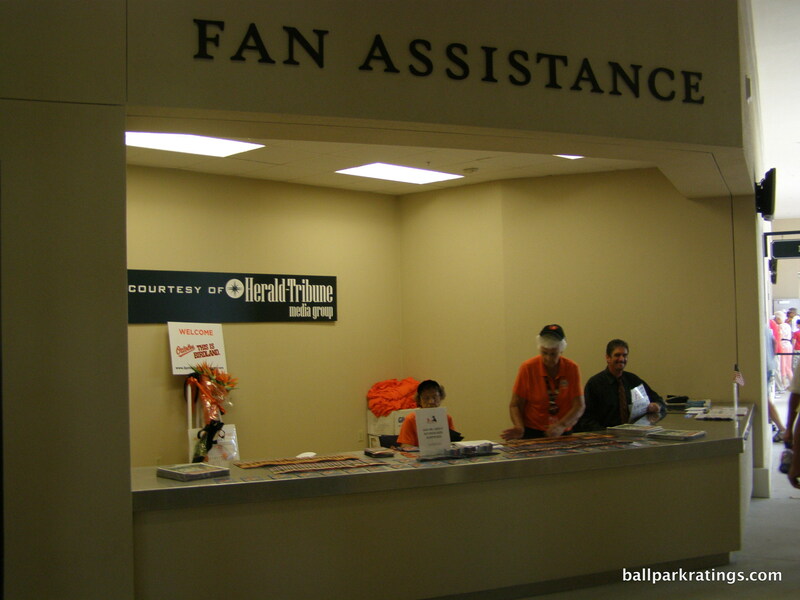 But everything else goes above and beyond in providing a fan-friendly experience. 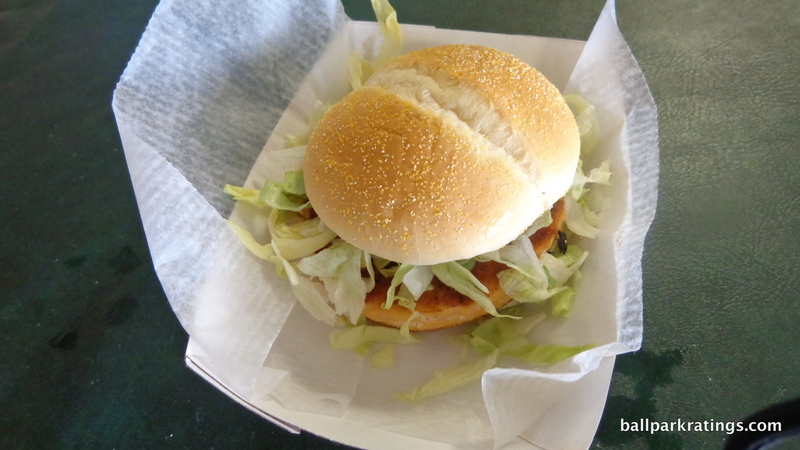 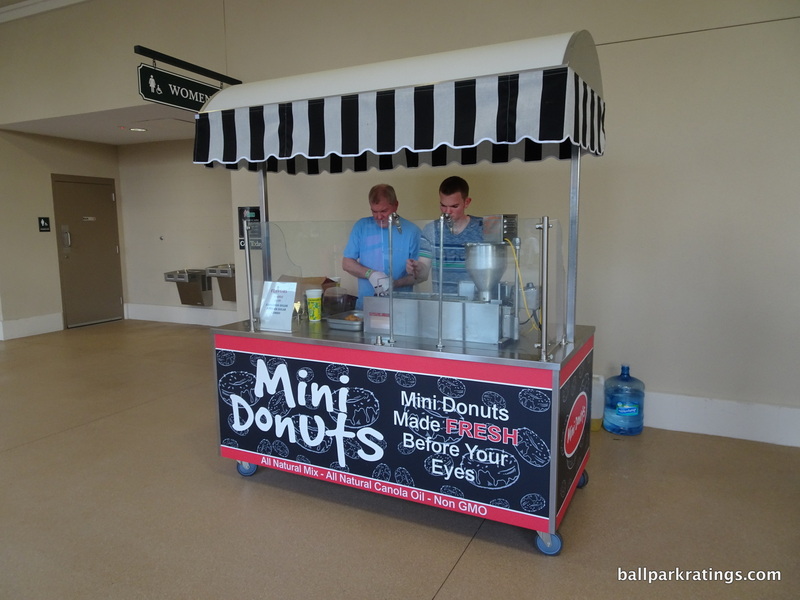 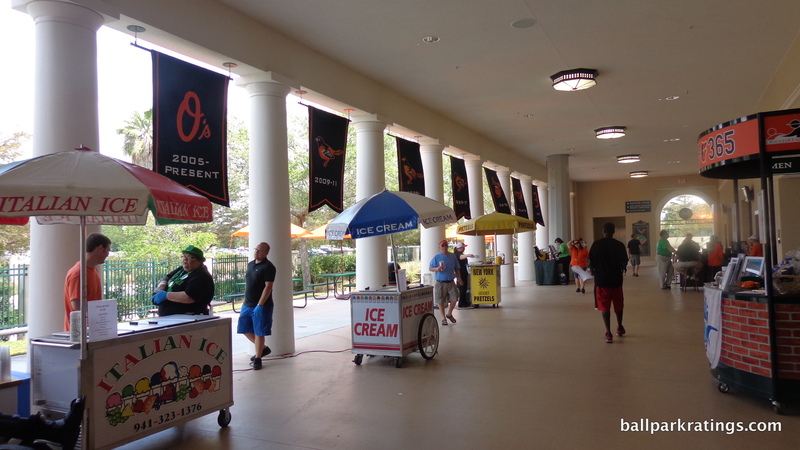 The ballpark has consistently yummy and varied concessions, reflective of both Sarasota and Baltimore. 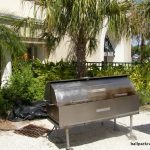 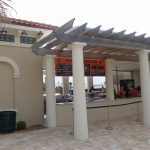 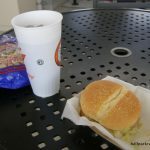 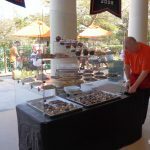 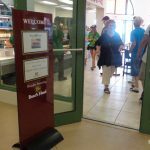 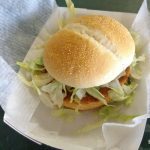 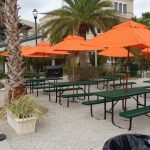 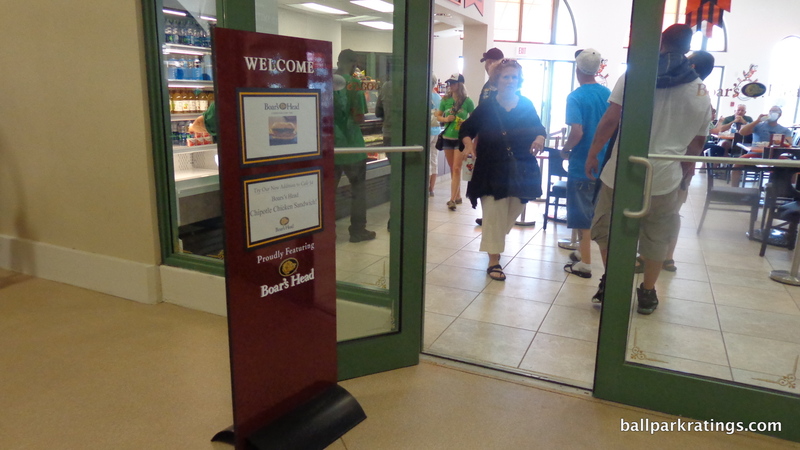 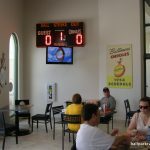 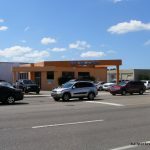 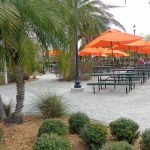 In the past, the unique selection has included seafood (salmon, soft shell crab, grouper bites, fried clams, shrimp, and of course, crab cakes), sandwiches from Boar’s Head, paninis, wraps, salads, pit BBQ, and numerous beer choices. 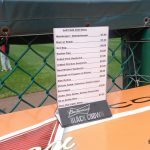 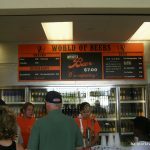 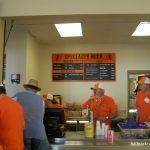 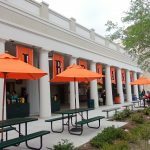 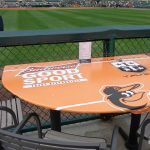 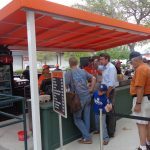 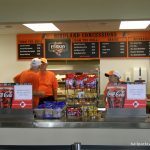 Best news of all: the Orioles are adding a Boog’s BBQ stand for 2019! 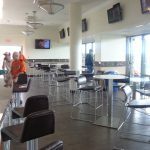 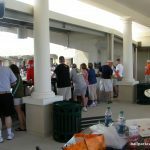 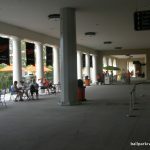 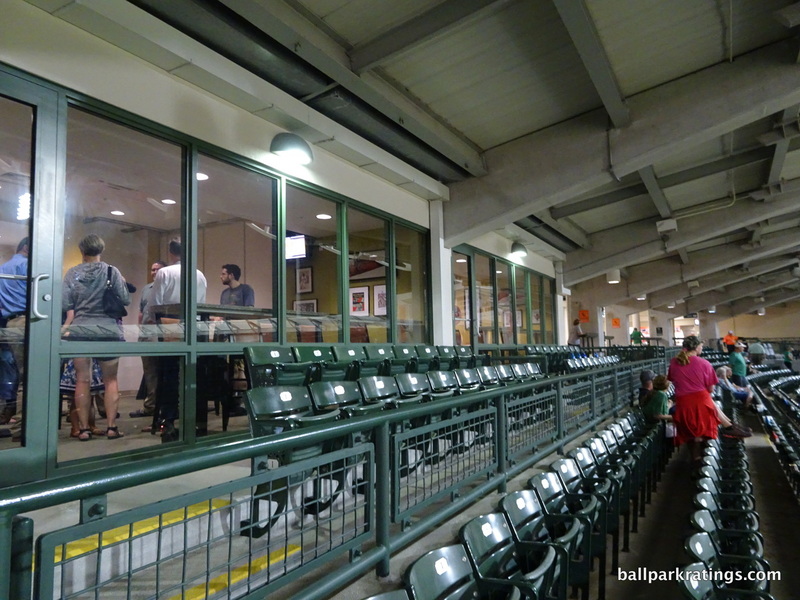 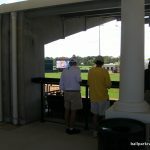 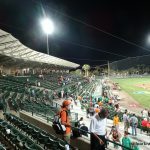 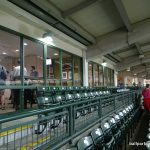 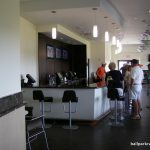 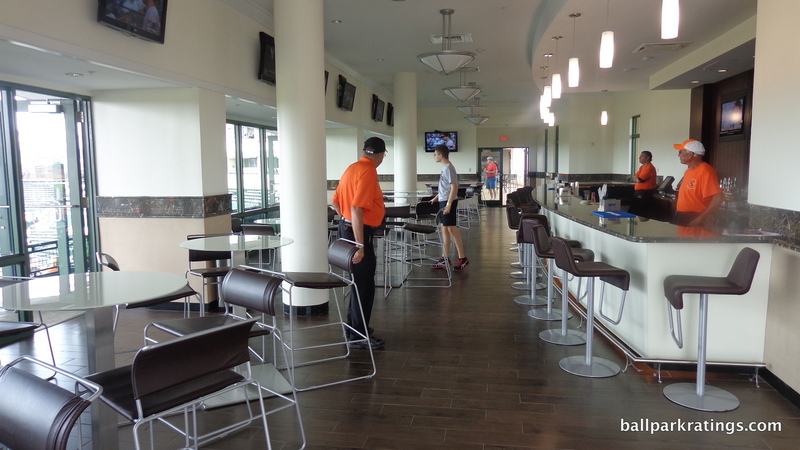 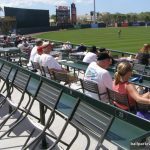 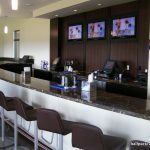 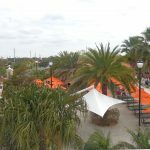 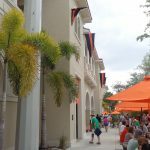 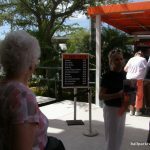 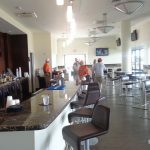 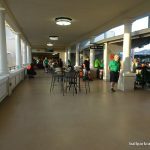 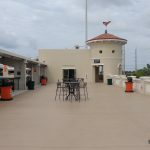 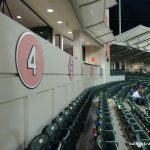 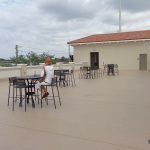 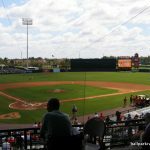 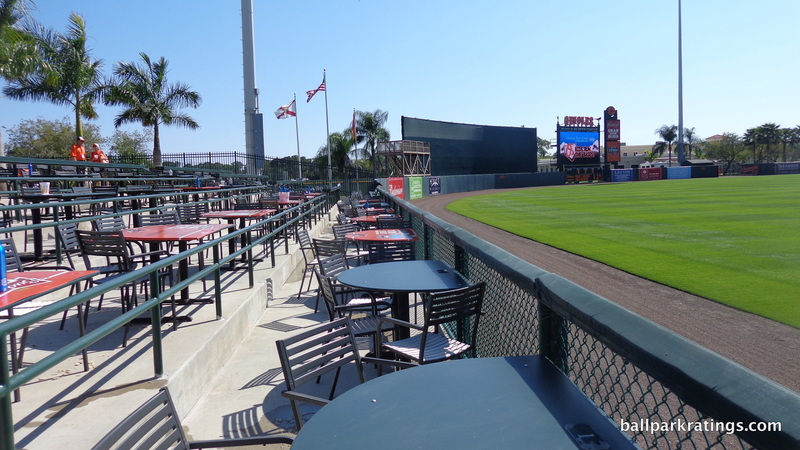 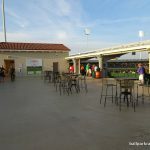 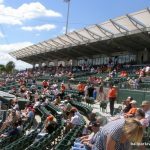 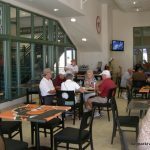 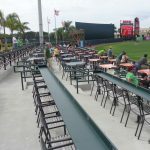 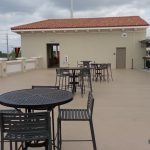 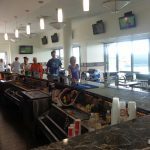 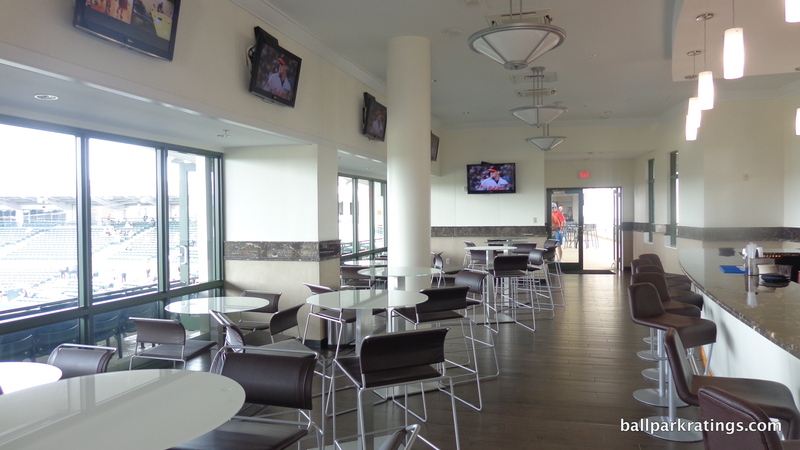 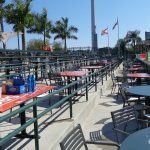 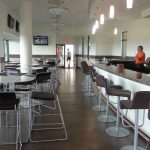 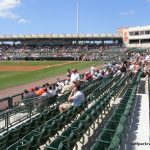 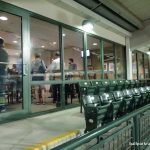 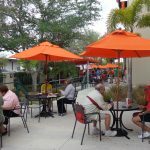 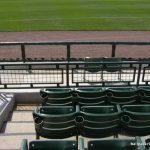 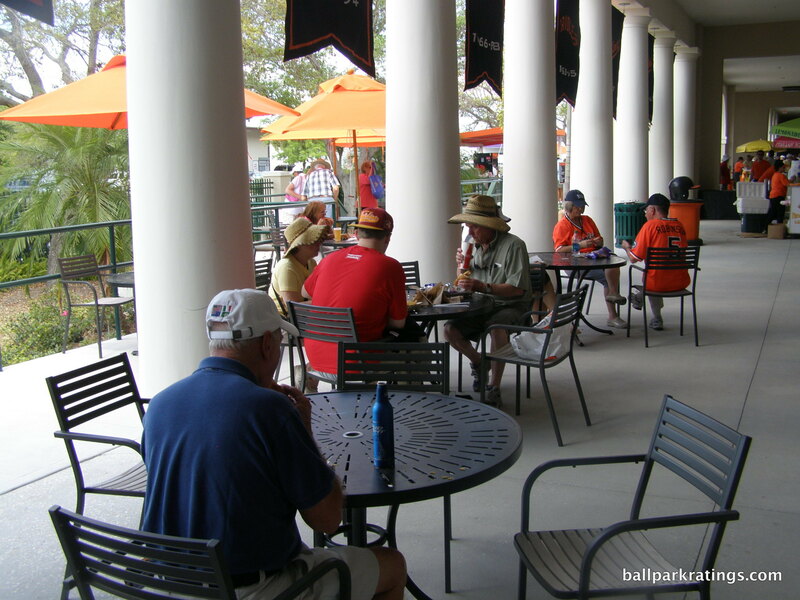 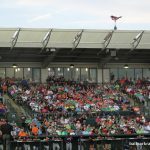 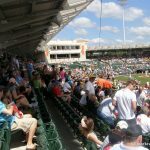 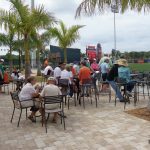 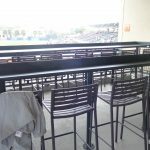 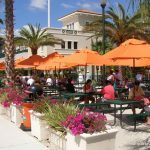 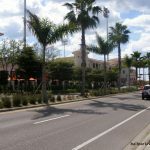 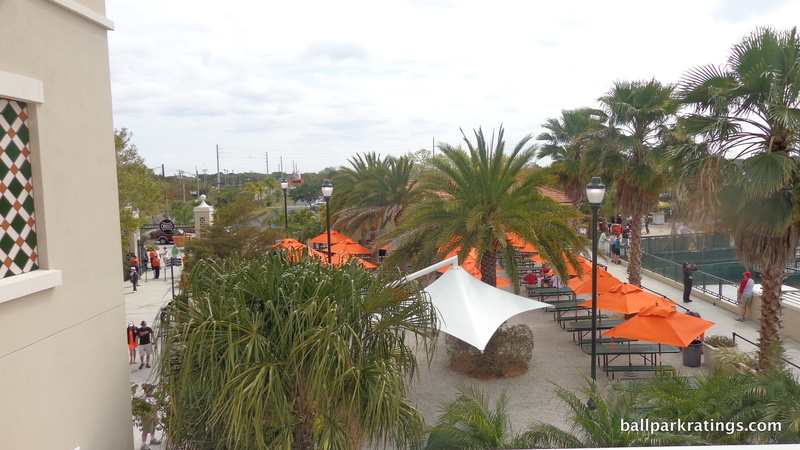 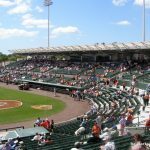 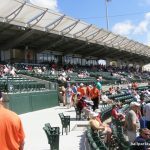 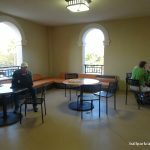 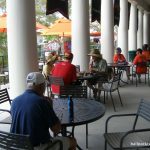 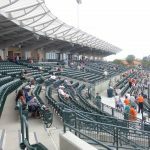 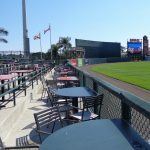 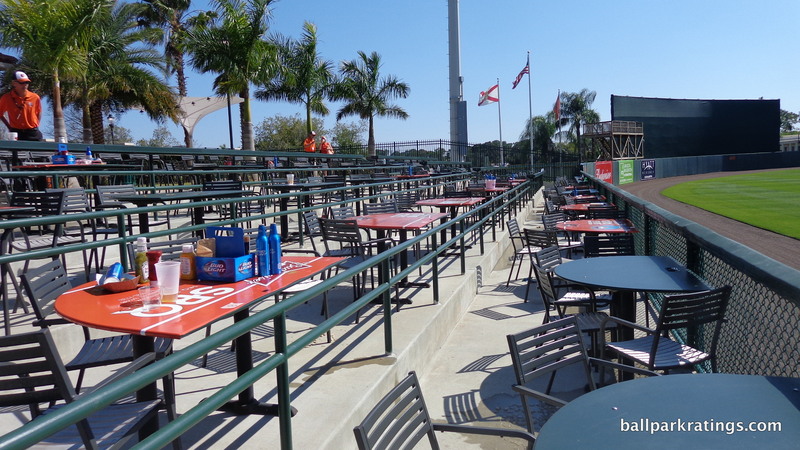 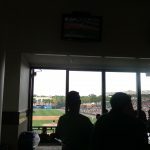 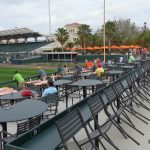 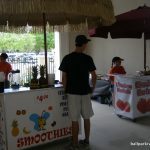 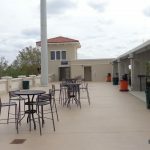 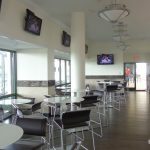 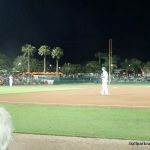 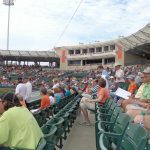 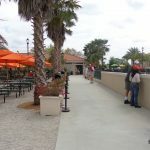 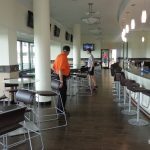 Despite not having a destination outfield bar like others in Florida, Ed Smith Stadium has a phenomenal array of dining spaces, sitting areas, and social spaces. 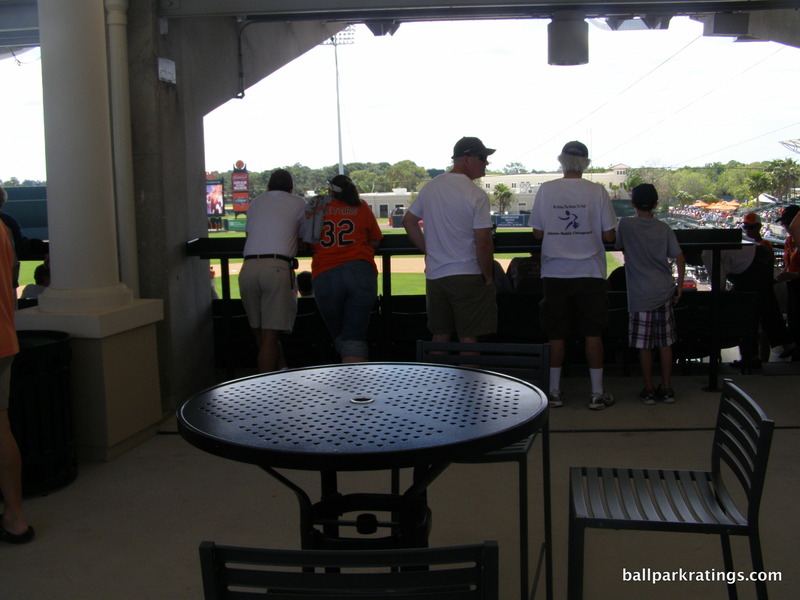 Even with a capacity crowd, you should be able to find a place to hang out. 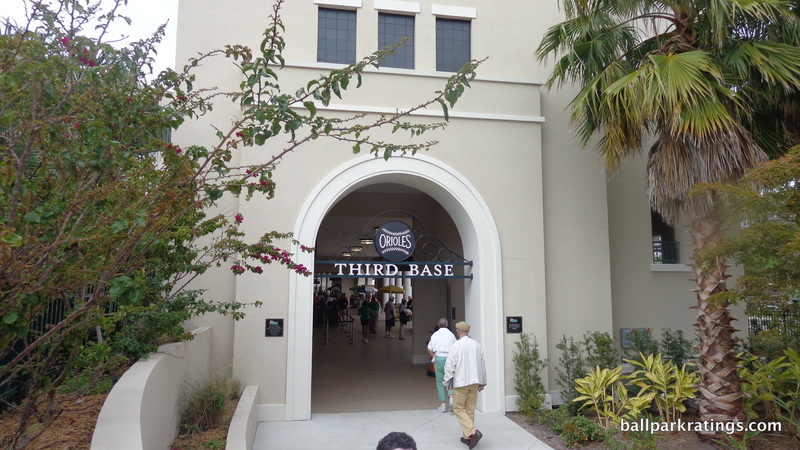 It ranks only behind Steinbrenner Field here. 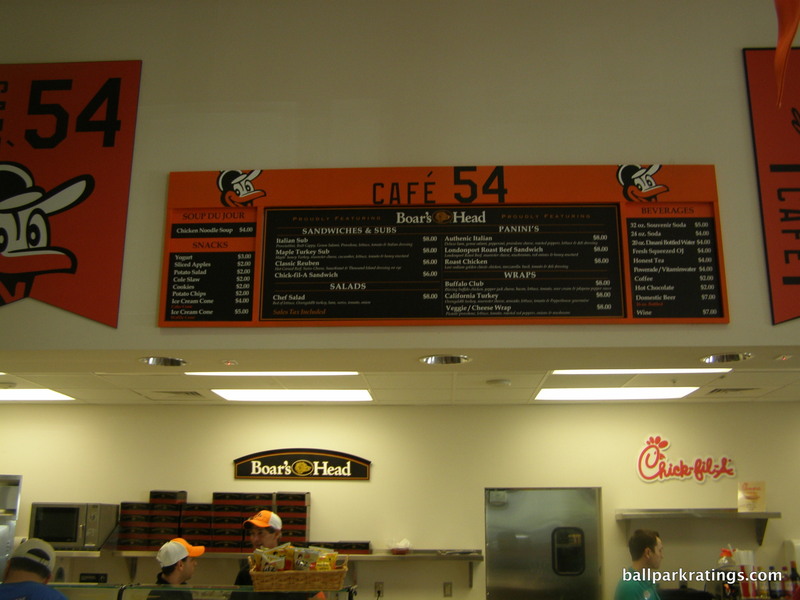 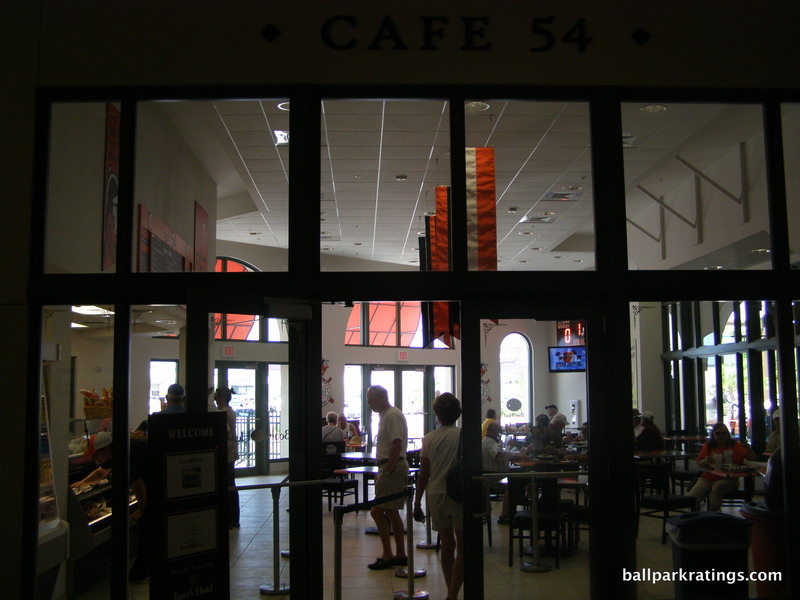 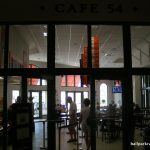 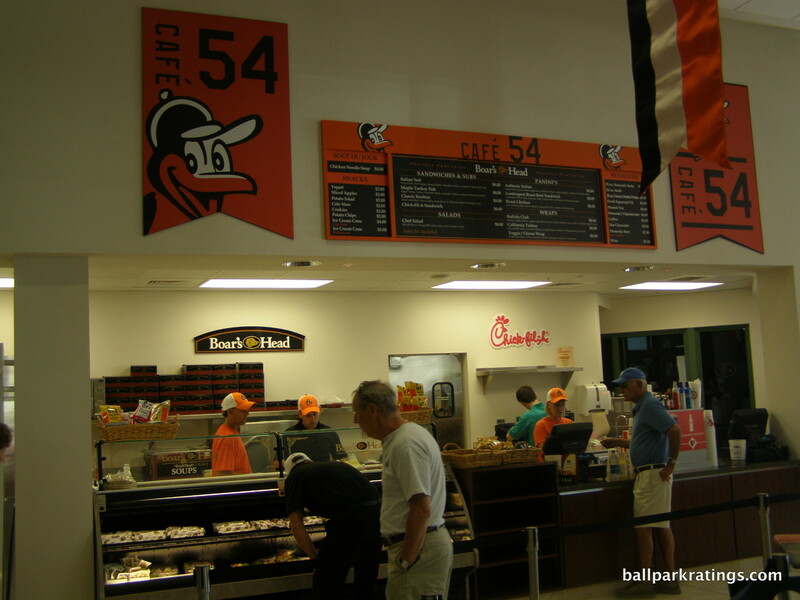 Named after the Orioles’ first year in Baltimore, Café 54 is the park’s primary destination. 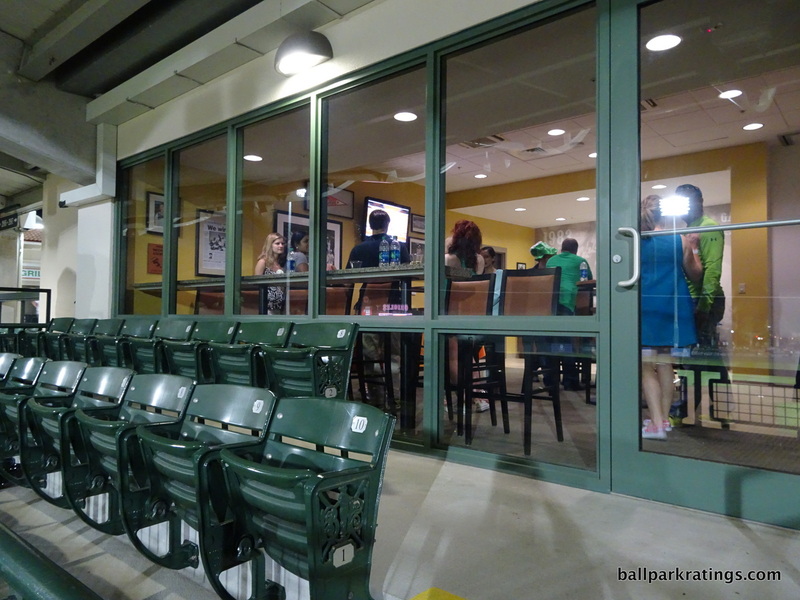 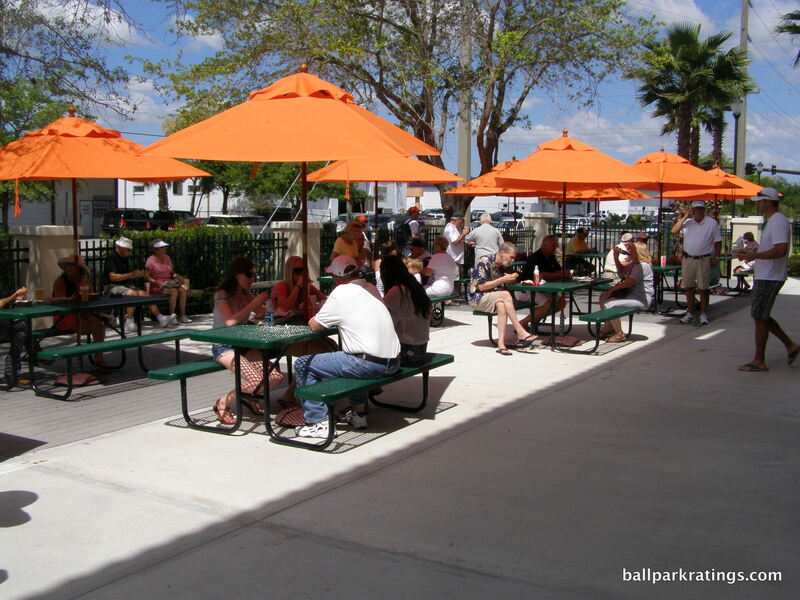 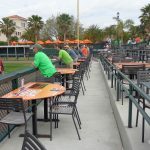 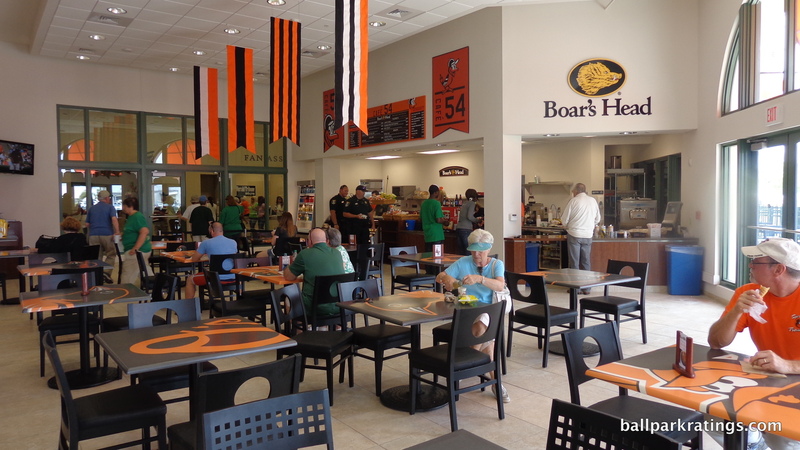 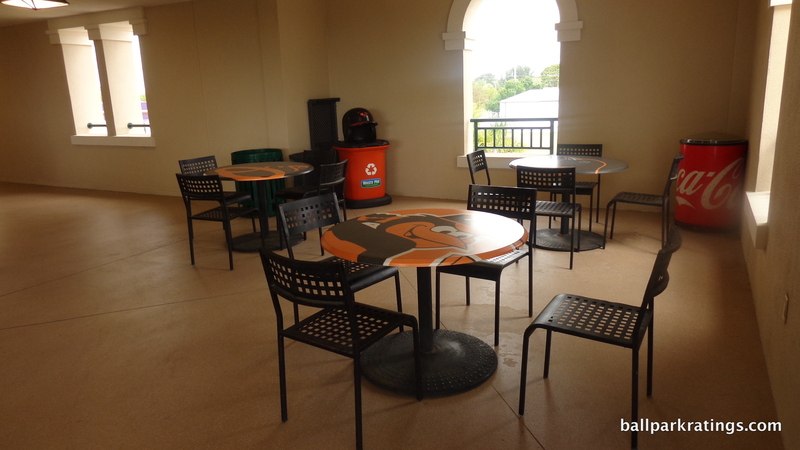 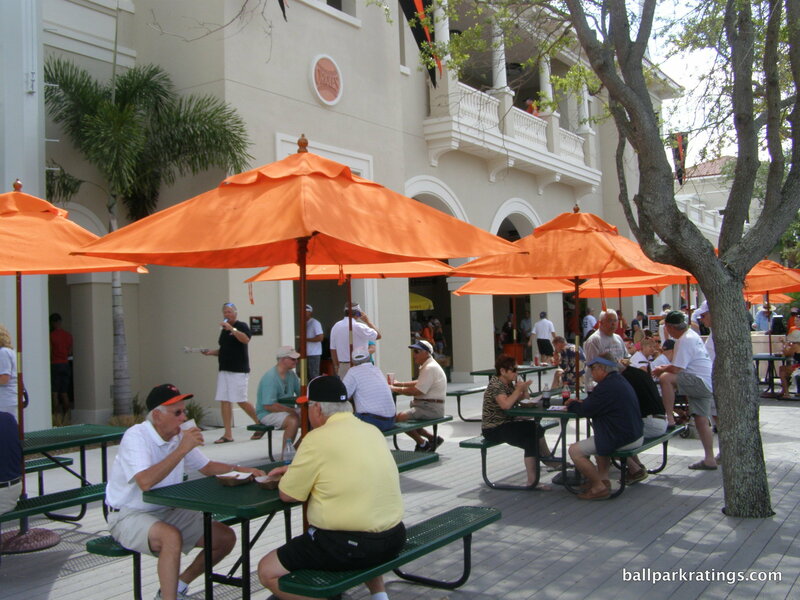 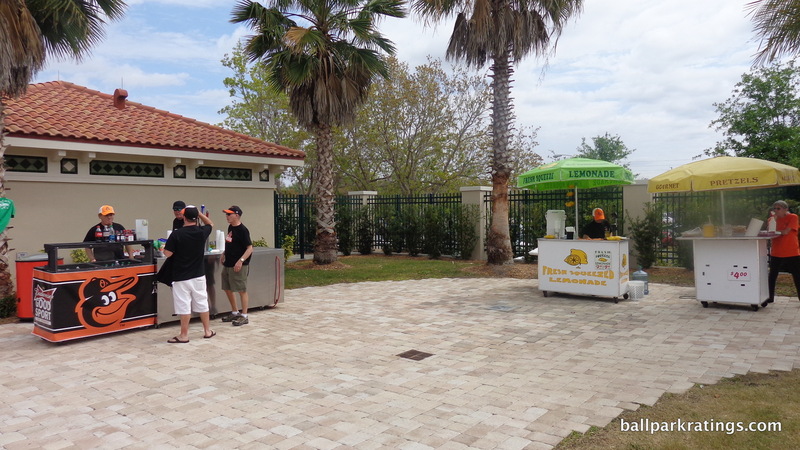 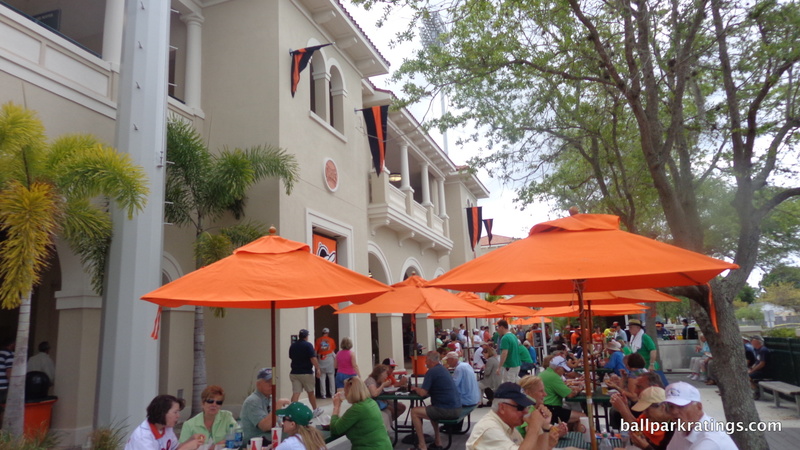 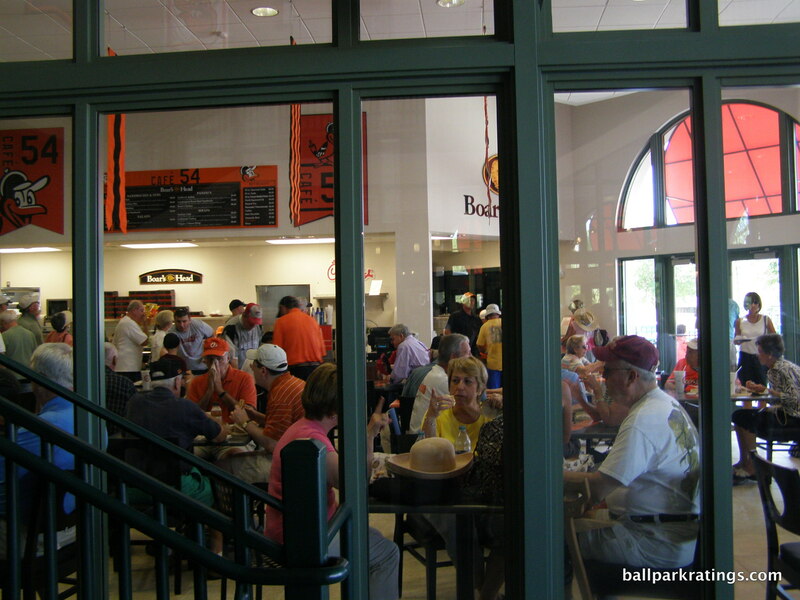 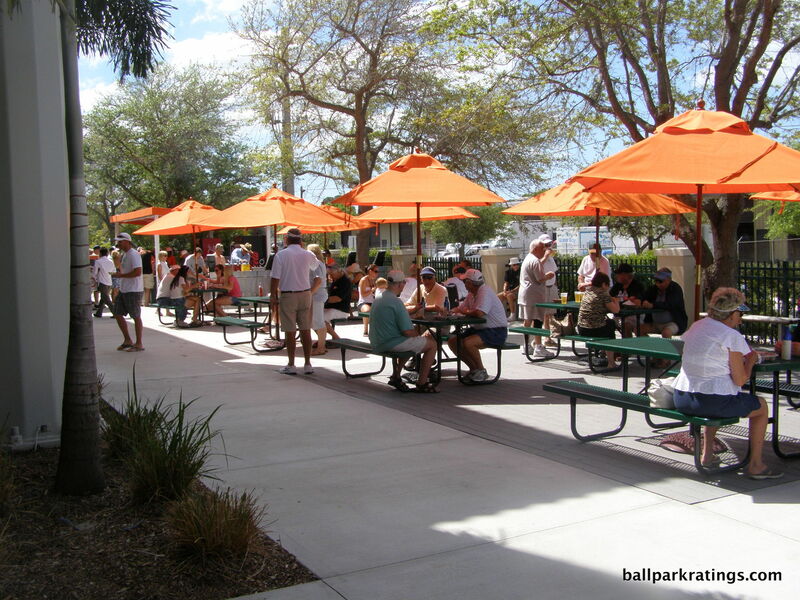 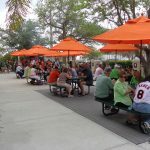 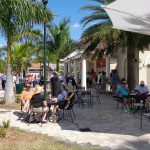 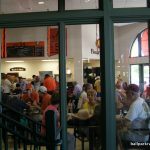 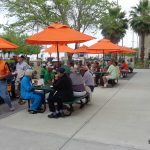 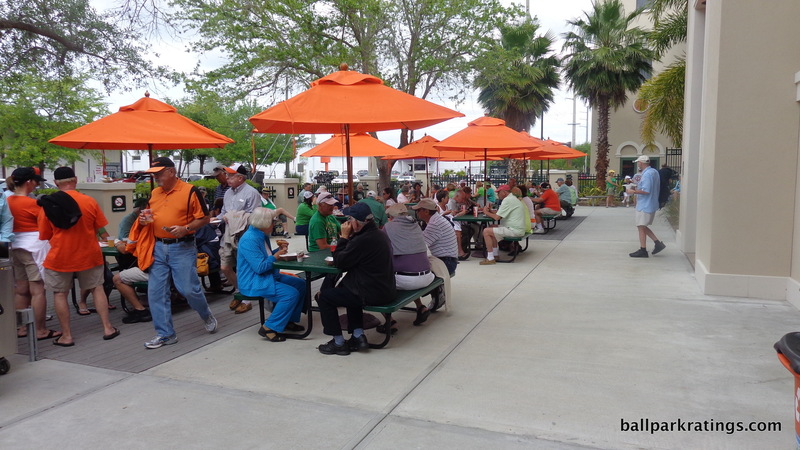 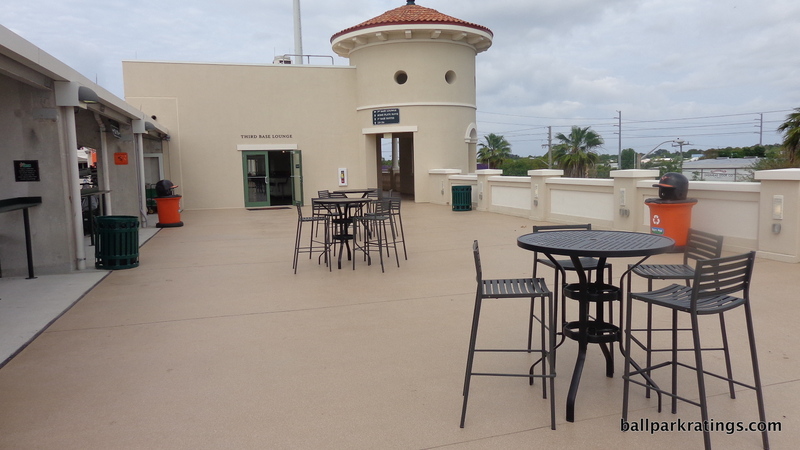 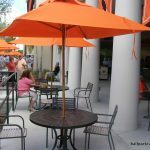 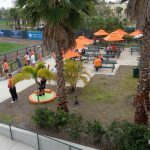 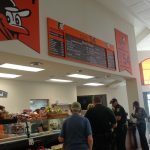 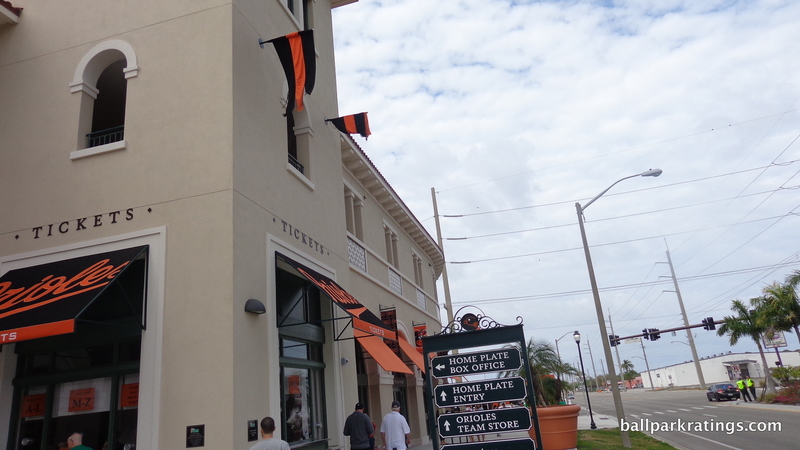 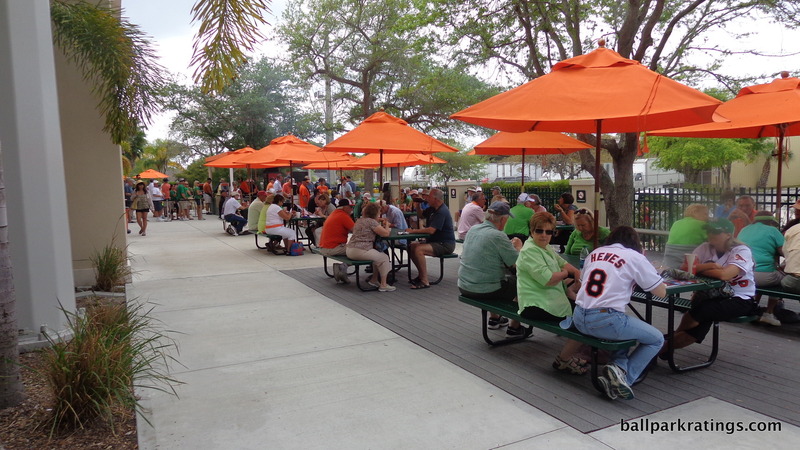 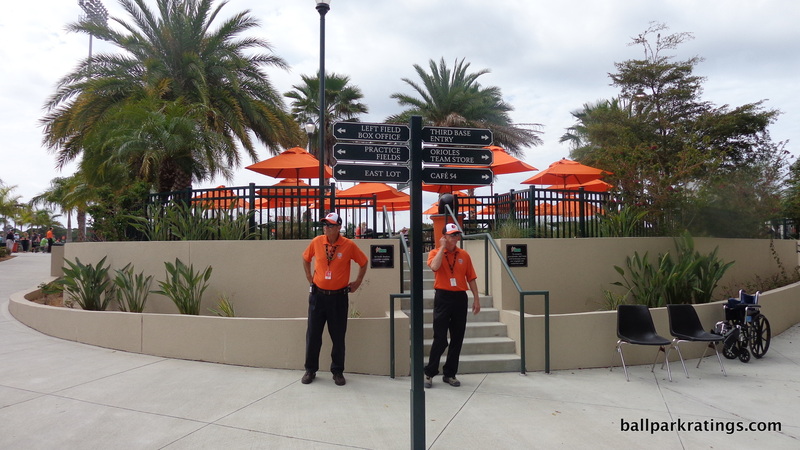 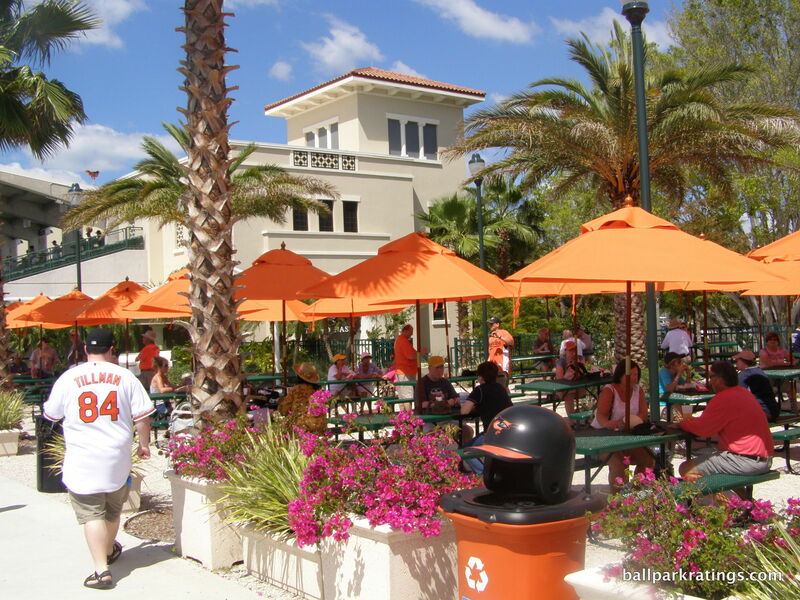 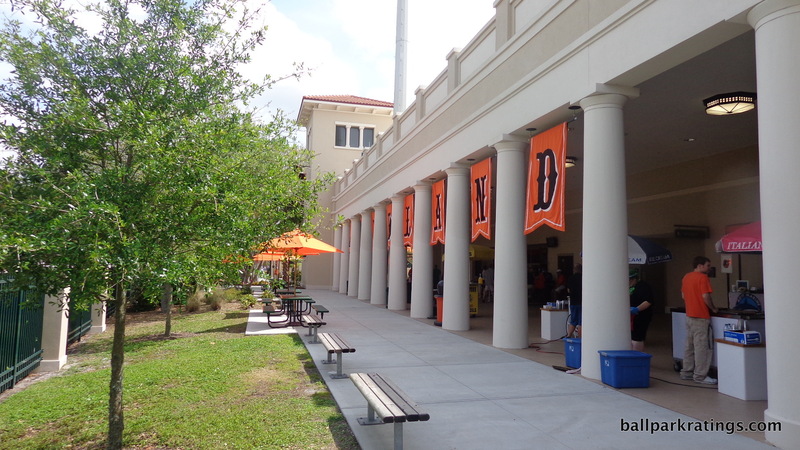 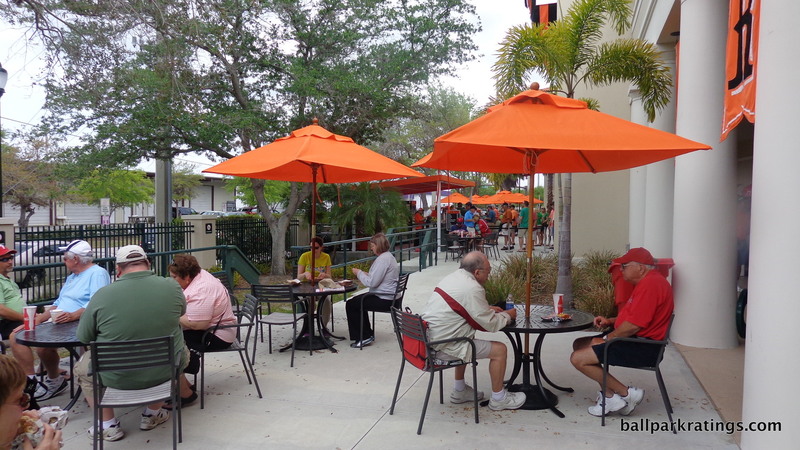 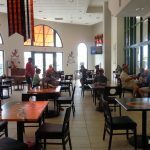 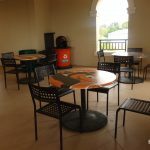 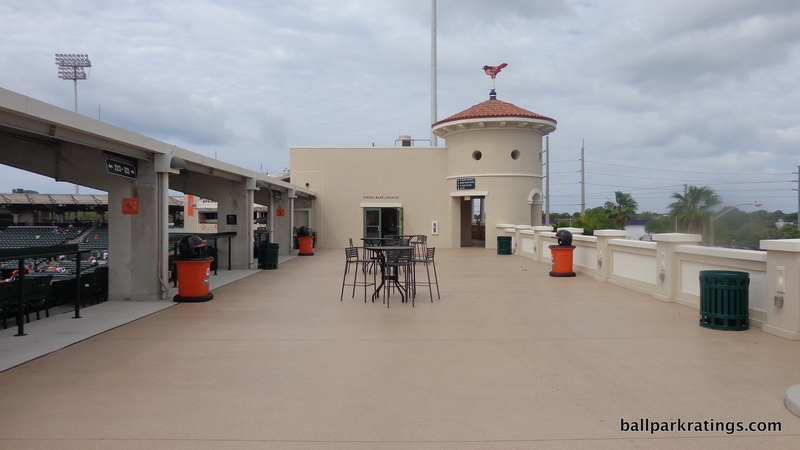 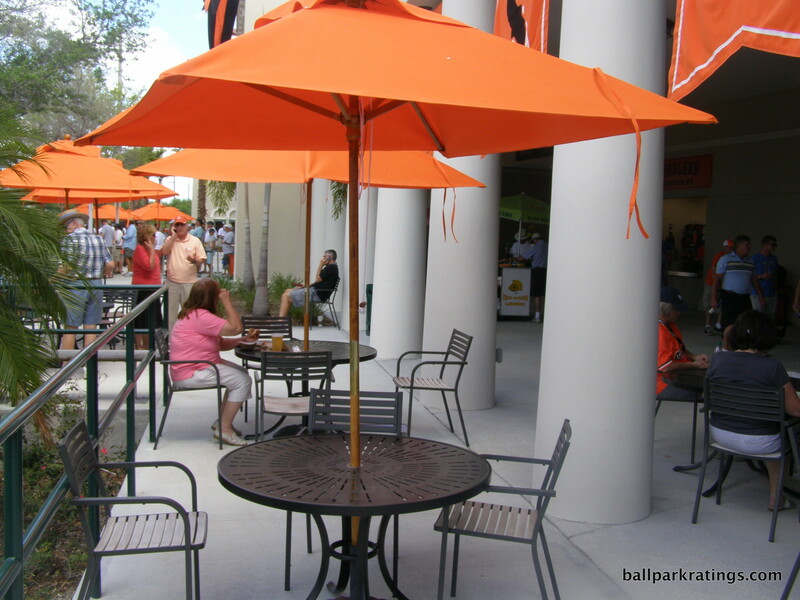 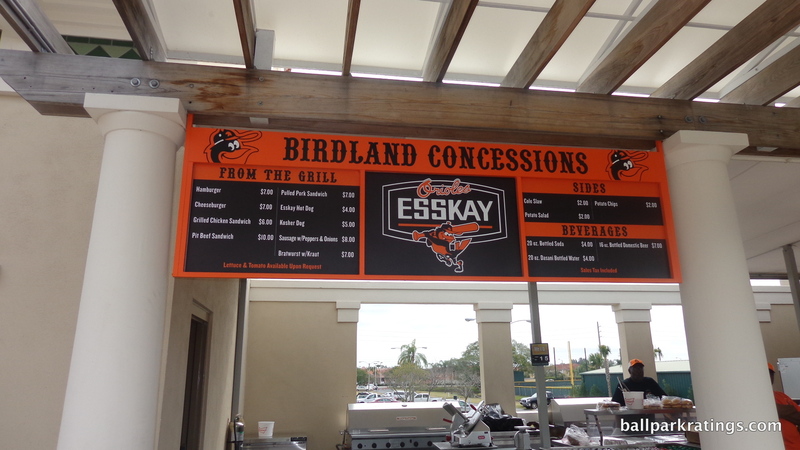 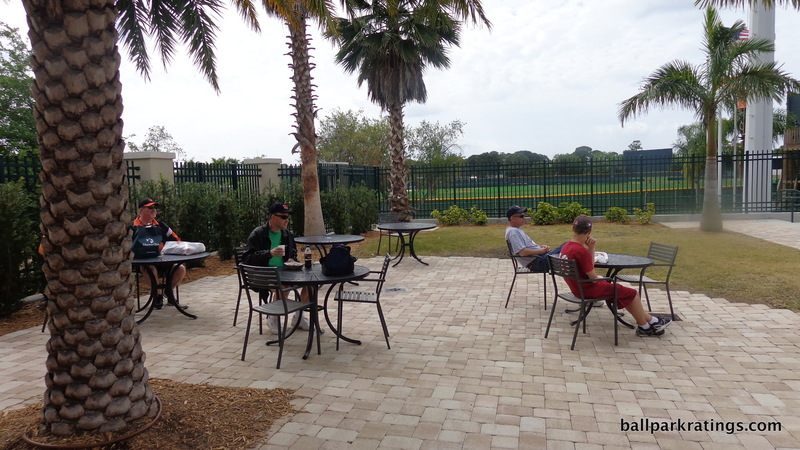 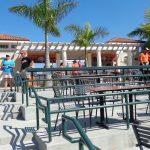 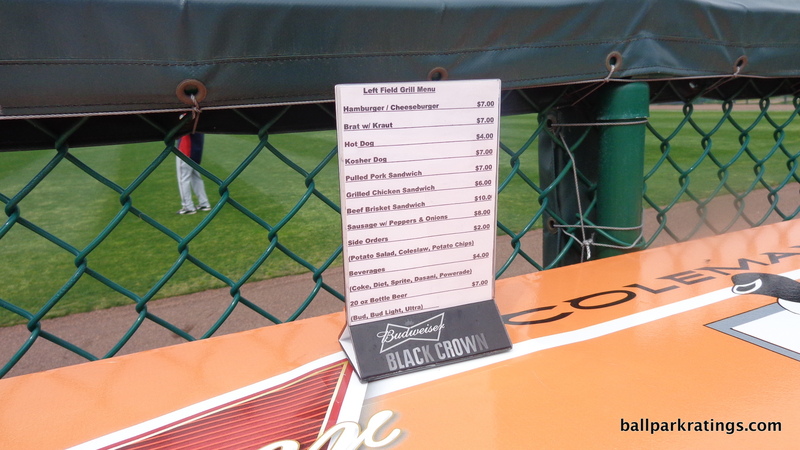 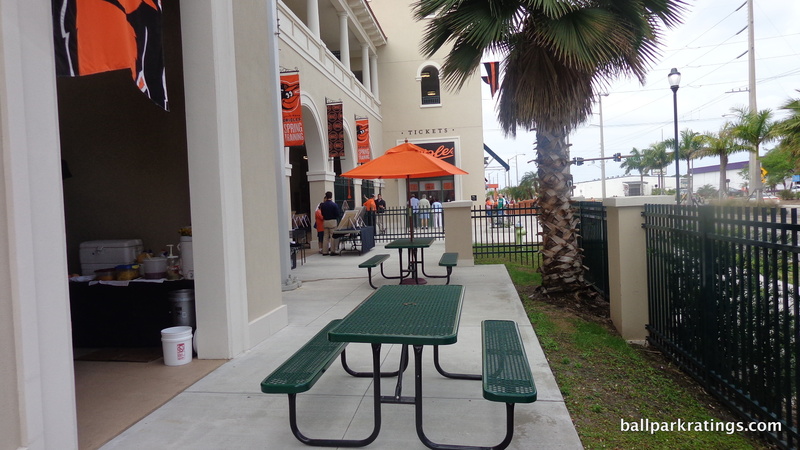 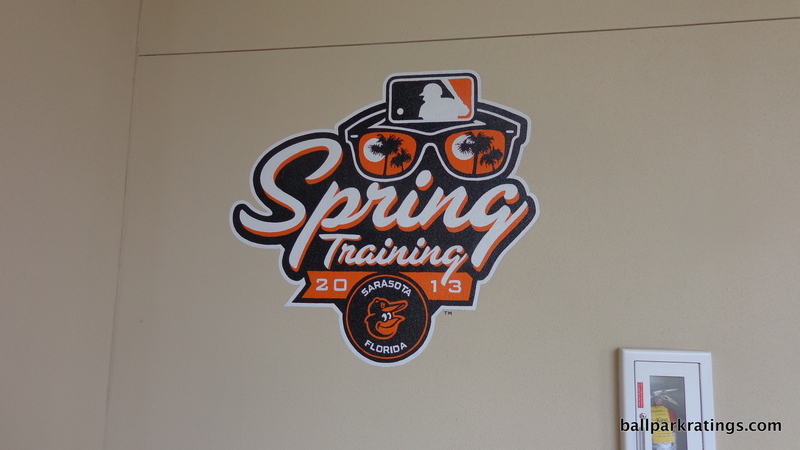 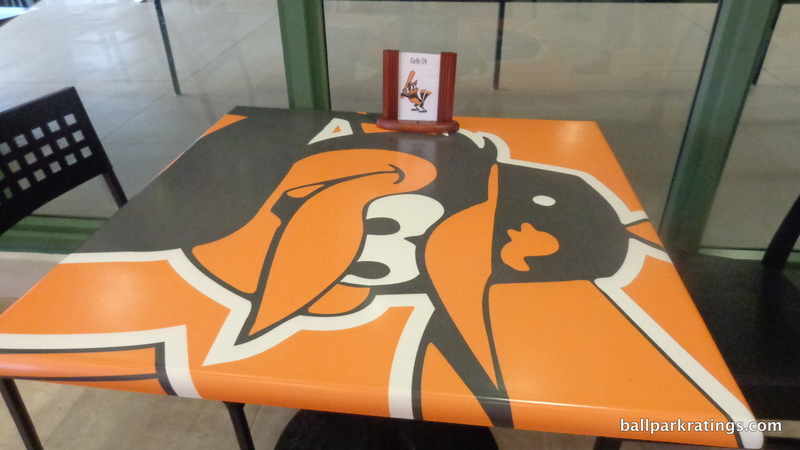 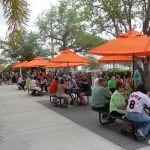 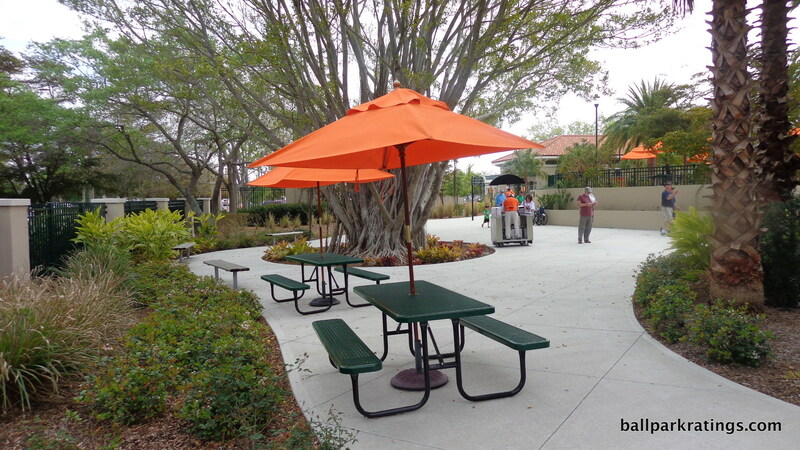 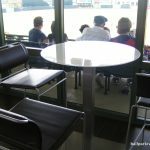 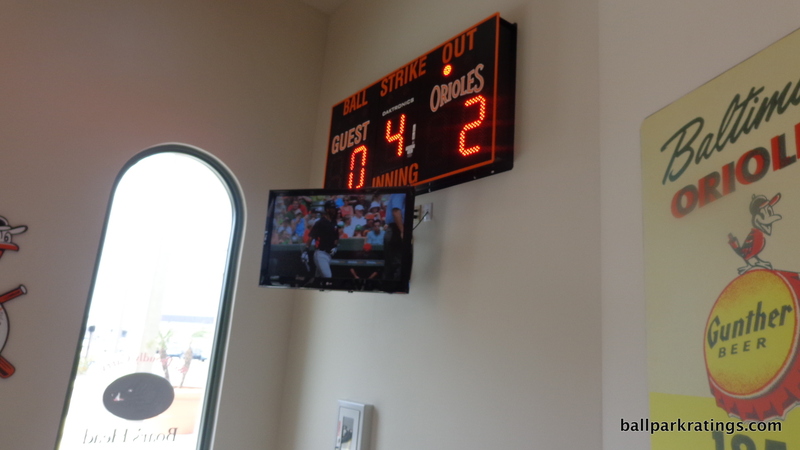 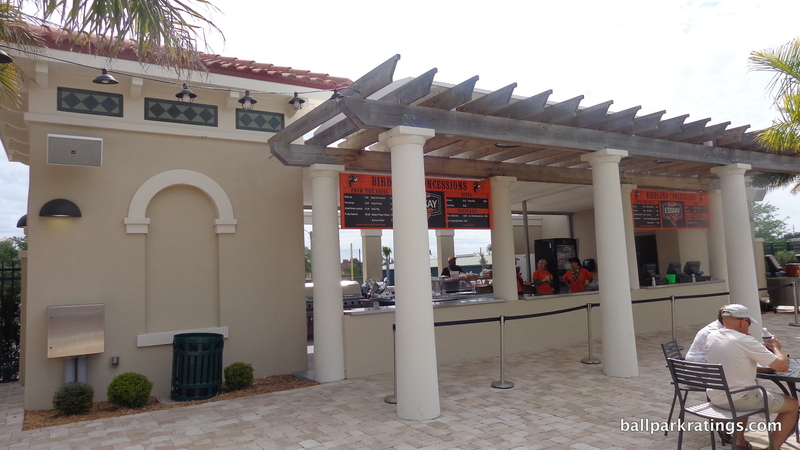 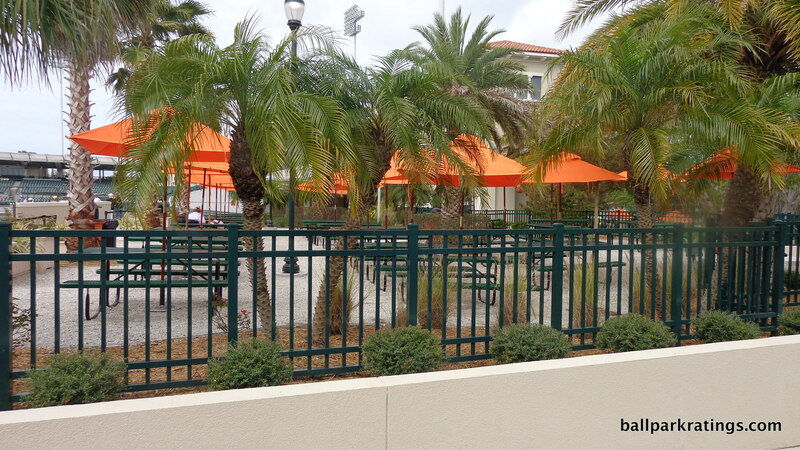 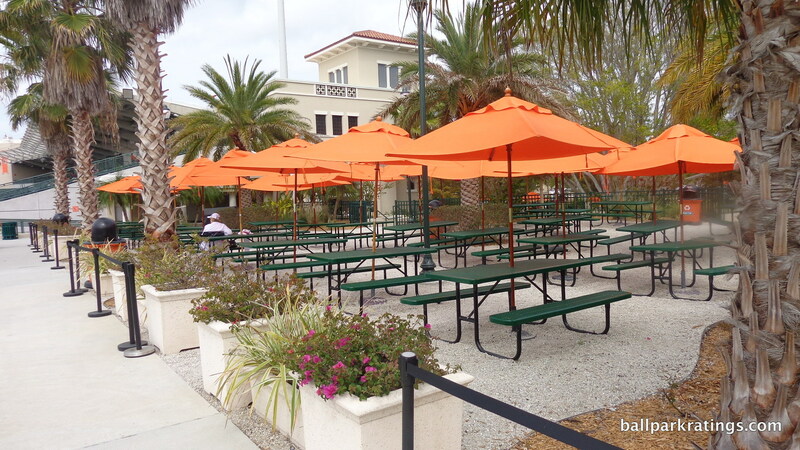 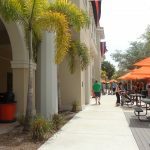 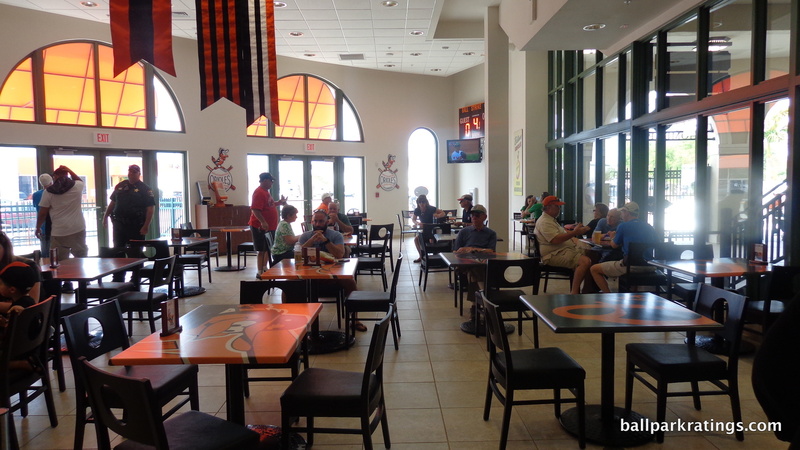 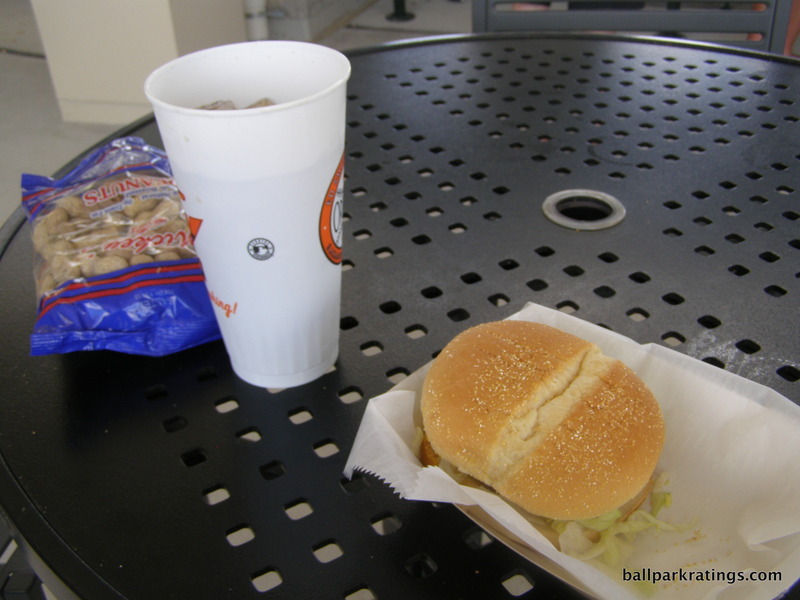 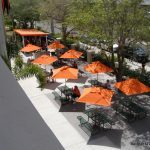 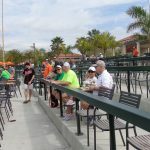 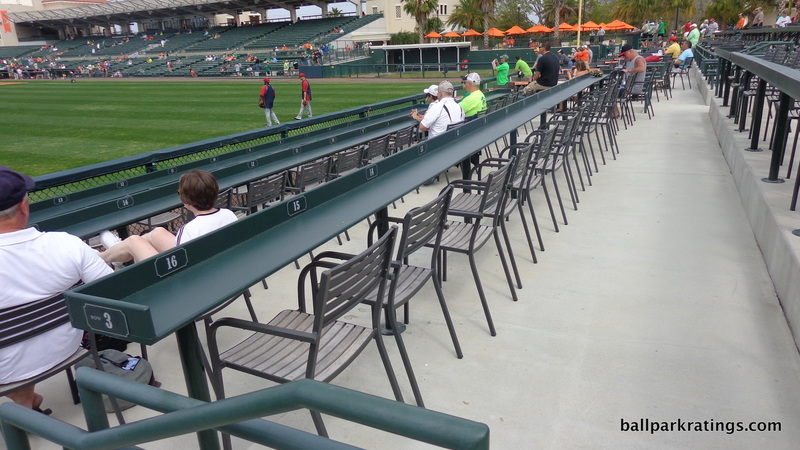 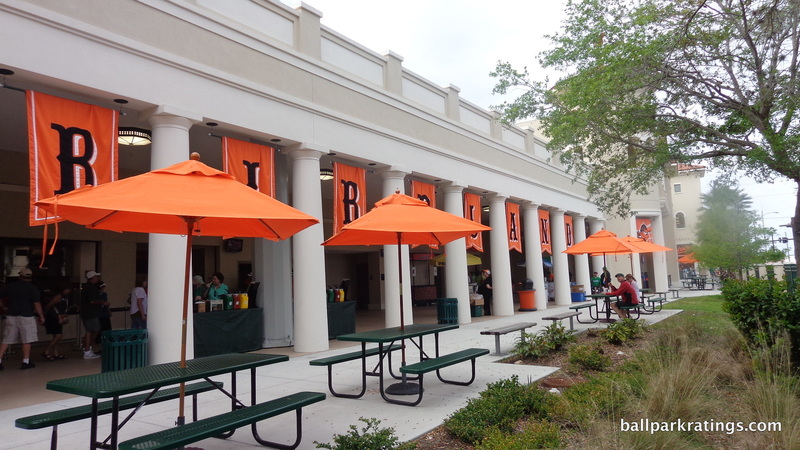 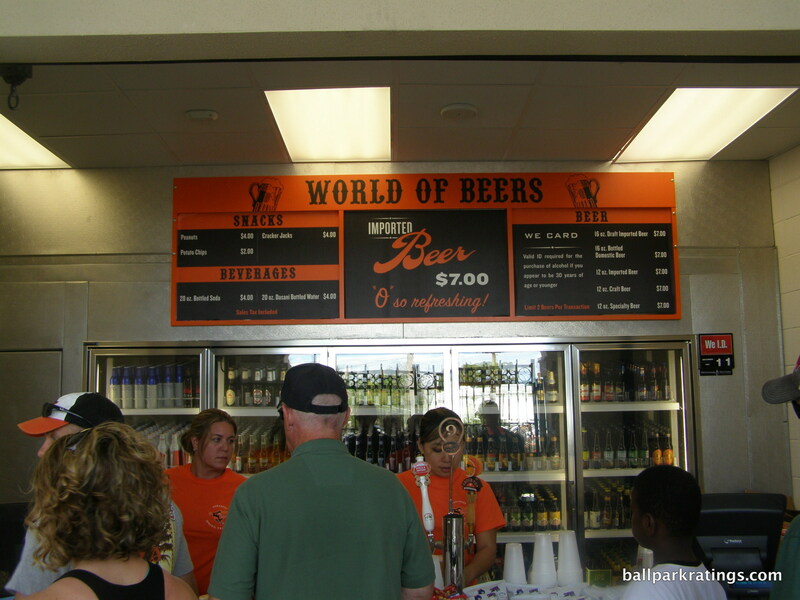 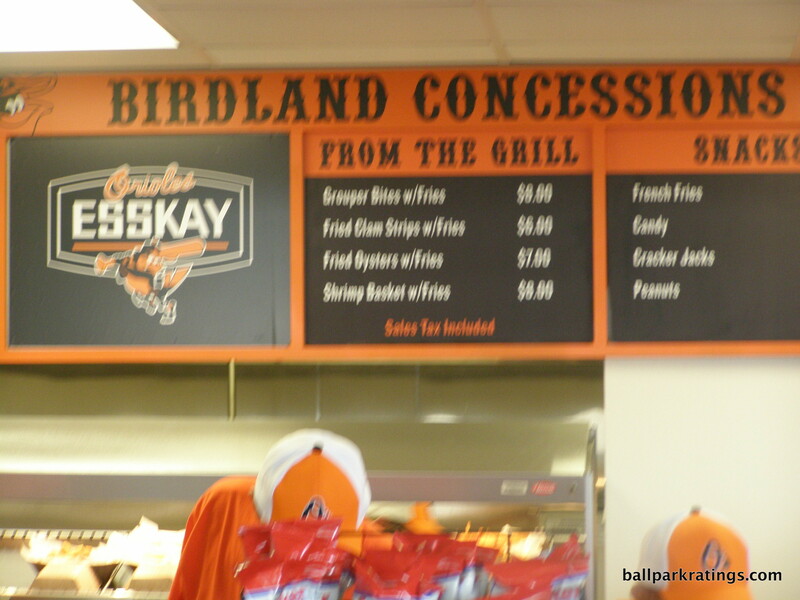 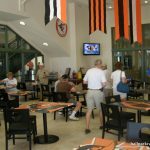 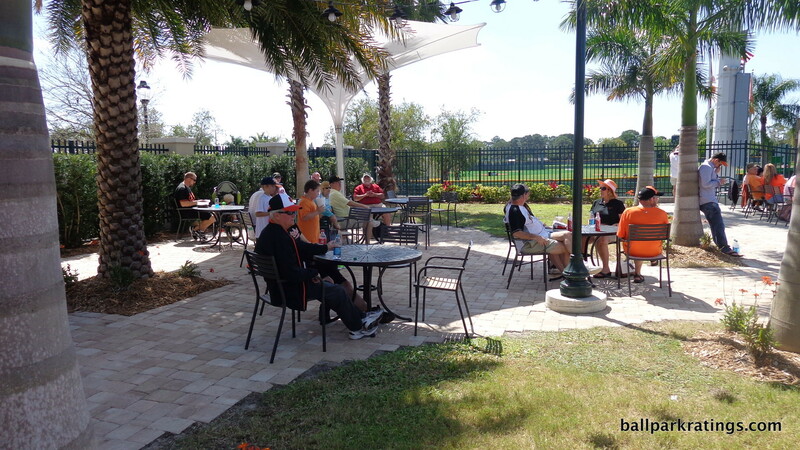 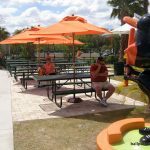 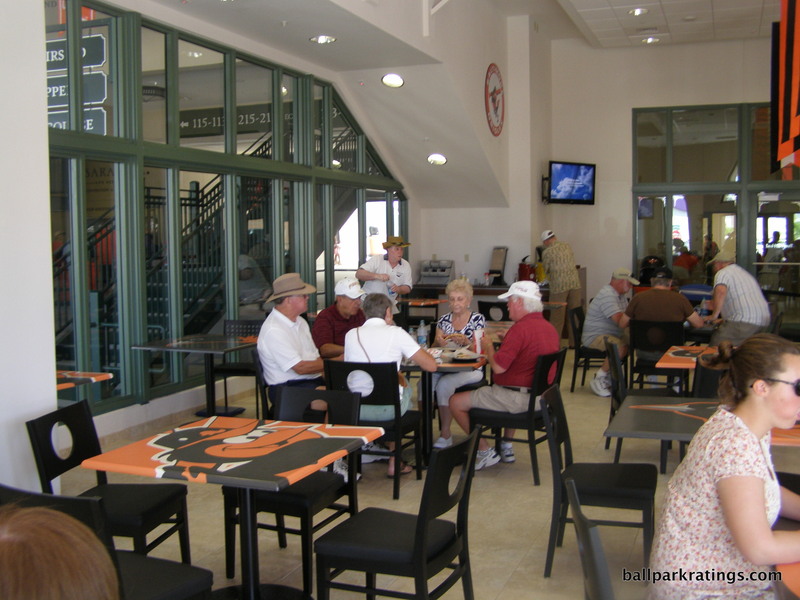 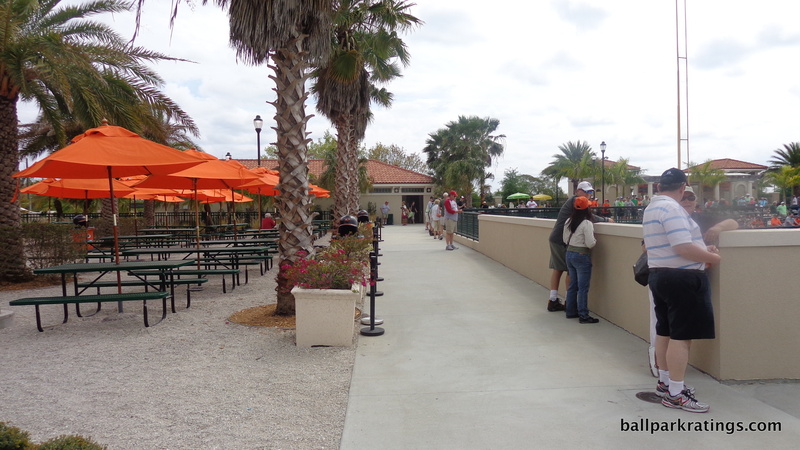 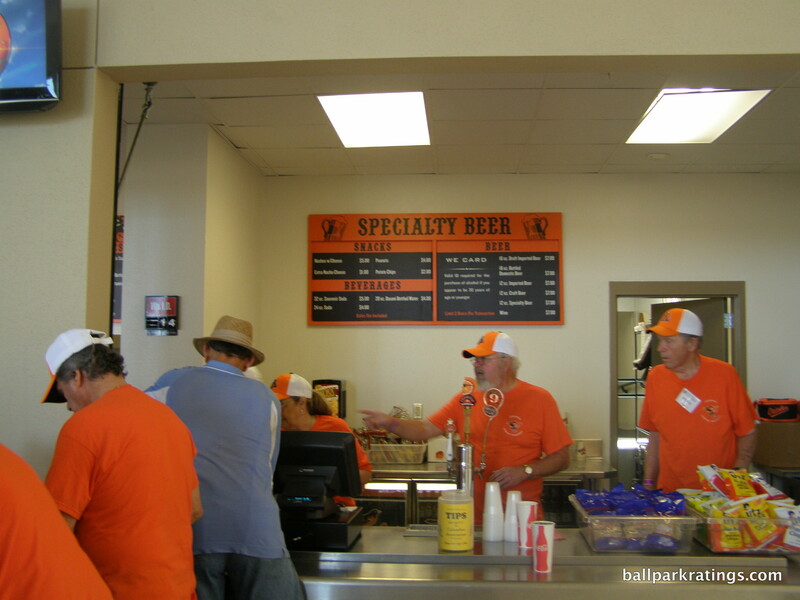 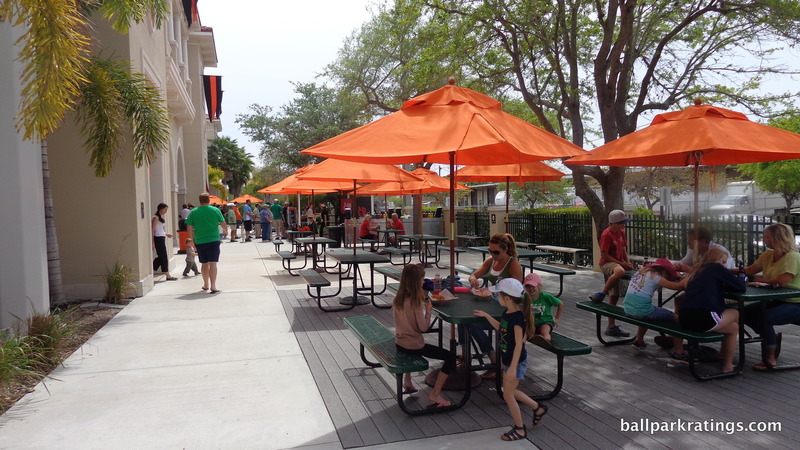 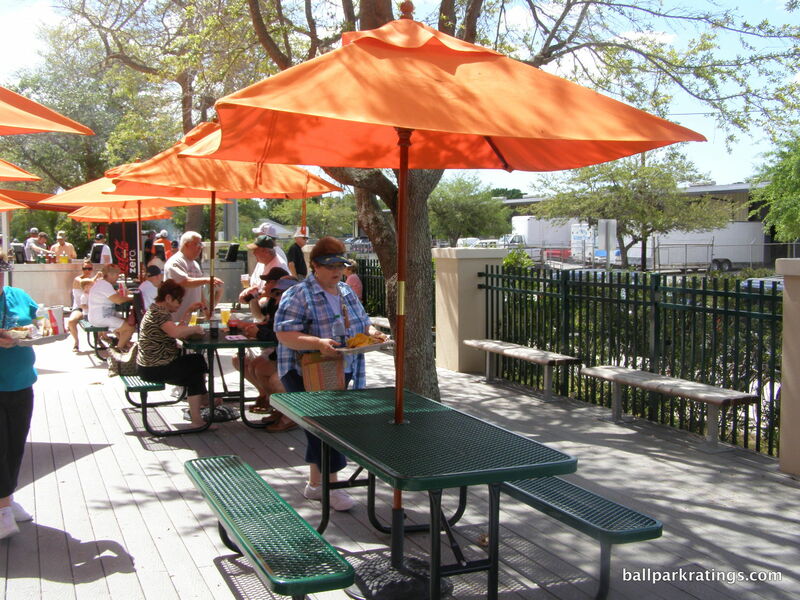 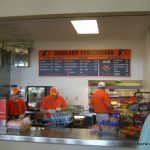 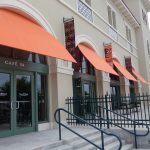 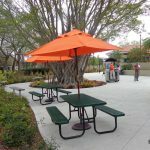 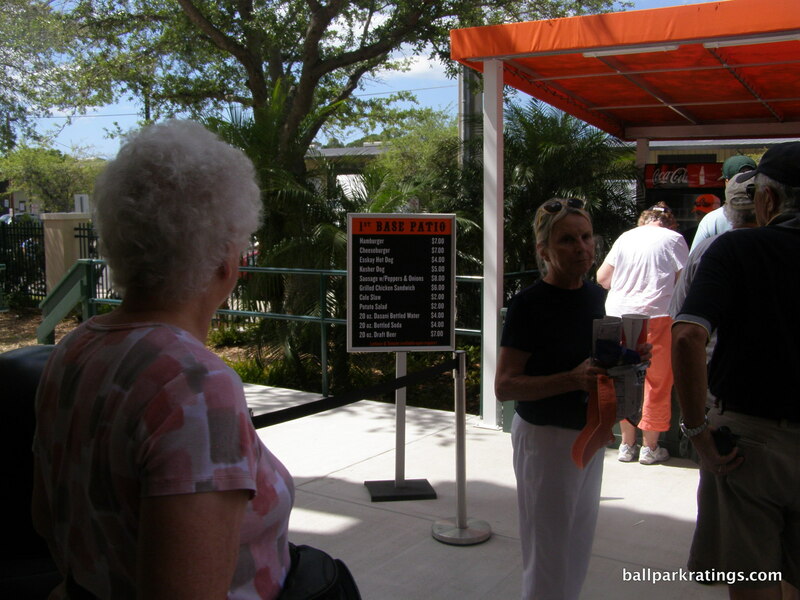 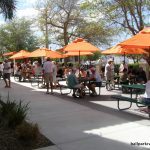 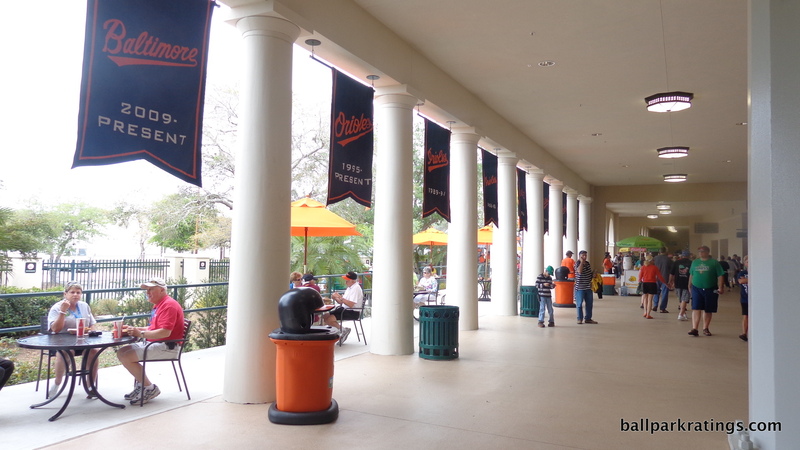 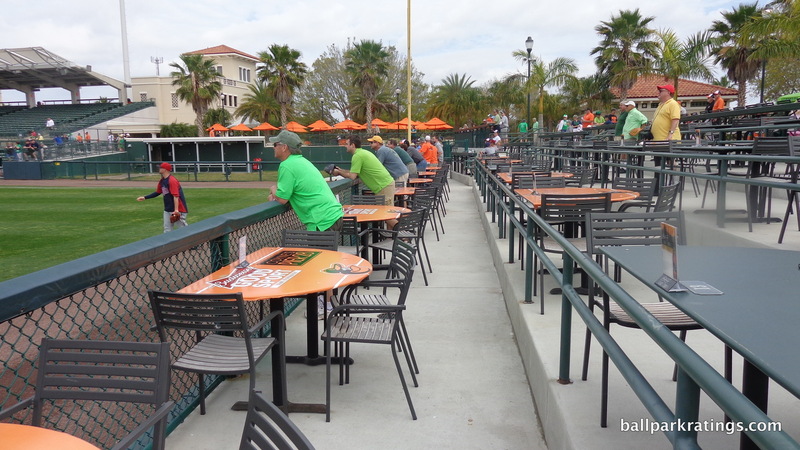 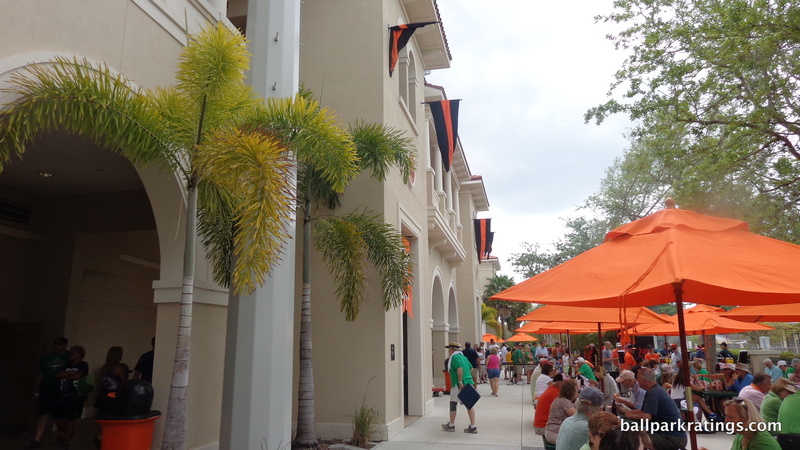 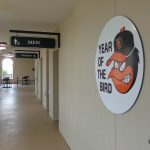 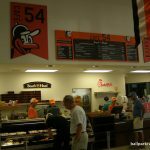 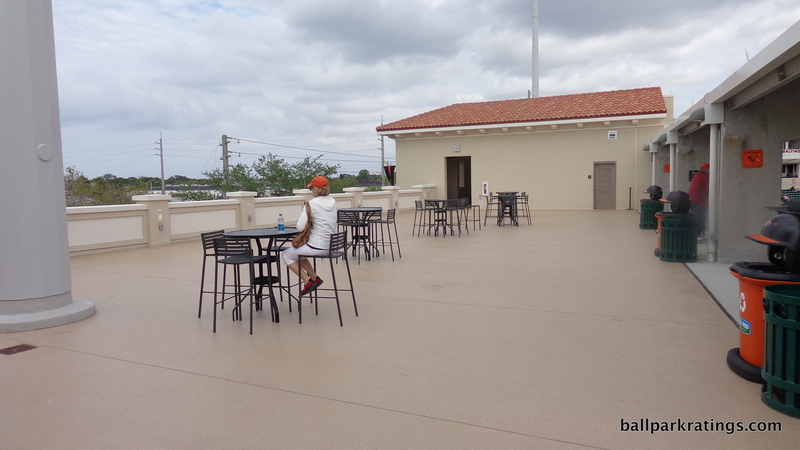 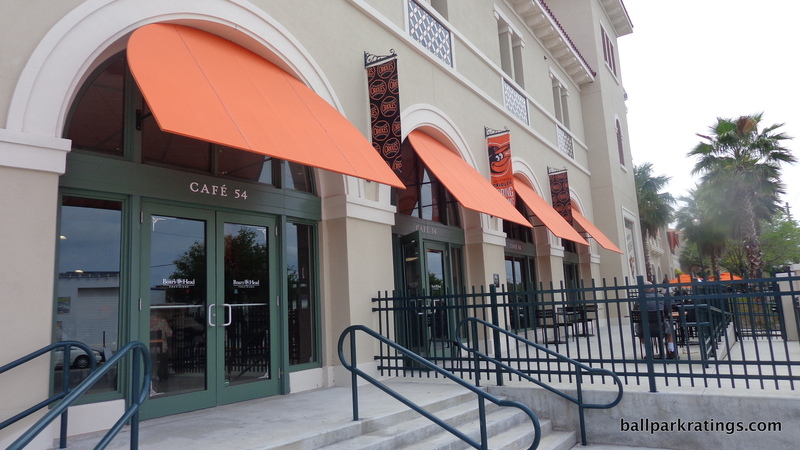 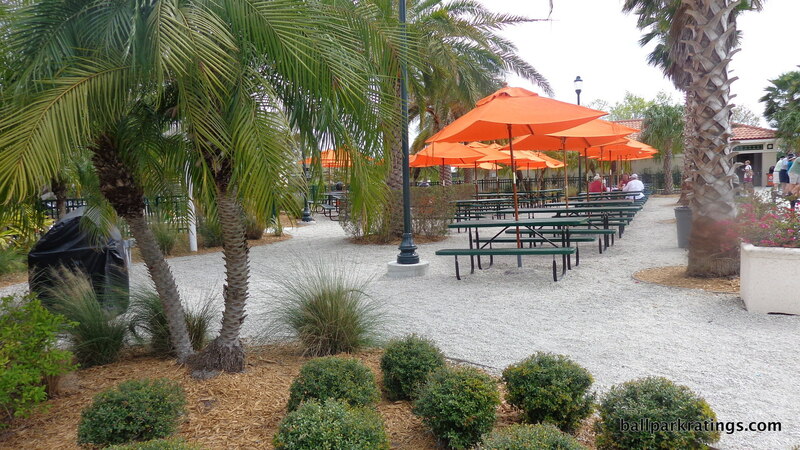 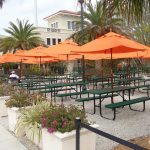 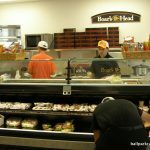 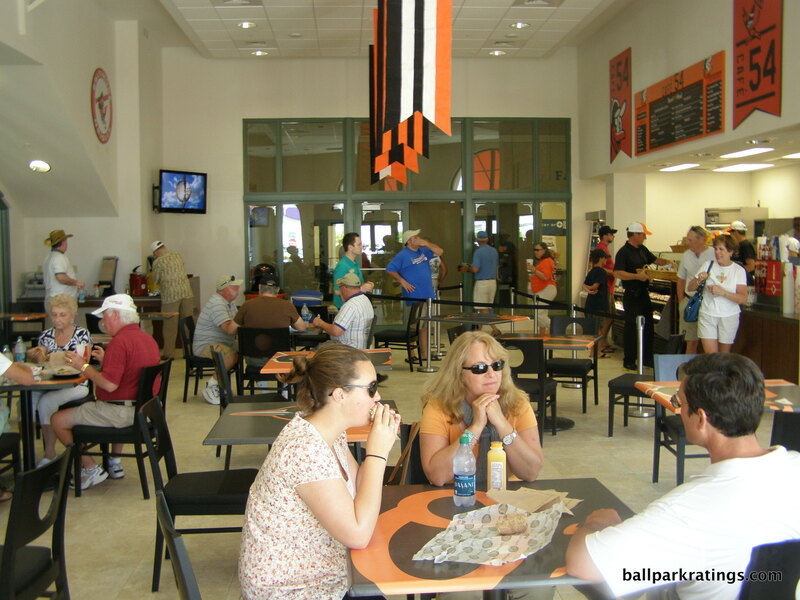 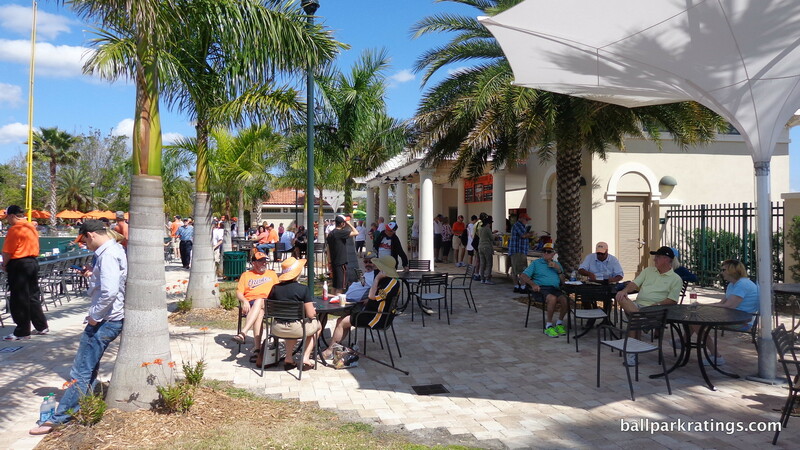 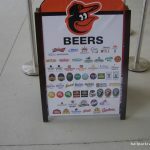 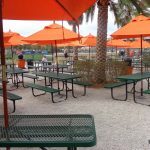 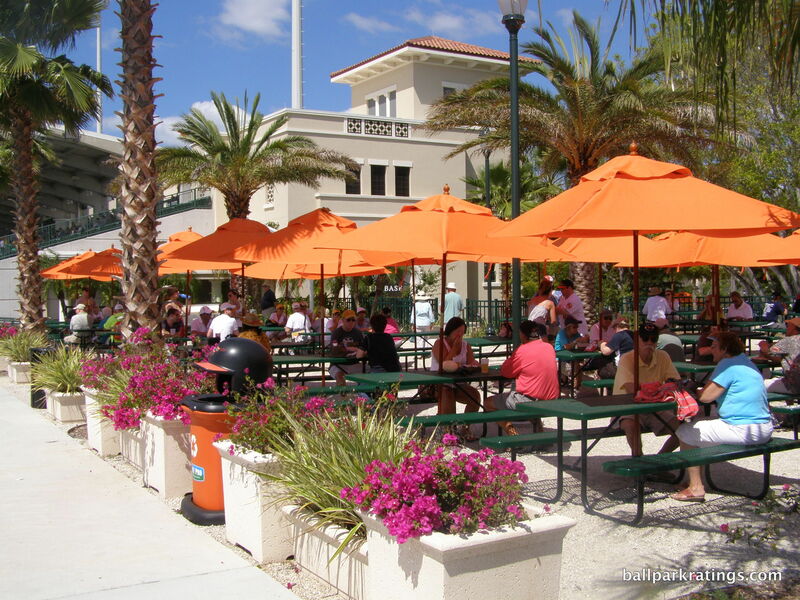 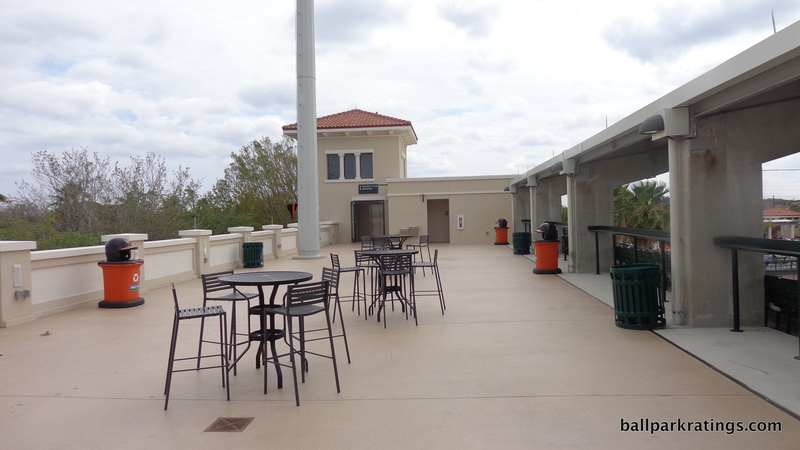 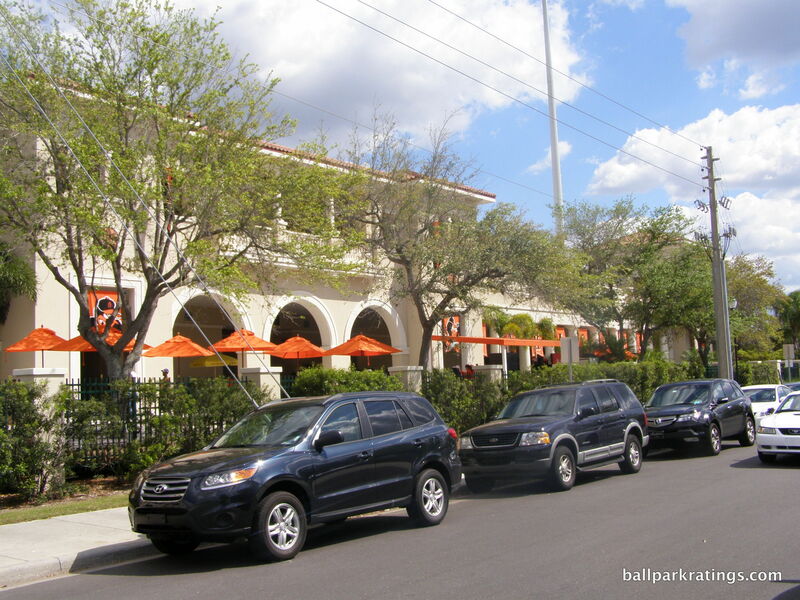 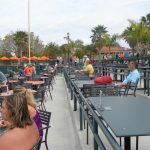 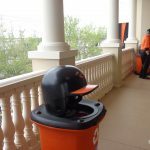 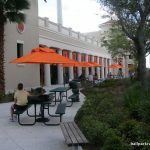 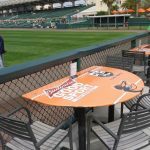 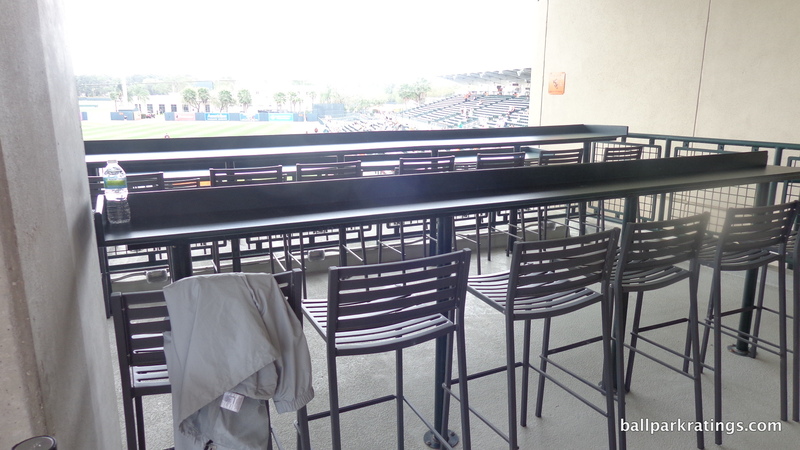 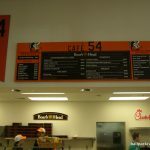 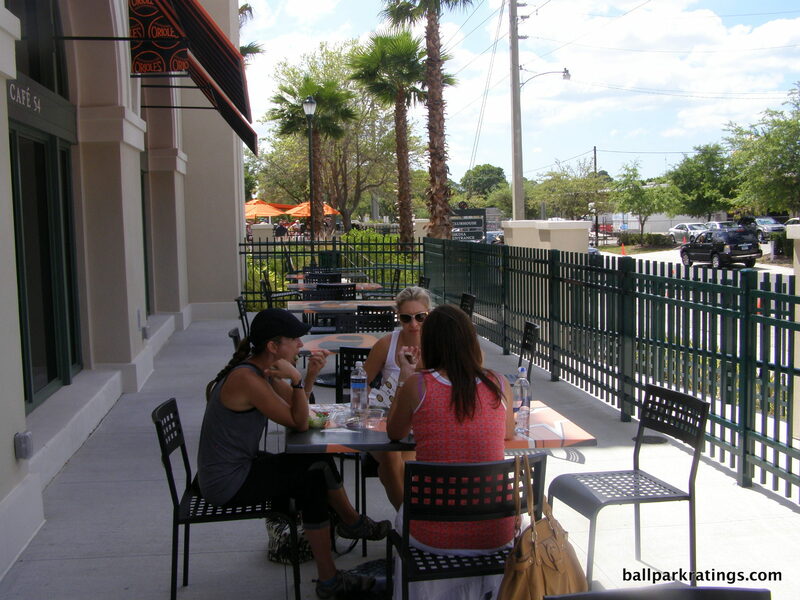 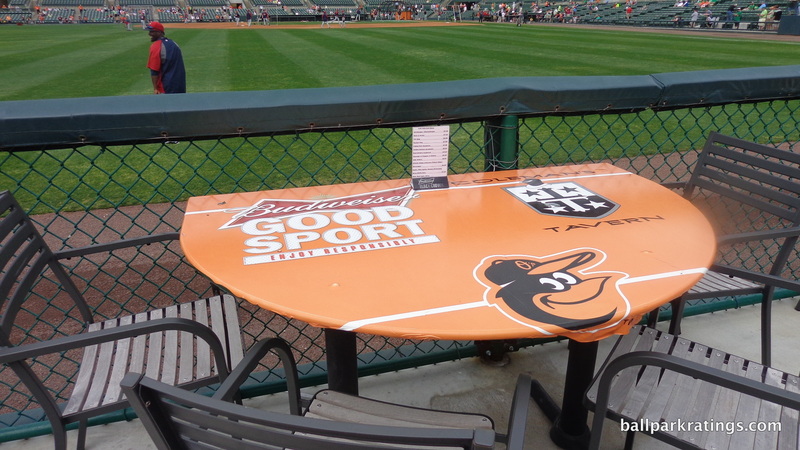 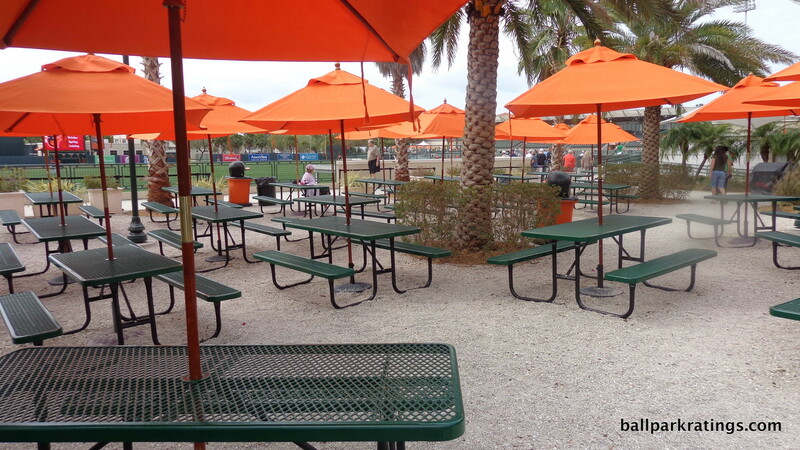 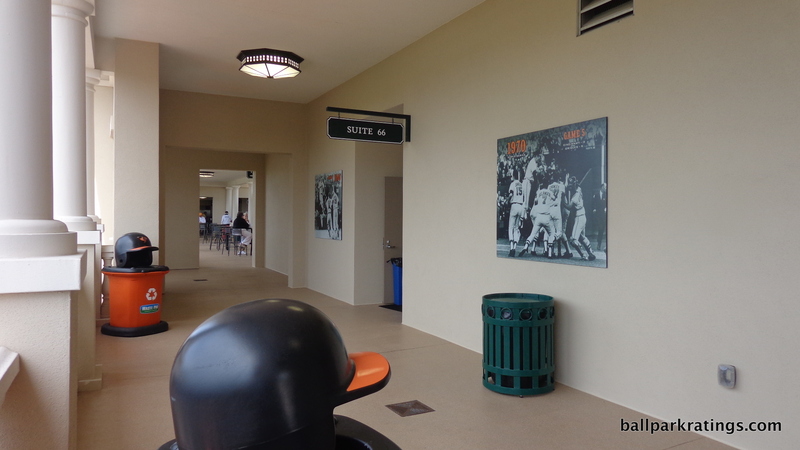 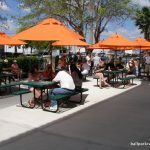 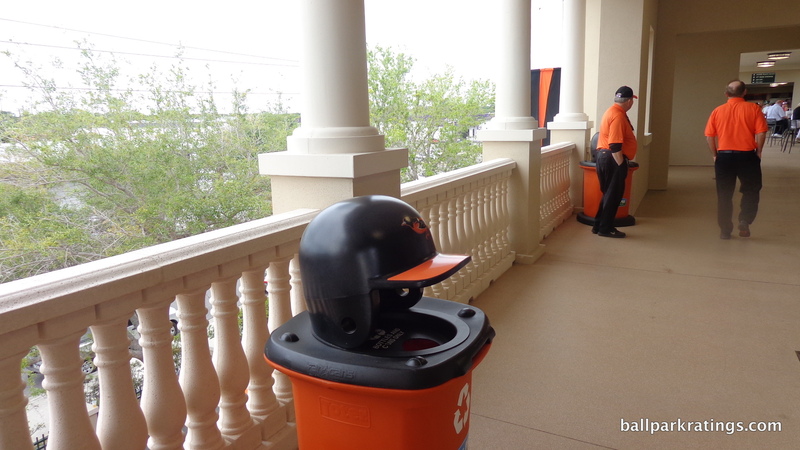 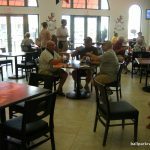 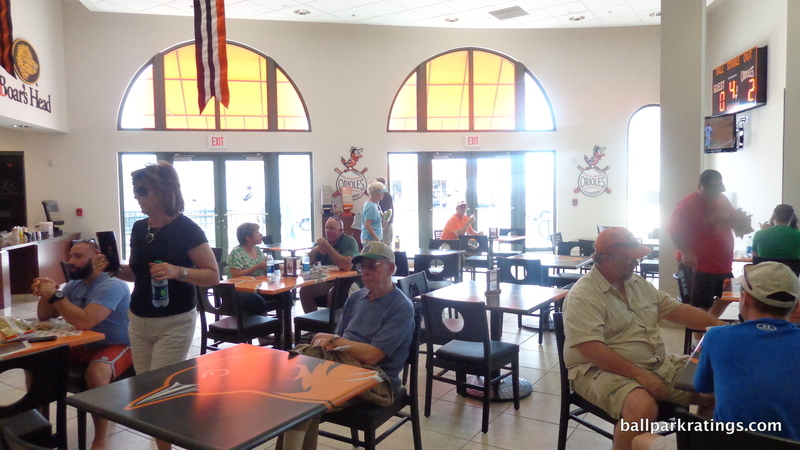 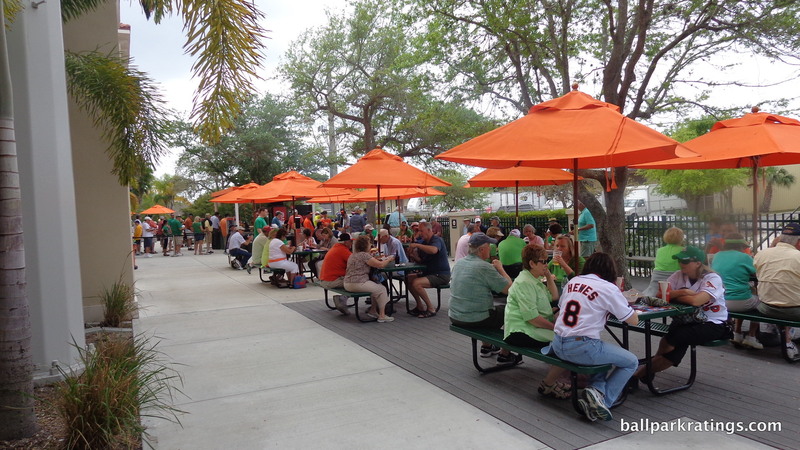 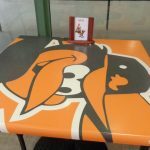 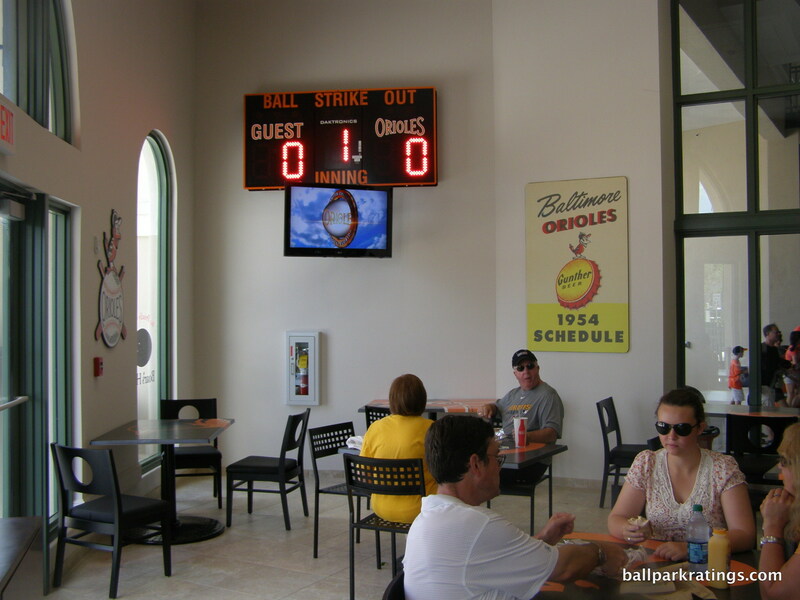 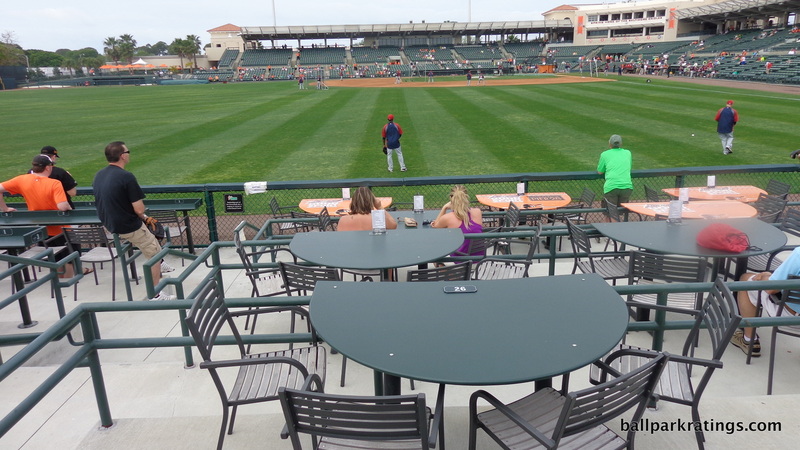 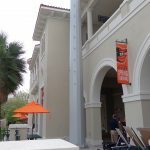 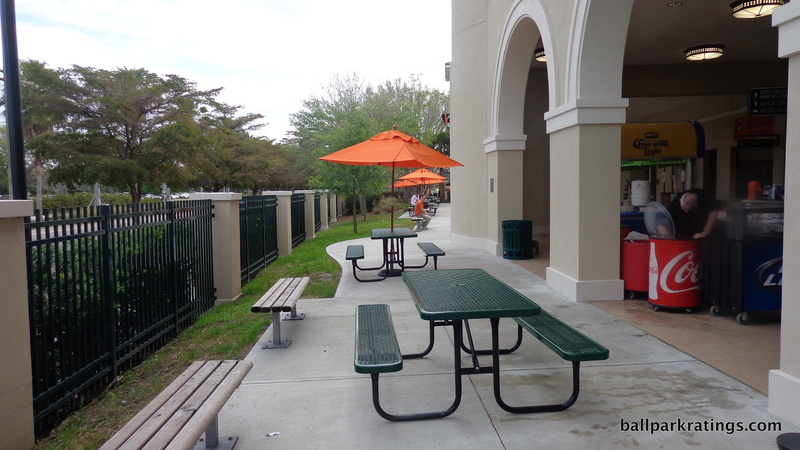 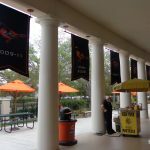 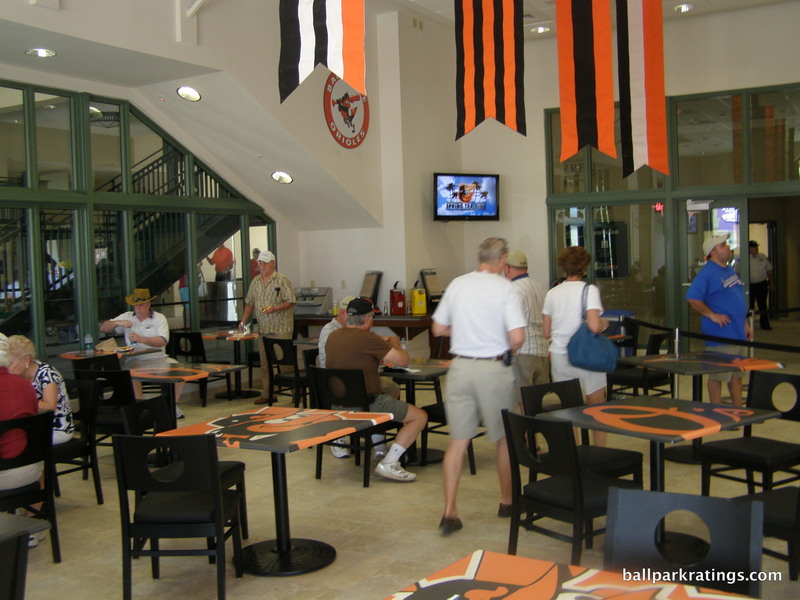 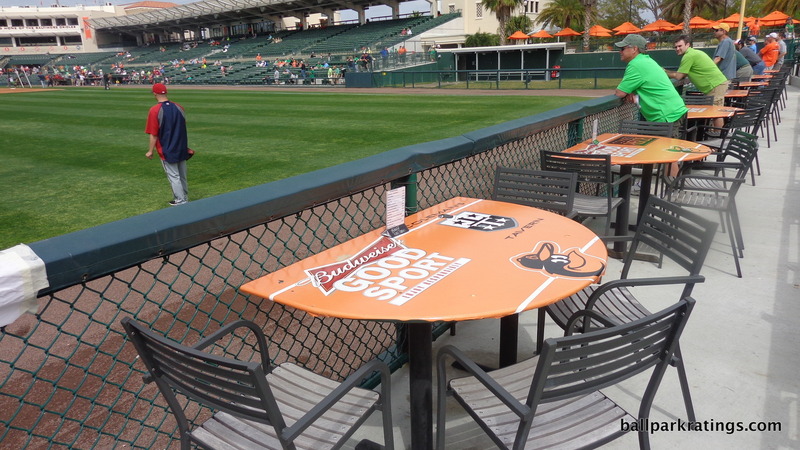 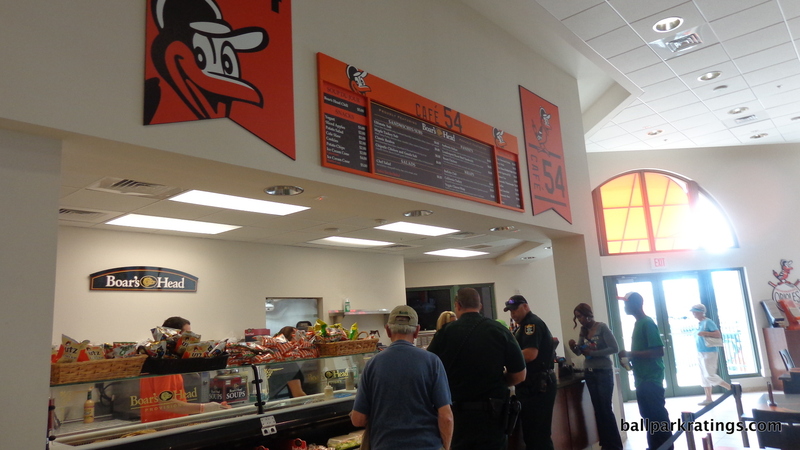 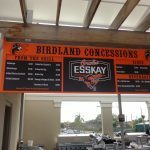 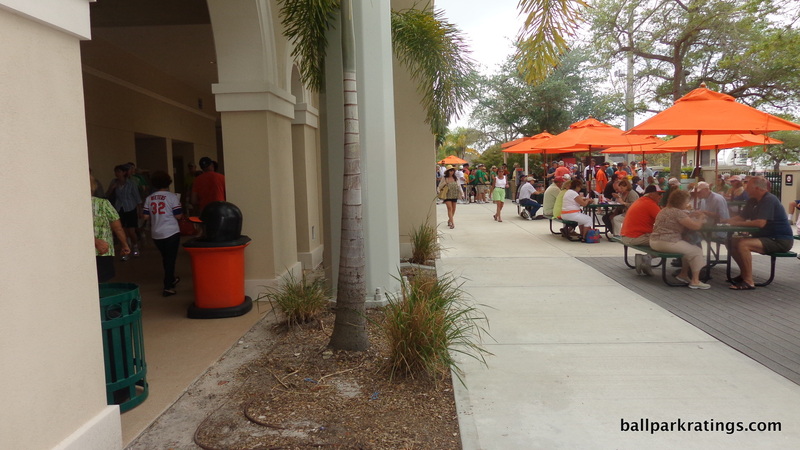 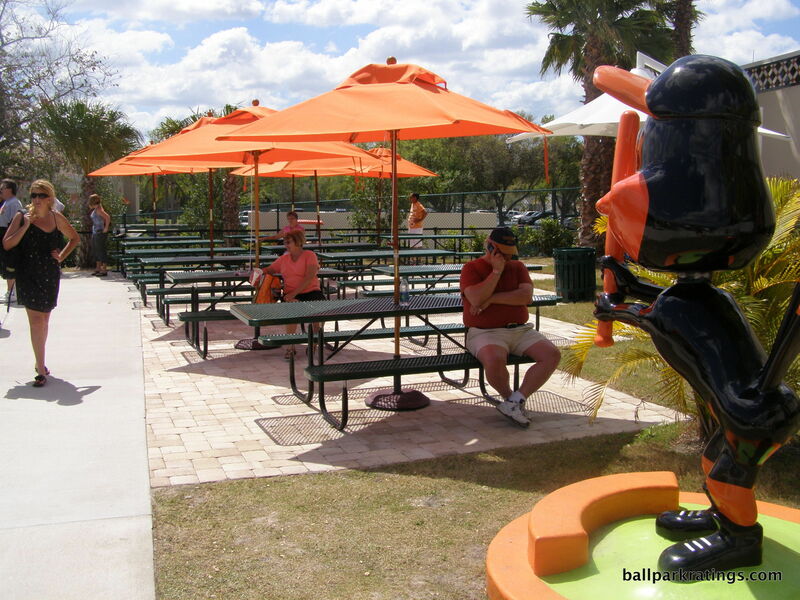 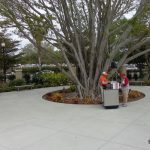 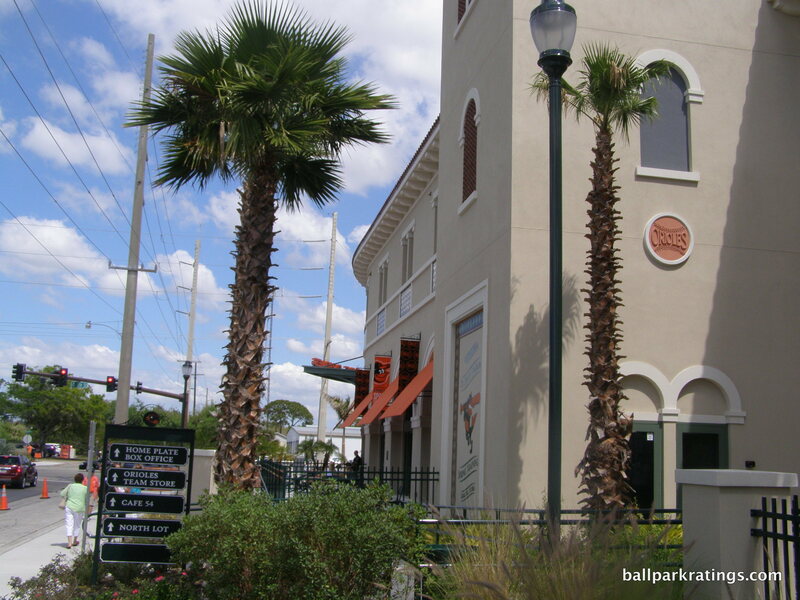 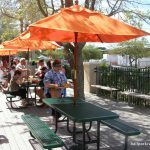 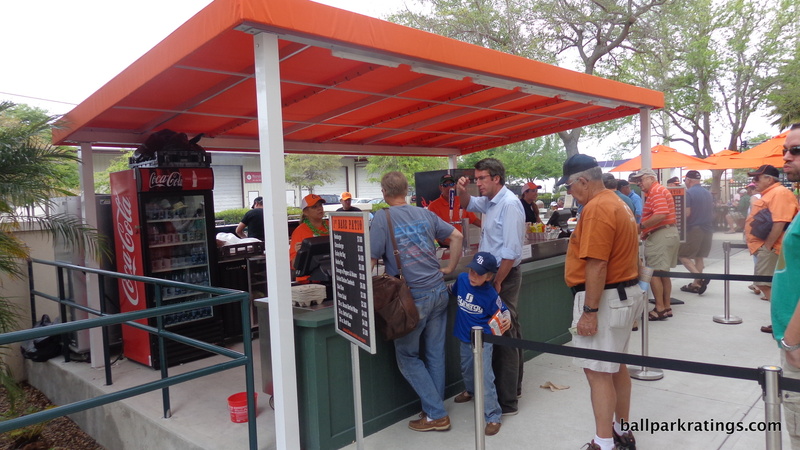 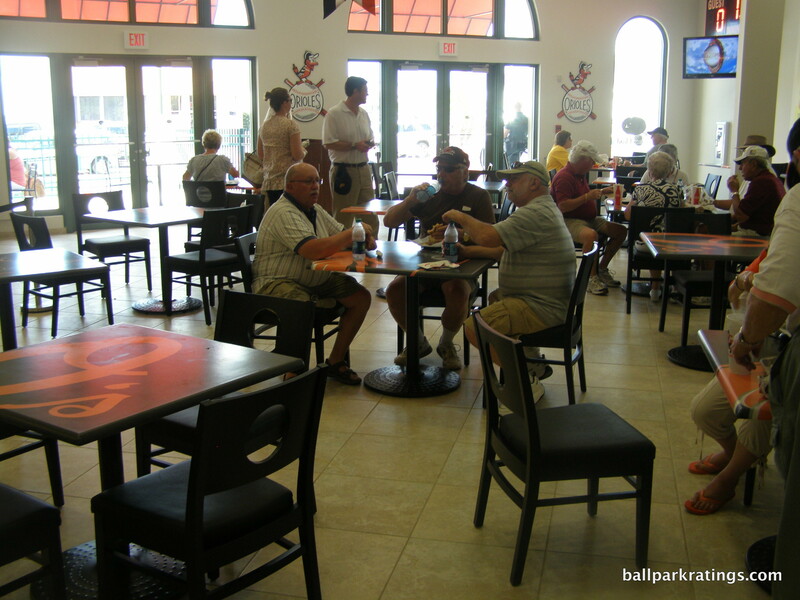 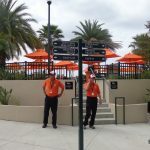 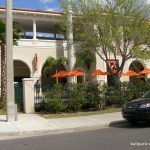 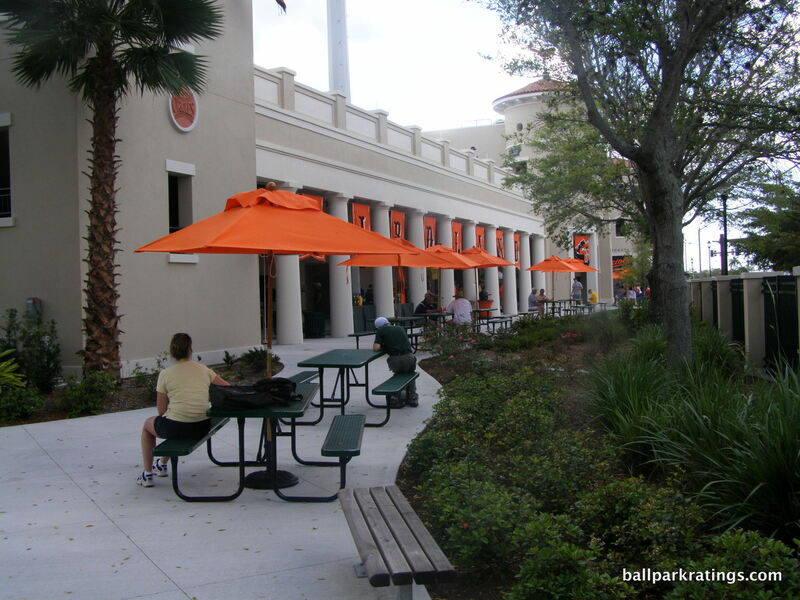 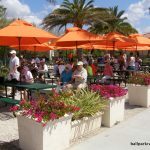 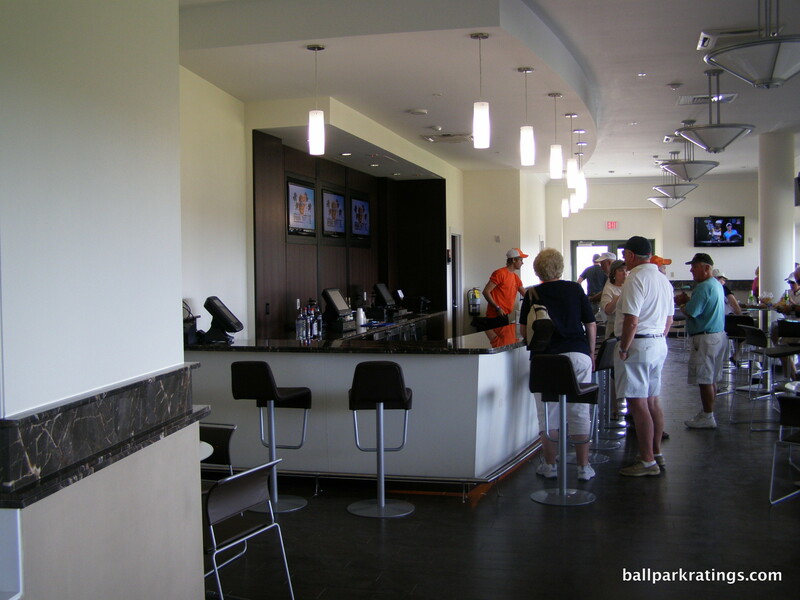 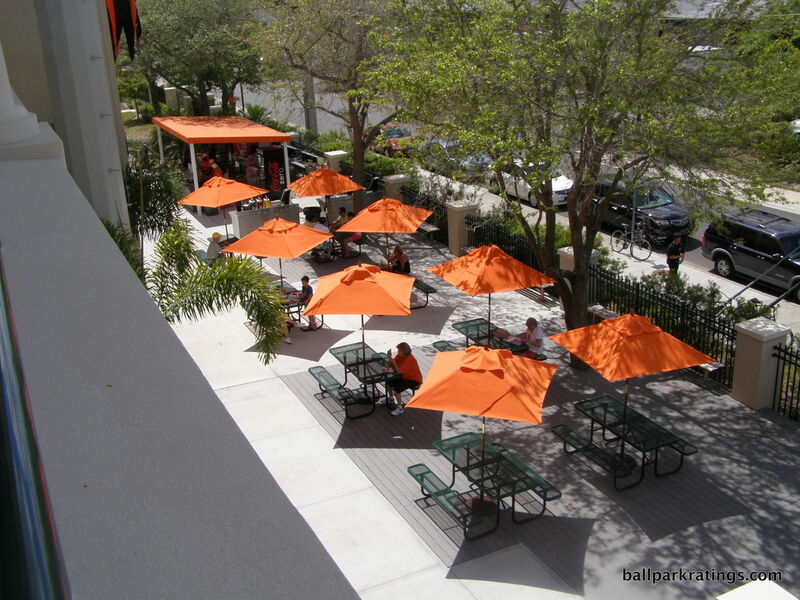 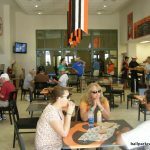 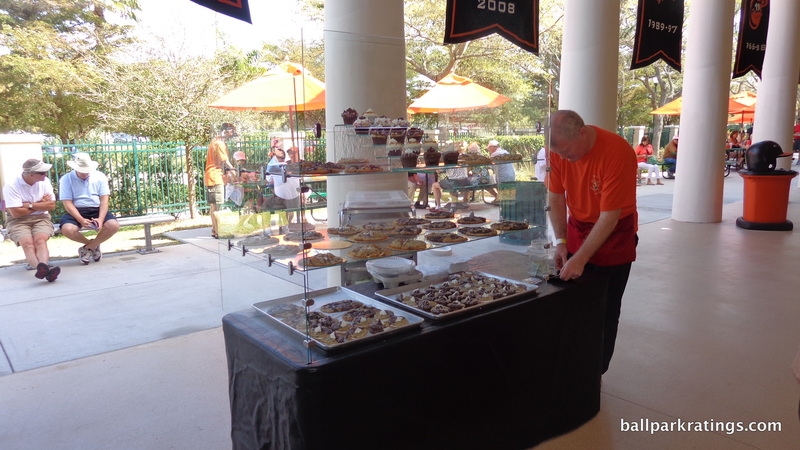 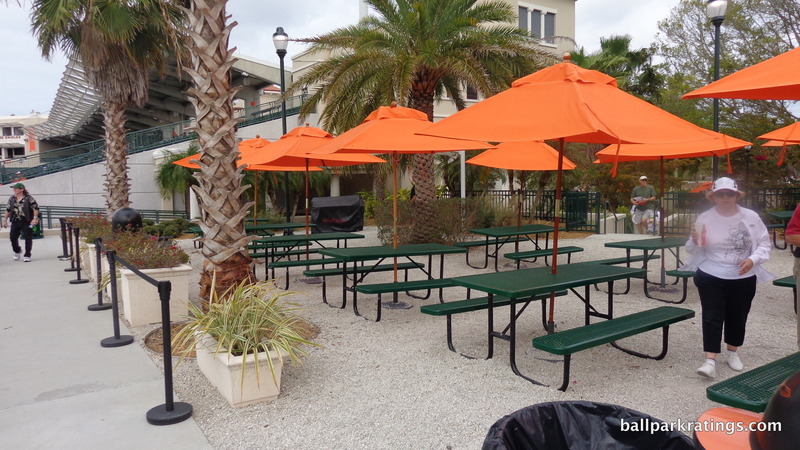 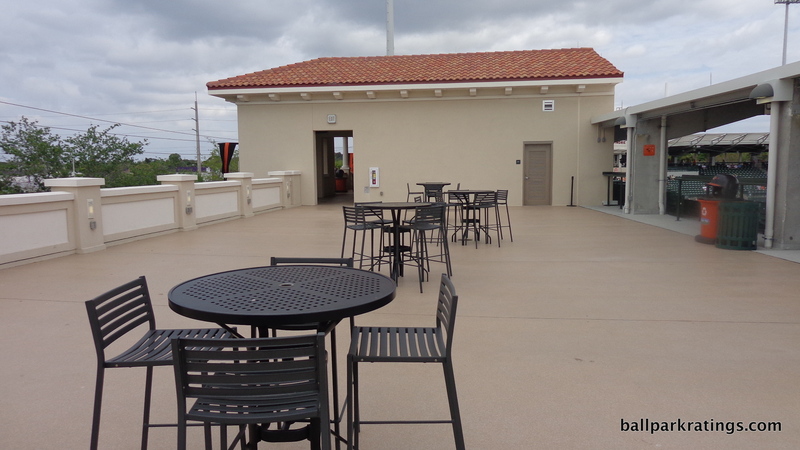 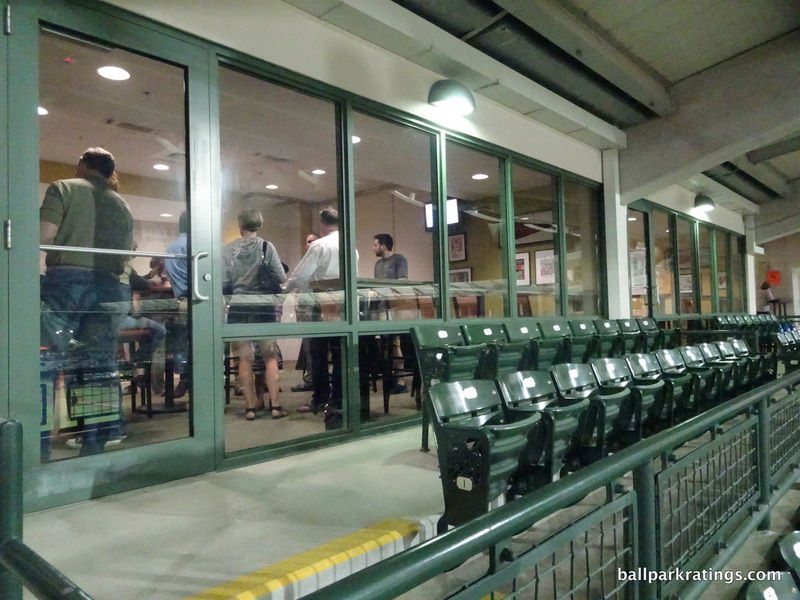 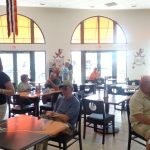 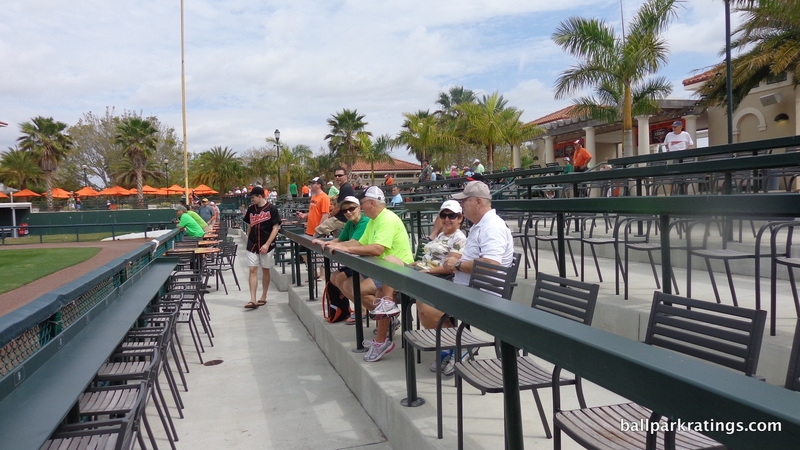 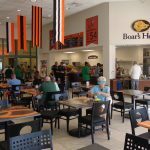 One of the few climate-controlled spaces accessible to all fans in spring training, the café serves Boar’s Head and has a series of Oriole themed bistro tables. 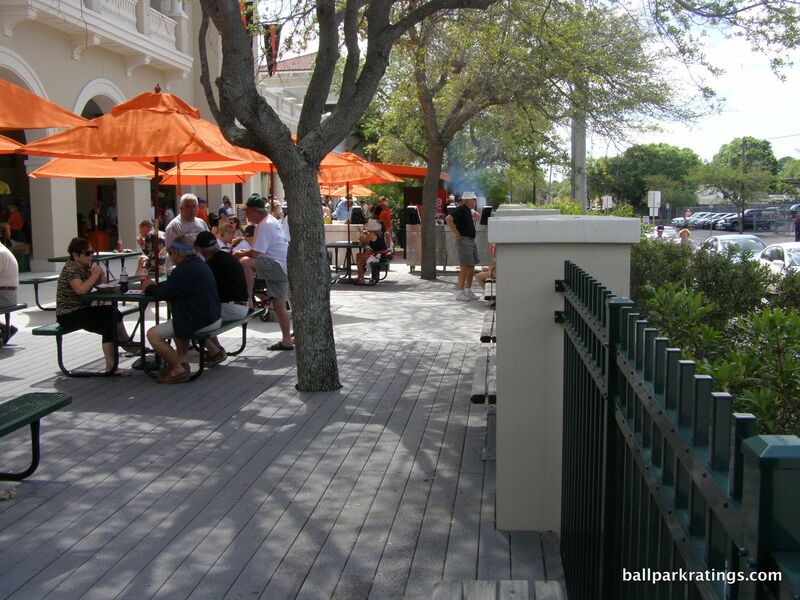 Be sure to check out the outdoor patio on the street side as well. 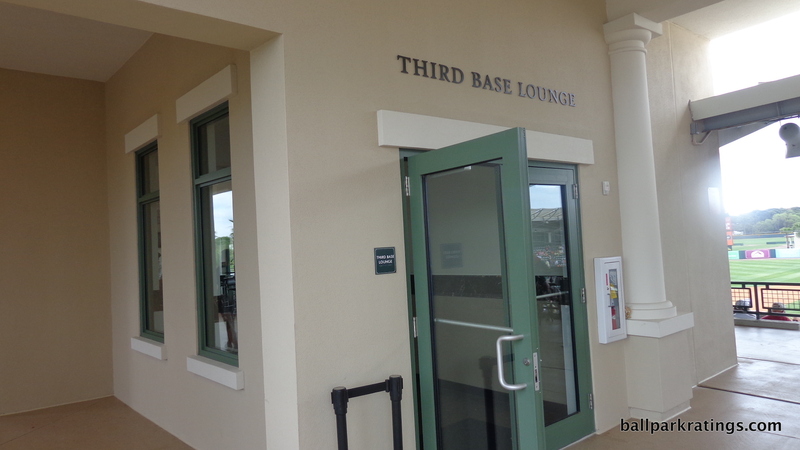 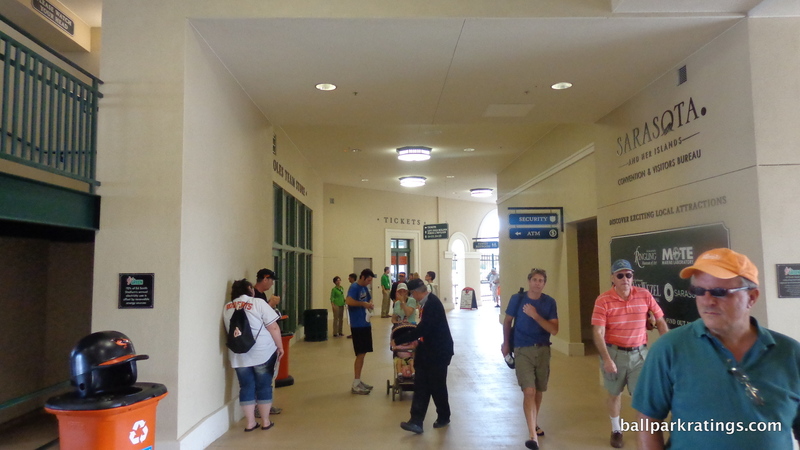 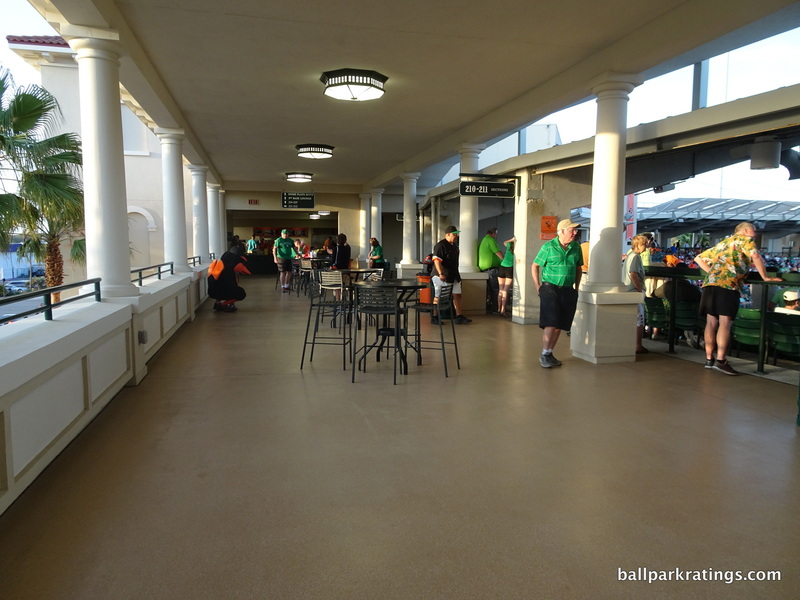 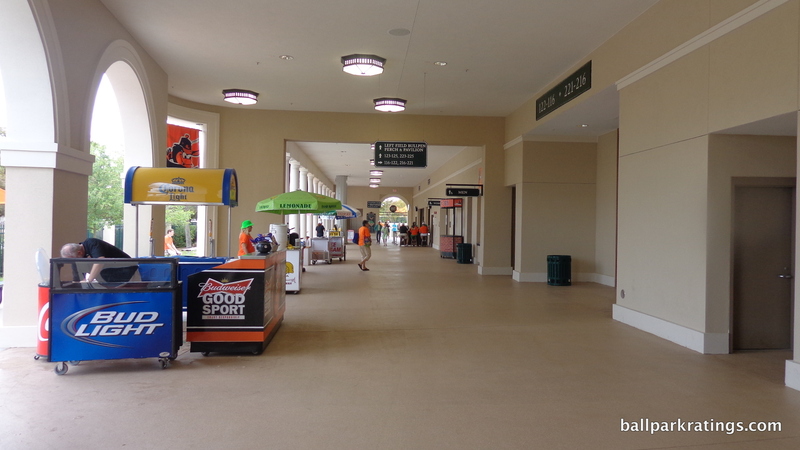 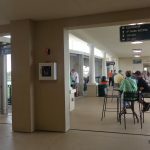 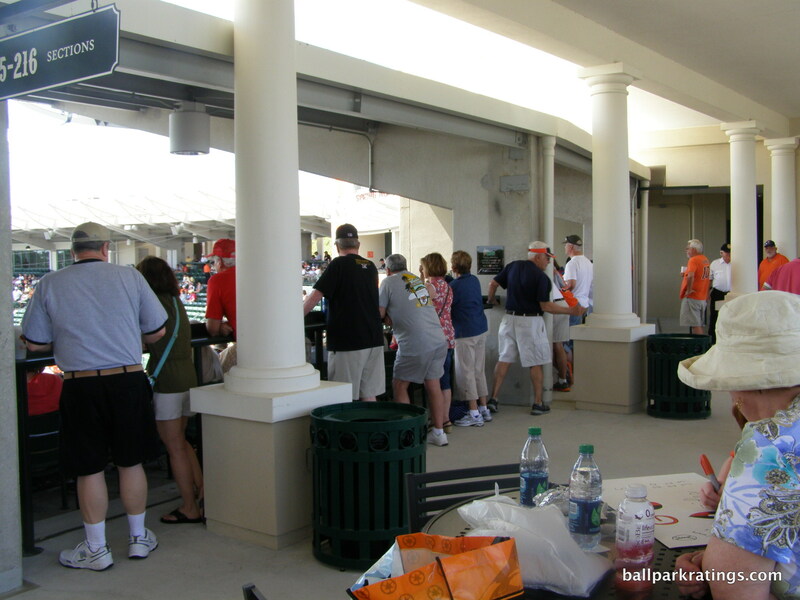 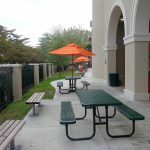 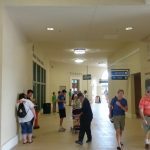 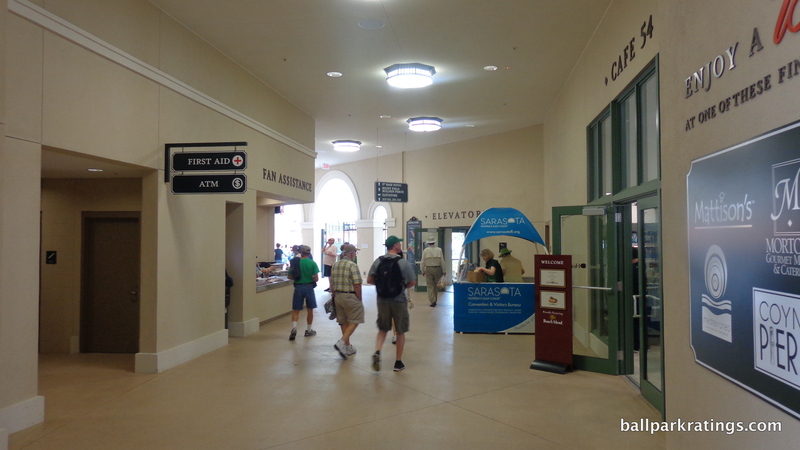 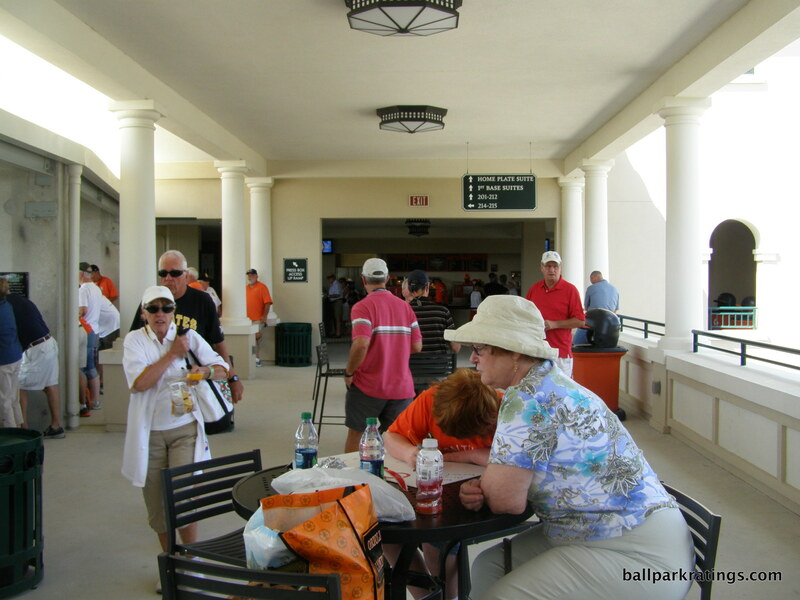 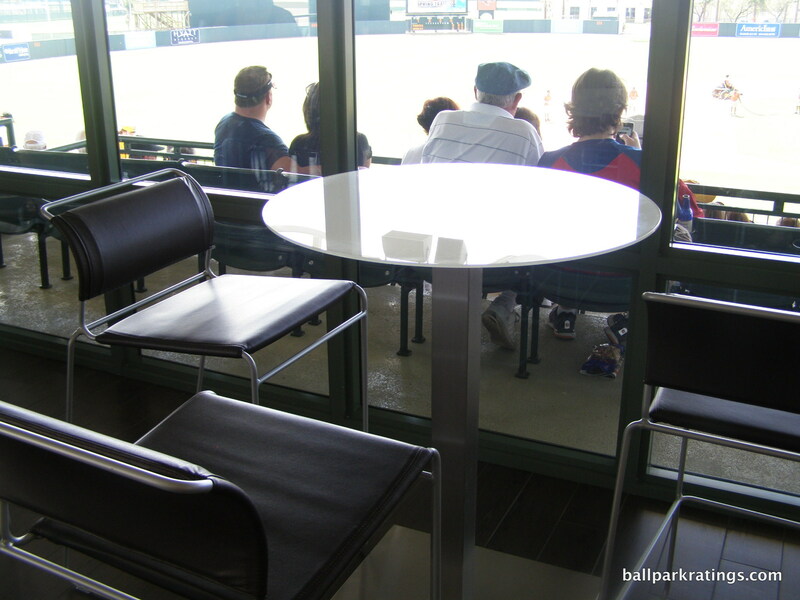 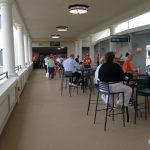 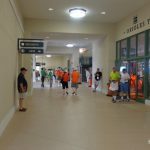 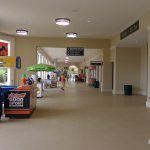 On the first base side of the main concourse, a large outdoor picnic patio is a great place to hang out. 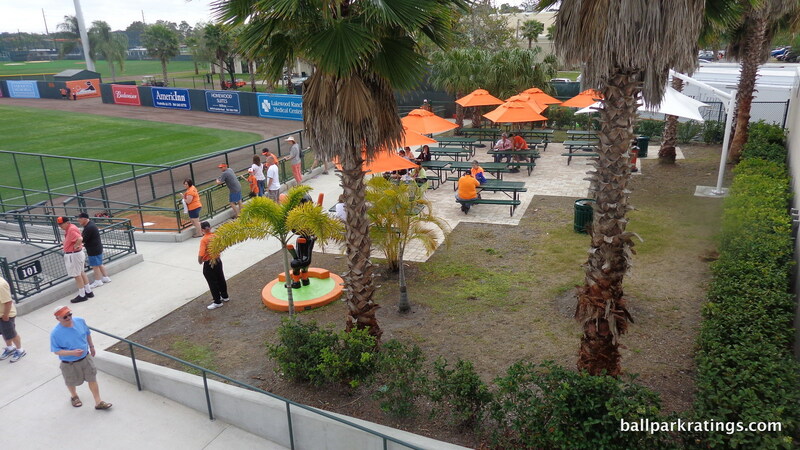 Beautifully landscaped bullpen picnic perches down the left and right field lines are another option. 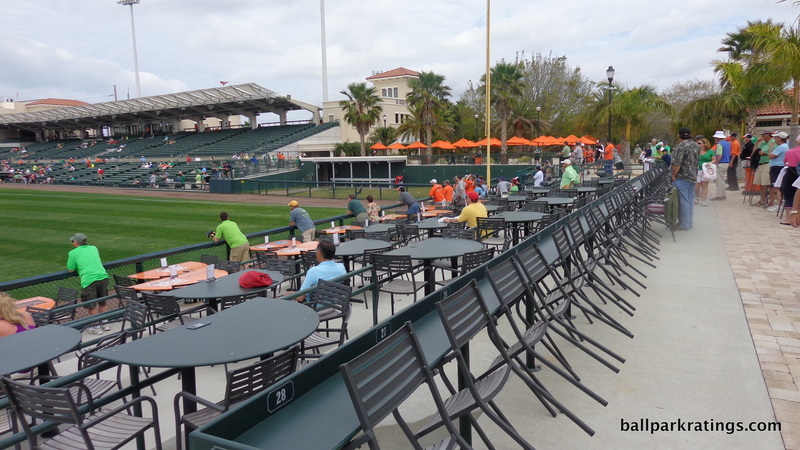 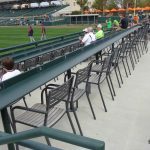 There are more bistro tables beyond left field. 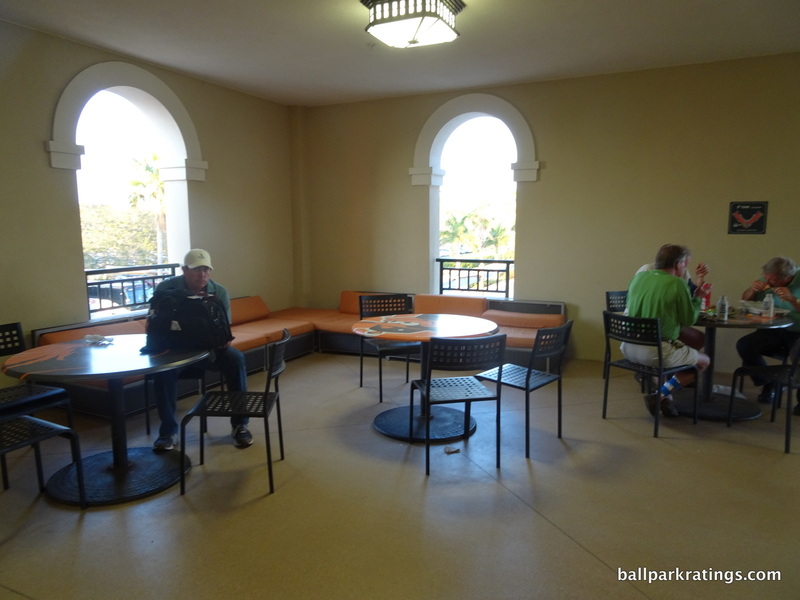 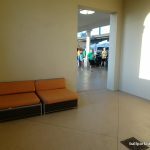 Finally, there are plenty of dining tables on the terrace concourse, along with plush lounge seating on this level behind home plate. 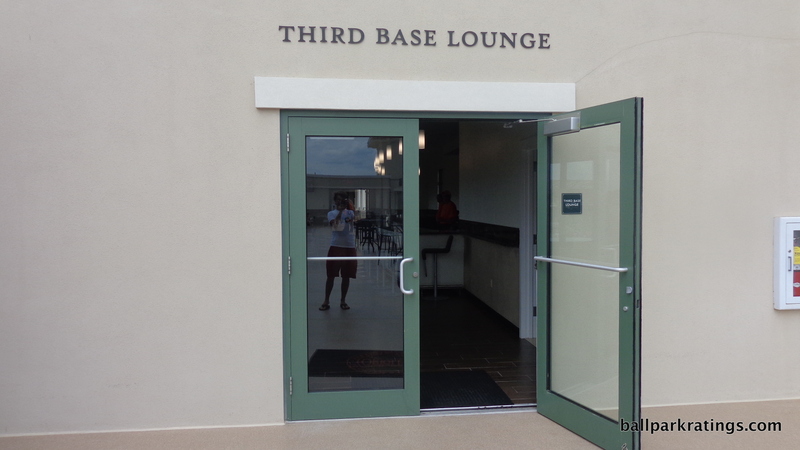 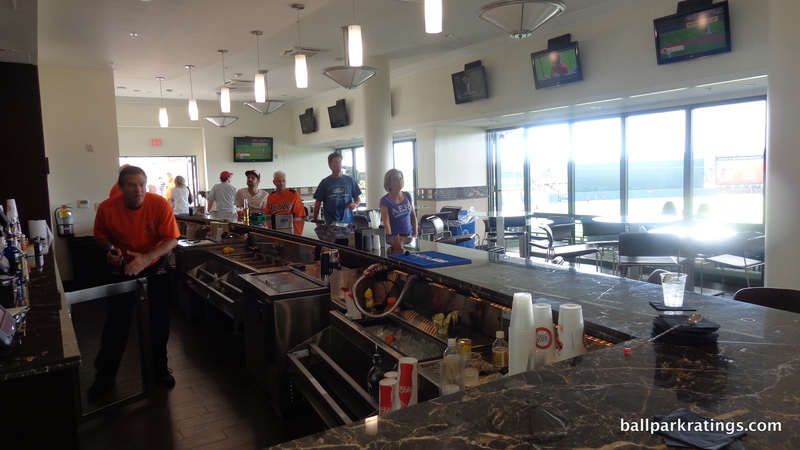 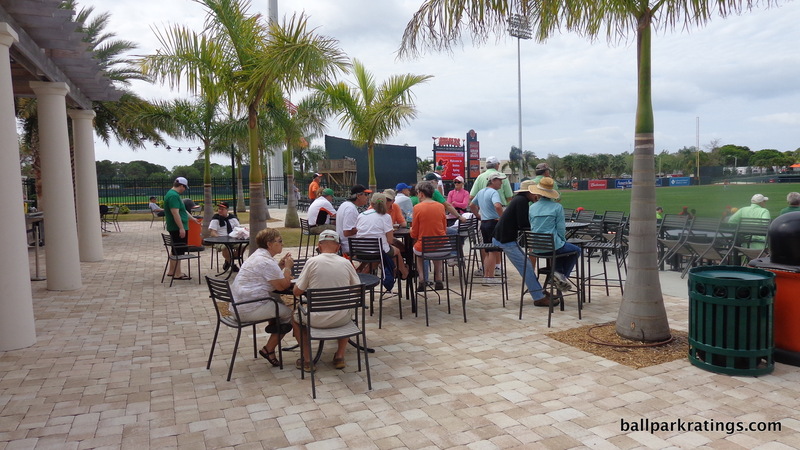 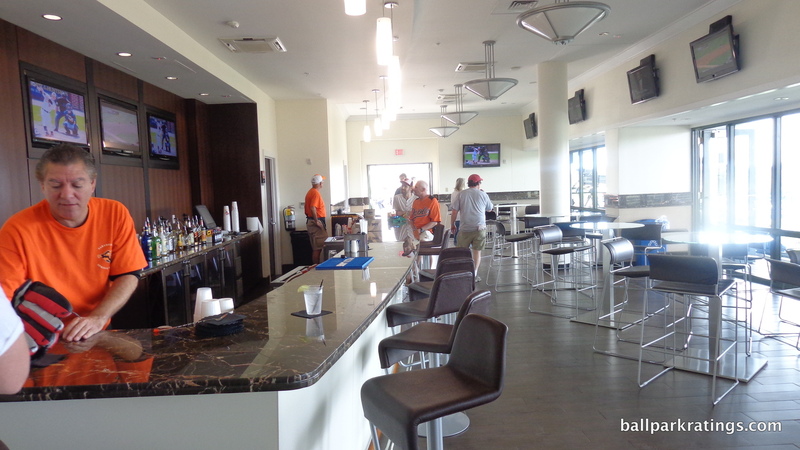 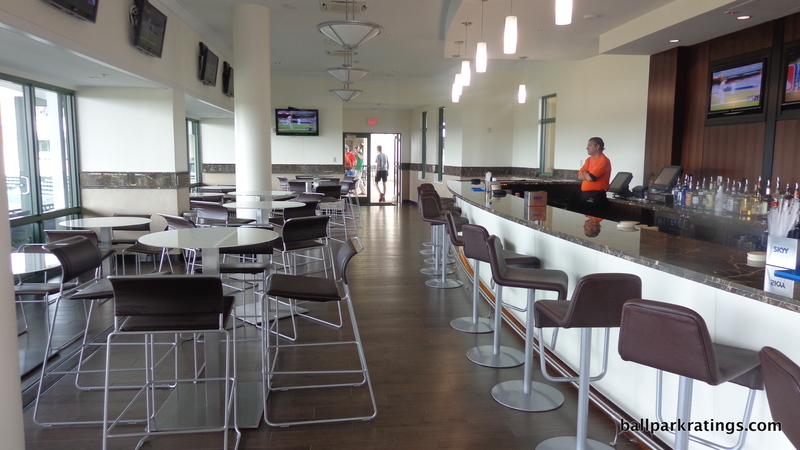 Beautiful Third Base Lounge at Ed Smith Stadium. 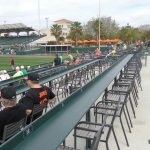 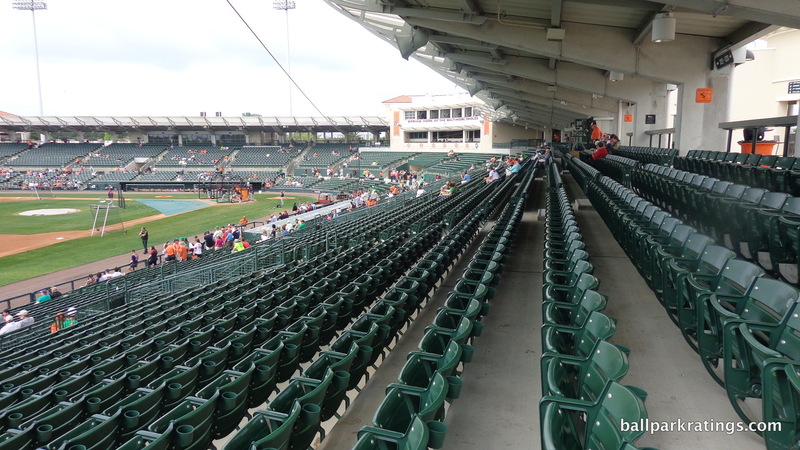 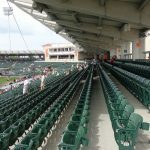 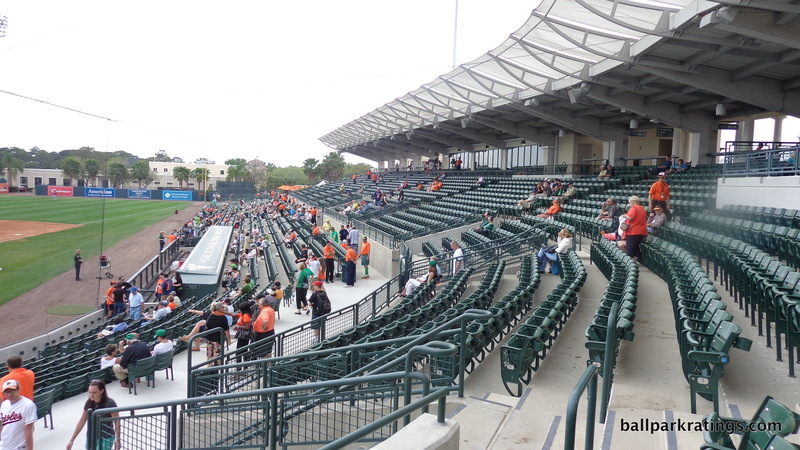 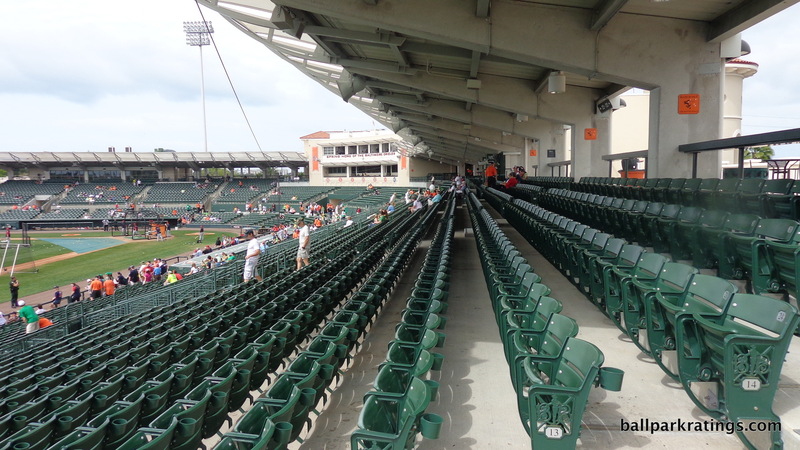 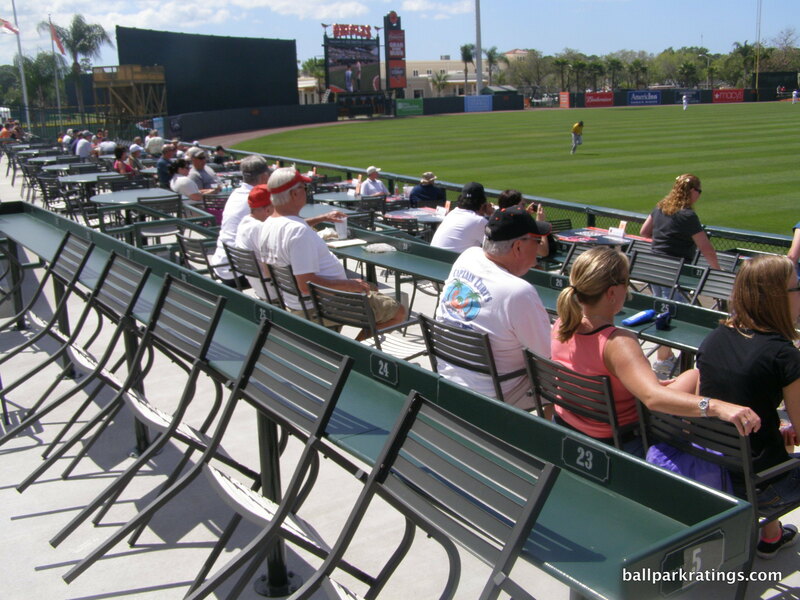 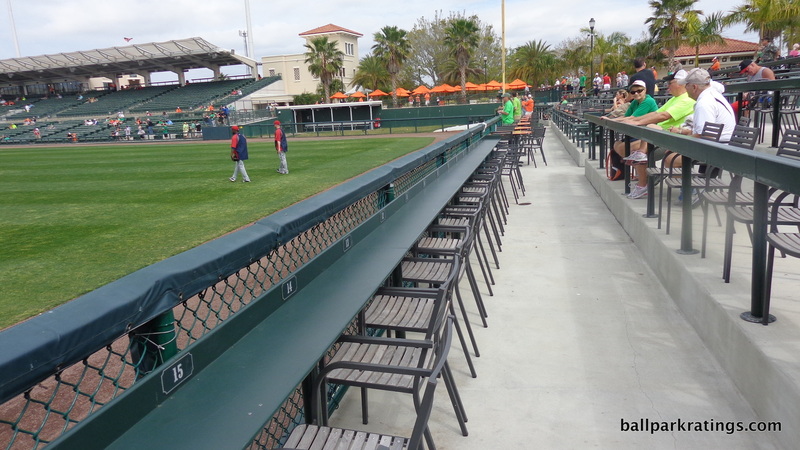 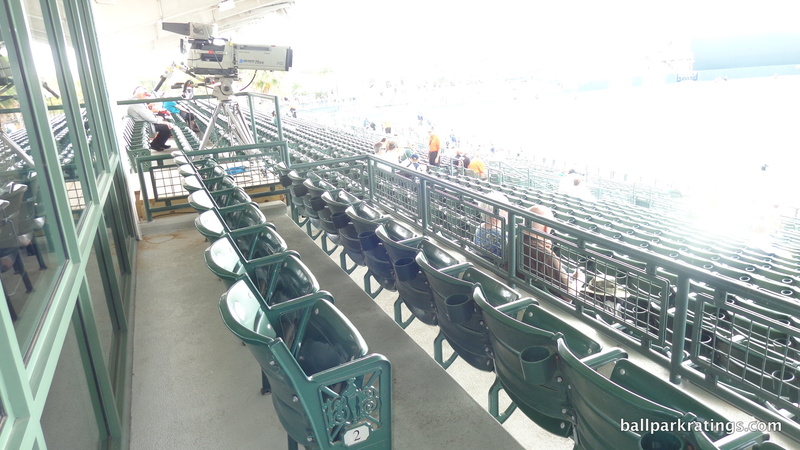 Ed Smith Stadium has above average group and premium seating options. 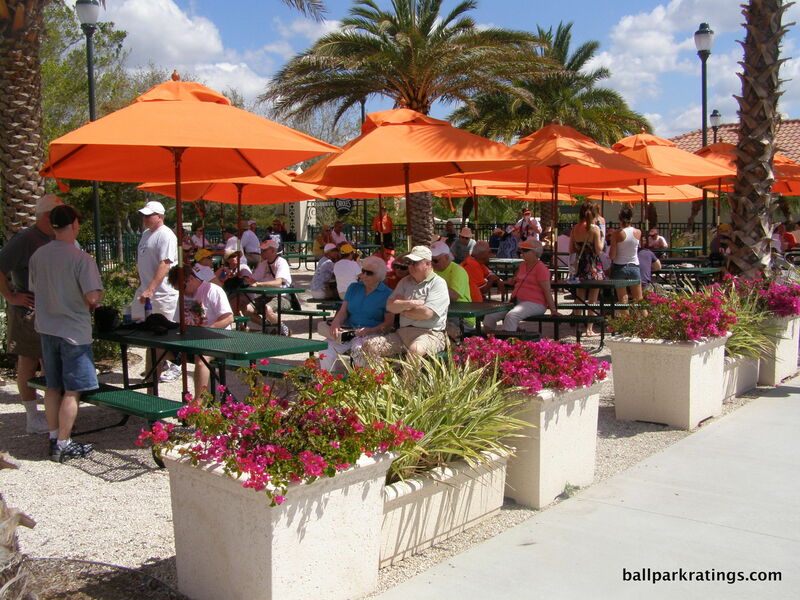 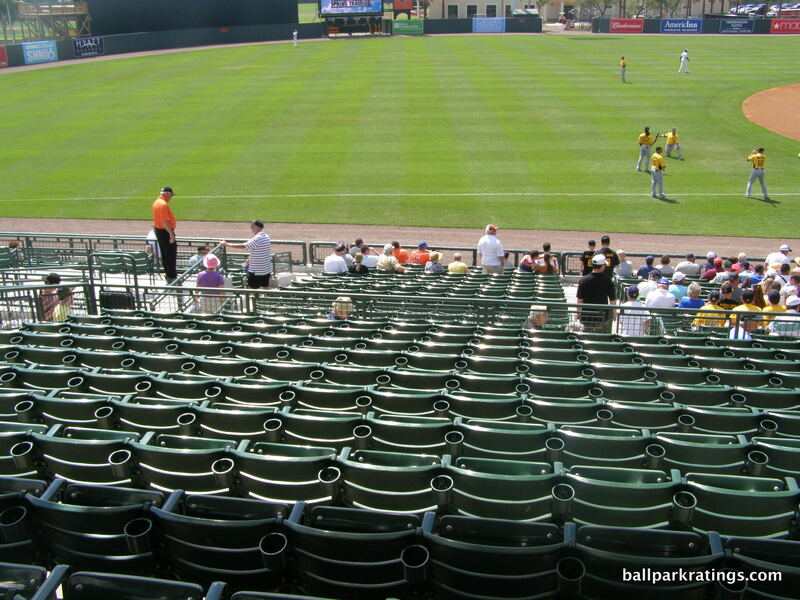 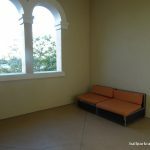 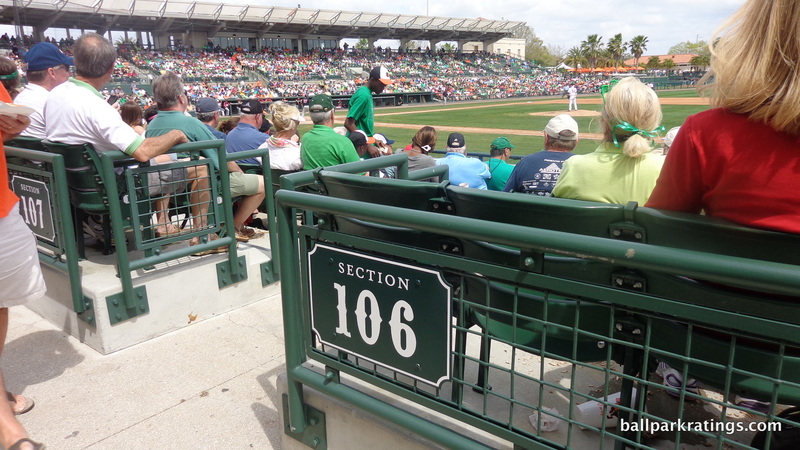 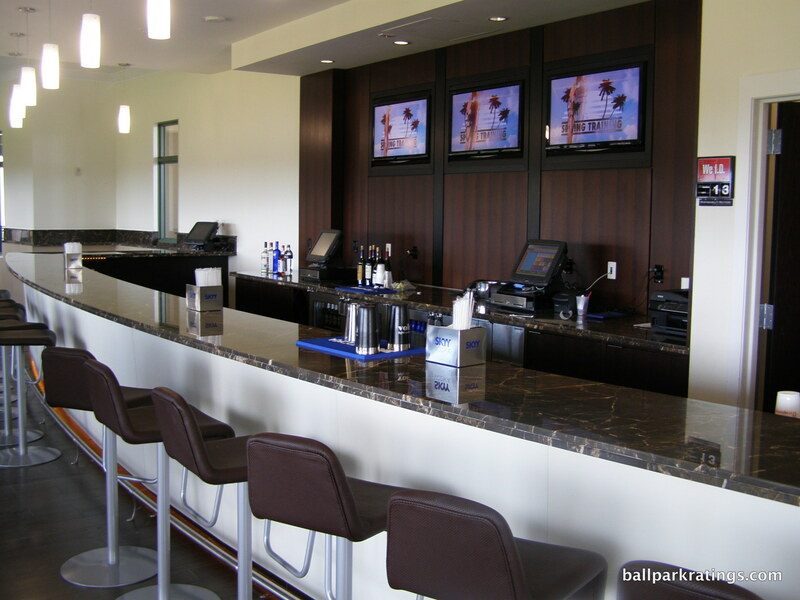 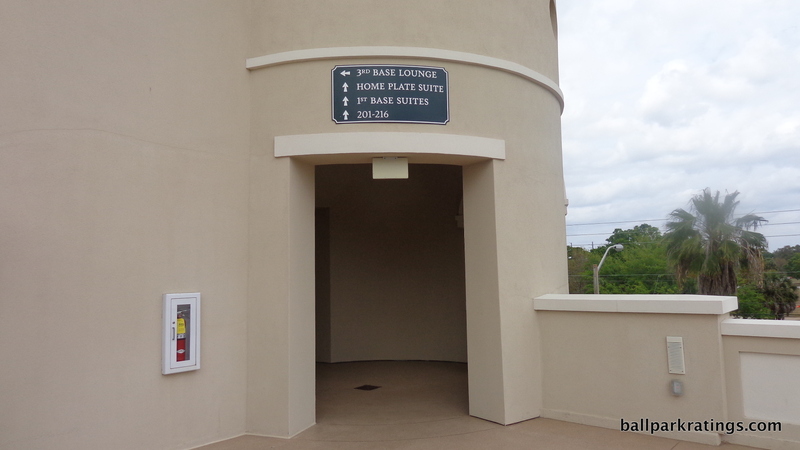 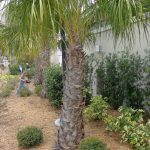 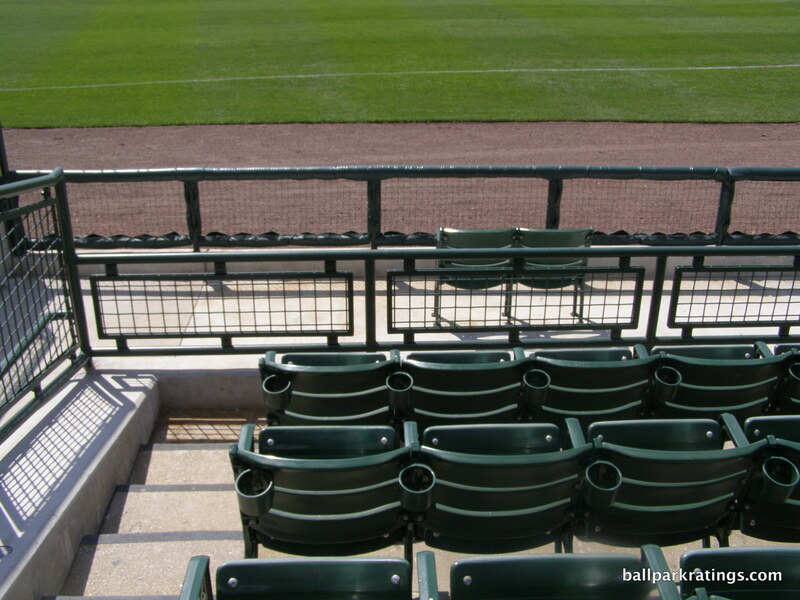 The variety of options isn’t great, but the fit and finish of the spaces is exemplary for spring training. 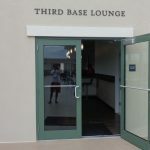 Adorned with African Wenge wood flooring and Italian marble, the Third Base Lounge is the most notable option on the mezzanine. 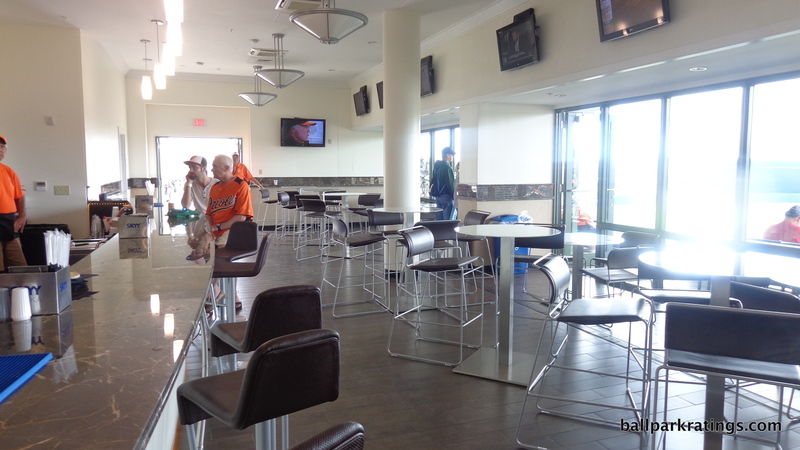 Upscale tables and a fully stocked bar fill out this space, and it is open to all fans when not being used for groups. 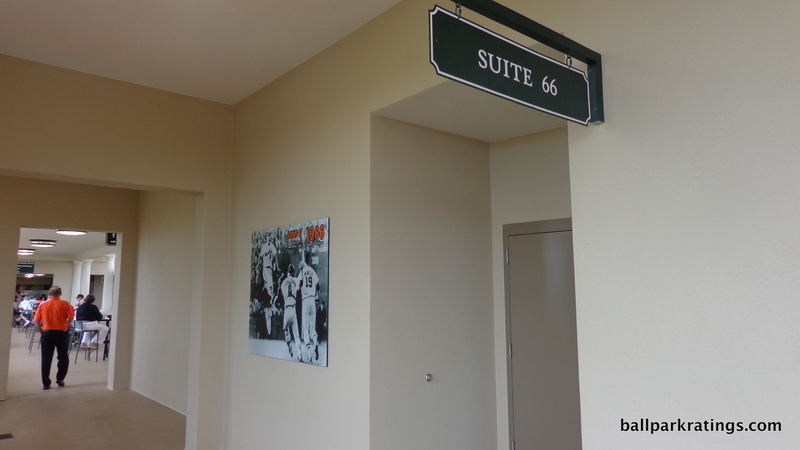 The sumptuous Home Plate Suite hidden in the press box is Ed Smith Stadium’s most high-end option. 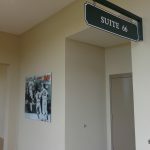 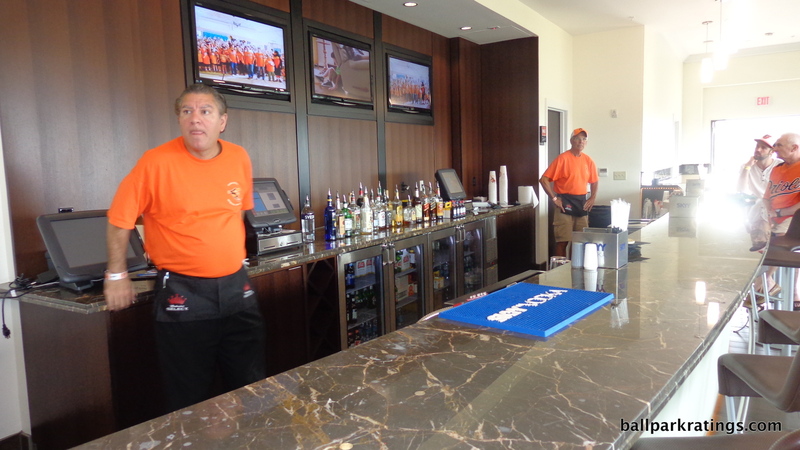 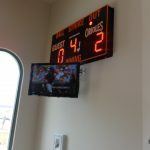 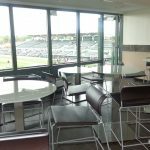 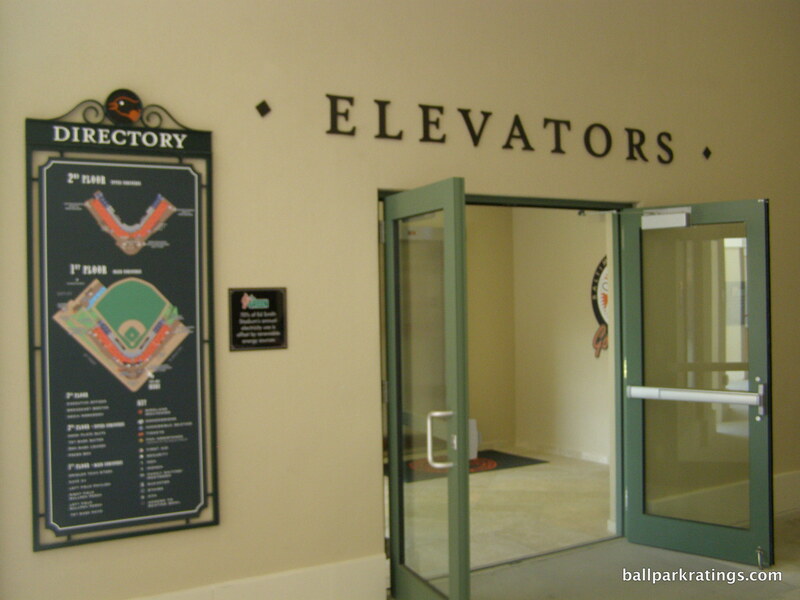 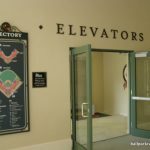 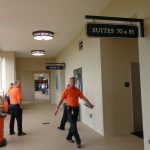 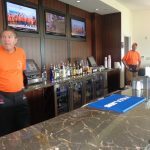 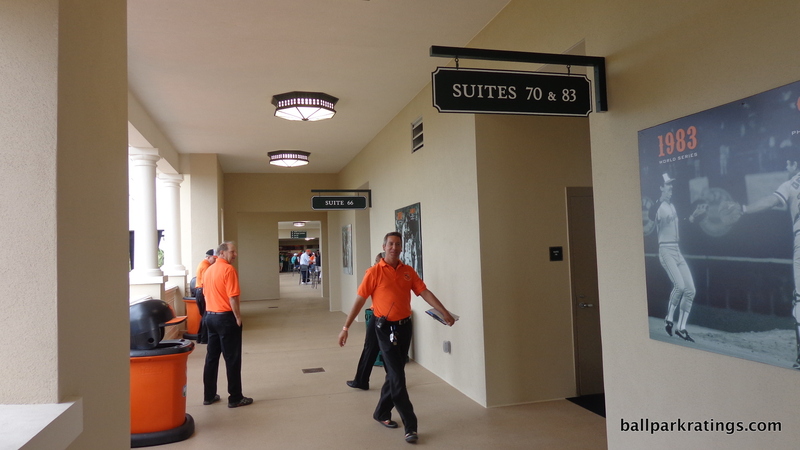 Decorated with American Cherry and Silver Sea granite, three luxury suites named after Oriole World Series years hover above first base on the terrace. 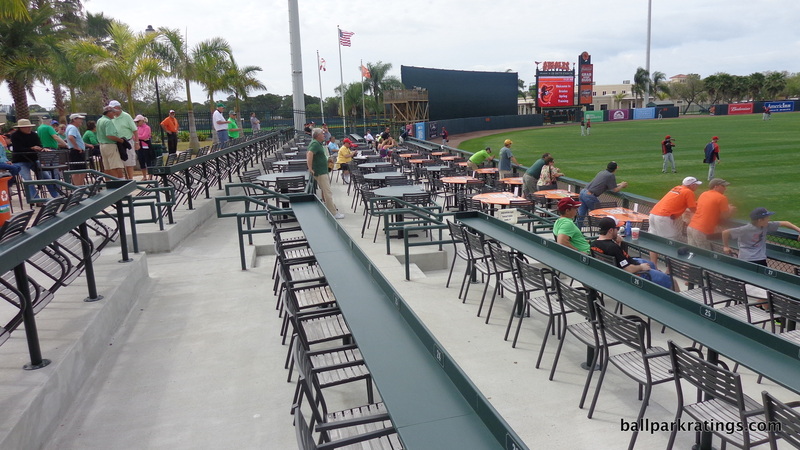 Finally, ticketed drink rail seating and semicircular tabled seating are located beyond the left field pavilion. 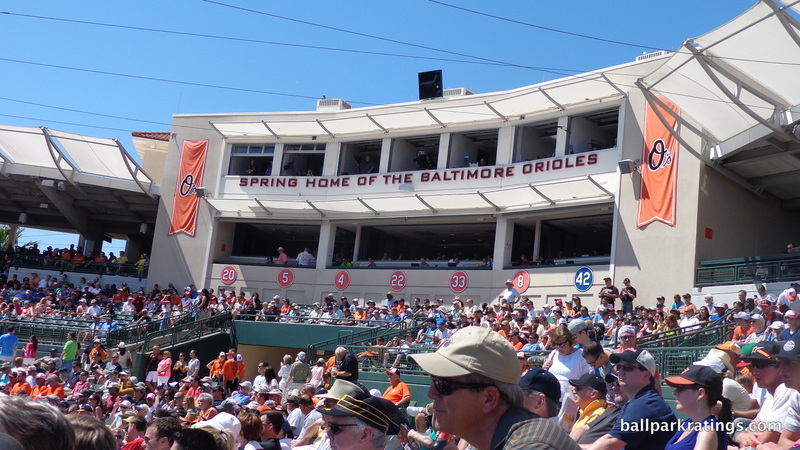 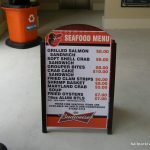 Once again, the Baltimore Orioles have gotten baseball’s attention by building a spectacular venue. 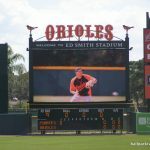 Compared to other renovations in the past 10 years, Ed Smith Stadium was by far the most ambitious, but it wasn’t a sure thing, as the Orioles just made the absolute most out of what they were given. 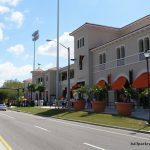 Located in one of Florida’s premier cities, Ed Smith Stadium is characterized by a high degree of intimacy, locally inspired classic architecture, memorable artistic design flares, numerous Oriole historical references, and a bevy of fan-friendly amenities. 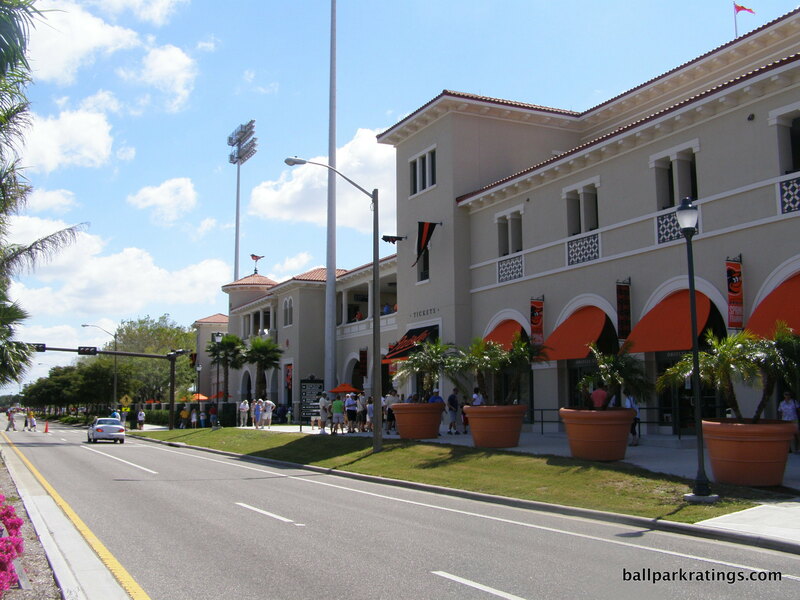 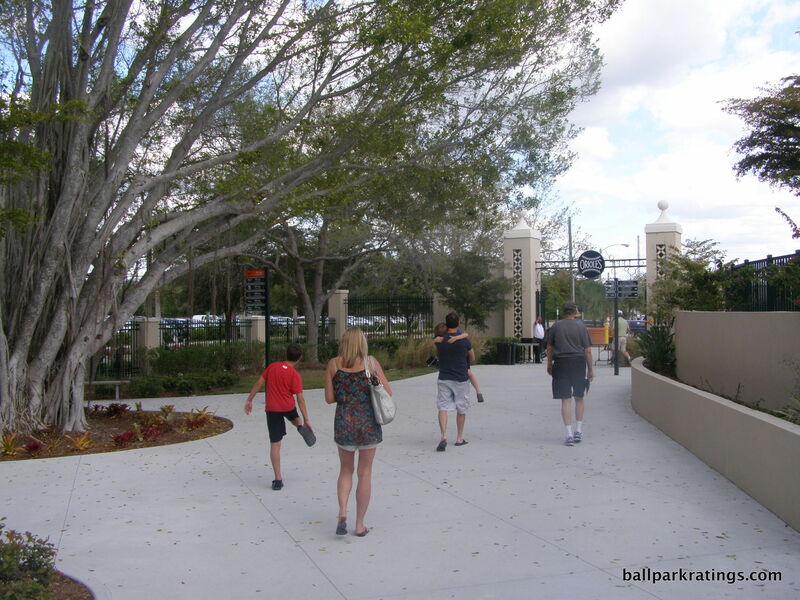 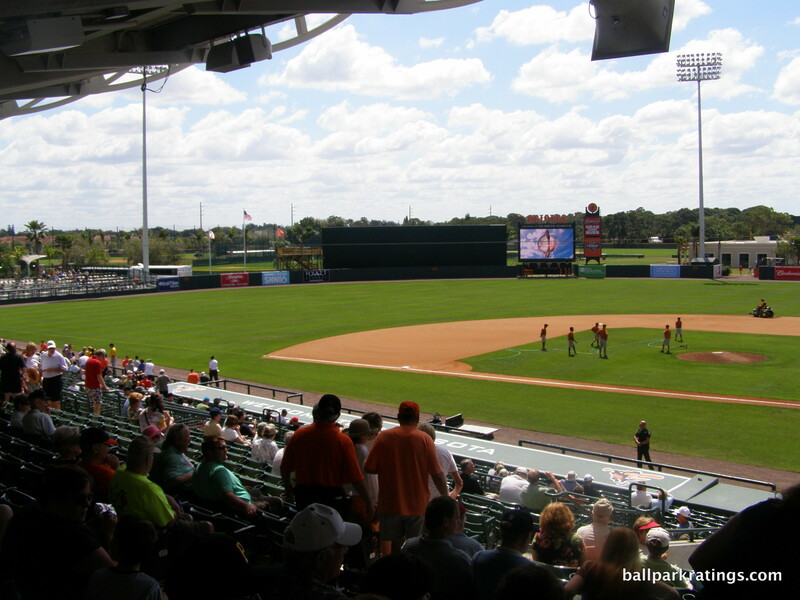 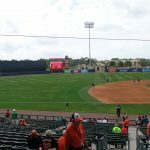 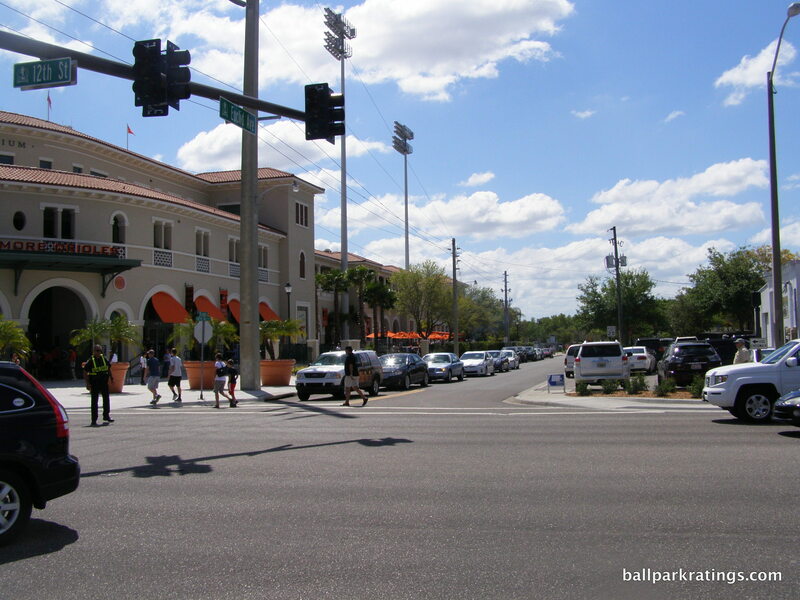 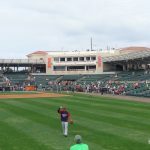 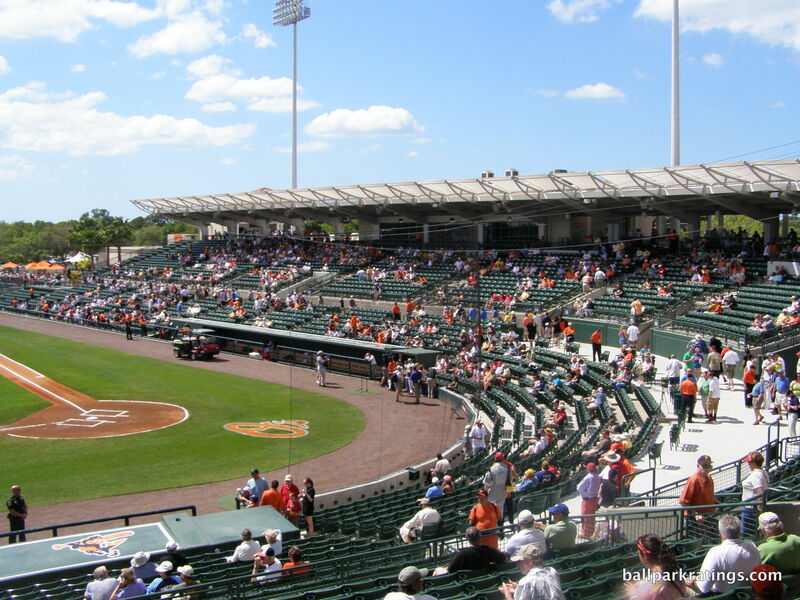 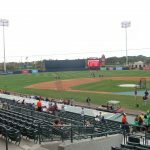 Perhaps a minor renovation in the 2020s can make Ed Smith Stadium a 360-degree experience, which would cement it as Florida’s top spring training park.